Your super organized friend had their Christmas cards addressed and stamped the weekend after Thanksgiving, huh? Well, I’m pretty organized but that was certainly not me this year. I usually like to take the boy’s Christmas pictures in October, which gives me plenty of time to choose the cards and have them mailed to me, but this year it was the first week of November and no pictures had been taken. So I went to a local pumpkin patch and the day that they were hauling away the pumpkins, I had the boys stand in front of an old tractor and snapped away. I was careful to avoid the orange landscape a foot away! The boys kept telling me through their smiles “let’s get out of here, mom!” So I got my shots AND embarrassed the boys – double fun! 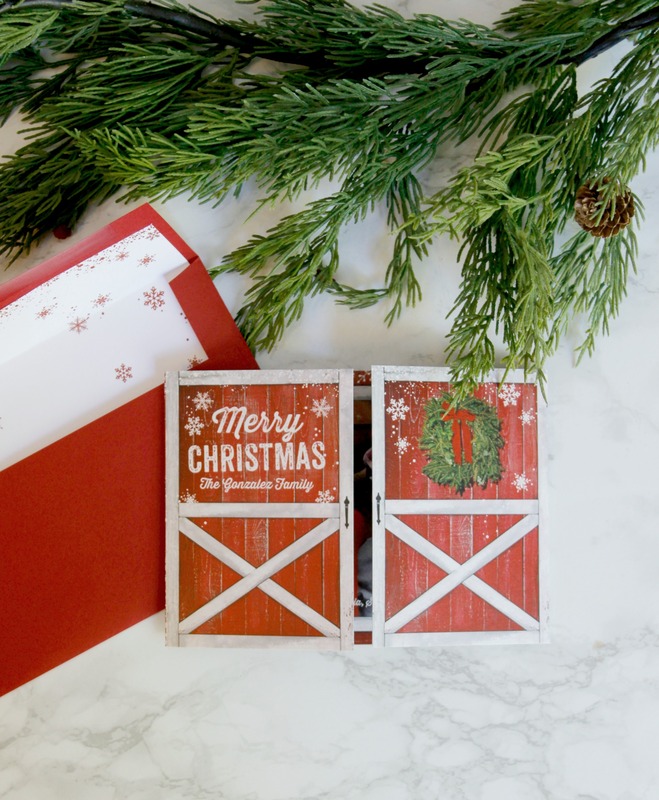 I decided to order my cards from Tiny Prints, like I did last year and the year before that and so on… I have never had a problem with that company and every year they have even cuter cards! What do you think of this barnyard-style card? Perfect for the tractor picture, right? But what if you didn’t make it to the pumpkin patch and turkey day went by and still no holiday photo? Well, you can always choose a design that does not involve a photo, or you can choose to send out a Happy New Years cards, instead. Of course you don’t have to send out cards at all but I absolutely love sending and receiving cards during this season. I am happy to say that this year I have received more cards than ever before! 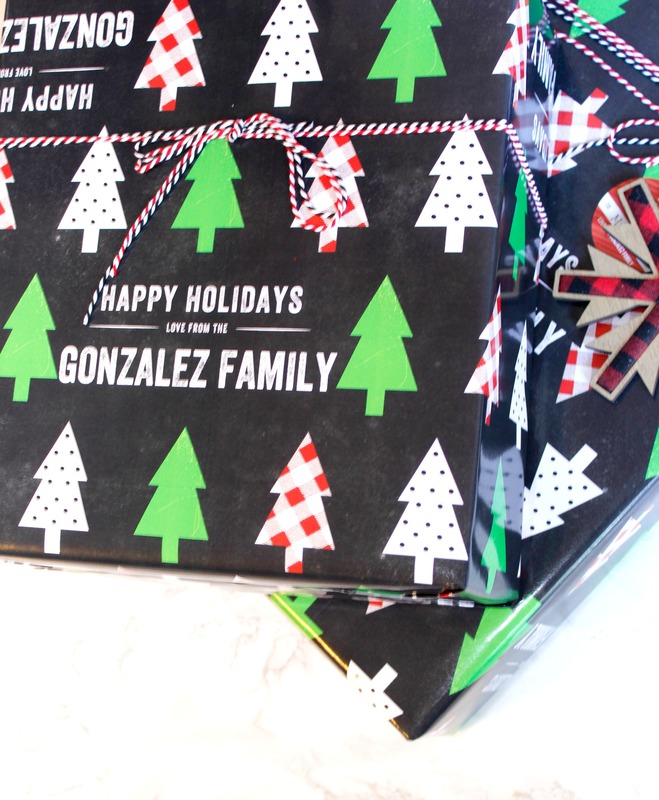 Totally unrelated to cards but totally related to saving time, check out this wrapping paper that is already personalized with your family name! So stinkin’ cute! I also picked it up at Tiny Prints. I only ordered one roll because I wanted to check out the quality and because I like to use all kinds of prints for Christmas, but it was a winner! Lastly, I ordered a few notebooks for the boy’s teachers, which I will pair with a nice box of chocolates. 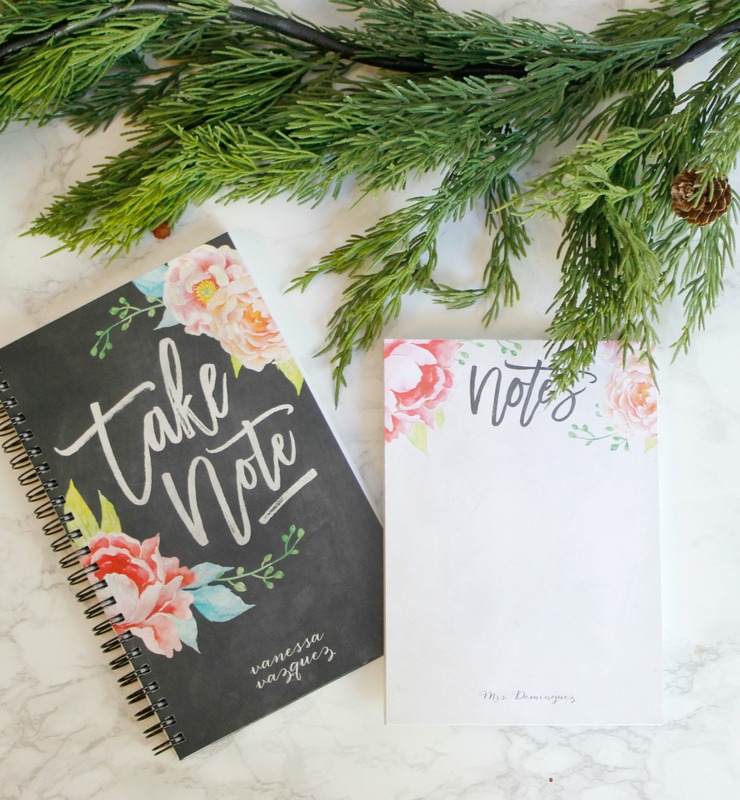 There is something so special about personalized items. Whether you send out cards or not, have no fear and have no guilt. I just wanted to send you a little reminder that it’s not too late if you choose to do it and you can send out New Years wishes, instead. I wish you all a very Merry Christmas and don’t forget to enjoy your family. Christmas goes by so fast that you have to be intentional about being “present”. 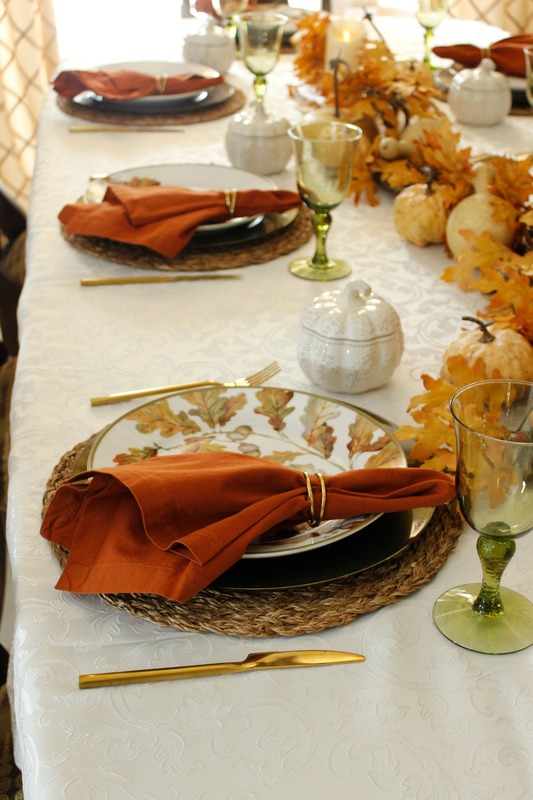 So you’ve committed yourself to hosting Thanksgiving dinner. How cool, how scary! Am I right?! I mean, this is the dinner party of dinner parties. How can you possibly pull off this monumental dinner with so many dishes, for so many people? Ok, so if you weren’t scared before, I’m sure the opening lines of this post did it for ya! No worries. You will be fine. In many ways, it is just like other dinner party you have hosted, with a few more moving pieces. 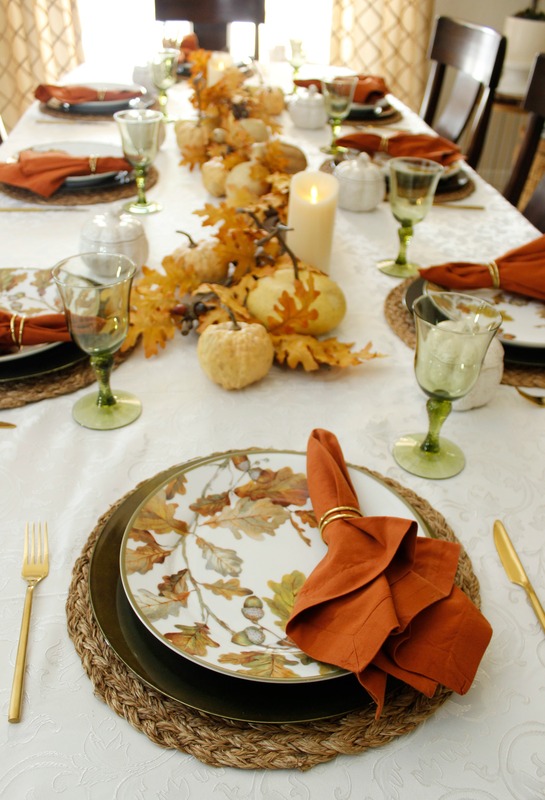 There are lots of tips that I have shared with you, to help you have a successful Thanksgiving, but these are specific to those who are hosting for the first time. 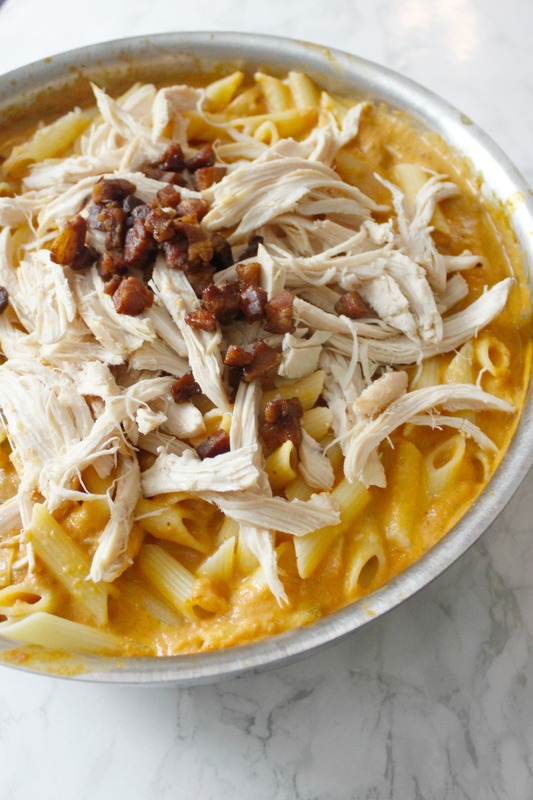 Decide on whether it will be potluck style or you will make everything. I prefer to serve everything out of my kitchen because through careful planning and time management, it causes me less stress than waiting for my guests to bring side dishes and wondering if they made enough. Also, one of the things that can cause a traffic jam in the kitchen, is someone bringing something cold or that needs re-heating. Oven space is premium real estate on Thanksgiving day and having to constantly place and remove things from the oven can cause you more stress than what you originally saved by not making the dish yourself. Should you choose to do it potluck style, you can avoid that madness by politely asking guests to bring things already hot or in an insulated bag. Also, who you decide to assign dishes to is really important. Don’t assign the appetizers to your favorite aunt who is usually late – let her bring dessert. One more tip, don’t serve too many appetizers since this is such a big and filling meal. Which brings me to a third option and it’s usually what I opt for. I make all the main and side dishes and I delegate the desserts. I will usually make one or two pies and my guests bring the rest. I only make pies because there a few that I enjoy making, otherwise I would skip making any dessert and delegate it entirely. 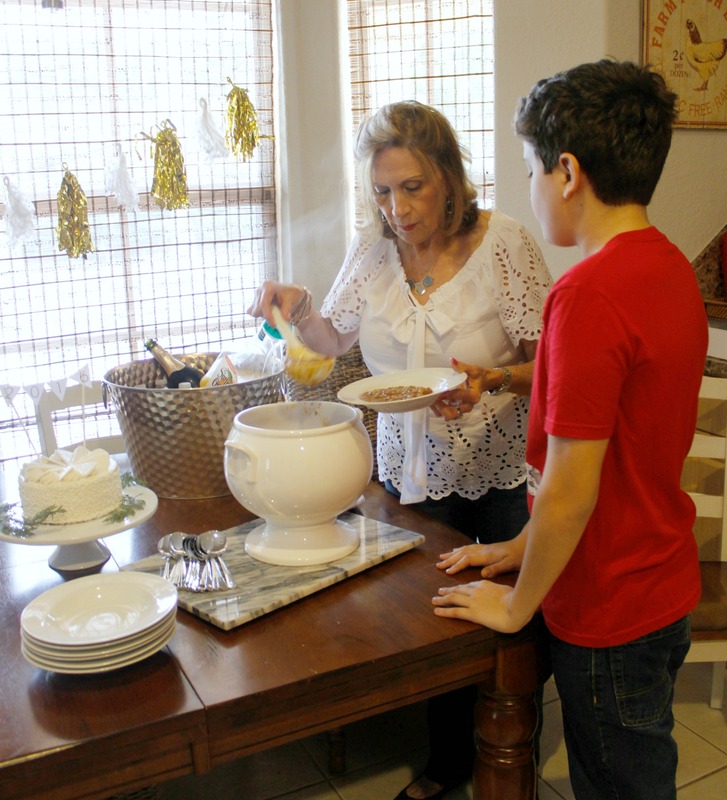 I usually set up my buffet table, allowing for the size serving dishes that I will use, but the dessert table isn’t as orderly, it’s just an empty table with a few decorations and some serving utensils. As the guests arrive they can place their dessert on that table. 2. Choose dishes that you can make ahead of time. When choosing your dishes, keep in mind how much oven space you have. Also, look at their cooking temperature, as they will have to be in the same oven. Something that cooks at 375 deg and something that cooks at 350 deg, can usually be in the same oven if you set it somewhere in between. However, something that has to cook at 425 deg. cannot be in an oven with something that cooks at 325 deg – keep that in mind when choosing your dishes. Another thing to consider is avoiding too many dishes that have to be made at the last-minute. There is always a bit of a frenzy on Thanksgiving, no matter how much you plan, so last-minute sautéing and bruleing is not going to help. Most of the dishes that I make are completely prepped the night before and will just heat them up in the oven the following day. Lastly, dont experiment with new recipes as there are too many variables to control on such a busy cooking day. 3. Order another rack for your oven. This one didn’t occur to me until last year. Considering that so many Thanksgiving dishes are casseroles that are baked in standard 9×13, you can usually fit another rack into your oven. Admittedly, after using it for Thanksgiving and my Christmas brunch, I have not had a need for it and had to store it, but it was helpful enough during the holidays to justify buying it. I purchased this one through my Amazon store but you will have to search for one specific to your oven dimensions. It will allow you to place an additional 2 casseroles in the oven. Note that adding more dishes to your oven may mean that things cook slower, as the heat distribution is altered. I don’t actually cook 6 casseroles at once anyway but I will re-heat and keep 6 casseroles in there until it’s time to serve. 4. Don’t set up any food stations inside the kitchen. You will thank me for this one. The kitchen is always the hub of the action during dinner parties but it can be the eye of the storm during Thanksgiving. If possible, avoid setting up tables right next to areas that you will need to be doing all your last-minute prep and cooking. Setting a buffet table in another room, can make it more comfortable for you to work and for your guests to have ample room to move. Also, after dinner, the kitchen will inevitably look pretty messy, so it is best to have the fun in another room anyway. It’s more relaxing to be in a room separate from stacked dishes. This should be number 1 and it’s my favorite tip for people hosting Thanksgiving for the first or fifteenth time. I write down a schedule, counting backwards on when I want to serve dinner, that has a ridiculous amount of detail as to when to put things in the oven, when to remove them, when to serve water in the water glasses, when to set the coffee maker, turn on the candles, everything. This timeline will take you a while to put together but it will keep you so calm that it will become indispensable. Also, you can use the same timeline year after year. No more stressing wondering if you are forgetting something important. There are just too many things to juggle on that day and winging it won’t carve cut it. Above all, know that are these tips are geared towards one goal – you having fun! Yes, it’s also about your guests, but they won’t have fun if you look stressed out. When you are the host/hostess, you set the pace. If you are relaxed, they will be relaxed and have fun, too! 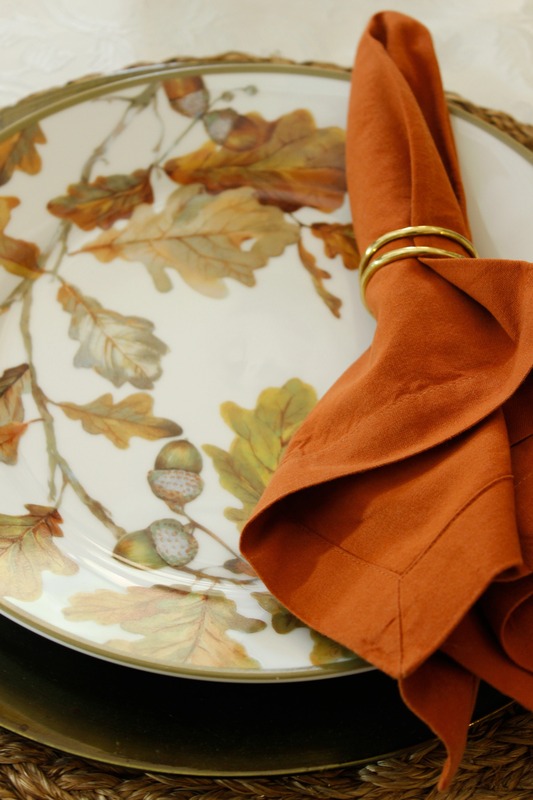 Last week, I shared my Thanksgiving Table (Thanksgiving is in 4 days – Ahhh!) and I also slipped a little “fall” into the rest of our home and I promised that I would share those pictures, too. Starting with our living room, below. This is a no-one-sits-there-room and therefore the couch has managed to be this color for years. It’s not that the boys aren’t allowed to sit here, it’s just that we rarely do, because all the fun is in the family room. The only thing that I added here was the throw and the pillow, which usually resides in our master bedroom. I also changed out the greenery in the tall gold vase for some brown and orange stems. The gold vase was originally an inexpensive IKEA vase that I spray painted. Remember my post about the year that I spray painted everything, except the kids? I still love spray paint, but with a little more restraint. This is the opposite side of the room. Only an orange lumbar pillow and a little “give thanks” pillow that I picked up last year at Target, from their dollar section. Guess what? I haven’t been to Target in months. Crazy, right?! No spray paint and no Target – who am I?? Isn’t this the sweetest little pillow? I vacuum pack all these holiday pillows and store them in the garage. The solid ones I rotate from room to room. Here is the biggest couch in the world, our couch. We have a love-hate relationship with it. We love the size but would love for it to offer more support, hence all the pillows. The pumpkin pillow was gifted to me and the others I already had. Remember that striped throw? I posted about it in my fall porch post, a few years ago. It’s still just as soft and vibrant. As you can see, a little goes a long way with decorating, if you sprinkle vibrant pops of color here and there. My boys like to decorate early for Christmas (right after Thanksgiving) so I don’t like to take out too many fall decorations, that I will have to store in a few weeks. Especially with ALL the Christmas decorations that are waiting patiently in boxes in the garage. My back hurts thinking about it. I will still try to squeeze in one more post with Thanksgiving tips. I know, I have to hurry! Either way, enjoy your Thanksgiving week! I am super grateful for all of you! Along with Autumn comes football and along with football comes food, games and fun! This week, I am partnering up with my friends at Wayfair, to bring you the best of tailgating at home, otherwise known as Couchgating! As a family, we have gone all out for football parties and sometimes we only go so far as to open up a bag of chips. When you do want to go all out, it’s important to have the right tools at hand, to make your day as fun as it is easy. This was our set up last year. 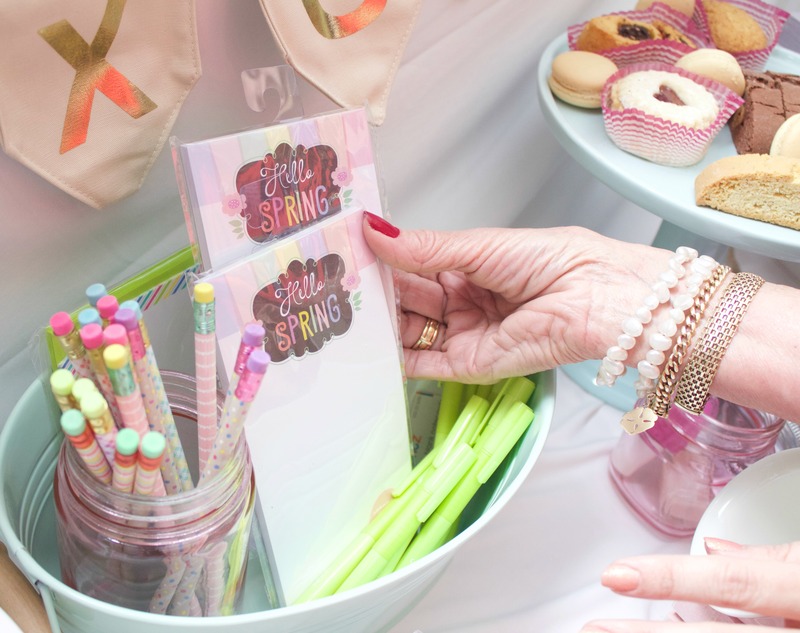 As you know I am usually not for buying entertaining items that are specific to an event, that way you can use them year-round. 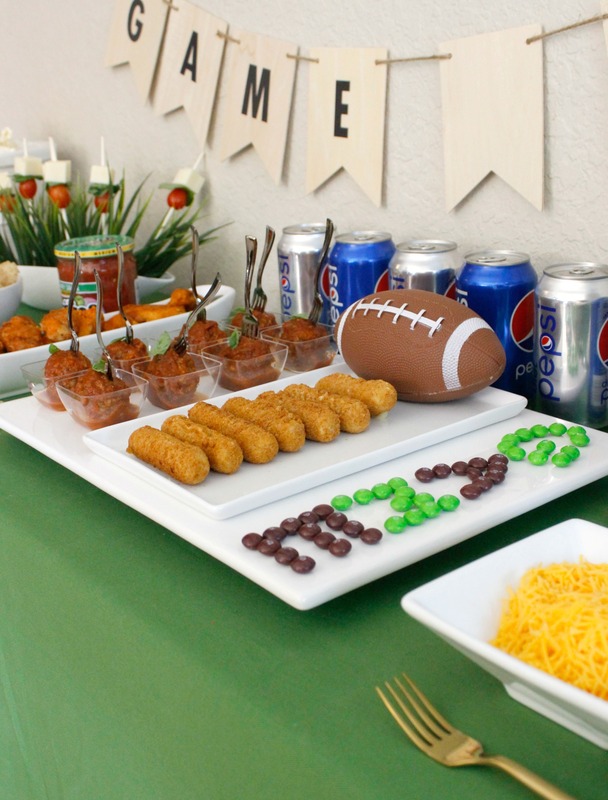 When you look at the picture above, the only thing overtly “football” about the food table, was my sons toy football. 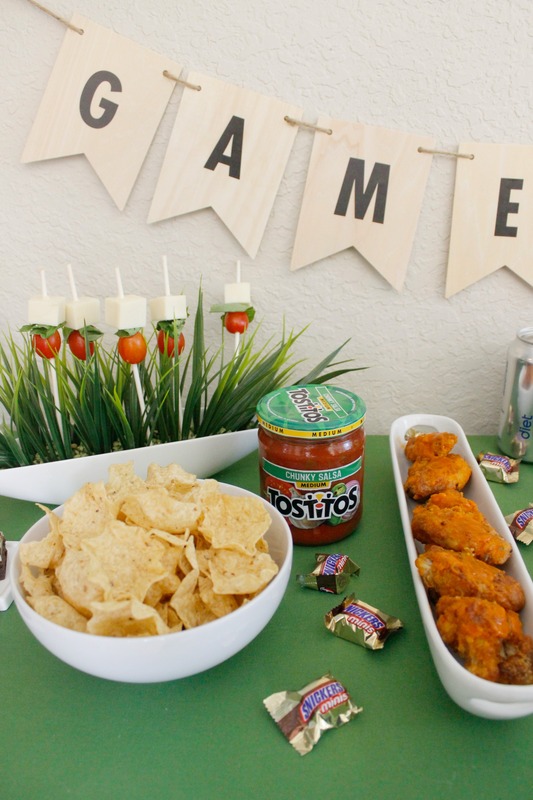 Somehow it still looks like a game day spread because of the colors I chose and one small accent. 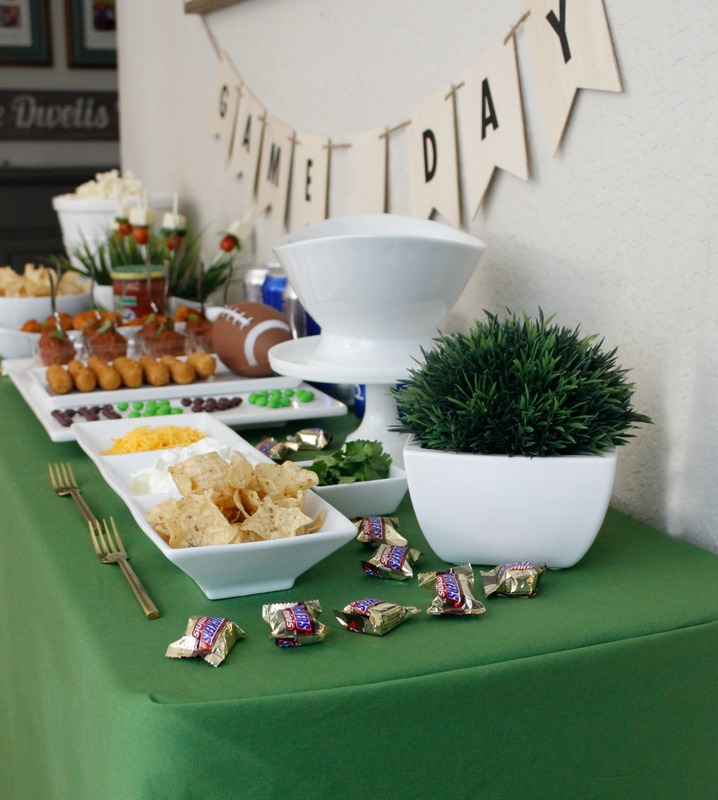 Below are some of my favorite picks from Wayfair for a successful couchgating party! 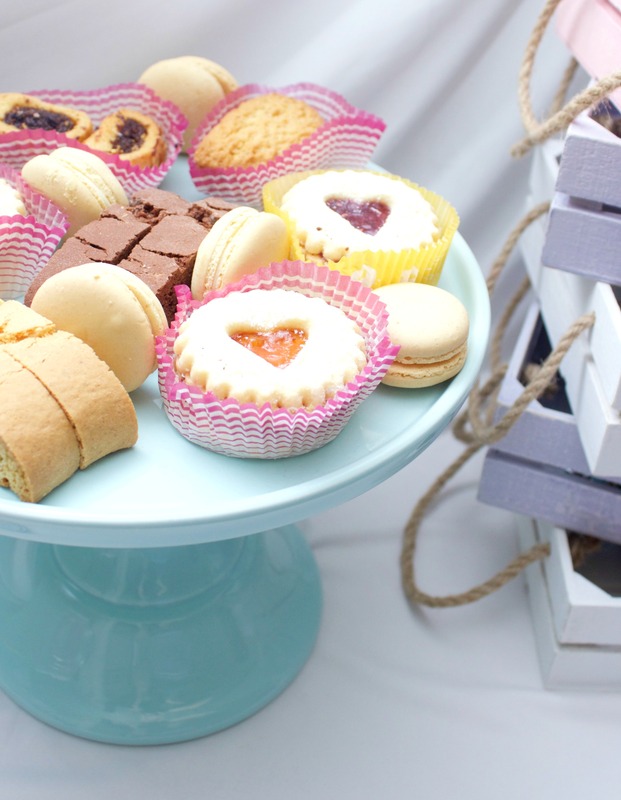 All of these items are versatile for all kids of entertaining. Frozen drink machine – Granted, I don’t actually own one, but I want one. If you have more than a few people over, I’m sure it would avoid making individual drinks with the blender. Serving platter set – I found a couple of cute football shaped platters but in the end, I always choose the ever-versatile white platter. The couch – I know this is pretty obvious, but it’s crucial for being able to sit around for hours, and if you are like us, we all end up lying around the couch. That’s one of the perks of having a huge couch. On another note, although my couch is big, we are not super happy with how comfortable it is, so we end up using a bunch of pillows to add support. Don’t be afraid to buy a couch from a trusted website, where you can also read reviews. I purchased mine at a store and I’m sure that had I seen reviews, I would’ve chosen differently. The grill – This simple round grill is still my favorite. Serving cart – Another one that I don’t own but have wanted for years. Geez, I wish my husband read my blog! So many gift ideas! Actually, maybe that’s why he doesn’t. ) A serving cart can bring the party to you. It’s great if you are moving the party outside, or if you want to bring a few of the items from the big table, closer to you. Grilling tools and utensils – I know that there are some awesome grilling sets available, but there is no tool that I prefer over a good ol’ pair of tongs. That goes for indoor cooking as well, just a shorter length. One more thing! 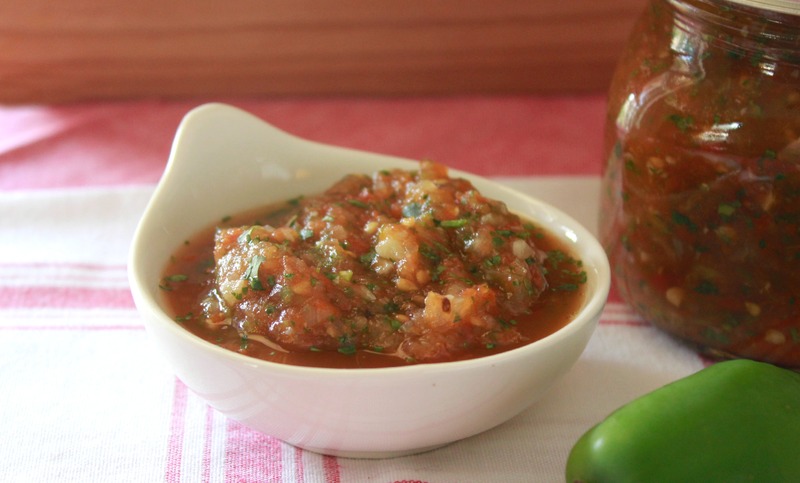 I wanted to share with you my roasted salsa recipe which is perfect for your couchgating party. Perfect for anything, really. 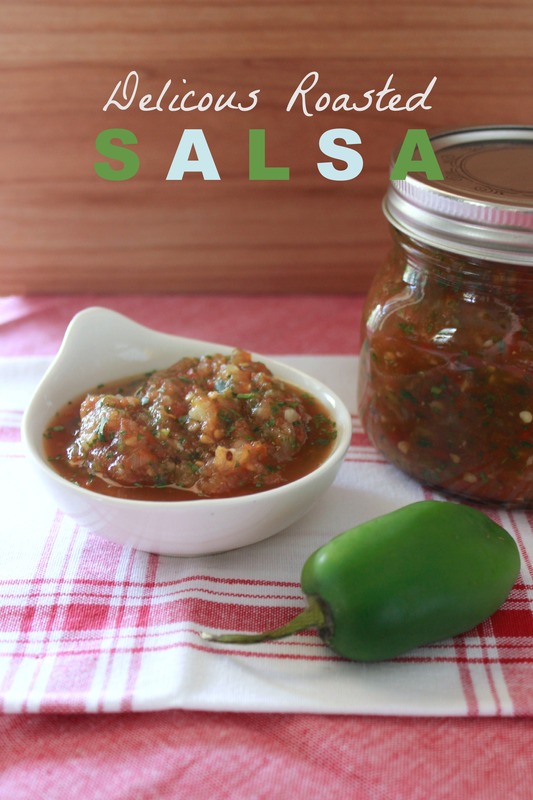 It’s my favorite and I have tried so many salsa recipes! 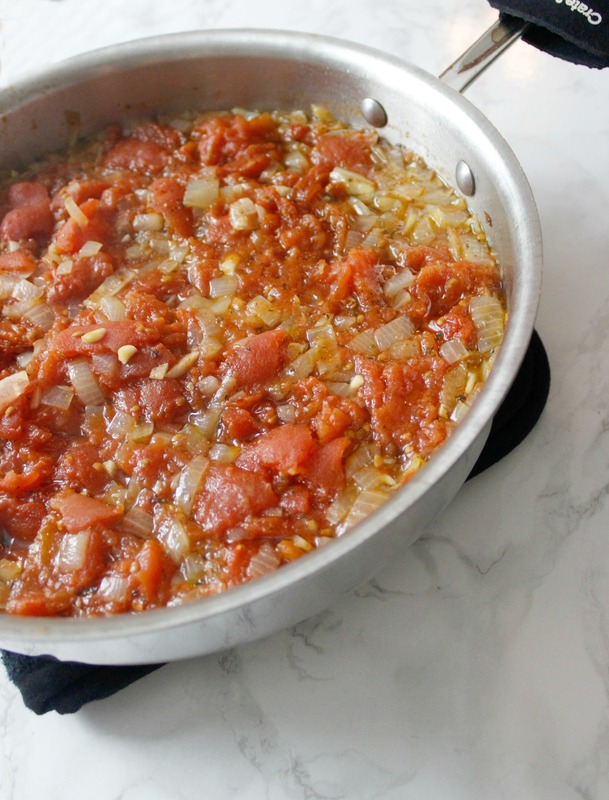 Cut up the tomatoes and onions into large chunks and spread onto a baking sheet pan . Remove the caps off the jalapeños, then cut the jalapeños lengthwise, and remove the stem and some of the seeds (read tip below). Add the 7 whole cloves of garlic. Toss everything onto 2 sheet pans. Heat tip: In order to keep the heat off your hands, you may want to wear gloves when cutting up the jalapeños. For really hot salsa, do not remove the seeds of the jalapeños. For medium-hot salsa remove the seeds from half of the jalapeños. For medium salsa, remove all the seeds from the jalapeños. For mild salsa, hold the jalapeños under running water and remove the seeds and inside membrane of the jalapeño. Place the trays in the oven and roast for about an hour. 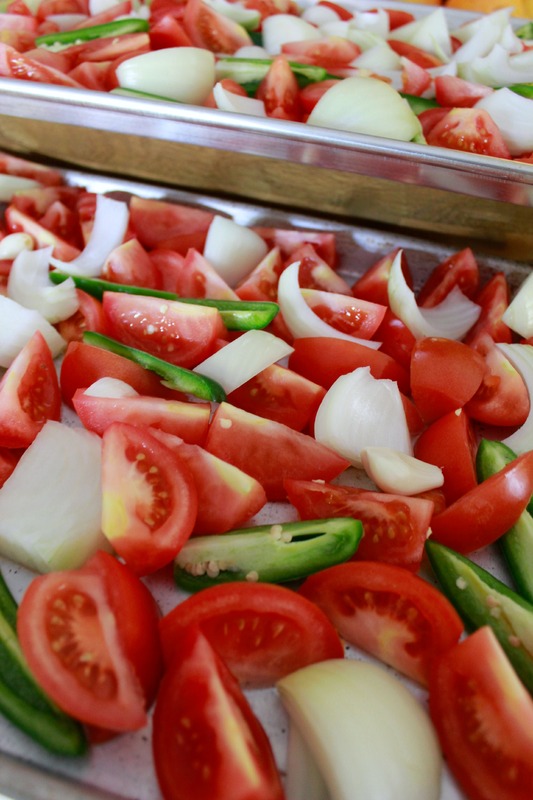 Check the trays after 45 minutes, so that the roasted tomato mixture does not burn. You should see a bit of char on the edges of the onions or tomatoes, but nothing should look like it’s burning. Remove the trays from the oven and allow to cool slightly. When you can handle the contents, place them in a bowl and take them over to your food processor. I suggest you do the following in 2 or 3 batches to avoid over filling the processor. 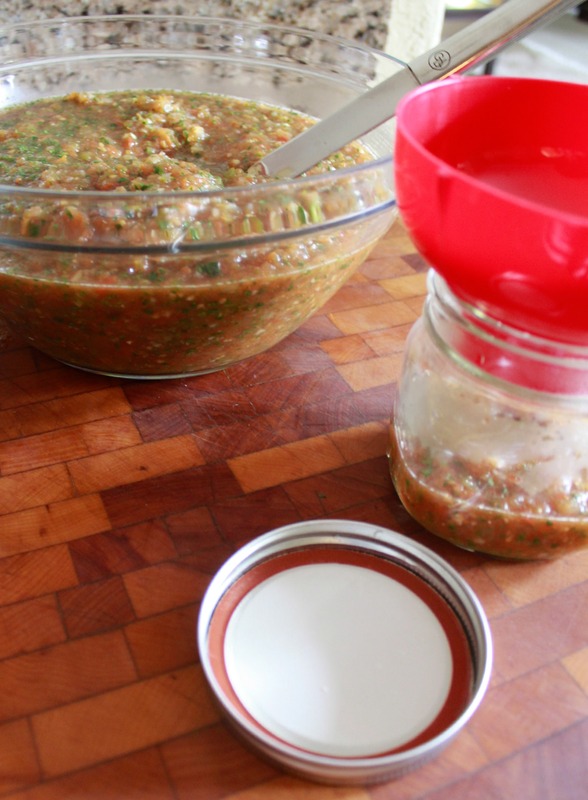 Place a good amount of the roasted tomato, onion, jalapeno and garlic mix into the processor, I then add a small bunch of cilantro and a bit of the salt. Process until desired consistency and then add to a large bowl or container. Continue to do this in batches until you have used all the roasted mixture and the cilantro bunch (and the salt to taste). This makes about 4-5 large jars depending on the size of the tomatoes you use and the jars, of course. I like to use a canning funnel for this because it makes pouring easier. The salsa will still be somewhat hot at this point so be careful. Nothing left to do but, enjoy! I hope your team wins! Either way, enjoy your couchgating day! Last year I posted pictures of how I decorated my buffet for fall. I called it a mantel and really, it isn’t. 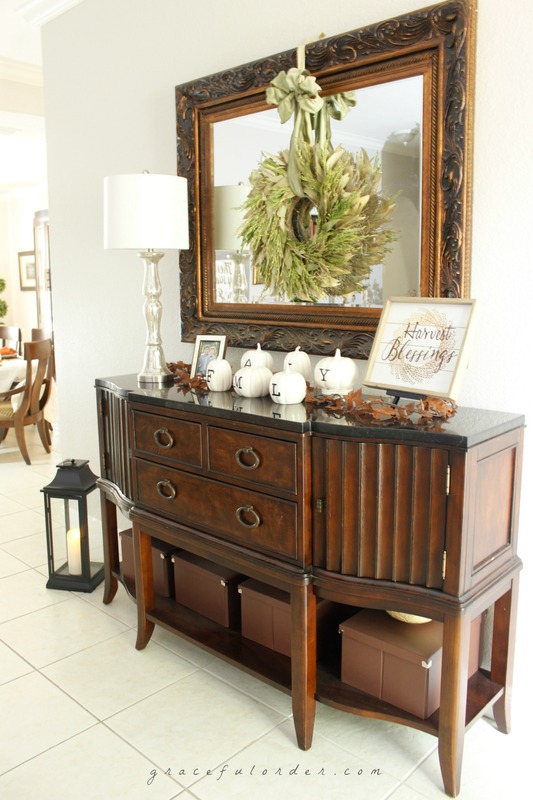 It’s a buffet that is in the entrance of my home that I decorate as one would a mantel, except I live in Miami and fireplaces are not popular, because we have enough heat as it is. I do love having this big piece of furniture that I have had for 13 years, because it gives me beaucoup storage and an opportunity to set the stage for the current season. This will be a short post because there is not much that goes into putting this together. 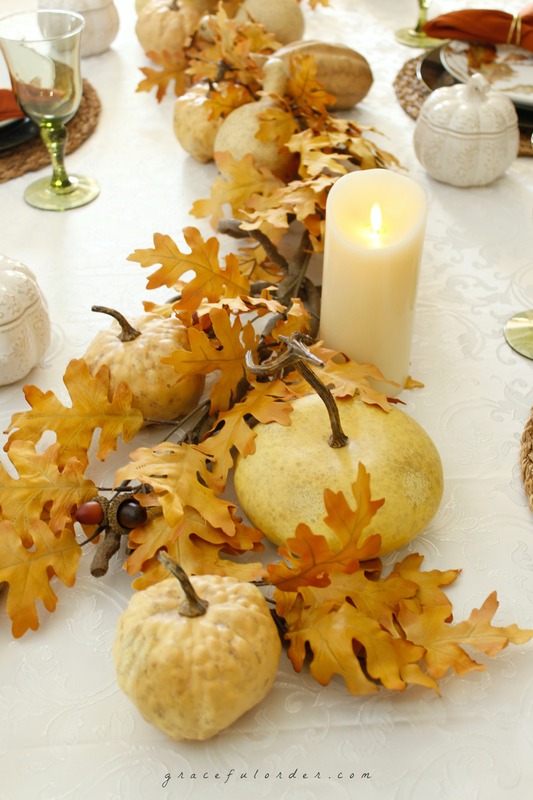 A few days ago, I shared how I decorated my table for Thanksgiving this year. Since this room borders the dining room, I like to sprinkle a little fall throughout, tying together both rooms. There were two new items that I was excited to use this year. 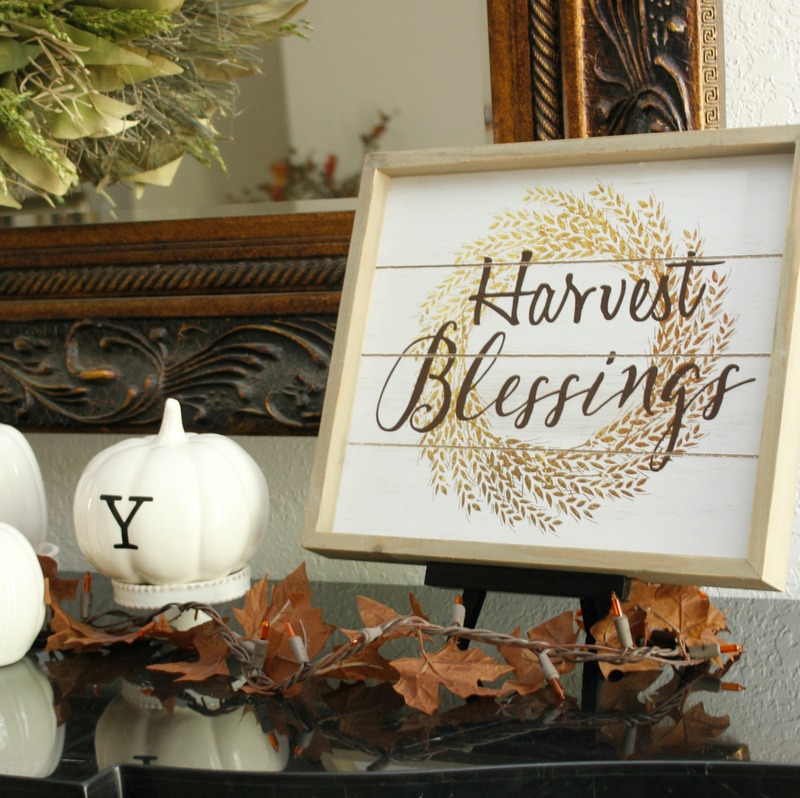 One was this sweet little “Harvest Blessings” sign that I picked up at Ross for 6.99 (crazy, right?!) 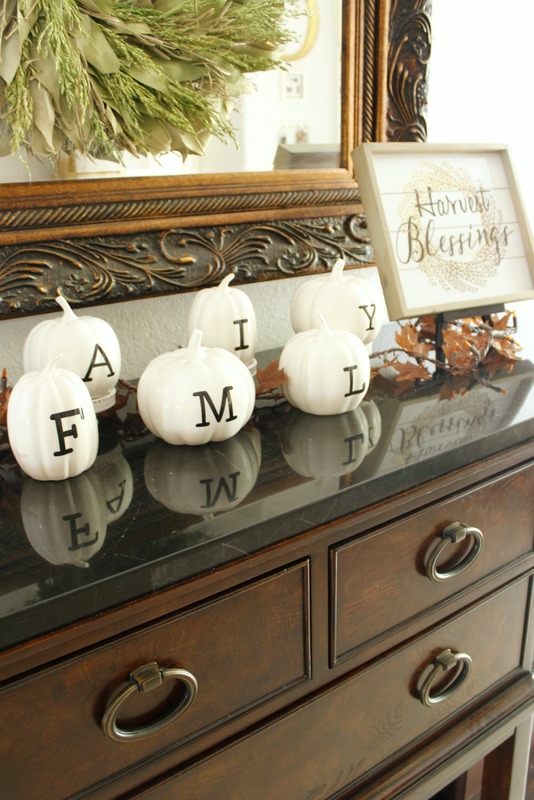 and the white pumpkins that spell out FAMILY. With very little money, you can pick up something similar at Ross or Homegoods and add a little autumn feel to your home. I purchased the leaf garland that you see intertwined on the buffet through Amazon. I actually purchased it with the intention of using it on my Thanksgiving food buffet but I figured it can adorn this table for now. Also, chances are I will tuck it away and when the Thanksgiving frenzy begins, I won’t even remember where I put it. 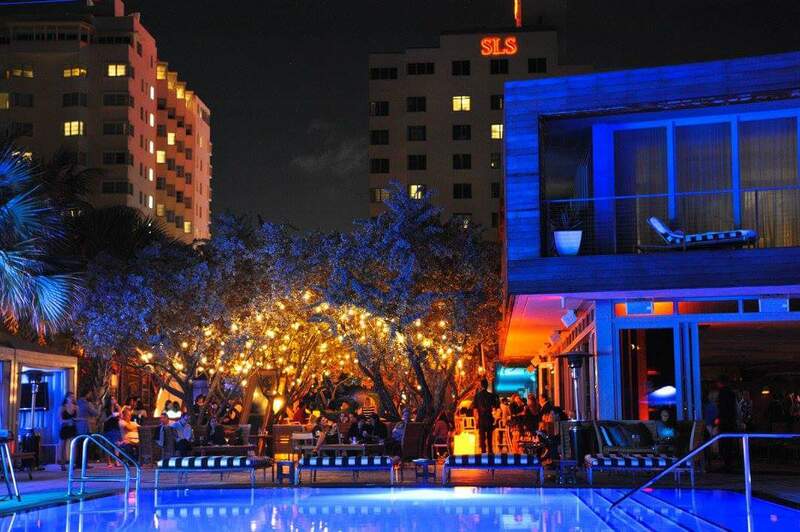 It looks really nice at night, when the lights are on. 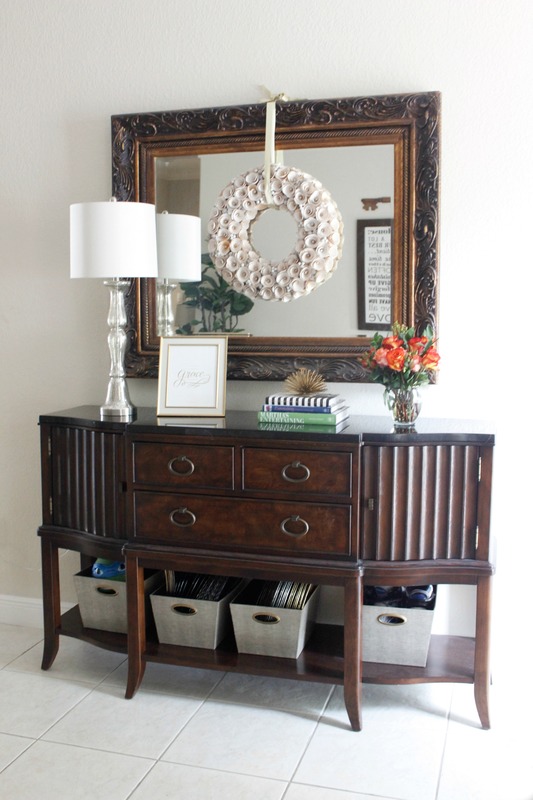 The wreath on the mirror was already there from the last season – lazy decorating, I know. Hey, maybe I can glue some red berries on it and leave it there for Christmas!? Now that’s an idea! In a few days I will show you what I did with the family room and living room (opposite to this furniture piece) and I think you will like it. Think vibrant pops of orange! See you in a few days! Harvest Blessings, friends! Hello friends! Missed me? I’ve missed you, but it’s been so hectic around here that I had to take a small blogging break or start posting for the sake of posting, which is never what I wanted to do. So I took a break and it was great and it was needed. Sometimes we just need a little break from things so that we can later re-connect with renewed energy and ideas. 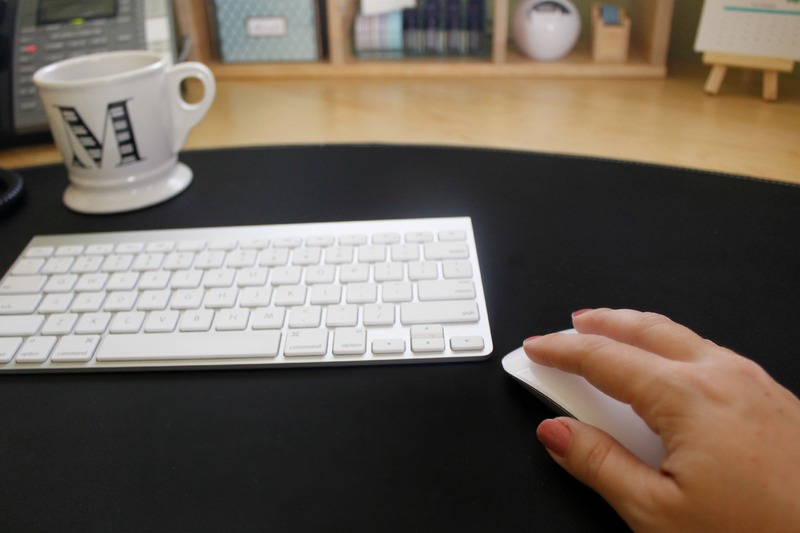 Blogging can be so much fun and so much work but it’s incredibly rewarding and that’s why bloggers pull up to their keyboards time and time again. Thank you to my Graceful Order friends for sticking with me for the last 3 years, for all the likes and all the shares and all the sweet comments – thank you! I actually only meant to be away for the summer as my boys were home but then August came around and then September and as I was bringing down the autumn stuff from my garage, I thought “I need to share this with my friends!” Then I started photographing and it was so much fun again! Throughout this week I will be sharing posts about Autumn. Expect lots of orange and brown and pumpkins and pie! 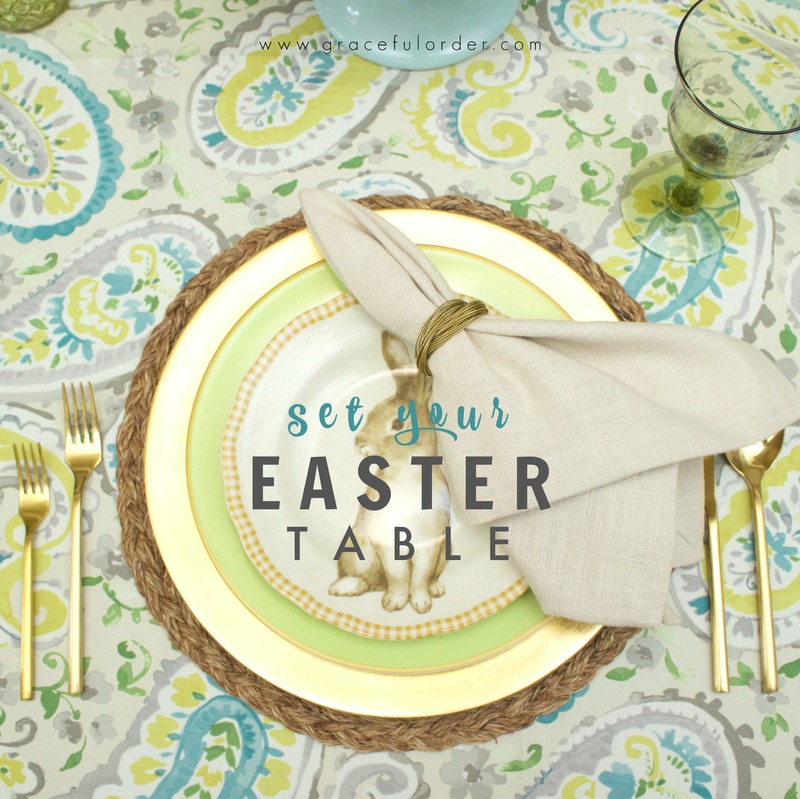 I will start with one of my favorite things to do which is decorating the table! I am hosting Thanksgiving dinner this year and I intend to leave the table set like this for the remainder of the month. No fear, I will wash the dishes so that no one is eating dusty turkey! I am using these gorgeous dishes that I picked up last year at Williams-Sonoma in their after Thanksgiving sale. I ordered some online and when they ran out, I drove to the store to pick up the rest. I did pick up a few extras just in case one breaks, the set doesn’t fall apart. 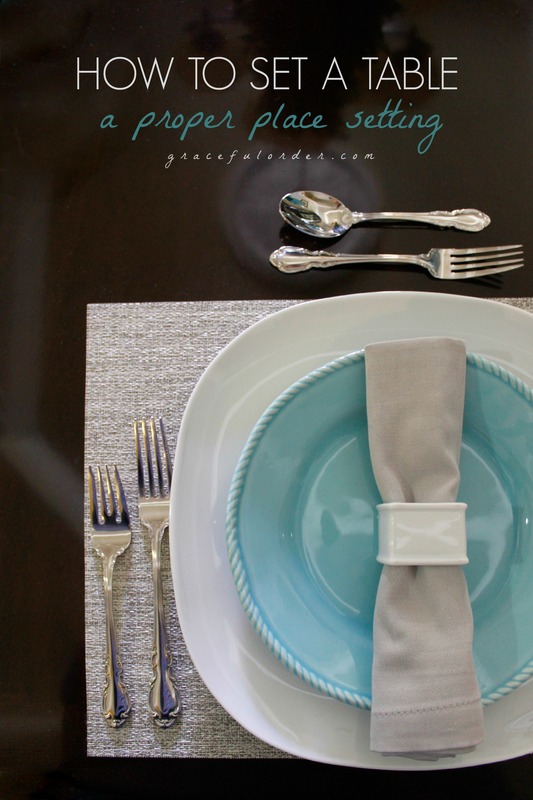 By the way, should that happen, you can always set the two end place settings in a solid coordinating color. I love having a large table. Well, usually I love it. One challenge that I have is finding a tablecloth that will fit. I have priced out getting one custom-made and they are so expensive! A quick search on Amazon led me to this tablecloth, which has the right length and width for my table – 70 x 144. In the past, even when I can find a tablecloth that is 144 in long. it was usually 60 in wide, which leaves the side of my table short on fabric. This one was perfect. 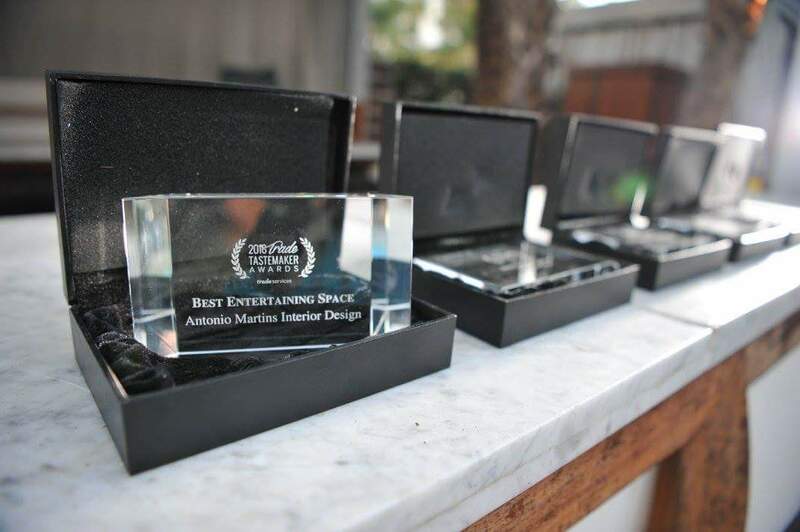 The centerpiece is a swag that is meant to hang on a wall. I just placed some gourds around it to make it feel full and bountiful – just as Thanksgiving should be. I also placed some faux candles on the table. That way I don’t have to worry about any scents competing with the food or any candles dripping on the table. These candles are the most realistic I have found to date. I have quite a few of them throughout my home. They are perfect for mantles and hard to reach areas where it’s a pain to light a candle; they are safer, too. As a finishing touch are the mini pumpkin bowls which I will use to serve butternut squash soup for Thanksgiving dinner. I have seen a few version of these bowls and they are all adorable. Just make sure that they are oven-safe so that you can keep soup warm in the oven, while you do last-minute things, before dinner is served. I hope you love how the table turned out. I love that I get to enjoy it all month and not just for Thanksgiving. I would love to know how you decorate your table. What colors do you decorate your home with during the fall season? Browns, oranges or more shabby chic with white and ivory shades? 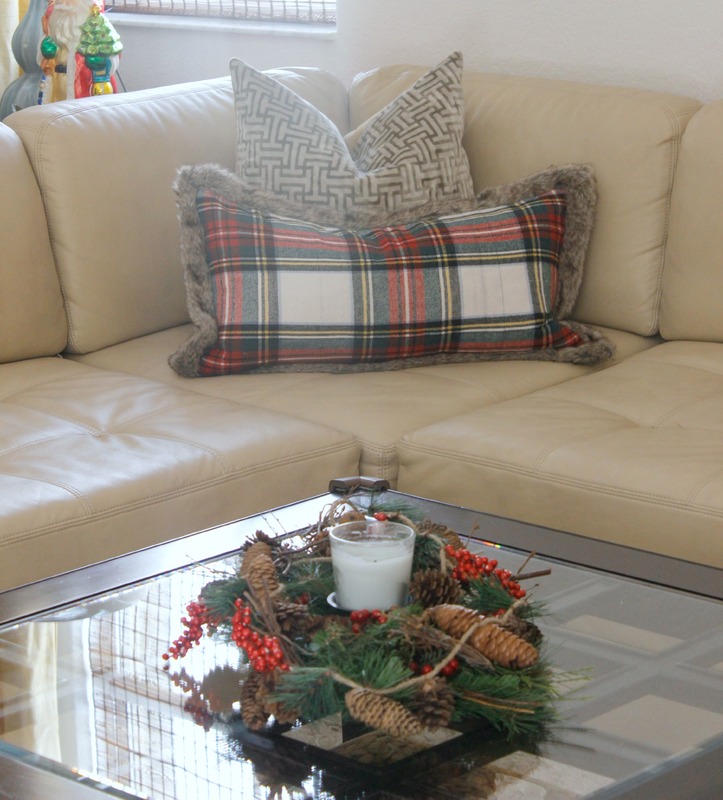 See you all in a few days when I share fall decorated living room! It’s nice to be back! Summer is coming to a close and I can’t wait for the boys to go back to school we had so much fun these last few weekends! We took a few mini vacations this Summer, visiting the Florida Keys a few times and the Georgia Mountains. We love creating memories with our boys and the Summer is the perfect time for some good, uninterrupted family time. We got back from the Blue Ridge mountains this past weekend and we were so tired – by “we” I mean my husband and myself. We drove from Miami to Georgia with both boys and my parents and when we got home, all I wanted to do were two things, sit on the couch and – actually that was it. Sit on the couch. Before leaving on our road trip I was given the opportunity to pre-screen a movie that is coming to theaters August 26th called, GREATER. I was looking forward to coming home and watching the movie, especially after seeing the preview. I was also looking forward to doing anything that didn’t involve driving and refereeing 2 boys in the back seat – it’s a 12 hour drive, ya know. What I wasn’t expecting is to love the movie the way I did, and I will tell you why without spoiling it for you. At first glance the movie was about football but really the movie is about life and is relevant to anyone and at any age. I knew my husband would like it because he used to play football in high school and he gravitates towards sports-related movies. We initially watched the pre-screen in our office on my computer. After we watched it, we knew that we had to let our 12-year-old see it, too. We connected my computer to the television and we all saw it there again, together. So what’s so special about GREATER? 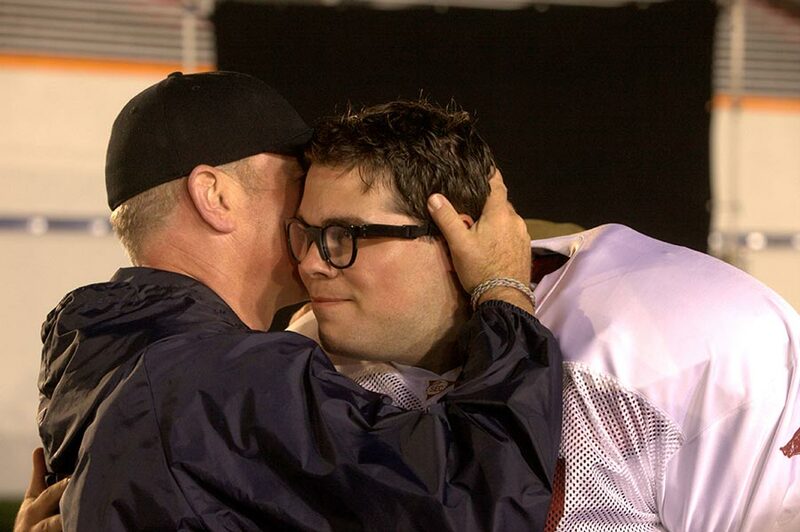 It’s a movie based on a true story about the life of Brandon Burlsworth, who was possibly the greatest walk-on in the history of college football. However, Brandon was not always the “greatest” and actually many times he was told he was the worst and would never make it and yet he had faith and persevered. He had faith even when the very people that loved him most thought he should be more realistic and let go of his dream, he didn’t give up trying. He had listened to this message of moving on and having more realistic expectations of himself since he was a boy. He endured so much discouragement and while many would have given up and settled for a more realistic, more expected future, he didn’t. 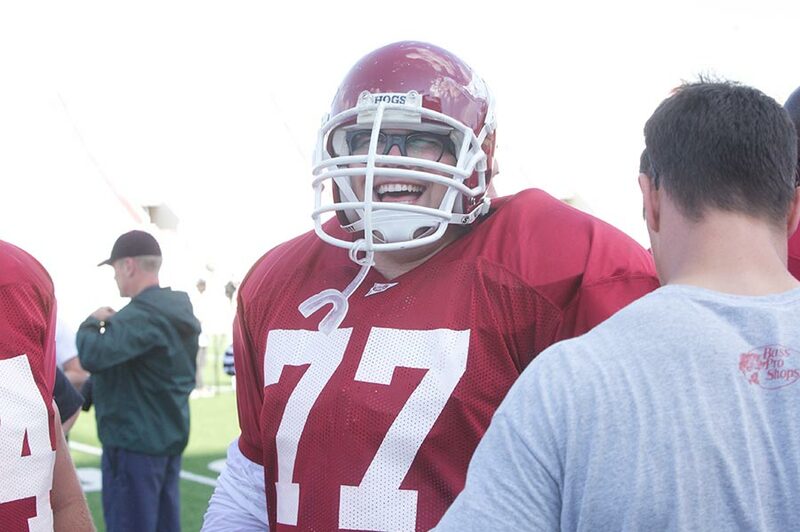 Through faith and discipline, the kid dared to keep believing in his dream to play college football for the Arkansas Razorbacks. It wasn’t just belief, not faith alone, he put in endless hours of practice and sweat, until he reached his goal. If he was told that he was less than the others, he just worked harder than the others and in the end he led them all – peers and elders alike. This is the kind of movie that I want my kids to watch. This is the kind of humble audacity that I want them to have. To dream is not enough, but it is the beginning. Seeing how this young boy, against all odds, worked so incredibly hard, and he won and then he lost and then he won again…but he never stopped. I don’t usually write about movies, but I wanted to share this with you and encourage you to go watch this great movie with an awesome message. Determination, hard work and passion are the makings of an incredible legacy and that’s what this young man left behind. GREATER has a release date of August 26th and you can check your local theaters for availability – it’s worth it. My boys have one week left of school, just one more week! They are looking forward to summer and frankly, so am I. I may be singing a different tune come August but for now I welcome the more relaxed schedule for them. My schedule however, doesn’t change all that much because it’s summer time so I have to adjust a bit to keep things working smoothly here at Casa Gonzalez. One big difference that happens in the summer is that both my boys will be taking their lunches to camp daily. My oldest (12 years old) usually eats at the cafeteria during the school year, but once he enters camp, he will be taking his lunch with him daily. My youngest (5 years old) always takes either lunch or a snack to school. He is the kind that if he doesn’t like his school lunch, he won’t eat until I pick him up, so a heavy snack is necessary. 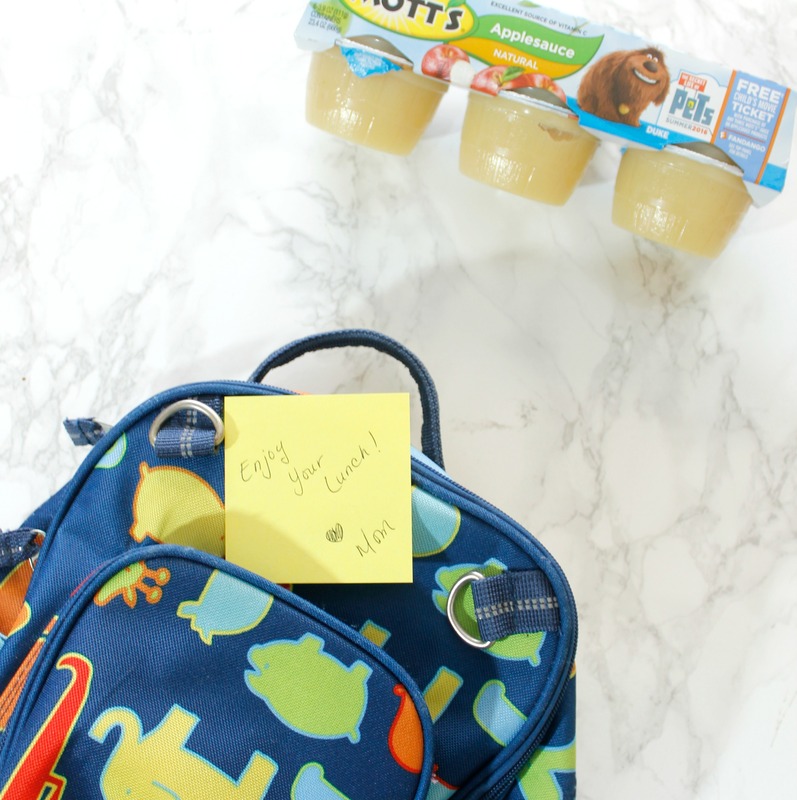 Since I am already thinking of different lunches to send my boys off with, I have partnered with one of my favorite snack companies – Mott’s® – to bring you summer lunch ideas for kids! 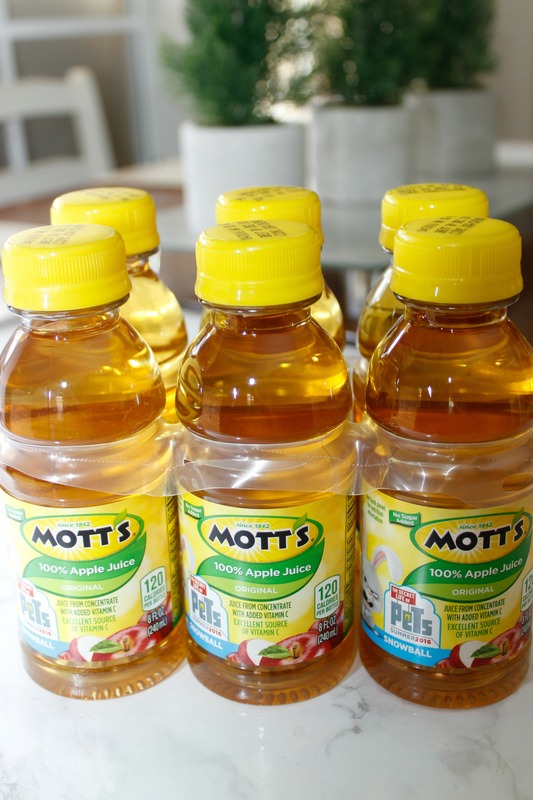 The Mott’s Apple Juices are a treat for my boys. I want them to make smart snacking choices and there is no better time to learn than when you are young. 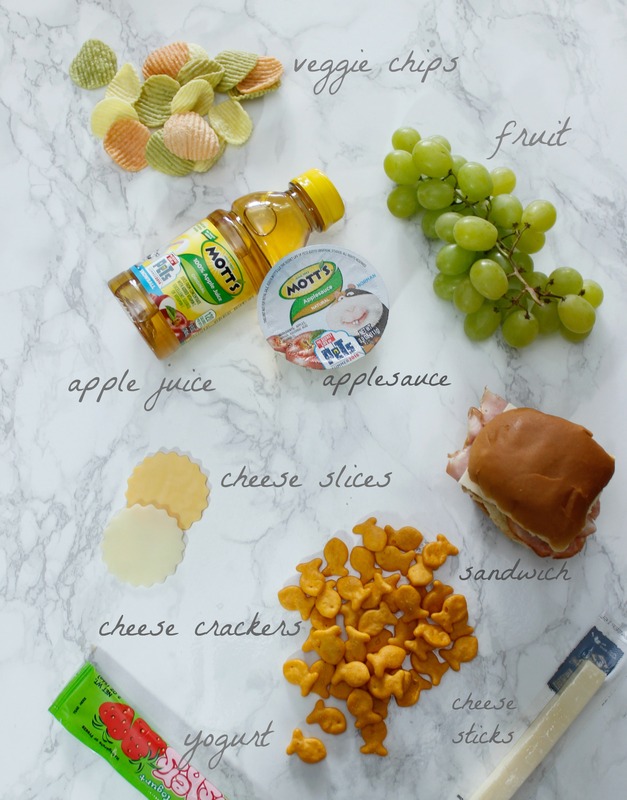 There are a lot of options for lunch or snacks that are fun and nutritious. My kids like crunchy things, (I think we all do) so I like to add a few veggie chips to their lunches. 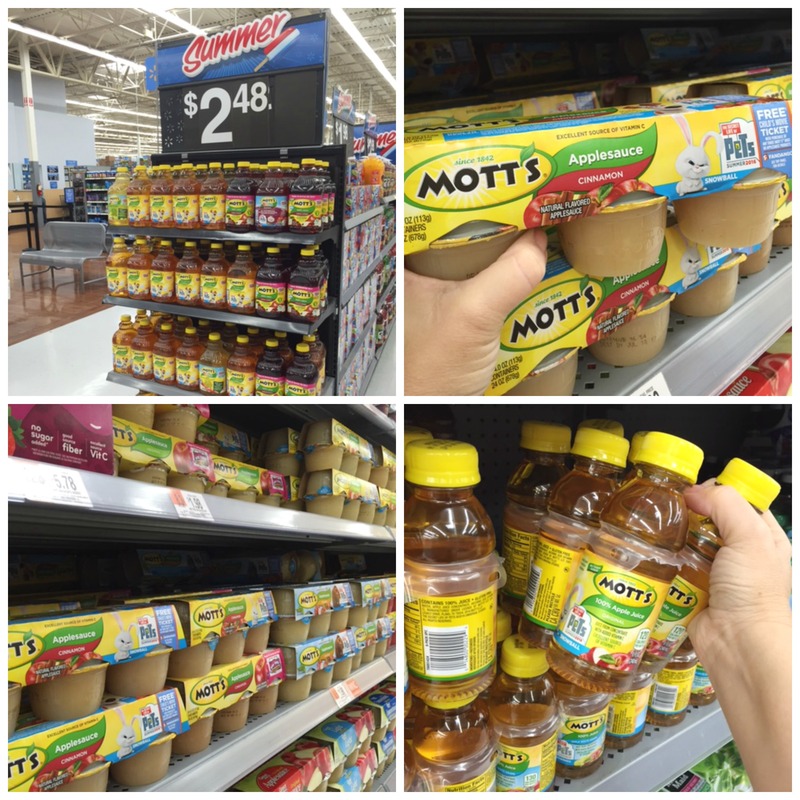 Mott’s Apple Juice and Mott’s Applesauce are a staple in their lunch boxes. 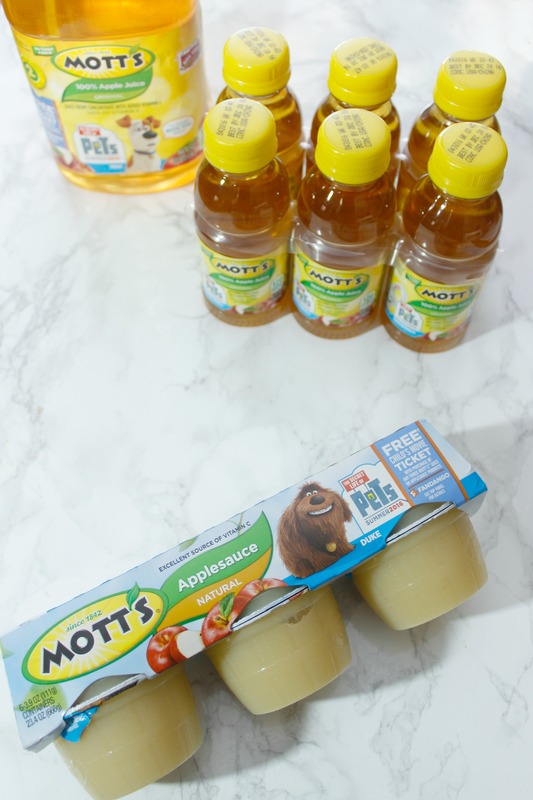 I usually buy them the original flavors but there are applesauces in various other choices, such as Mott’s Apple Cherry which is a new flavor. 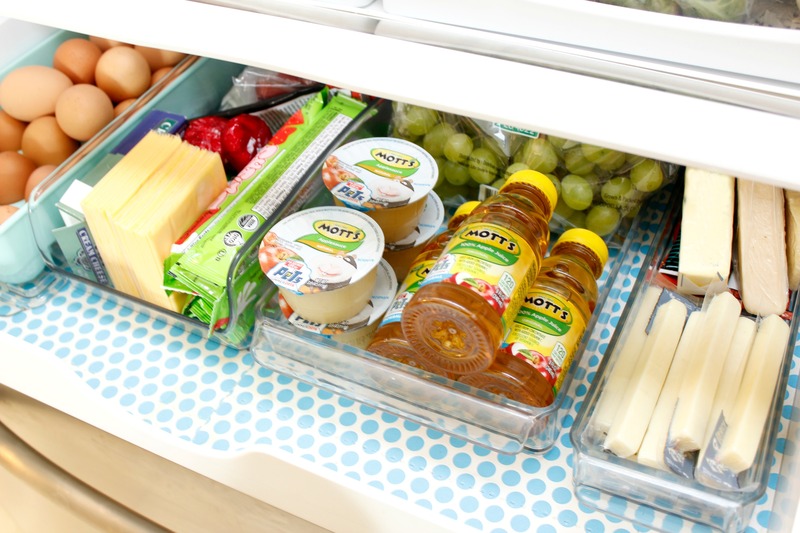 Also, fresh fruit, cheese sticks, yogurt… so many options so that they don’t get bored with lunch. 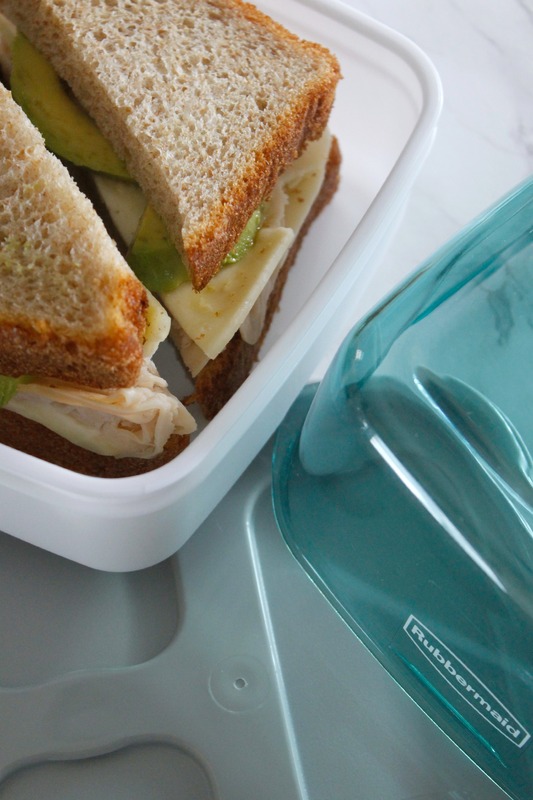 And the trick to lunches made easy? Having a stocked refrigerator. I tell my boys which are their snacks for home and which are for camp. They know that the deli drawer is my camp stash. Most of the time, their lunches look like this. That little sandwich that you saw in the picture above, is a Cuban Medianoche. Do not fear, I will translate. Medianoche means midnight and these sandwiches became popular in Cuba many moons ago when they were traditionally served as a midnight snack in restaurants. This is an adaptation on the sandwich because they are made with fresh roasted pork and are finished off on a press…yum! But we are keeping it easy over here – it’s the summer after all! 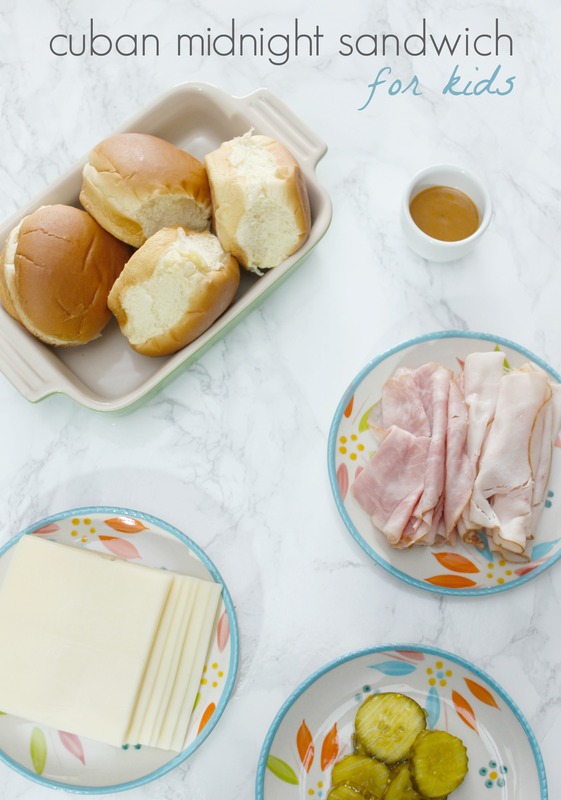 I just make the sandwiches with a sweet Hawaiian bread roll, a slather of mayo or mustard (or both), roasted ham, roasted pork (or even turkey, if you want), swiss cheese and a pickle. Voila – Mini Medianoche! I want to teach my boys about eating smart now that they are little. My boys don’t like every vegetable or fruit, so I just find the ones that they like and I alternate them in their lunch bag. 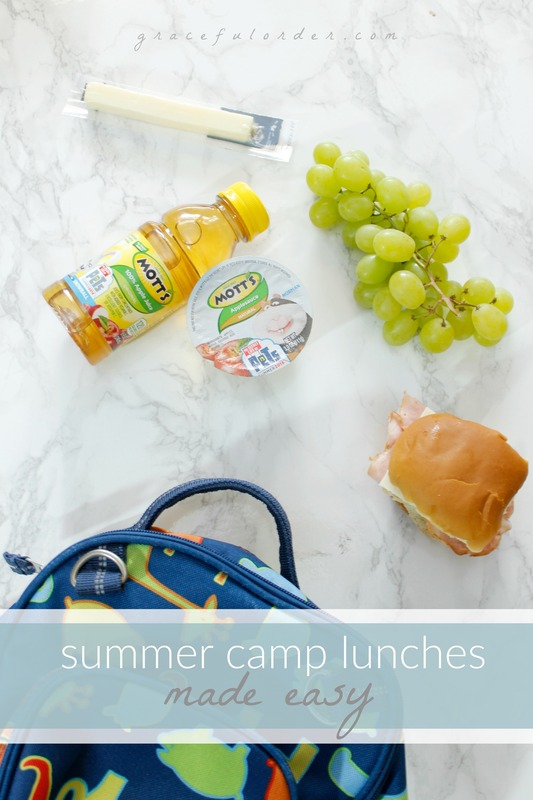 The most important tip is definitely to keep your pantry or refrigerator stocked and organized so that in the morning, before the coffee has taken effect, you can quickly throw together a delicious summer lunch for the kids. A finishing touch is a little note that I add to my 5 year old’s bag. If I did this to my 12-year-old, there would be consequences to pay. 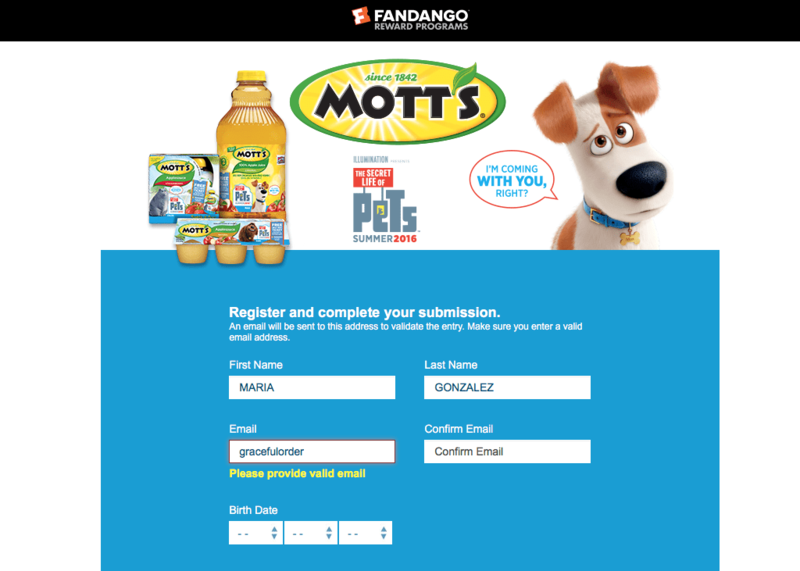 You will notice that the products have The Secret Life of Pets characters on packaging. It’s really easy to do…below is a screenshot of when I did it. I hope you all enjoy your summer. The school year went by so quickly and I think summer will too. Enjoy every minute of it, snack wisely and stay safe! 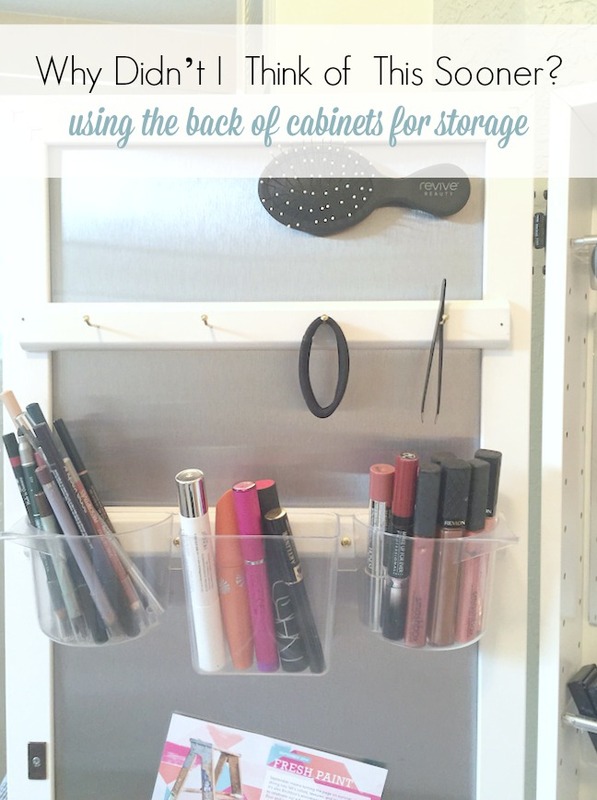 There are so many uses in the kitchen for back of the cabinet organization! 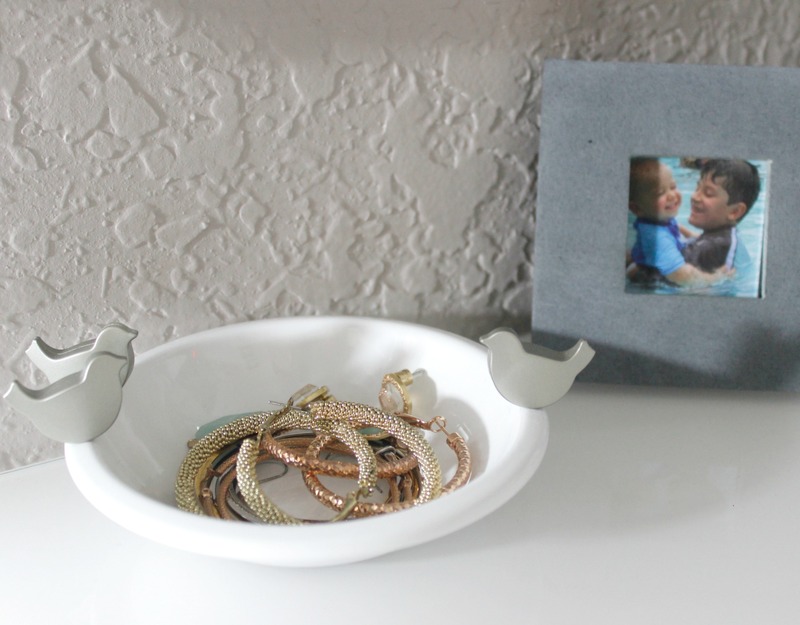 I use these awesome adhesive bins that come in all shapes and sizes to customize my space. 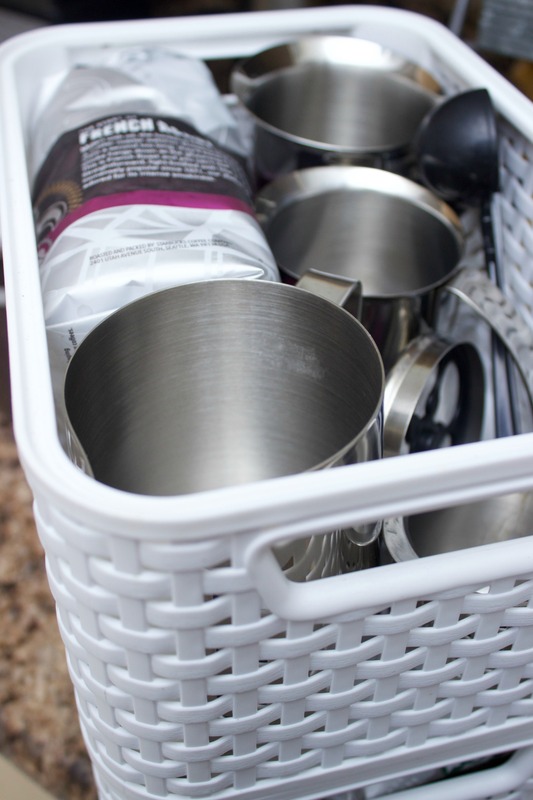 I store sponges, storage bags, a set of spoons designated for coffee…so many options. 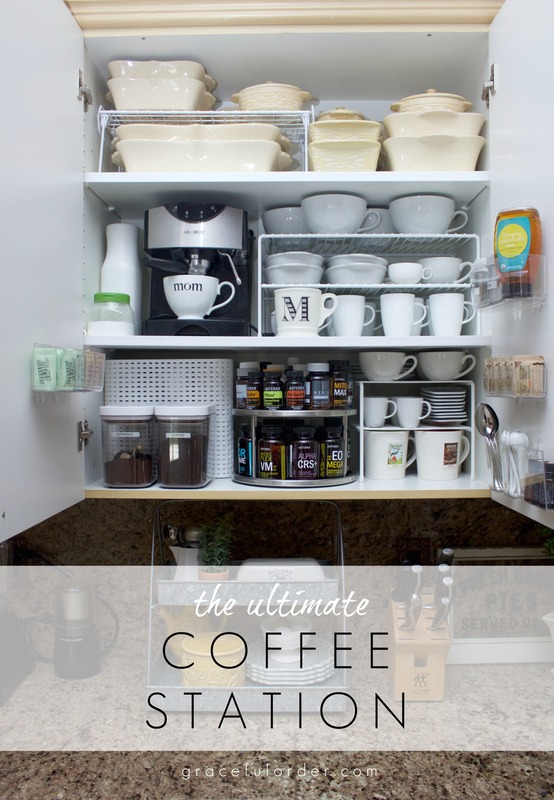 I use the back of the cabinet for my coffee station. I love having spoons, honey and sugar packets accessible while I prepare my morning coffee or tea. I do try to store items that are not too heavy, so that I don’t have to worry about them coming off the wall. 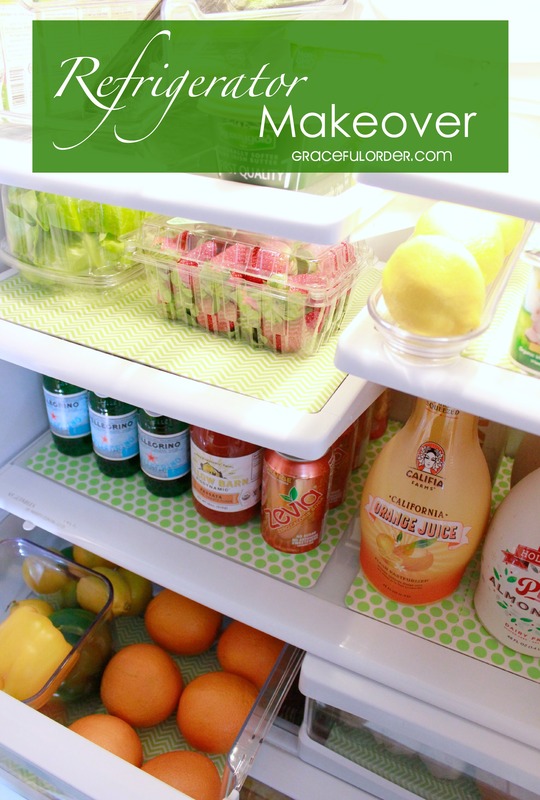 I also use the back of the cabinet door in my smoothie station to hold up a clipboard with clippings of recipes. This clipboard is from the dollar, store which is great because it isn’t heavy at all. I didn’t want some great quality, substantial board for this. I love being able to place clippings from magazines or recipes that I want to try. If they were in a drawer, I would surely forget about them. Similar to the kitchen, the bathroom usually has cabinets that offer an opportunity for great storage. 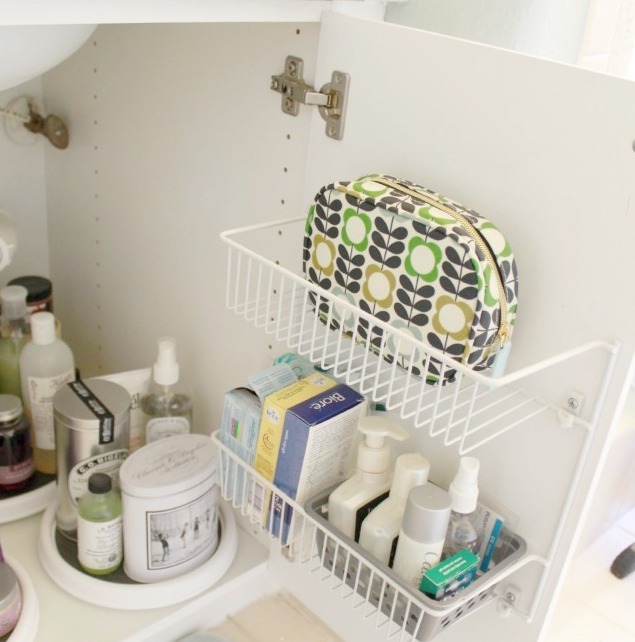 The area under the sink can be tricky because you always have to work around the plumbing. 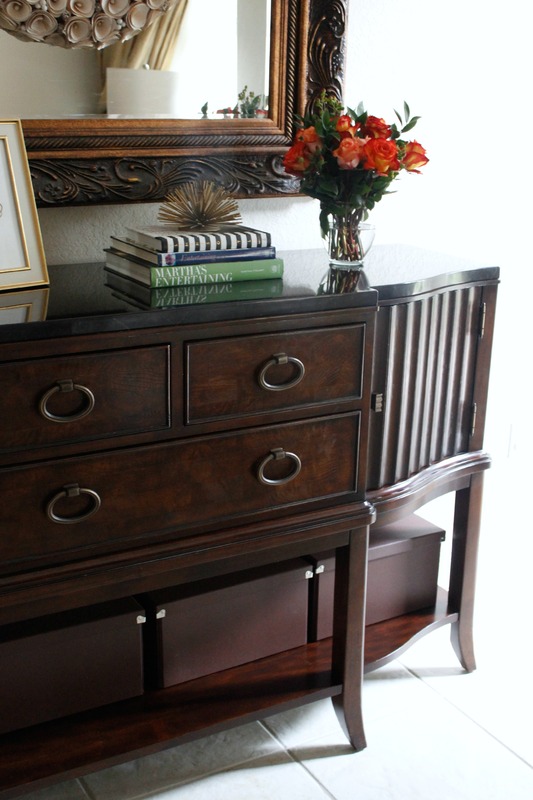 The back of the cabinet can be a great opportunity to make up for that lost space. I love this little cabinet in my bathroom. Honestly, I am not even sure what it was designed to be used for, but I use it to store my makeup. It already had built-in storage which is fantastic and I added some extra bins to the back of the cabinet to make it even more useful. Since the back of the door is magnetic, I also added a magnet to the back of my hair brush. This slender cabinet is beside the bathroom door and barely visible when closed. These are just a few ideas that have worked for me! The more cabinets that you have, the more options you have. I wouldn’t want to fill up all my cabinet doors with storage but I do think that in a select few, it can be a really great solution. I hope these ideas inspired you to look at your own home and especially your cabinets, as an opportunity for more smart storage. Be sure to measure your space so that you purchase the right size bins. Also, make sure that the new bins won’t crash with what is already inside the cabinet when you close it. As I mentioned above, I recommend storing items that are not heavy so that you don’t have to worry about anything tumbling down. Follow the instructions on the adhesive bins and allow them to dry and adhere before adding anything to the bin. I promise when you find a the perfect cabinet to transform, you will wonder – Why Didn’t I Think of This Sooner? Do you ever feel like you are drowning in laundry? I know that with 2 boys, a husband plus myself I feel like I am never done with our laundry. Over the years I have tried different systems to see which felt more manageable and I want to share with you what works best for me. Yes, I still do laundry often but rarely do I feel like it’s out of control. Of course there are the exceptions like when we go on vacation or someone isn’t feeling well, especially if that someone is me. What works for me may not be what works for you. It is important to take into account work schedules and personal preference. Some people prefer to pick a laundry day and get it all done in one day. I prefer to do a load a day and sometimes, especially on the weekends, I will skip a day. 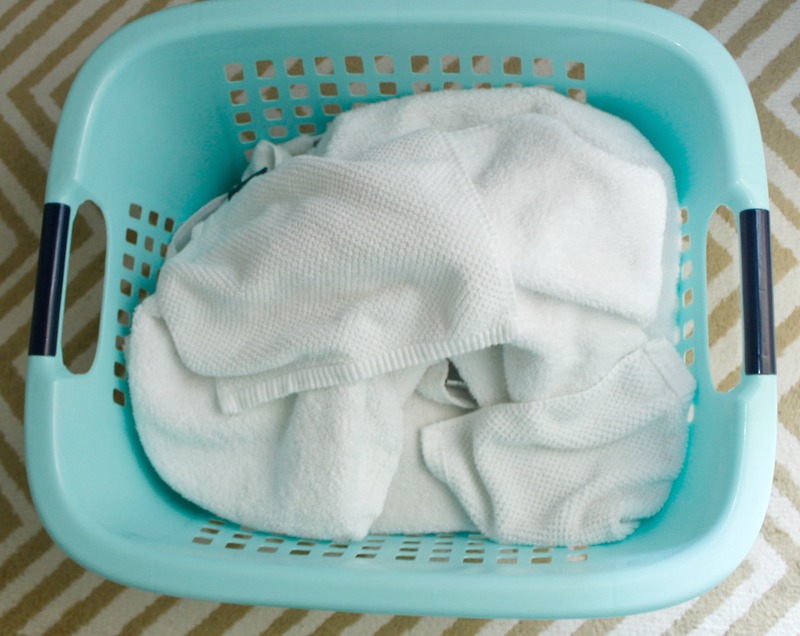 I find that this method works best for me and it doesn’t allow laundry to accumulate. I will place a load in the washer in the morning and I will complete that entire load, meaning washing, drying, folding and putting away. I resist the urge to put another load in the washer because I know that I won’t have time to complete a second load, meaning it would stay in the washer or dryer waiting for me. I prefer to finish one load in it’s entirety. Also, I use one detergent for the entire family. Although detergent can’t treat or prevent allergies, I do have one son whose skin can be sensitive, so I choose the same hypoallergenic detergent for all of us – all® free clear detergent is 100% free of perfumes and dyes of any kind. This may sound silly because laundry is laundry, right? Well, I find that if I am doing laundry in a neat and cute space, I am more likely to want to do it. At the very least, it makes a mundane task more pleasant. Organizing doesn’t have to be expensive. I used the same type of plastic baskets to organize my laundry room and I placed a metal label on each one naming the contents. You can’t tell in the picture but this laundry closet is in a dark area of the house. 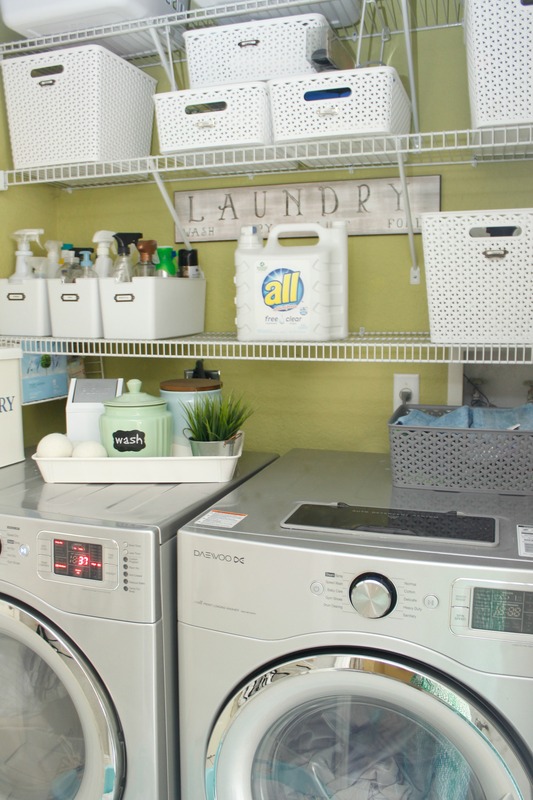 With the green walls and the bright white bins, laundry time is not dreaded. Just because the area is pretty, doesn’t mean that usefulness goes out the window. 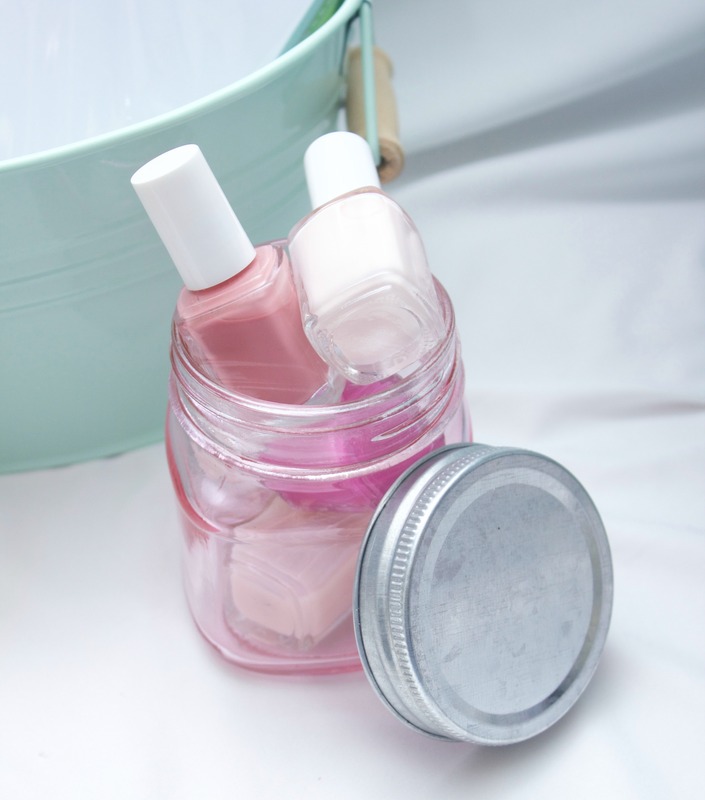 If you have a bunch of little items for stain removal, consider placing them all inside a canister so that the laundry room remains organized. Also, one of my favorite tips is to add a little trash can for disposing of lint. I wish I had a large laundry room but instead I have a closet. I have used all the vertical space on the side walls to add function and to decorate my space. Here is a book about housekeeping tips, including laundry tips. You will also notice a pair of scissors and a little bucket (from the dollar section) with clothespins. The other metal piece is part of a clothesline that I sometimes use inside the closet. I mean it when I say that I use every inch! I would not wash a white shirt with a red pair of pants. However, if an item has been washed many times and does not bleed, colors can easily be included in the same load as lighter colors – maybe not white, but you get the idea. The only item that I like to wash completely on their own are towels. Because of their texture I notice that they can make clothing pill faster. Also, if you have the space, consider placing 2 hampers in each bedroom so that everyone can already keep their clothing sorted, which makes washing easier. 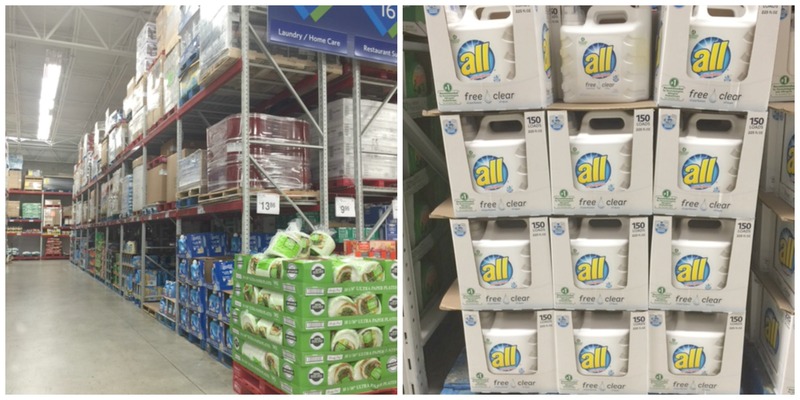 I purchased this large container of all® free clear detergent at Sam’s Club because it is such a good value! However, I will probably transfer the detergent to a smaller container for ease of use. This will last us over a month! Of course if you use it this way, it is also convenient. I do follow the directions for use on the packaging as to not over use the product by putting too much product in one load. A little tip – this detergent also comes in the form of all® free clear Mighty Pacs®. If you follow my Instagram, you know that a couple of weeks ago we stayed in a cabin in NC. They had a washer and dryer in the cabin and I took a few of the pacs with me. I was able to do laundry everyday and basically came back home with a suitcase full of clean clothes. Pretty. Awesome. 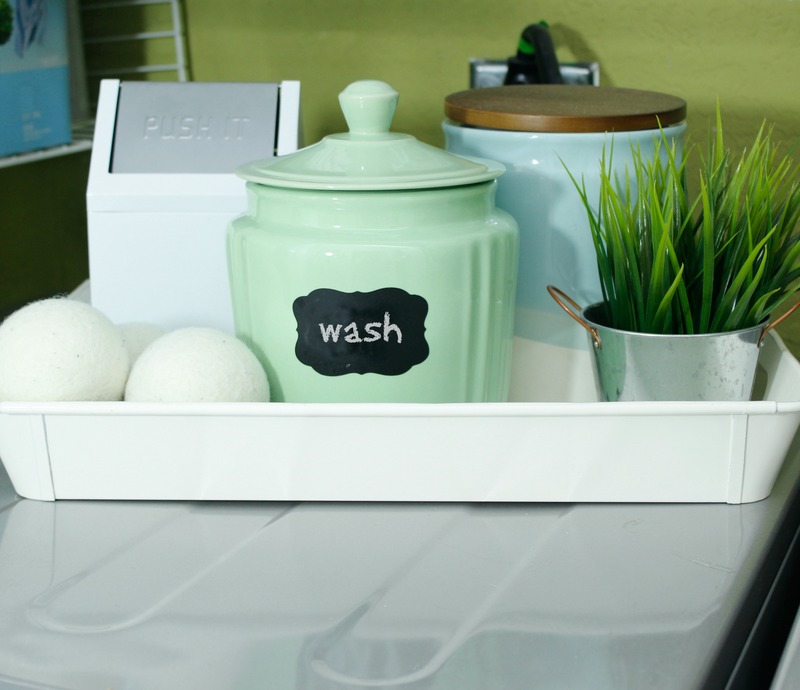 Although your laundry room’s primary role is to clean items, it can get pretty dirty. 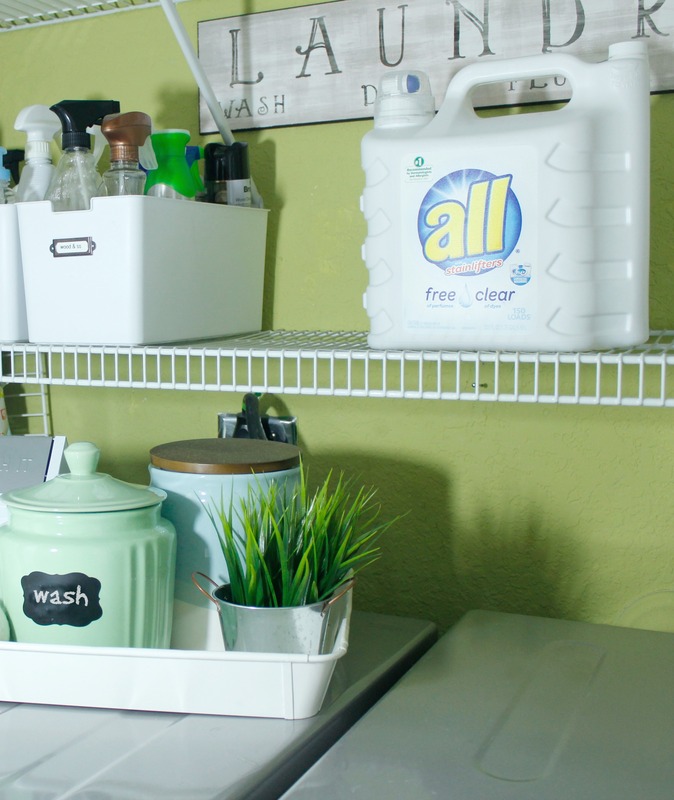 Extend the spring cleaning into the laundry area. 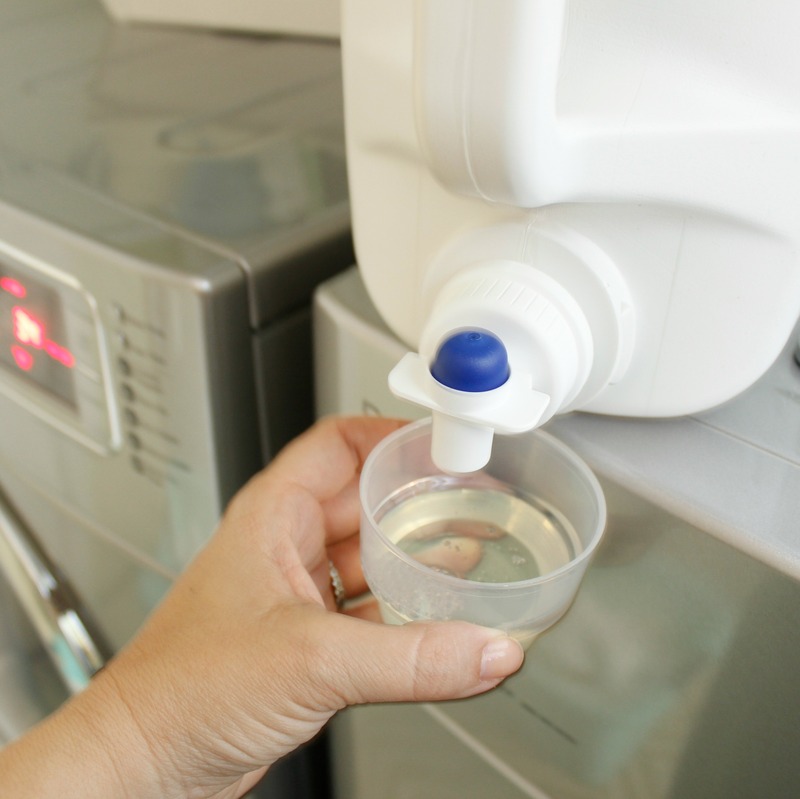 Detergent bottles get full of residue, as do the trays that hold them. Canisters gather dust. The washer and dryer also get dirty. 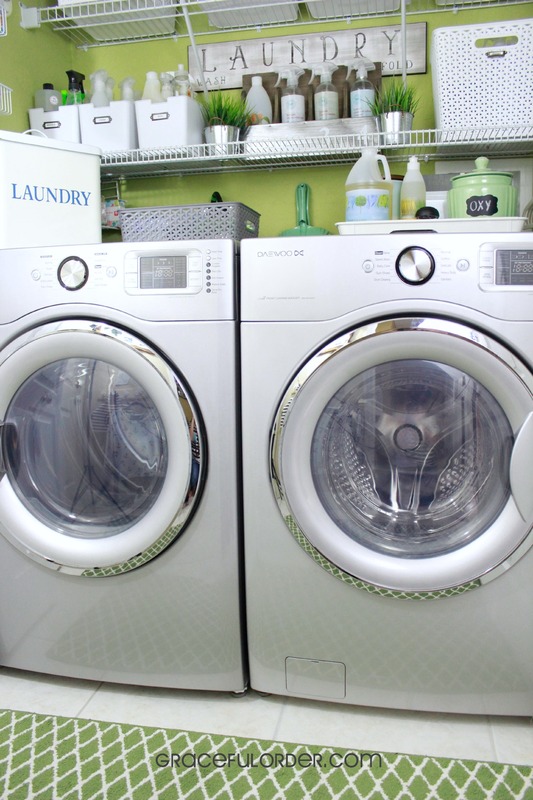 It is important to keep the washer clean so that it keeps doing a good job keeping the family’s gear in top shape. There are lots of other tips that I can share with you (and I will very soon) but these are the top 5. We all have to do laundry and the task is never 100% complete (well, maybe for 10 minutes or so) – why not make a space that gets so much use both pretty and functional? Do you have any laundry tips that you can share with me? Are you a “laundry day” kind of person or “a-load-a-day” like me? 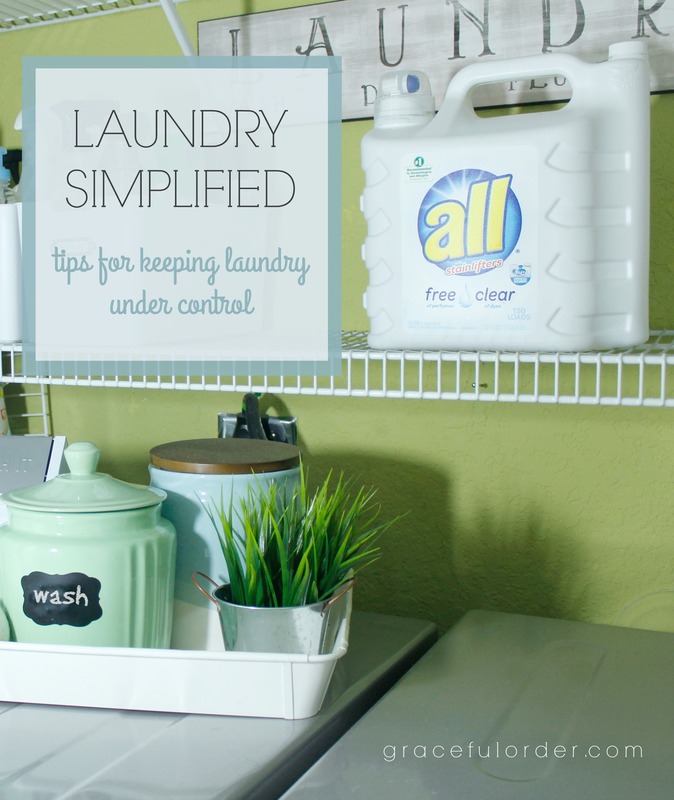 For more ideas and laundry tips, you can visit the laundry hub here. You know those days that you wake up so wired and alert that the last thing on your mind is coffee? The first thing I did when we moved into this house (12+ years ago) was put together the coffee cabinet. It has changed a little, but many things have remained in the same exact spot. You know a system works for your family when it remains fairly well maintained. I am not including kid rooms in that statement. For as much as I like entertaining and cooking, I consider my kitchen to be on the small side. It doesn’t appear that way at first glance but when you consider that a lot of the cabinetry is for pantry items, not much is left for all my other kitchen needs. 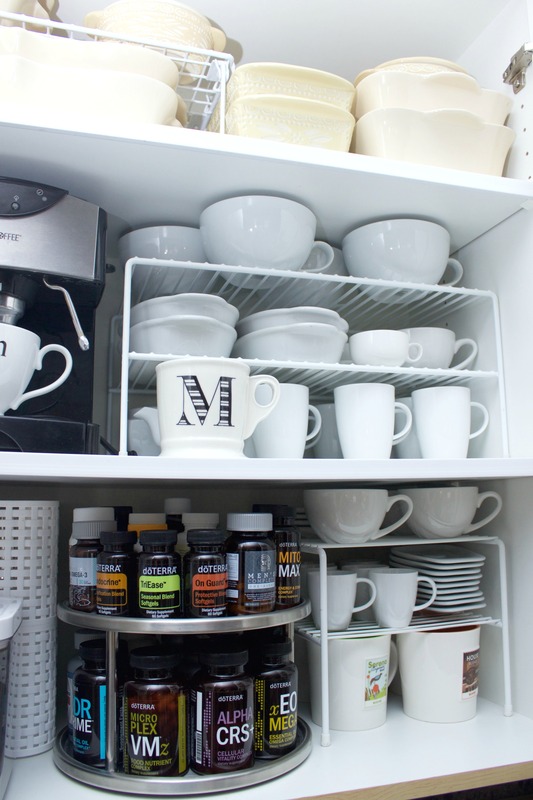 I really have tried to use every inch of that kitchen (without it looking too busy) in order to house my many cups, mugs and dishes. 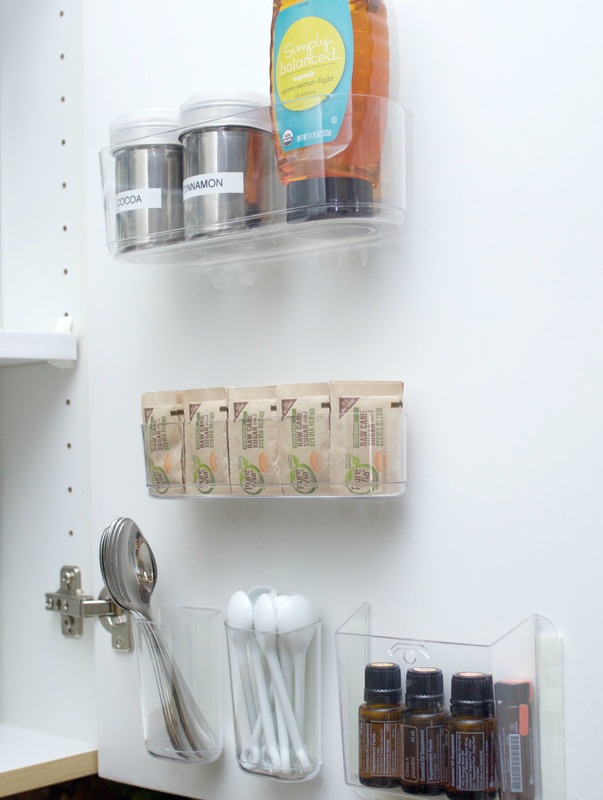 One of the ideas that I love is using the cabinet doors as a place to store small items. I purchased this large adhesive bin to hold larger items like agave or honey and also these two stainless steel shakers that I use for cinnamon and cocoa. I chose those specific shakers because they come with a plastic lid to cover the sifter top. In the middle is a smaller bin that holds sugar packets. Below that are a few smaller ones that hold the spoons that stir our coffee in the morning. the cappuccino spoons and a few essential oils. 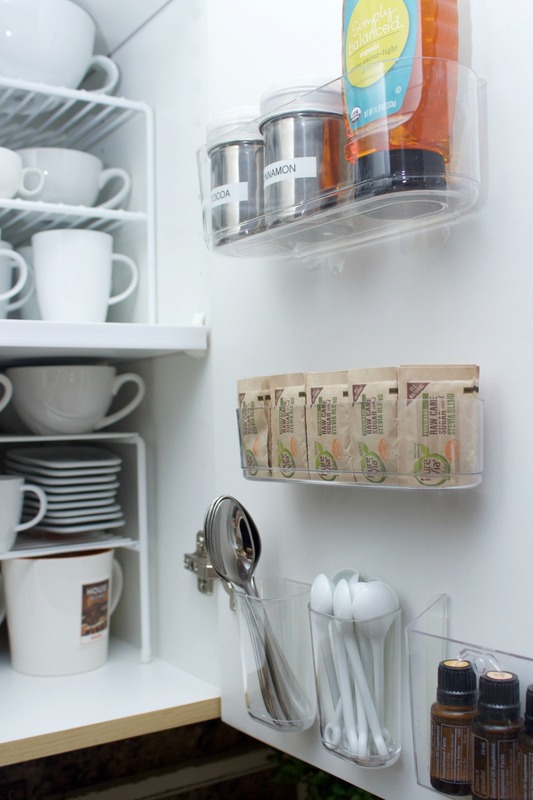 Many people may not need spoons in their coffee station because they may have a utensil drawer nearby. In our case, our utensil drawer is across the kitchen. I purchased a set of spoons at Homegoods and dedicated them to this spot. No more walking across the kitchen in the morning just to get a spoon. Maybe this isn’t a big deal but considering that we are half asleep when preparing our coffee, I’ll take the convenience. On the other side of the cabinet I place my cappuccino maker which I don’t use as often as my coffee maker – that one stays on the counter at all times. 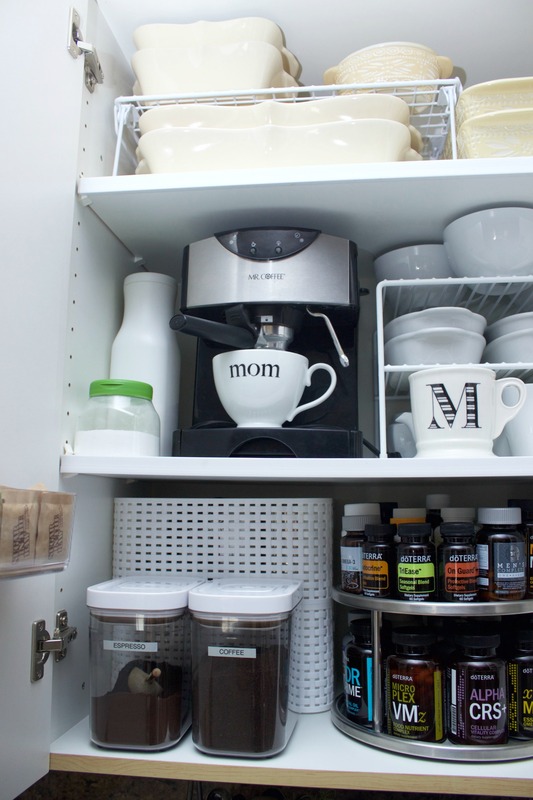 Next to it is powdered creamer which I rarely use but I like to have it on hand, just in case my guests request it. You may notice that I removed the wrapper and it looks like a plain white container. 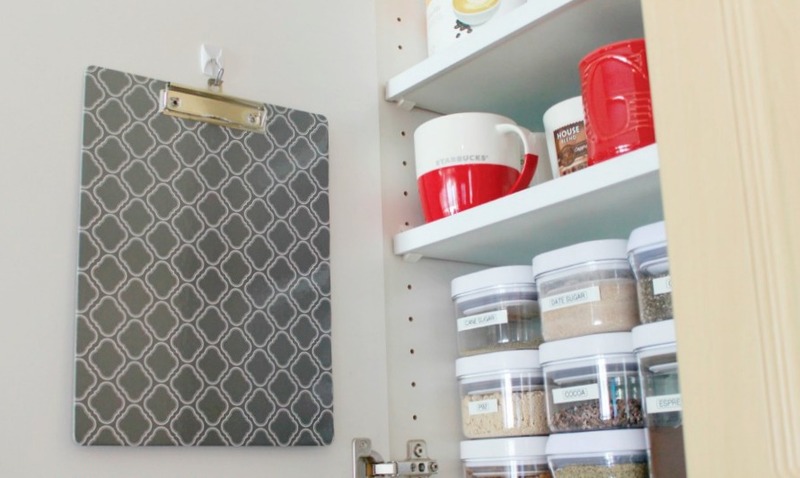 This little step may seem silly but keeping your cabinet as monochromatic as possible, makes it look less busy. That big label was red and yellow and now it’s just white and disappears into the cabinet. In front of it you may recognize that plastic container. It was a sweetener and I removed the label on that as well. I used white plastic shelves throughout the cabinet which allowed me to double up on storage for my plates and various cups. 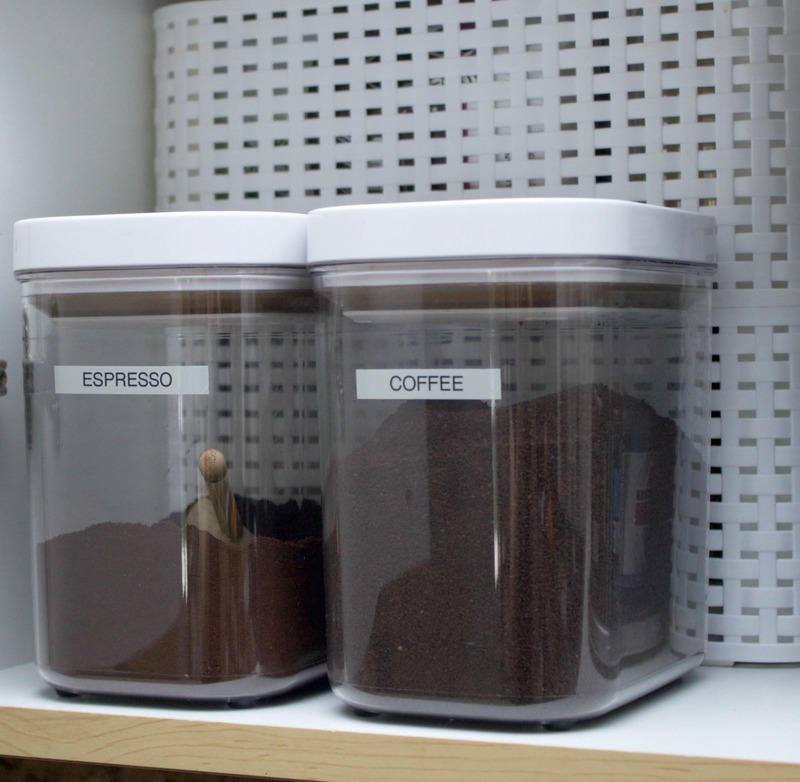 Then I have my two coffee containers that are really easy to access and to open and close. 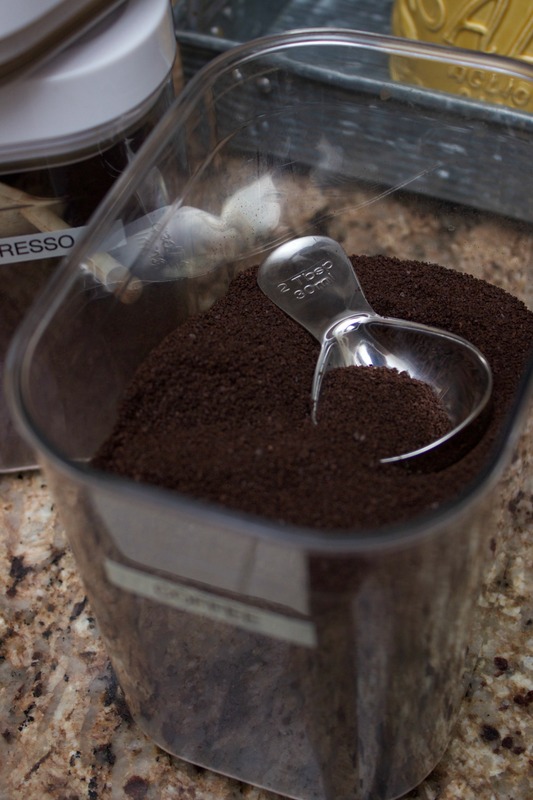 I keep a coffee measuring spoon inside each container. Behind the coffee you will see two woven plastic bins. There I keep extra coffee and frothing pitchers. These items are all concealed inside those 2 stackable bins that I found at Target. On the other side of the cabinet I have another adhesive bin for more sugars. You should make sure that these bins will have enough clearance when the cabinet closes. In this case, if they were any lower they would crash against the coffee containers. I measured mine to fit above the canisters when the cabinet closes. Right in the middle are my vitamins. I chose this stainless double tier turntable to hold all of our bottles. Be sure to measure your cabinet to make sure the items will have enough clearance. 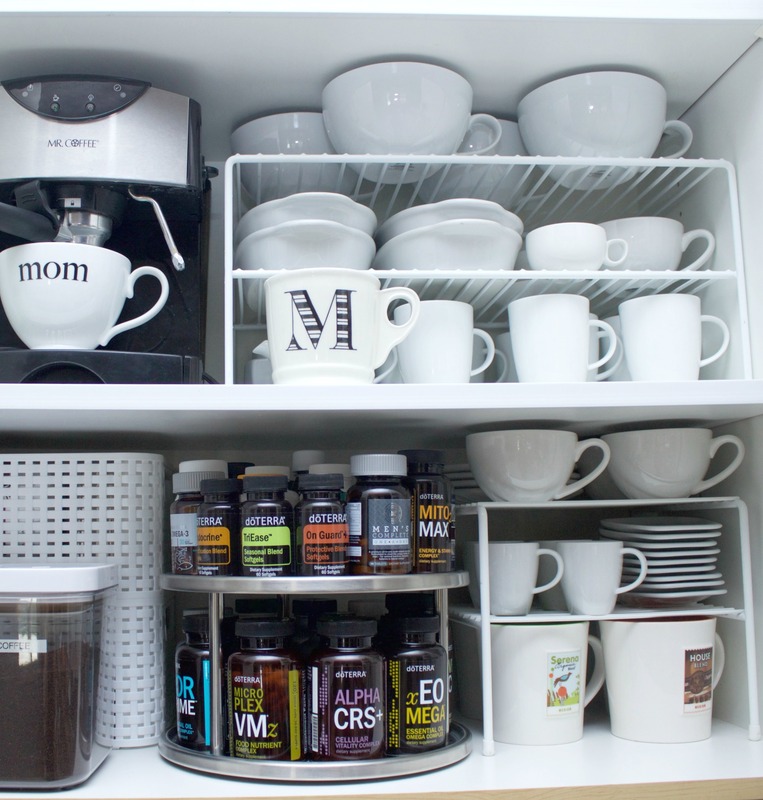 I have tried so many places to store our vitamins but if they are not in front of our face when we make our coffee, we forget them. Sometimes we still forget them. In the very top there is a casserole set that I rarely use and that is why it’s so high up. Of course there are many different kinds of coffee mugs in the cabinet but the big ones in the very bottom are the ones we use daily. We keep our coffee maker next to this cabinet (besides the knife). This system has worked so well for us. 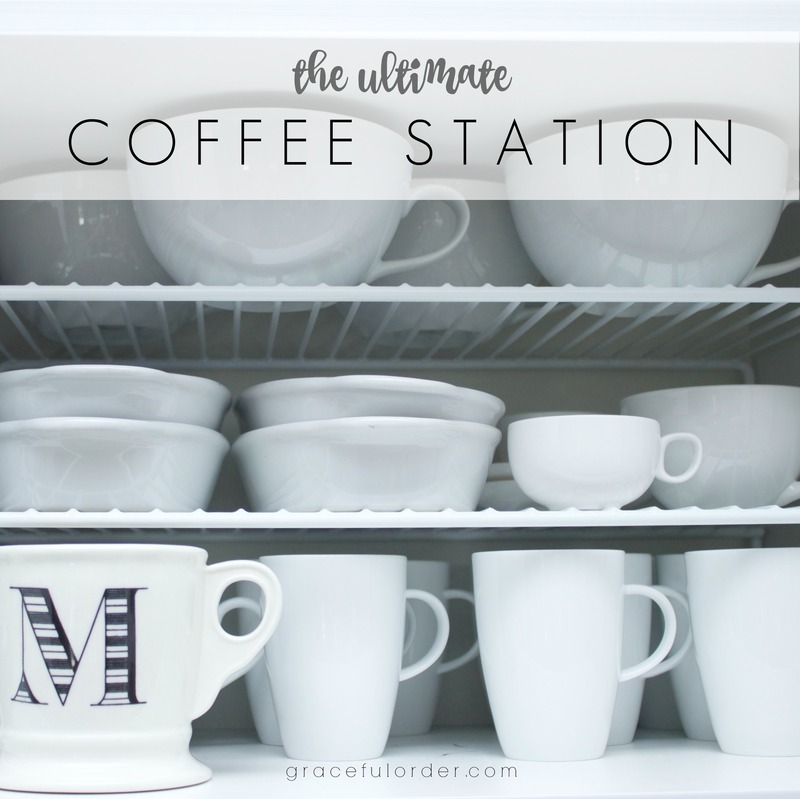 I can tell you that besides some minor touch ups, I didn’t have to do much to the coffee station to get it photo ready for this post. It pretty much stays looking like that. You can customize an are of your own and even add flavored syrups with pumps, just like the fancy baristas have. You can add your touches to make it perfect for you! So are you a coffee or tea lover? How many cups a day? As much as we love coffee, we only have one. Also, do you have an area already dedicated to coffee items? I love you a latte! I have tried to link as many items in this post to their source, just in case you are interested. There are some Amazon links included which means that I get a small portion of the sale. However, you do not pay more because you purchase through the link. I wouldn’t do that to ya! Thank you for your support! You know how I have always told you that I like to buy neutral pieces that are not particular to any one holiday? That way the pieces are versatile enough to use year-round? That was true until these little bunny plates went on sale. My resolve and practical good sense went out the window. The dinner plate version was also available, but I told myself that these salad plates would take up less room to store. That was me easing my conscience. I am so glad that I picked them up! I purchased 9 of them, as I usually buy an extra plate just in case somebunny breaks one. 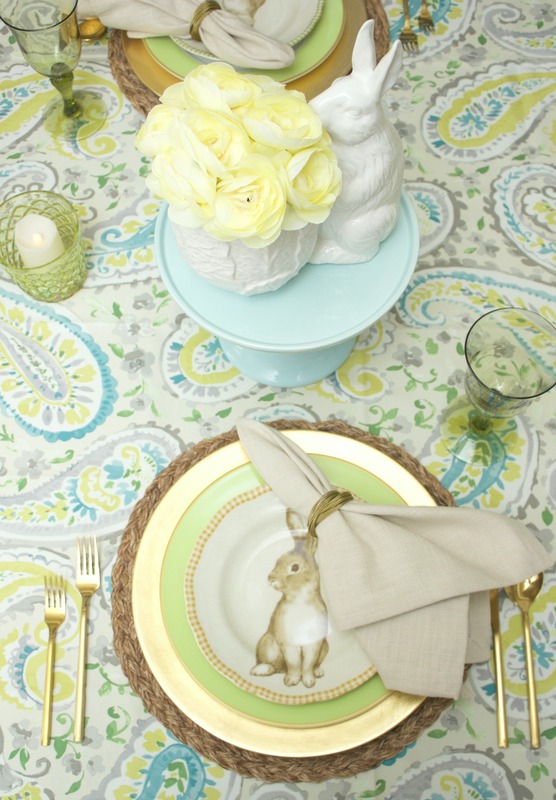 I found the plates and the tablecloth at Homegoods. The tablecloth could use a few more inches all the way around and I am thinking about adding a green border all around the tablecloth, so that it feels more sizable. Tablecloths and comforters should be made a little larger than they currently are. Don’t you agree? I have had my eye on these gold utensils for over a year! Finally they went on sale last year (after Christmas) and I purchased 2 sets. I was also considering this one from Amazon but decided on these from CB2. I love them and the only critique that I have is the size of the little fork – it is unusually small. Maybe it would be perfect as an appetizer fork, but kind of small for salad. There was a lot of color already on the table, especially with the busy pattern of the tablecloth, so these linen napkins were my go-to. 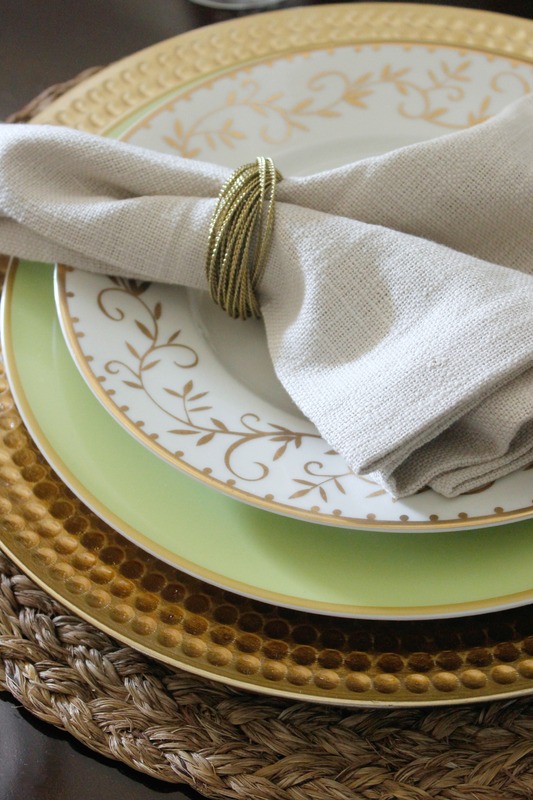 I paired them with a simple gold napkin ring that matched the chargers and the utensils. You all know how I love fresh flowers but I had this little yellow arrangement by my bed and it fit perfectly inside Mr. Bunny. To make this more substantial, I sat him on a pretty blue cake pedestal. 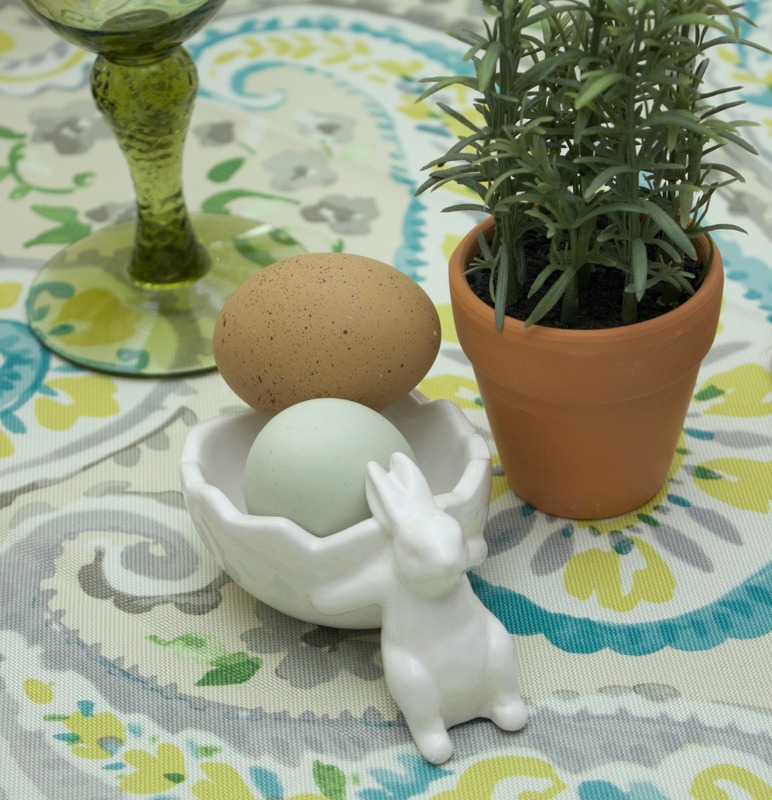 I had these faux eggs in my kitchen. Don’t they look real? 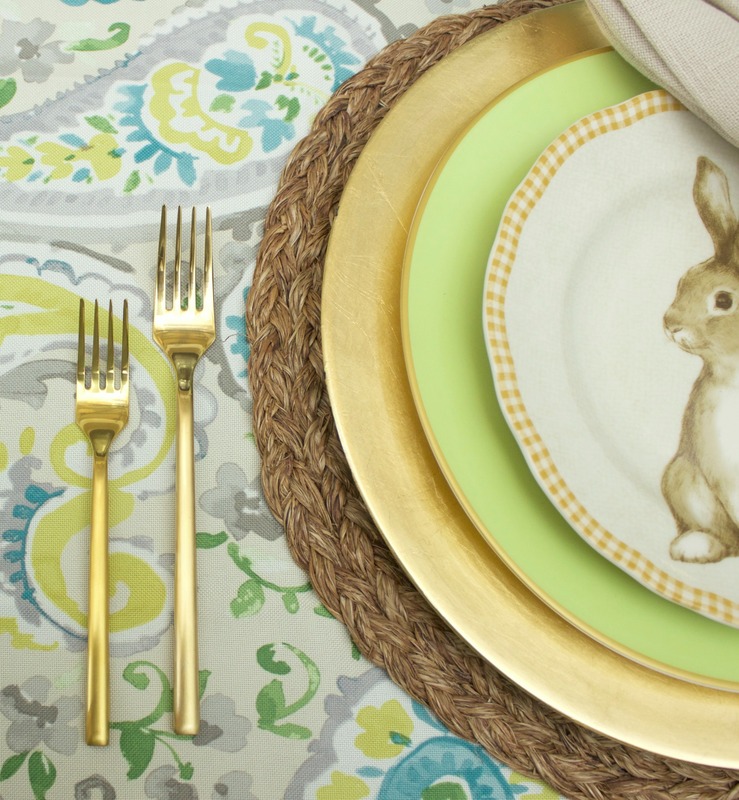 I placed them on these tiny bunny plates. I also thought of filling them with jelly beans. Flanking the yellow flowers are these two potted plants (not real). I like how the pots even have some weathering, which make them more believable. From far away all the greenery and flowers look real. 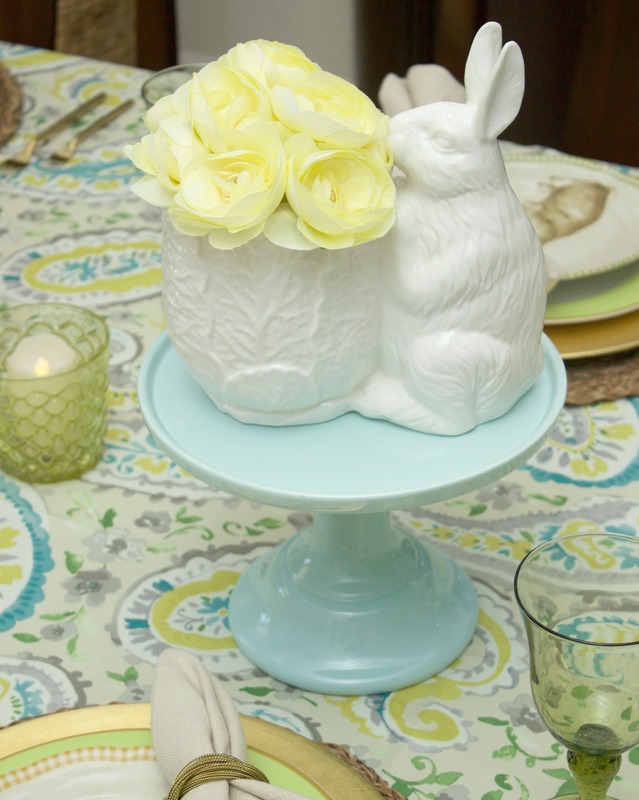 Will you be hosting Easter at your home this year? Is it a holiday that you decorate for? All I do is set the table but not too much more decorating. I would love to hear about your traditions on this special day. This post includes one affiliate link from Amazon. Purchasing through this affiliate link does not affect what you pay for the item. Thank you for supporting Graceful Order! Hello Sweet Friends! Besides the Tastemaker Awards post from yesterday, I have been a little MIA these past few weeks because everyone in my home came down with the flu…one-by-one. We are all better now and I can’t wait to share with you some of the things that I have been working on. To make it up to you I am sharing with you some real eye candy. Move over George Clooney and enter beige tufted chesterfield style sofa! So what’s with the sofa? 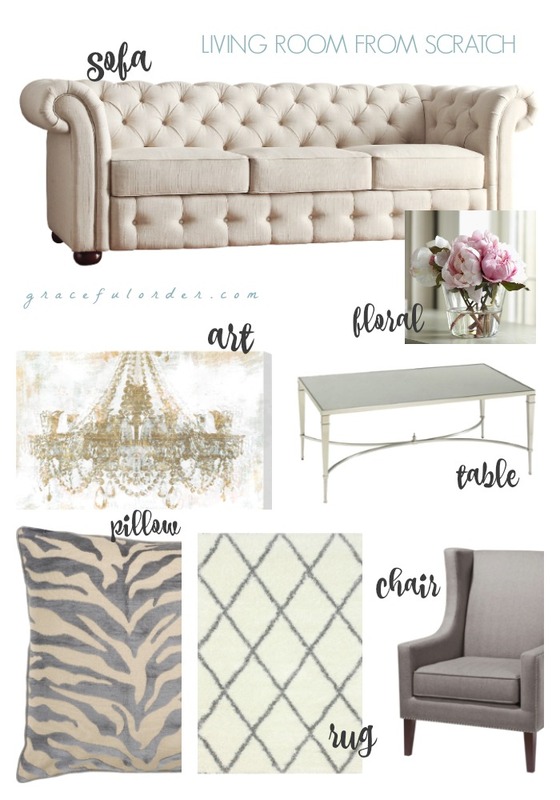 Well recently Wayfair reached out to me and asked if I would style a room from scratch and what pieces would I use. I welcomed the challenge and below are my pics of the picks :-). But before we dive in, I wanted to share with you the reason and perspective behind the pieces that I chose. My favorite rooms are those that curate over time. Those rooms have the most character, depth, interest and even practicality. So when I chose the pieces from the Wayfair site, I didn’t want them to match perfectly – on the contrary. Also, keep in mind that I am styling this room as a space that isn’t necessarily the one that gets the most use. I say that because the couch is…well…probably not one that is the best choice for the kiddies. My home has a family room that houses practical leather couches and a really small formal living room – that’s the one I thought of as inspiration when curating this space. So like I said, the gorgeous couch above is already a linen color, and in my home I have 2 chairs facing the couch. In this case, I would pair the couch with 2 of the chairs below (that are also available in linen) but I would choose a dark gray so they stand out a bit, but not too much. We want our couch to be the star. So how about this beauty? I kept imagining a small living room (like mine) so I didn’t want too many colors in the room. Not super match-ey but definitely not busy. The rest of the pieces as you can see are fairly neutral and the “drama” piece, besides the couch, is the art piece. It was available in multiple sizes but I would definitely go with the largest size that your wall can take. One or two statement pieces in a room create the “designer” feel that we are after. Everything else was the supporting cast. If you are interested in “shopping the look” and getting more specifics on each item, you can click on the pictures below and you will be taken straight to items. One of the things that I love about Wayfair is that you will immediately see a ton of options that fit within the same style of the item that you clicked on. 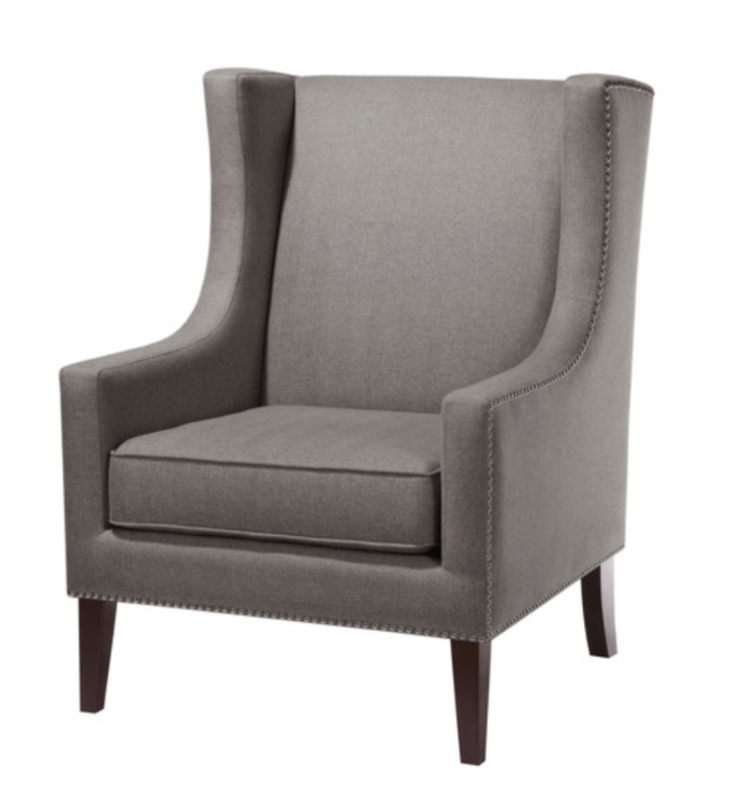 I love the low back, the rounded corners and the beautiful tufting throughout. I recommend pairing this couch with simple side chairs so that it can remain center stage. I love how understated this chair is! It can complement almost any couch without competing with it. 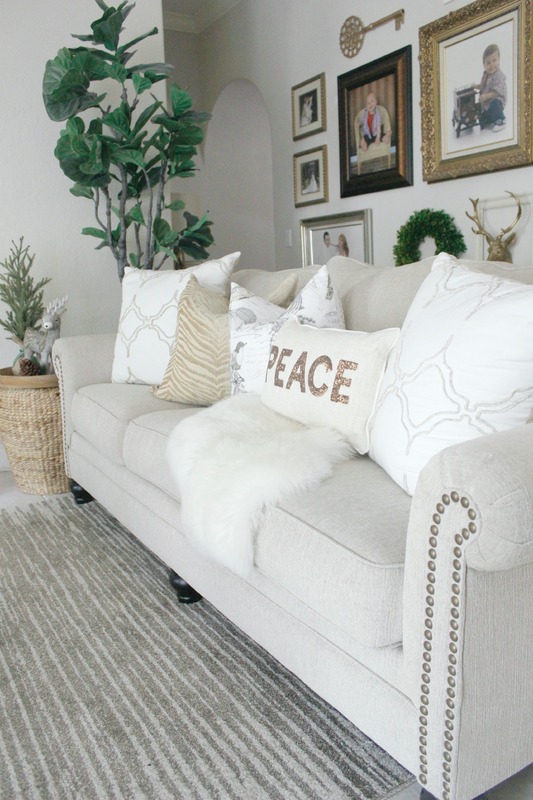 Adding a few gray and beige pillows to the couch will really bring together the two neutral colors that we are incorporating in our room design. 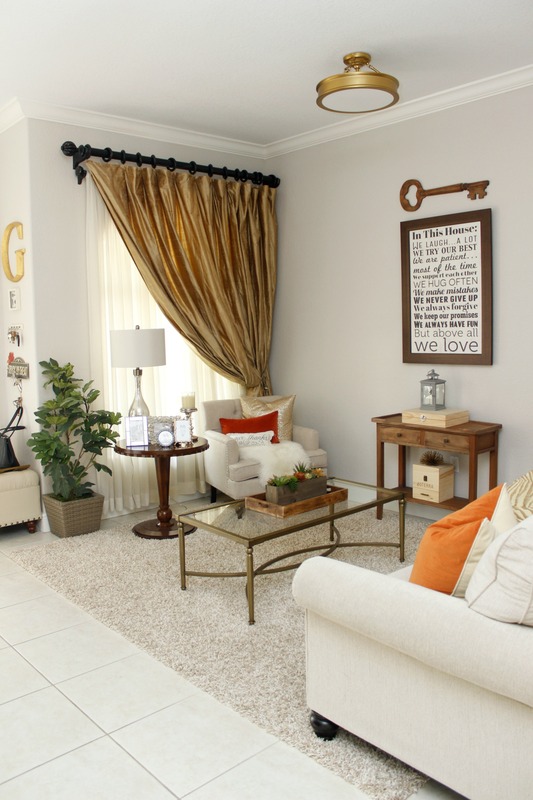 It’s no secret that nothing anchors a room like a good rug. I love a good shag rug and this one incorporates both off-white and gray. The diamond design and neutral background makes the rug interesting without being busy. This mirrored top table has a beautiful satin nickel sweeping base and it’s the perfect addition to this room. 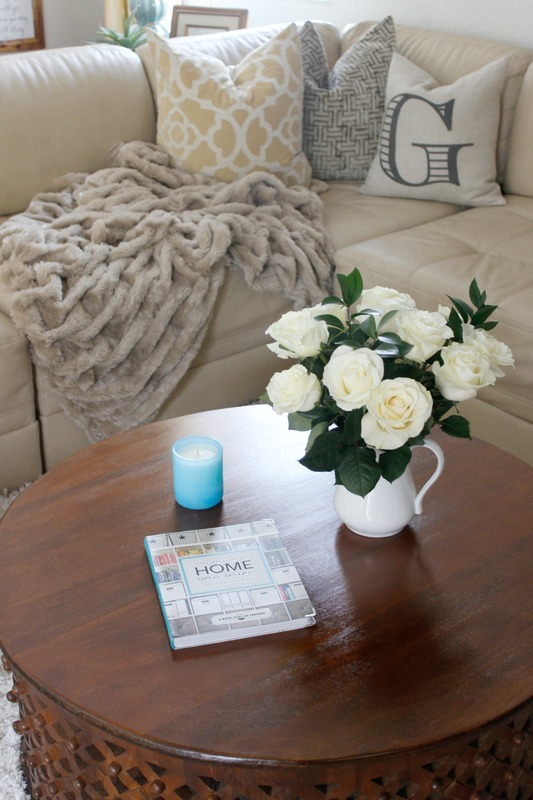 I love how versatile this coffee table is – all that’s missing is a beautiful faux arrangement of peonies, a stack of books and pretty candle. A blank wall is an opportunity for a dramatic piece like this beautiful canvas of a gold chandelier! There are so many sizes available, but I would definitely go over-sized for this piece. It is absolutely gorgeous! 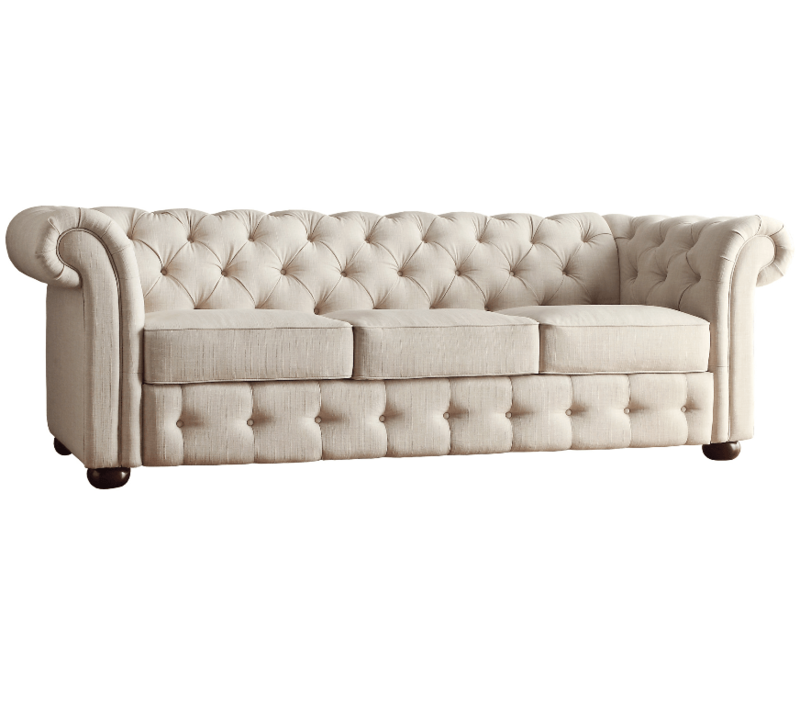 As you know, my living room sofa is a really light color like this one. Admittedly, we usually hang out in the family room, so it gets very little use. I’m glad I did it though. It’s the first thing that you see walking into our home and I love it! 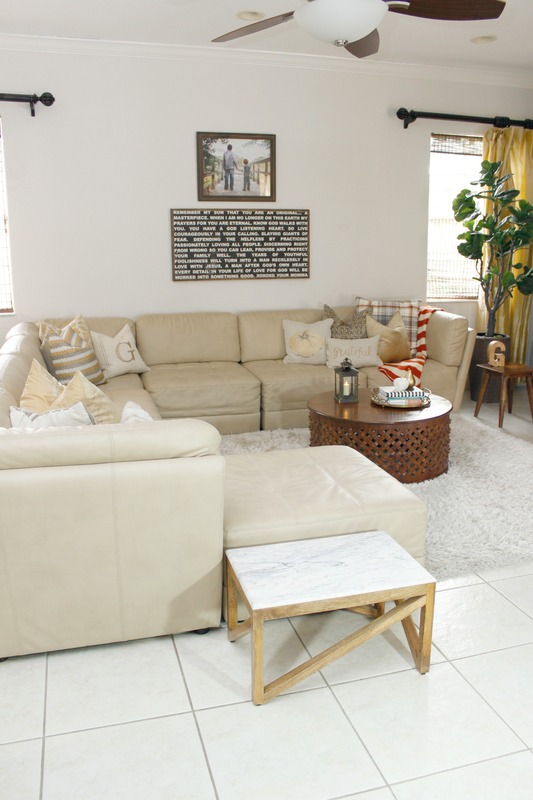 Would you ever place a linen color sofa in your home or does the light color scare you a bit? What are your favorite pieces from the ones pictured above? Let me know your thoughts on the room. 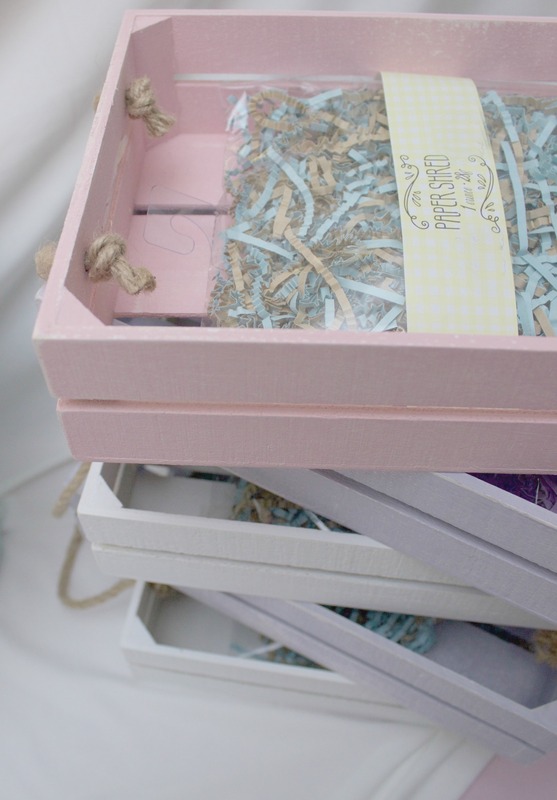 Next on the blog will be some ideas for Easter. Yup, it’s around the corner. Remember last year when I shared about going on the Sailing with the Scotts HGTV cruise? It was a blast and I hope they do it again this year. Well aside from that, I don’t attend many events that I get invited to as a blogger, because they usually require travel and time away from the boys. However, when there is a local event, I am there like a bear (not sure what that even means). 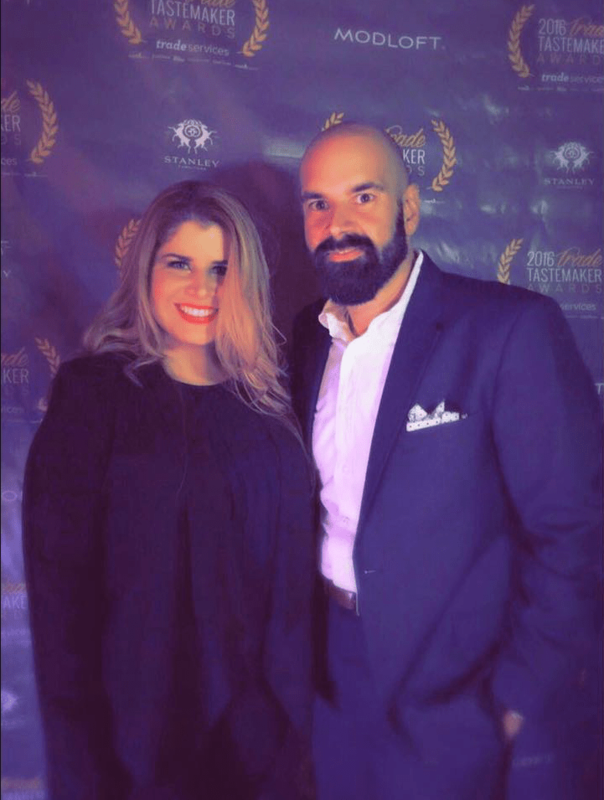 So this past weekend I attended the Wayfair Tastemaker Awards here in Miami and I had a great time! 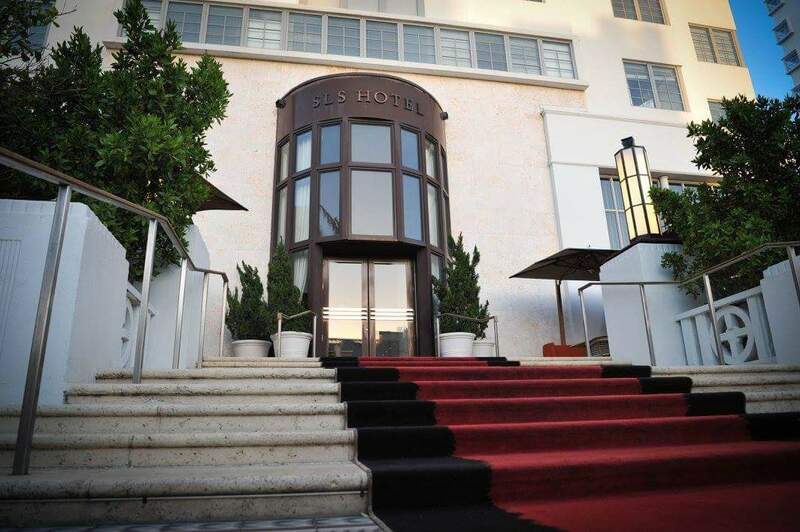 It took place in a beautiful, historic South Beach hotel called the SLS Hotel. 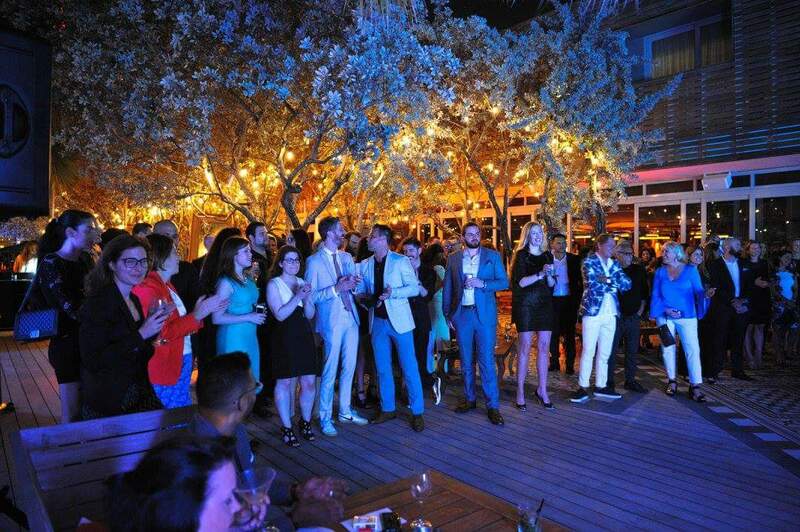 We all gathered in the outdoor terrace part of the hotel which was beautiful, as you can see. The picture does not do it justice. 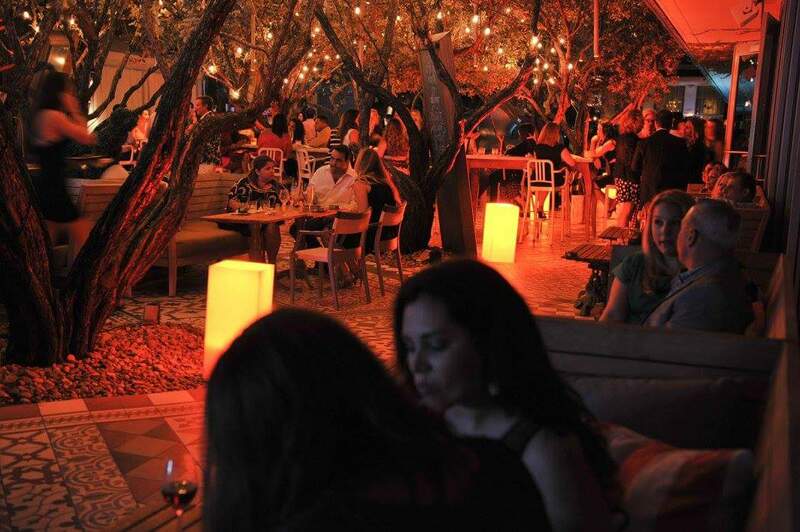 We sat around, enjoyed drinks and delicious appetizers. Seriously, the apps were so yummy that they are worth mentioning and even photographing but I forgot to. There were dates wrapped in bacon, ceviche, gazpacho (I actually don’t like gazpacho but it looked good) and other little morsels of goodness. I made a lot of new contacts for the blog. Not really. I just kept eating the appetizers. 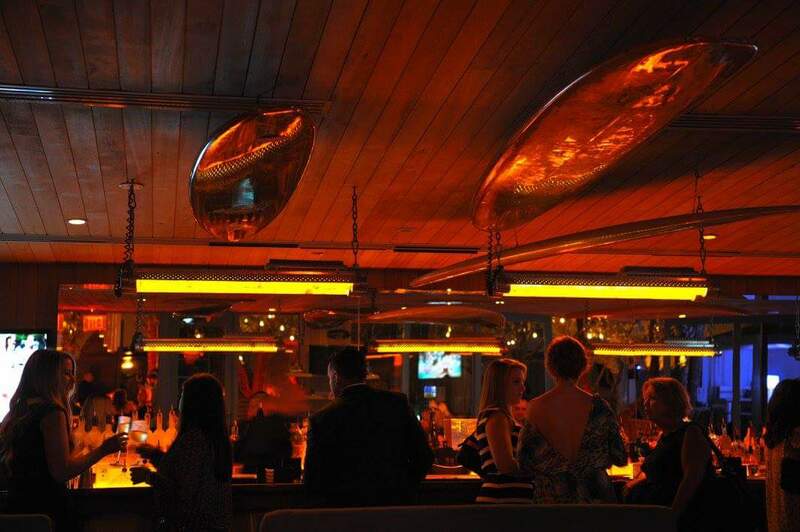 This was the cool bar area. These bartenders were like out of the Tom Cruise movie, Cocktail. They would throw the shakers and mix multiple drinks at once. Kind of impressive. Of course, they were still not as popular as the guy frying the bacon-wrapped-dates. That guy won. They (Wayfair) also had a photo booth set up and a bunch of props for the pictures. I always do really well in the first picture but then I don’t know what to do for the other 3 shots. Do I just keep smiling? I can totally make a funny face as the second shot, but I only have one funny face that I know how to make so that still leaves another 2 pictures. I inevitably come out with one of the shots talking as I ask the person next to me “what do we do now?”. Does this happen to you? You may recognize the picture below from my Instagram. 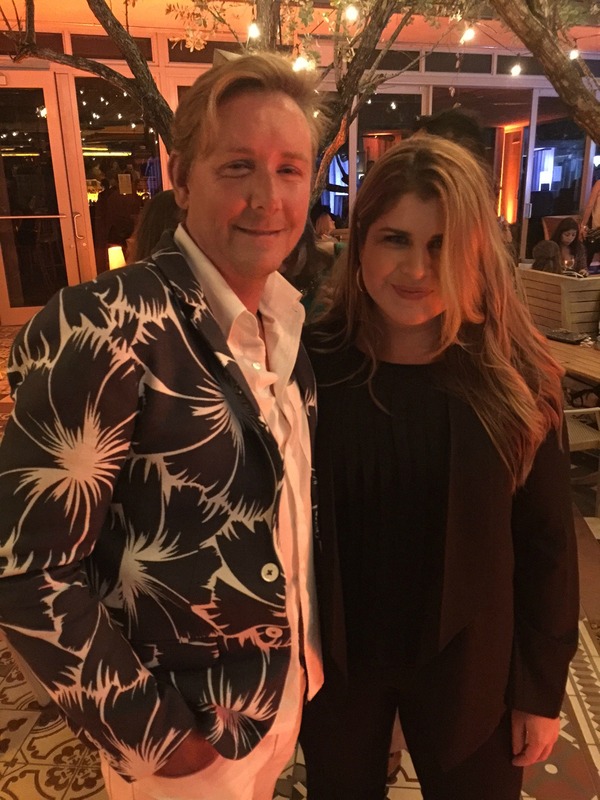 Here I am with my friend, Diriet Diaz, who is not only a great friend and a sharp dresser, but also happens to be a luxury real estate agent in the Miami area. Not the best quality photo but it was a good hair day so it made the cut! 😉 It’s always a good hair day for Diriet. 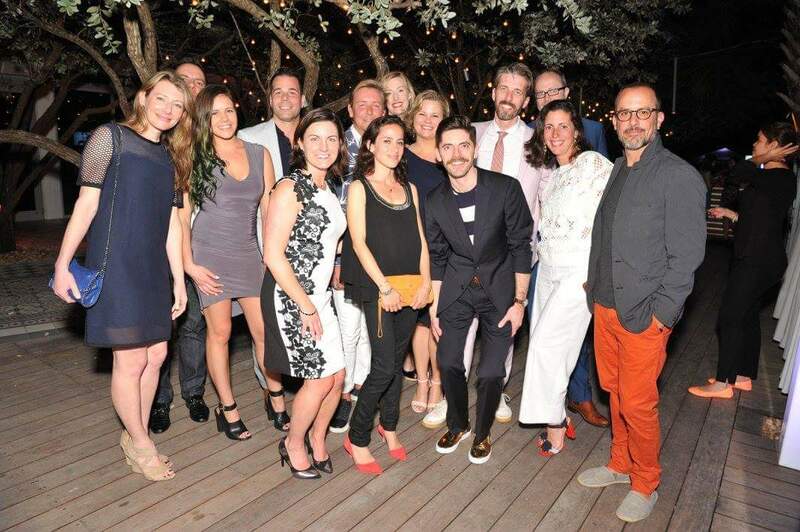 Here are some of the Wayfair peeps, the winning designers and presenters. Here I am with the super talented designer, Barclay Butera. He was so sweet and was nice enough to take this picture with me. Although his choices were limited because my friend already had the camera phone pointed and waiting. Say cheese! 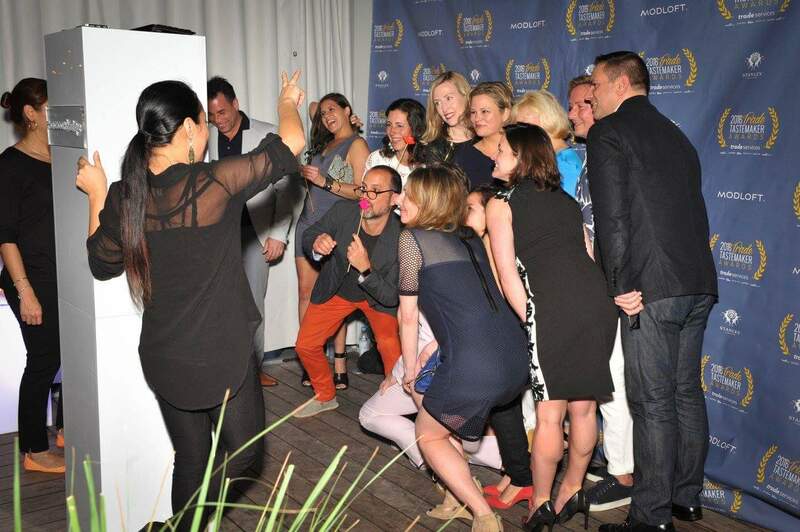 Seriously, all the designers were incredibly approachable and happy to be celebrating with all of us. The evening came to a close after finally presenting the winners. Before giving the awards we were all shown slides from the rooms that were submitted as entries. They were all so original and with such fresh perspectives. So we hung out a little longer (that’s me beside the lady in the blue blouse) and then called it a night. My boys were all home waiting for me and greeted me at the door like I had been gone for 24 hours. One of the bonuses about blogging has been being a part of these cool communities and being able to go to events that are both fun and inspiring. The other bonus was not having to make dinner because the husband was holding down the fort. So thank you Wayfair and thank you husband. And thank you pizza delivery man. And thank you bacon wrapped dates. If you follow me on Instagram then you know it’s no secret that I love tablescapes and flowers. 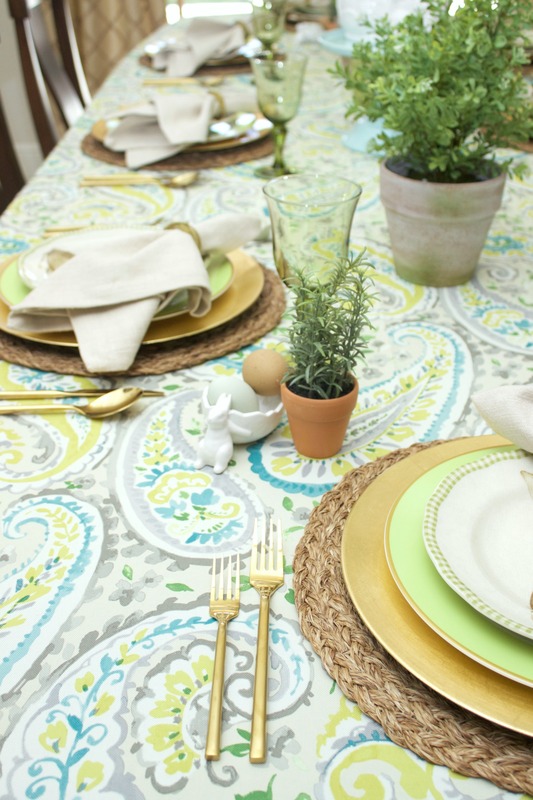 Every time that I host a get together, I think of the table setting before even planning the menu. I actually like to set my table 1 or 2 days in advance so that I can choose and move pieces around without being in a rush. 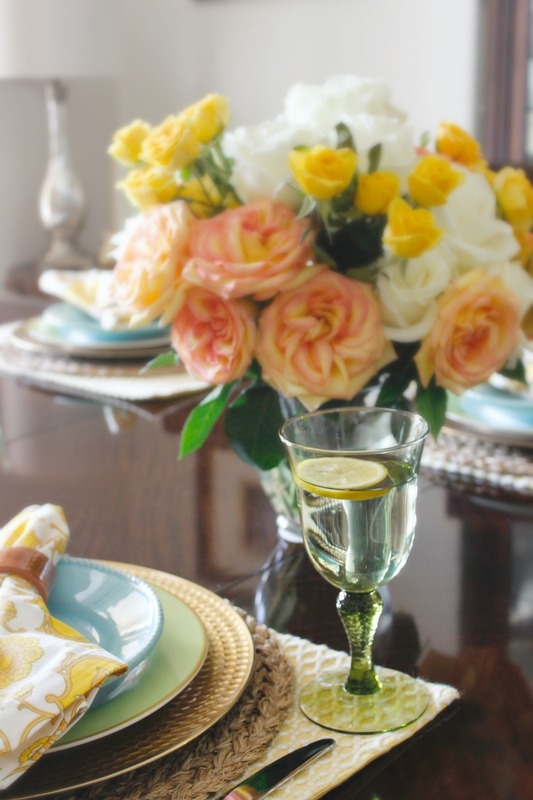 Even when I am not hosting an event, I try to set a pretty table for us to enjoy, although we rarely sit in the dining room for weekday meals – we usually sit in our kitchen table. Many times I will have a versatile faux arrangement (usually just greenery) as the centerpiece and I change around my chargers and plates to create a different look. I will leave that out for a month or so and then remove everything, throughly clean the table and start again. My favorite table settings are when the flowers go on sale at the market and I can really get creative. Whole Foods Market and Trader Joe’s tend to have reasonable prices for quality flowers. Sometimes they will have a “Value bouquet” that you can purchase 2 of and create a really full and interesting arrangement. 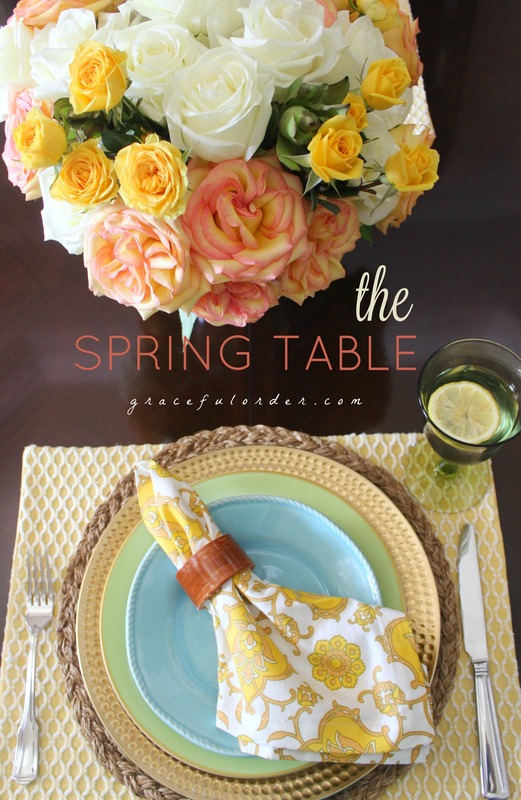 Below is the arrangement and table setting that I set up for spring – fun, bright and romantic. 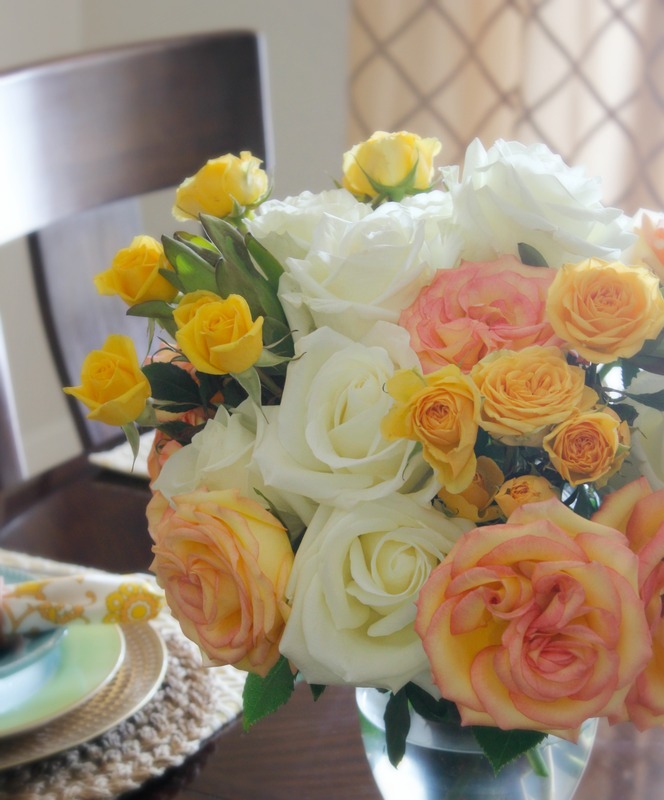 What I love about the mixed value bouquets is that they usually include at least 3 types of flowers that you can mix with some roses and create something really special at home. Something that looks like it came out of a magazine. The rest of the table was a nod to the flowers. 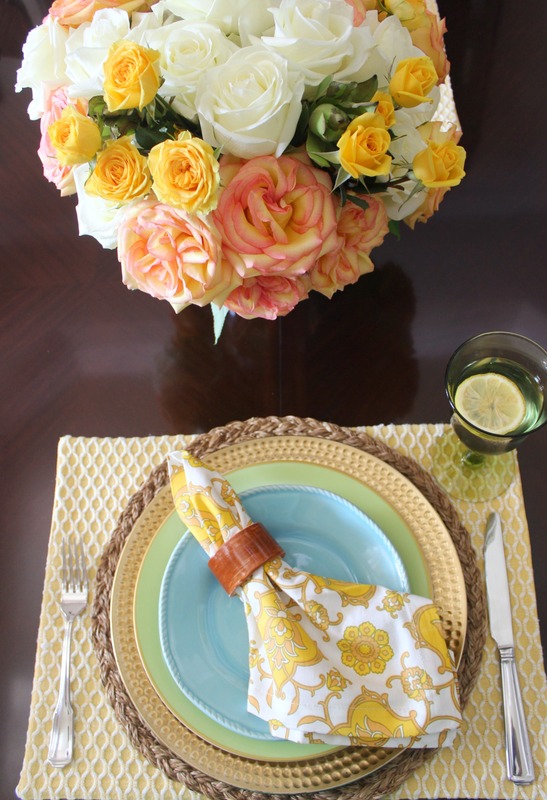 I chose the napkins and plates in Spring colors that would complement the flowers. 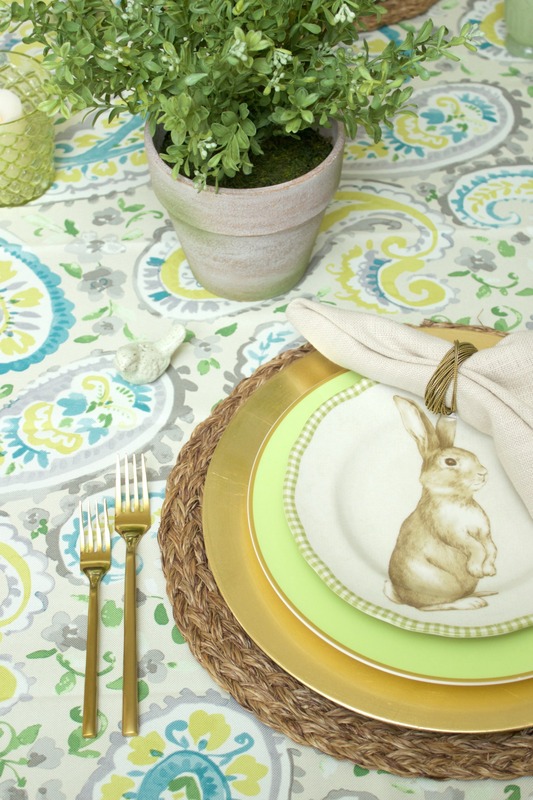 I love having an assortment of linens to choose from when it’s time for dressing the table. 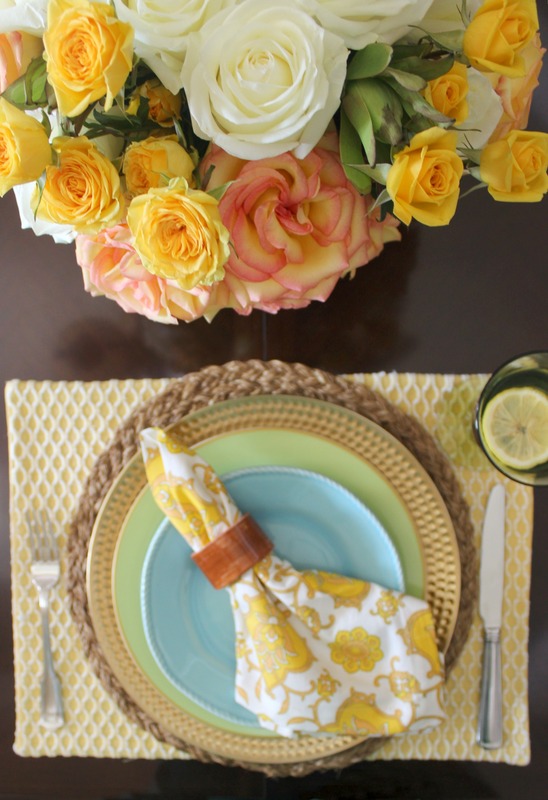 These napkins were less than 2 dollars a piece (from Sur La Table) and they really play off the yellow flowers. I added 2 egg wreaths to cage some candles since I may keep this setting throughout Easter. If I change it again, I will be sure to share it with you! 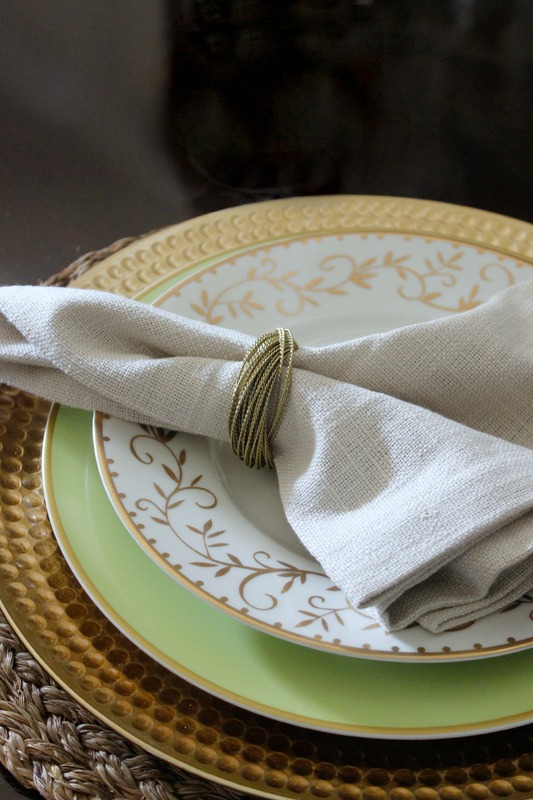 Because my table is so formal (more than I would like) I add earthy elements like the woven charger and the terra-cotta napkin ring, to make the table setting more dimensional. Also, because the rest of my home is no longer as formal, I like to add casual touches to this formal space. 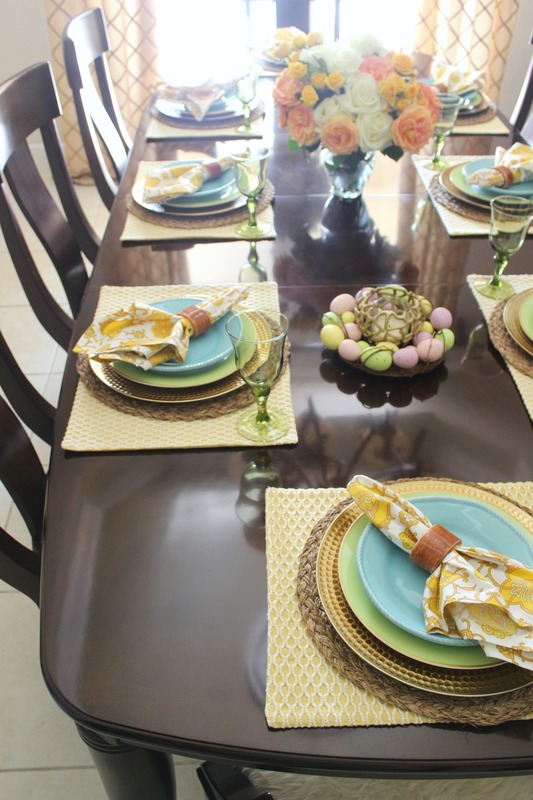 Although most of my dinnerware is white, I do have a few colorful accent pieces that I can use throughout the year. Usually it’s accent plates which take up less room to later store. These rope design blue plates were found at Homegoods. The dinner plates underneath are white with a green border and a gold rim. They are from Williams-Sonoma and I purchased them on clearance after their Easter sale last year. 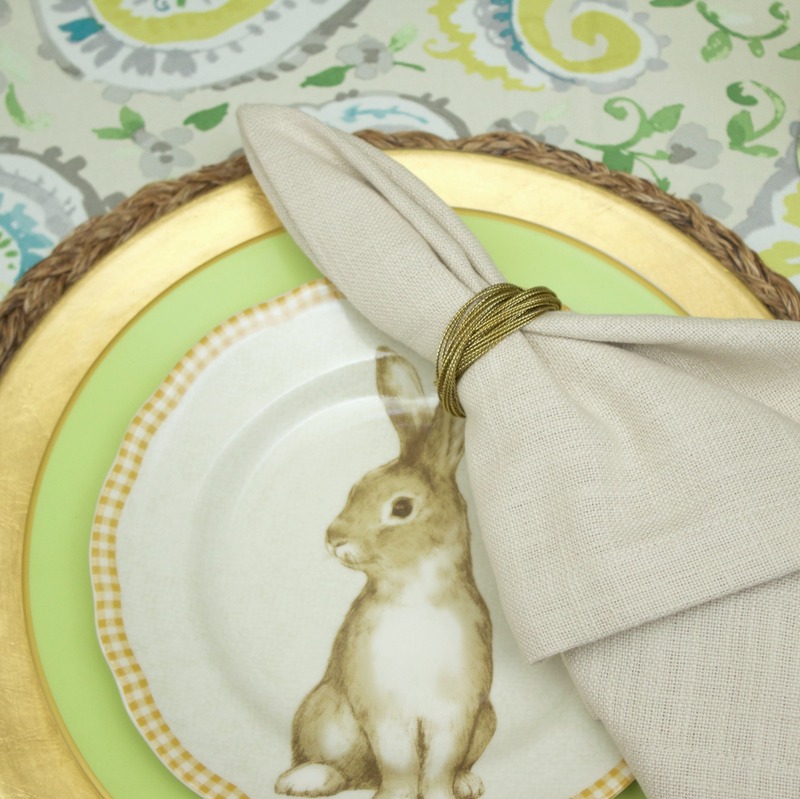 I love those clearance buys because while these plates were considered “Easter” plates to them, they are simple enough to be used in almost any tablescape – Christmas, Mother’s Day and even Thanksgiving. Don’t shy away from the “expensive” stores as they sometimes have steep sales that can help you build your entertaining inventory. 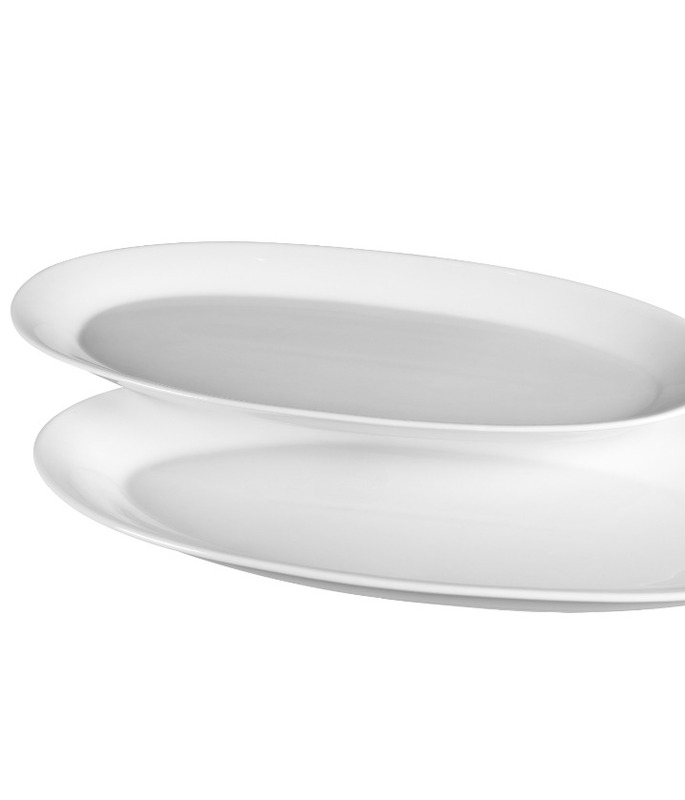 If you don’t have the space or desire to have a bunch of plates, simple white dinnerware is beautiful. Just be sure to purchase a few extra plates to account for breakage over the years. 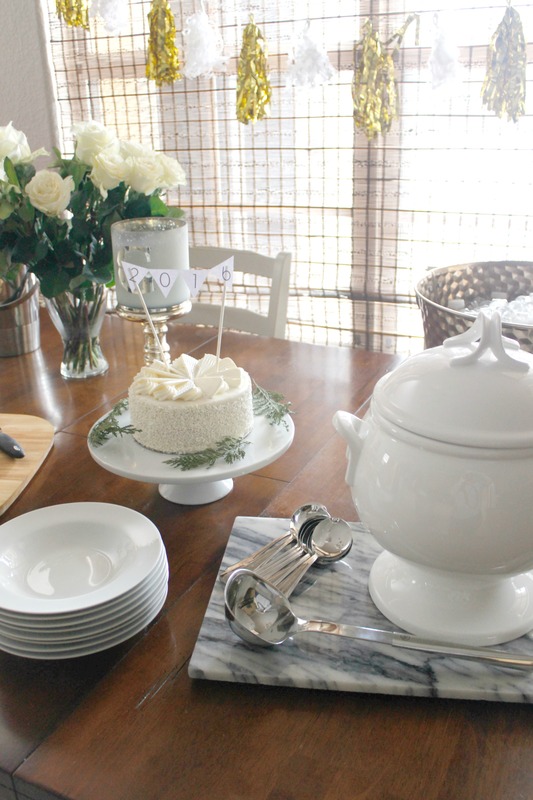 White dinnerware is classic, timeless and food looks great on a white backdrop. These green cups have been in my arsenal for over 15 years. They were on a mega-clearance and I purchased like 15 of them, thinking that a few may break over the years. All 15 are still standing – so to speak. Of course, these flowers will eventually wilt and I won’t create this sort of arrangement weekly (although I wish I could!) but then I will keep the rest of the table setting and replace the flowers with a faux arrangement or some other less-opulent flower combo. Nonetheless, I enjoy having them while they last. I love walking by the dining room everyday and having a pretty table to greet me and my family. 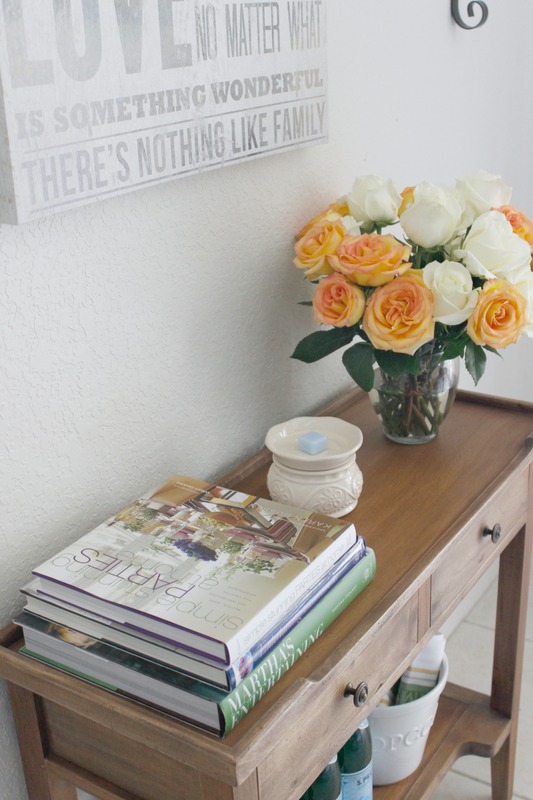 Ready for some more Spring love and ideas? 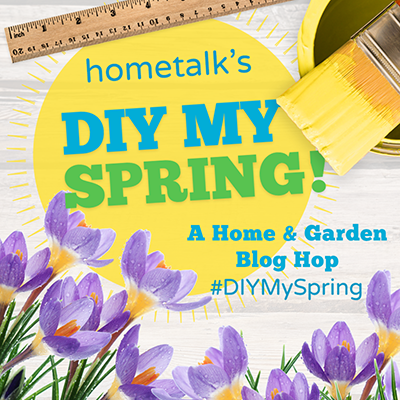 Hometalk is hosting a #DIYMySpring Blog Hop and you will love all the inspiration! It’s almost Mother’s Day…well, not exactly – but it will be here in no time. 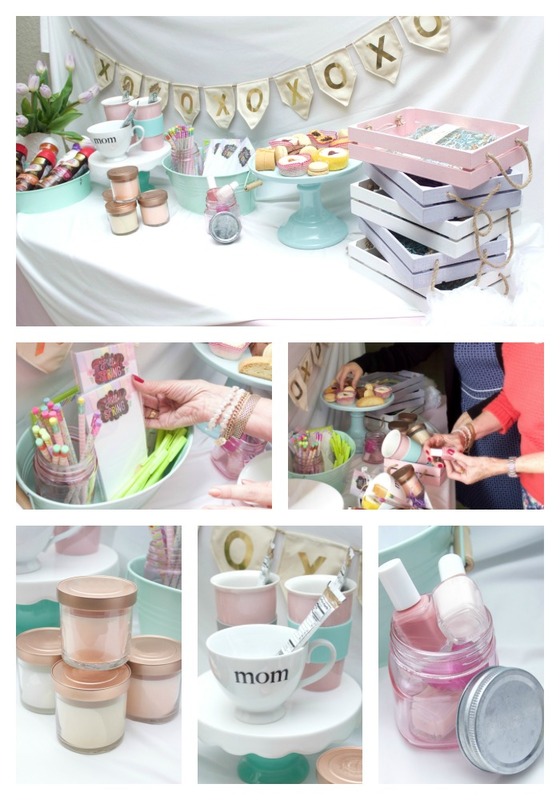 I have shared with you how we often host brunch for Mother’s Day and invite some of the moms of the family. I prefer to host an event, early in the day and that way I don’t have to spend the day visiting everyone and I also get the rest of the day to myself. 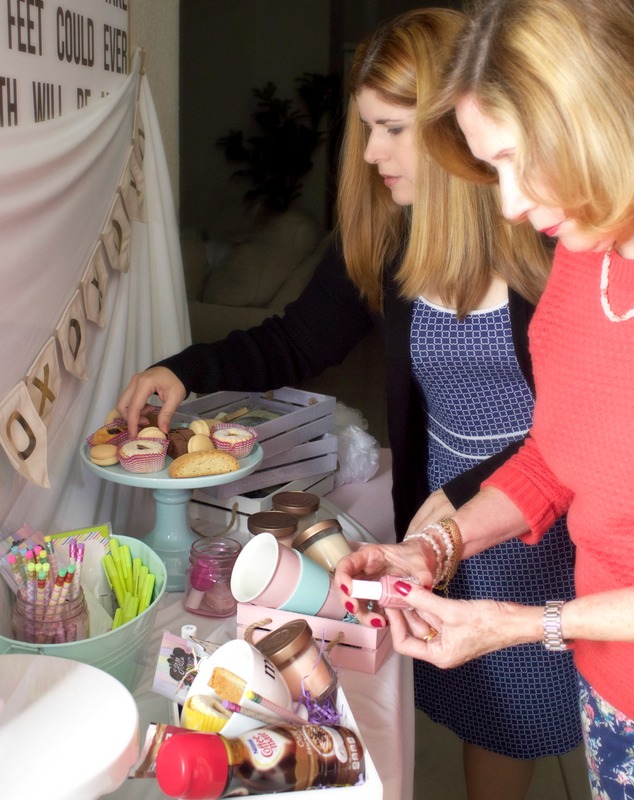 Every year I do something a little different (except for the menu, which is almost always the same thing) as far as the gifts that I give the moms. Some years I have set a pretty table and I line the table with orchids and each orchid is the gift for the moms. It’s a great idea because the orchids adorn your party and also serve as gifts. 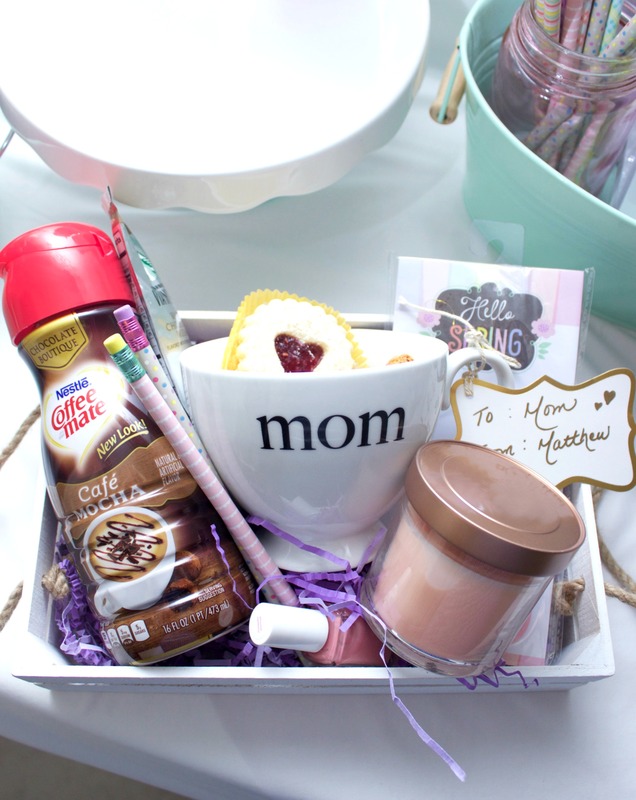 This year I wanted to do something a little different so I was going to make baskets for each mom to gift them after the brunch. Then I thought it would be fun to let everyone make their own basket. 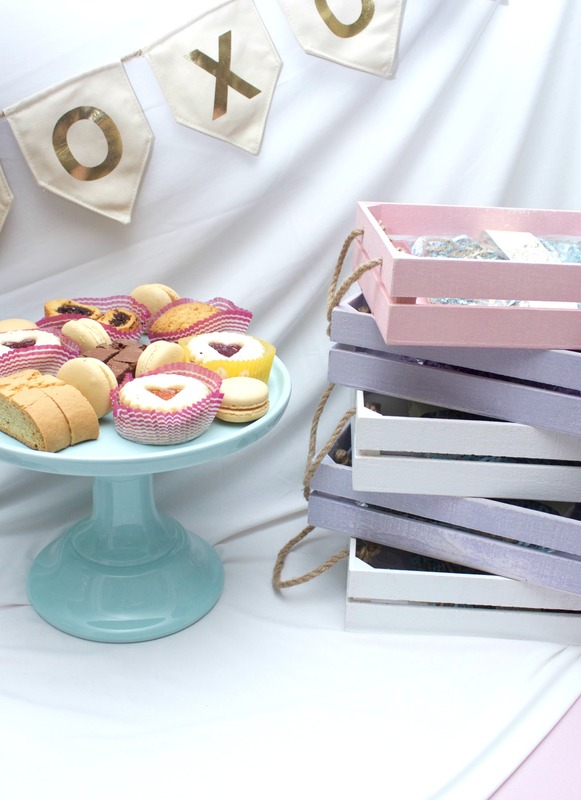 Most baskets this time of the year resemble Easter baskets but I was able to find these simple little crates that would also work for Mother’s Day. They were only $3.00 each which was great! I added a little bag of paper shreds to each crate. That way each person could line their basket before filling it up. The idea was that everyone can pick one item from all the groupings to add to their basket. 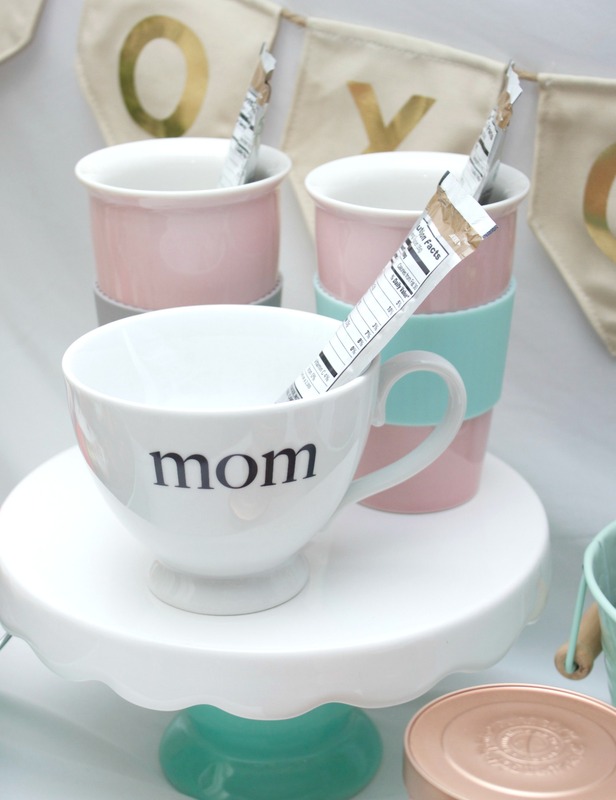 One of the items the moms could choose from were coffee mugs. I loved the “mom” one which was perfect for this event. It will probably be the first to go! Also, inside each mug is a pack of instant coffee. Naturally, to go with the coffee and the pretty mugs, some indulgent coffee creamer. 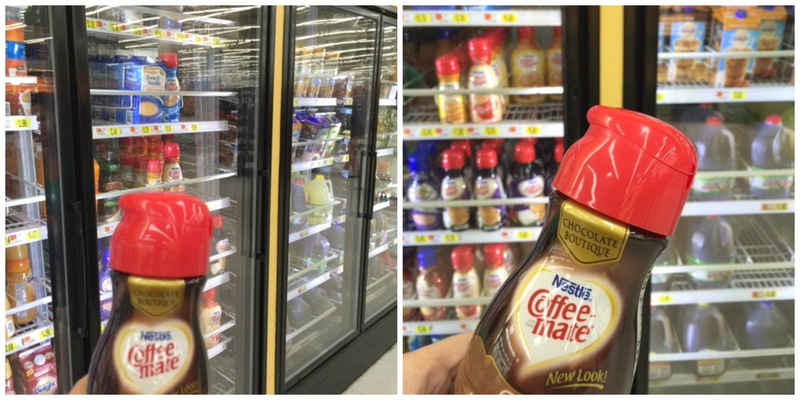 I chose a few of the NESTLÉ® COFFEE-MATE® Liquid Coffee Creamers. 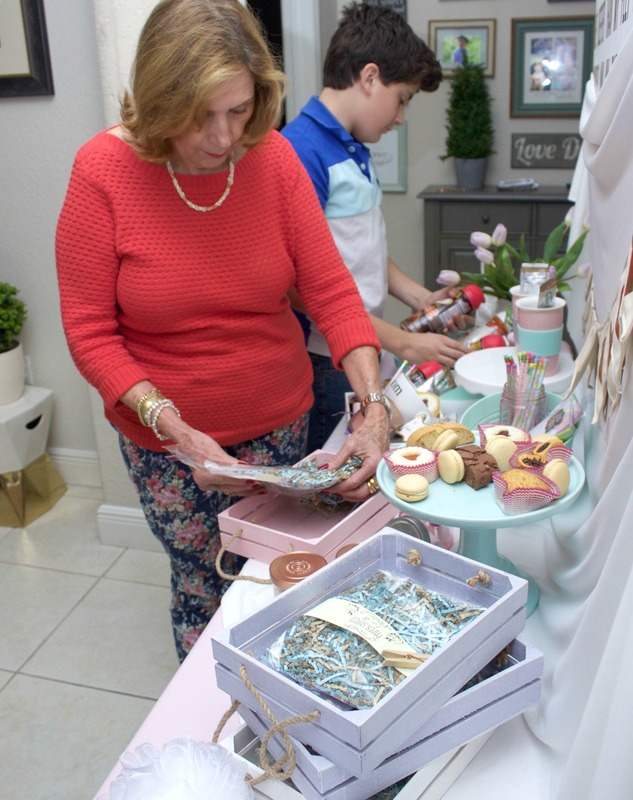 I purchased quite a few flavors but the most popular were the chocolate boutique flavors – Salted Caramel, the Chocolate Toffee Truffle and the Cafe Mocha. Of course, nothing says pampering for mom like a candle. These were so pretty in the rose gold tone which perfectly matched the tablescape. I thought it was a fun idea to add a jar full of nail polishes so that everyone could pick their own. It was the area that everyone stood the longest, picking out their shade. Stationary and pencils. Hello Spring! Here are a few pictures of everyone making their baskets or the kids making the baskets for the mom. Every time that I host something like this in my home, my favorite thing to see is all the generations coming together. Every basket looked a little different and that was the idea! 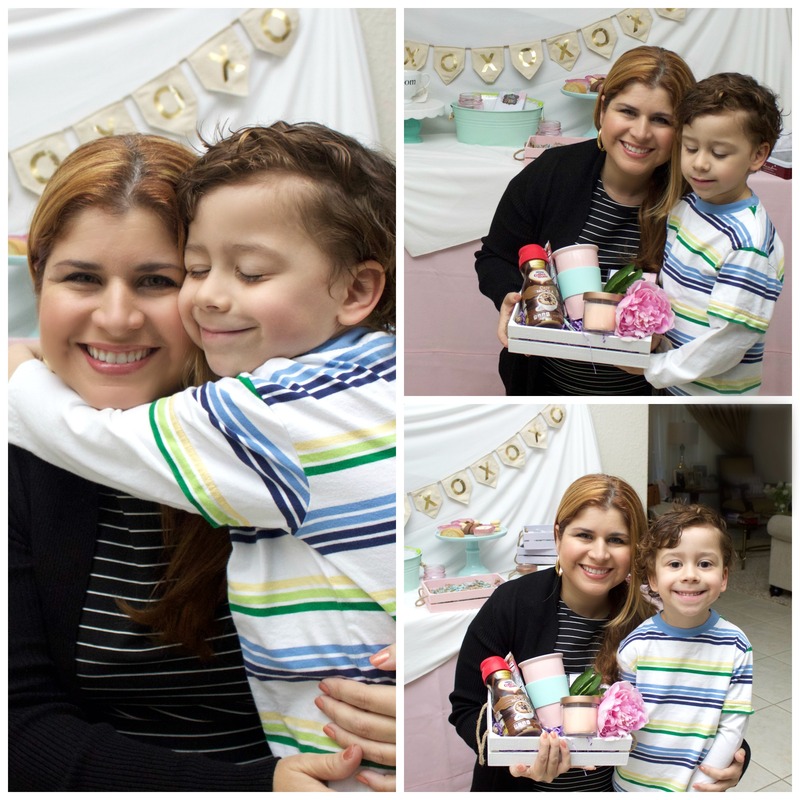 This little one needed some assistance making the basket, but no help was needed in making his mom feel special. Love that little one! Like I mentioned, my Mother’s Day brunch menu rarely changes. I served some cookies, a frittata and a salad. I made the frittata that the Barefoot Contessa makes which was inspired by the owner of Loaves & Fishes in the Hamptons. I love all of her recipes but this one is my favorite. I do make some adaptations like the cooking time and the original recipe calls for basil, which the adults tend to love and the boys…not so much, so I omitted that. 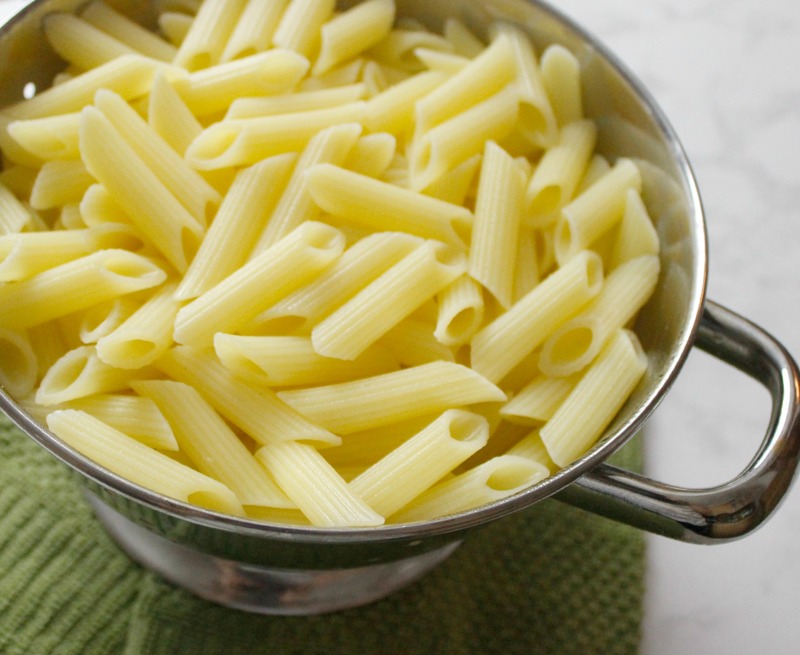 Melt 3 tablespoons of butter in a 10-inch (oven-proof) pan over medium-low heat. Add the potatoes and fry them until cooked through, turning often, about 20 minutes. Melt the remaining 5 tablespoons of butter in a small dish in the microwave. Meanwhile, whisk the eggs, then stir in the ricotta, Gruyere, melted butter, salt, pepper. Sprinkle on the flour and baking powder and stir into the egg mixture. Pour the egg mixture over the potatoes and place the pan in the center of the oven. Bake the frittata for 1 hour, until it is browned and puffed. It will be rounded and firm in the middle and a knife inserted in the frittata should come out clean. Note: Sometimes I substitute swiss cheese for the gruyere. Nothing quite substitutes the nuttiness of the gruyere, but it will do if you don’t have it available. Of course my mom said “don’t you dare post that picture of me eating.” Haha. There you go. You still look good mom! 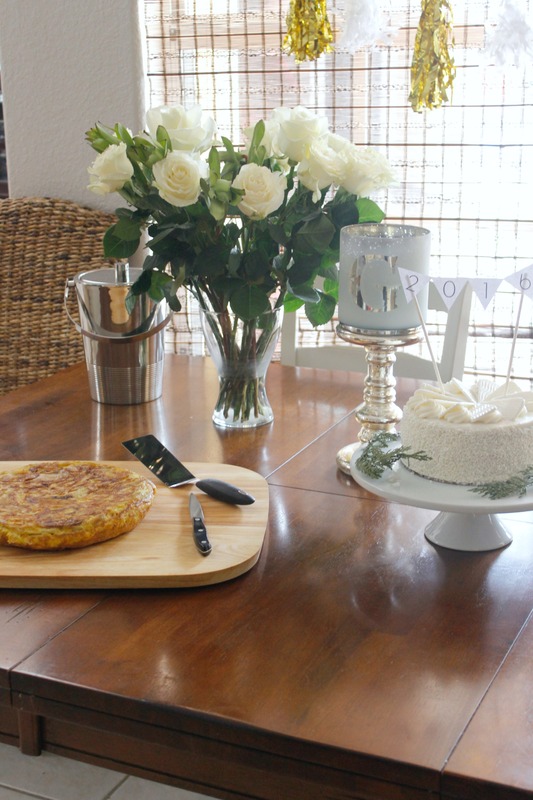 We clearly celebrated Mother’s Day early to be able to present you with this idea, but we enjoyed it so much that we are thinking of replicating it for the actual Mother’s Day brunch. The variety of creamers that were in my baskets were found in Walmart and you can find a $0.75 coupon HERE. Actually, a lot of the little items that went into the baskets were also picked up at Walmart. How is the home organizing coming along? Need a tiny break? Today we are doing something a little different. I am taking a break from the wave of new year organizing and making a little mess in the kitchen – just a little. A few weeks ago I was asked to bring something sweet to a little get together with friends and I immediately knew that I wanted to bring cupcakes, but I wanted them to be special. 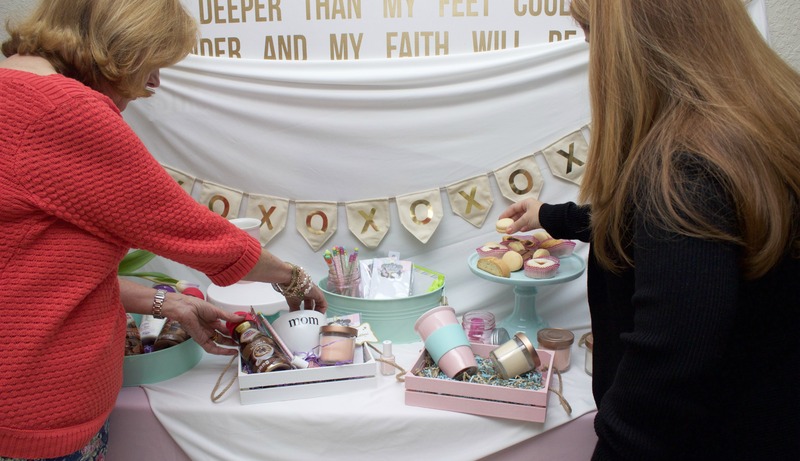 Literally within days of that invitation, I was asked by Wayfair if I wanted to be a part of a fun campaign they were doing called #Cocktail2Cupcake . 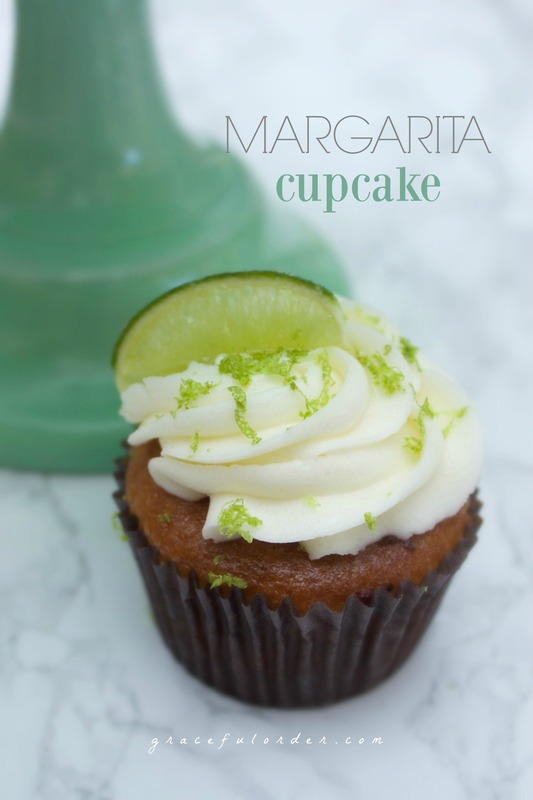 I said yes and decided to merge my most favorite drink, the margarita with a plain cupcake recipe that I already had. I love a good margarita and my husband makes the best ones. I rarely order them in restaurants because I know that they usually make them using sour mix and a bunch of artificial stuff. 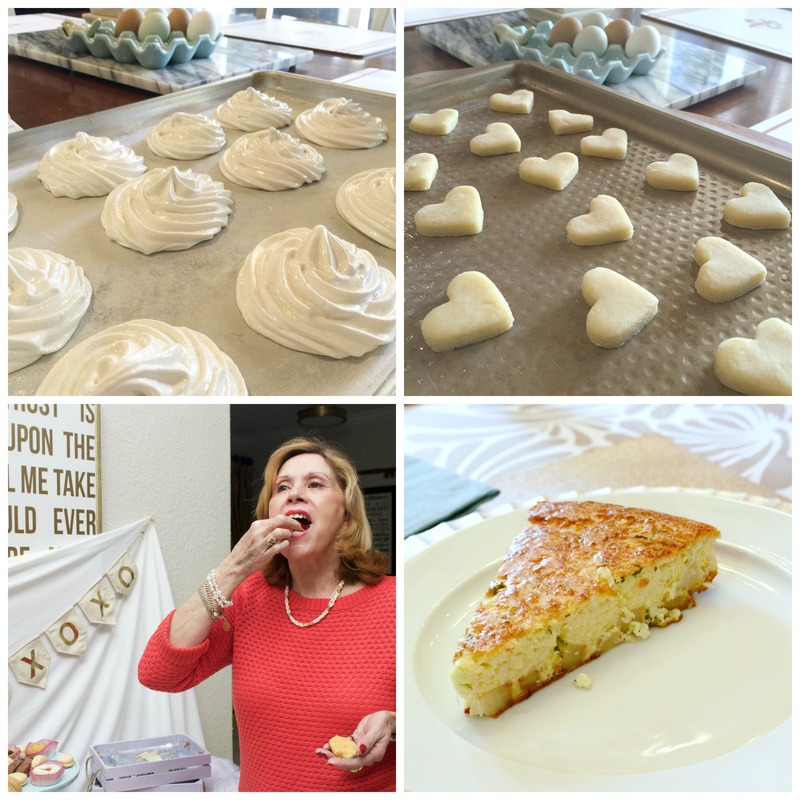 My husband has me spoiled with the real deal – a simple recipe that uses real ingredients. I took a basic cupcake recipe that I had and I added some lime tequila and grand mariner, which are ingredients in the margaritas that he makes me. Here is the recipe that I used and it yielded 24 cupcakes. 1- Pre-heat your oven to 325 degrees F. Prepare the muffin pans with the liners. 2- In a medium bowl, mix the flour, baking powder and salt. Set aside. 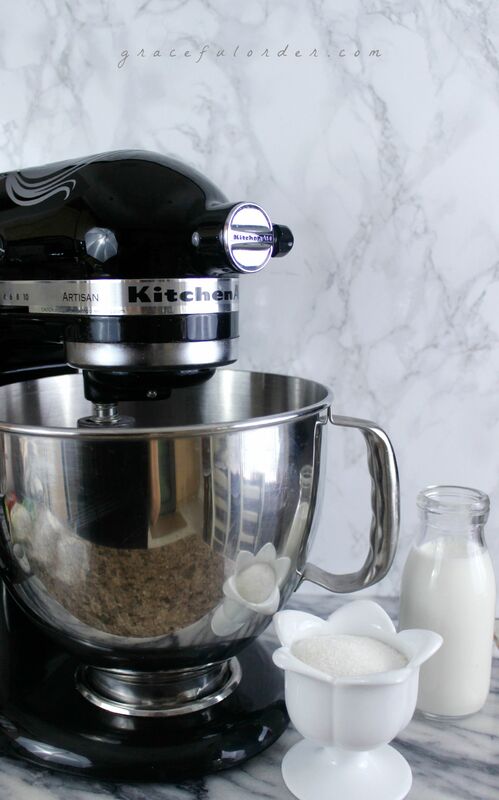 3- Using an electric mixer with the paddle attachment, cream the sugar and the room temp butter for a few minutes. Then add the eggs one at a time. Incorporate the vanilla, lime juice and the tequila. Be warned that at this point the mixture will appear to be too loose. 6- Allow to cool on a wire rack. 1- Blend the sugar and butter until smooth. Add the lime juice, Grand Marnier, tequila, and salt. 2- Pipe the frosting using a star tip onto the cooled cupcakes. Enjoy! I know that my friends loved them and not only were these delicious but they were beautiful. 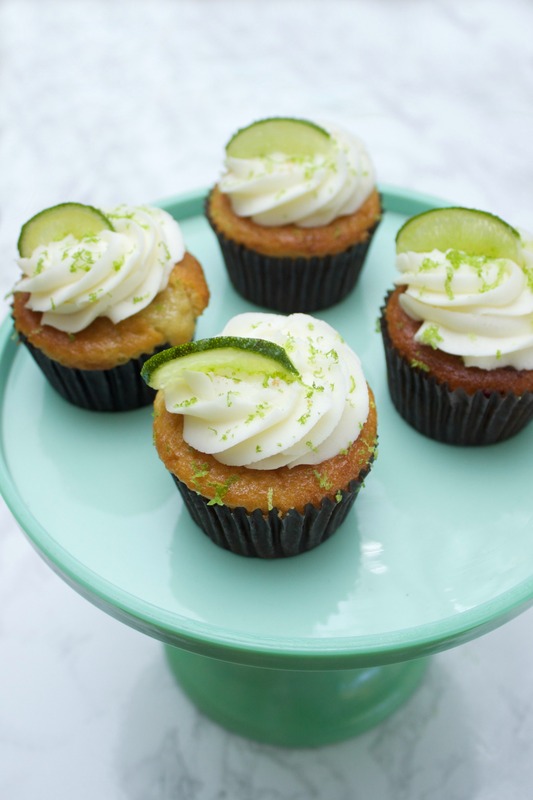 I added a thin wedge of lime that I tossed in some sugar before placing on the cupcake. Have an awesome weekend friends. I’m ready for a real margarita! Traditions…they are woven into our holidays and are so much fun to create and continue with our families. Granted, December is a month full of traditions because of the holidays, but in our family, we squeeze one more little gathering in after the New Year. The Spanish start the new year with a bowl of lentils, (don’t ask me what it means because I have no idea) but I love lentils and I love family, so who am I to stop this awesome tradition? 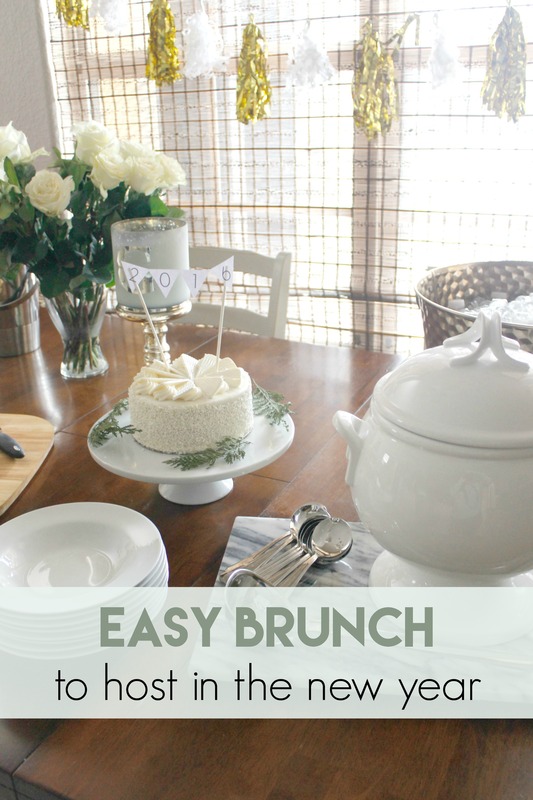 The New Year is a great time to reconnect with family and friends and here is an easy brunch to bring everyone together! Sometime during the month of January (usually later than most), we put away all the Christmas decorations and it’s out with the red and in with my usual muted tones, which I miss after months of jewel tones and glitter everywhere. I actually end up finding glitter all over my home well into February! 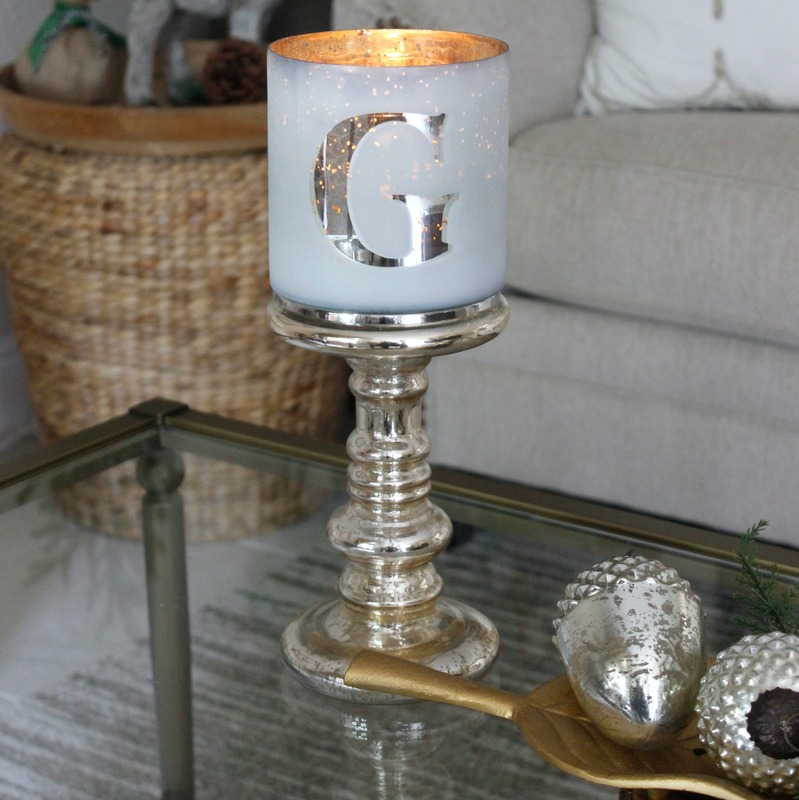 After I give the house a good cleaning, I will usually light a candle or in this case, use a candle melt. Again, after all the peppermint scented items from Christmas, I long for clean scents. Here I am using one from Glade® called Clean Linen®. The trick with this brunch is to make it simple. After putting together so many holiday spreads in December, this needs to be really easy – hearty but minimal amount of food. 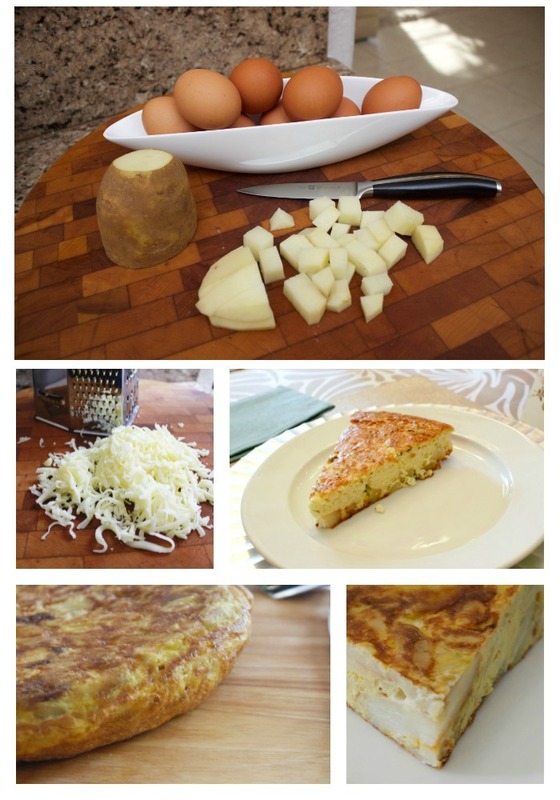 We always accompany the lentils with a Tortilla Espanola (Spanish Omelette). Again, when you think of these two items, they are not exactly a perfect pairing, but it’s just what my Cuban family has done for years and I am just following along. While not the perfect pairing, they are both delicious! 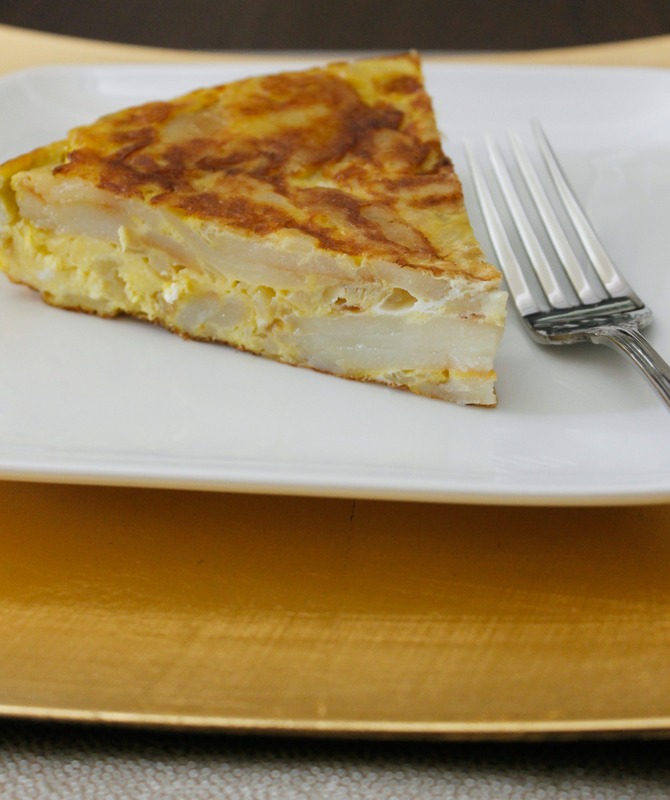 This omelette has lots of potatoes that are cooked in olive oil along with thinly sliced onions, before being incorporated into the egg – yielding a really thick and hearty omelette. I make the lentils in a large pressure cooker and I add onions, garlic, green pepper, squash, carrots, potatoes, Spanish chorizo and Spanish paprika. I also add the ham bone from the honey baked ham that I serve during Thanksgiving. Every year after Thanksgiving dinner, I freeze the ham bone (that still holds quite a bit of ham) to use for my lentils brunch. This gives the soup a lot more flavor. The pressure cooker makes everything very tender and when the soup is done, I simply shred the ham that is falling off the bone and I add it to the soup, discarding the bone. 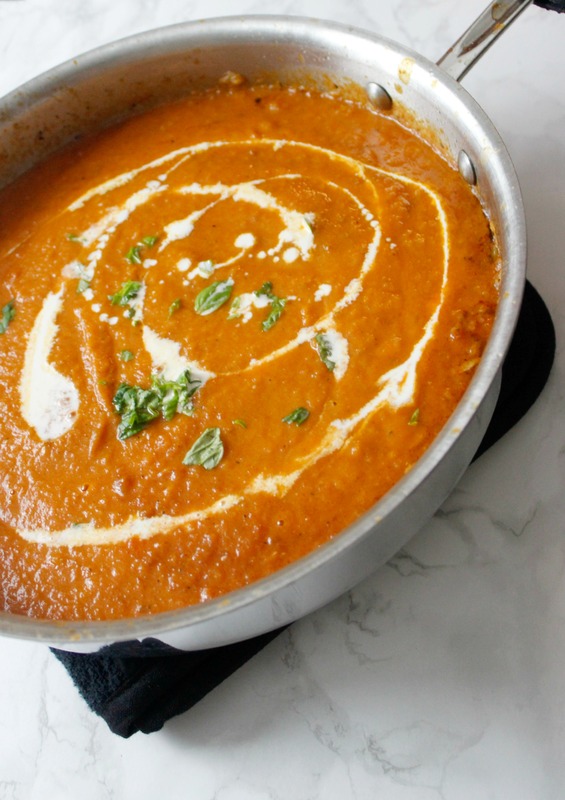 We make lentil soup during the year, but none is as flavorful as this one. Here is my mom serving my oldest a plate of lentils. Grandmas are always concerned about their grandkids getting enough to eat. I think that’s a universal sentiment. We all sit in the dining room and eat and talk and go back for seconds. Of course, the only thing missing is dessert. 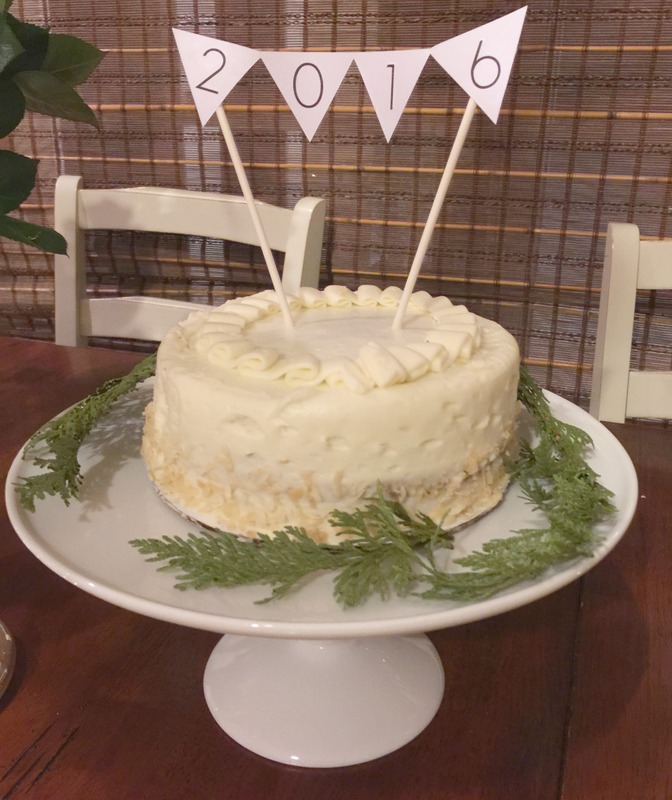 I added a little banner to this white cake to highlight what we are celebrating! 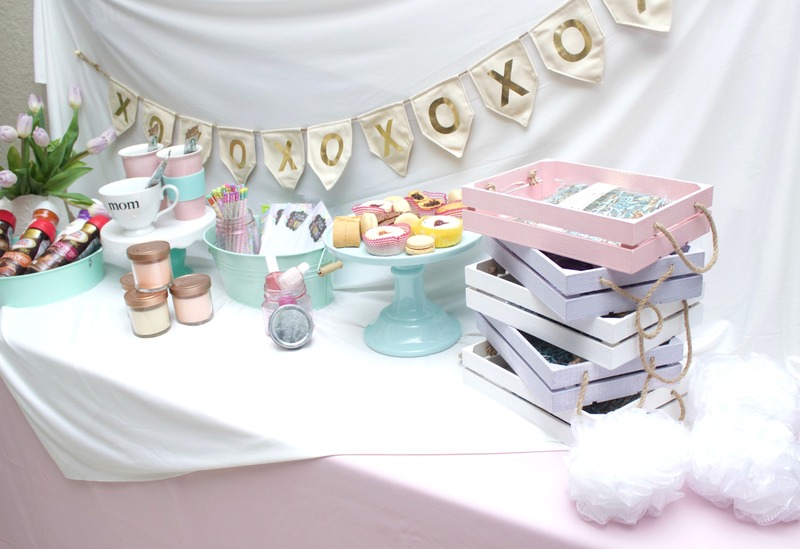 Putting together a little party like this is easy, it just takes a little planning. Here are some of the things that I do to ensure a relaxed atmosphere for my guests and even for myself. 1 – Choose a few items that can be served cold or room temperature. 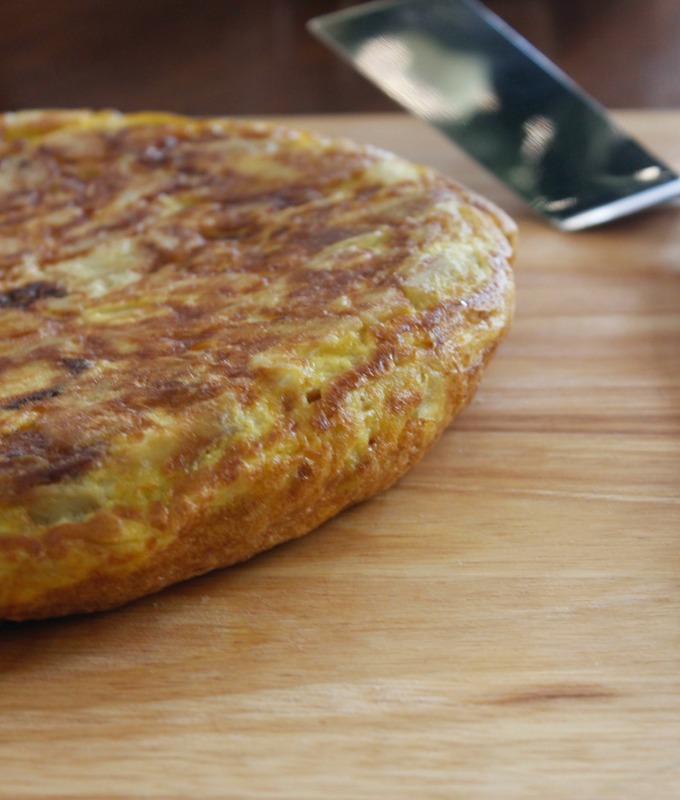 While the lentils should be served hot or warm, the Spanish omelette can be served at room temperature. That is one less thing to fuss over. Other food options that do well at room temperature are, homemade granola with yogurt drizzle; also a quiche or a strata usually hold up well on a buffet table. 2- Keep the decorations simple. Sometimes I just leave out the white and silver decorations from holidays and add some fresh flowers to the mix so it doesn’t look Christmas-ey. 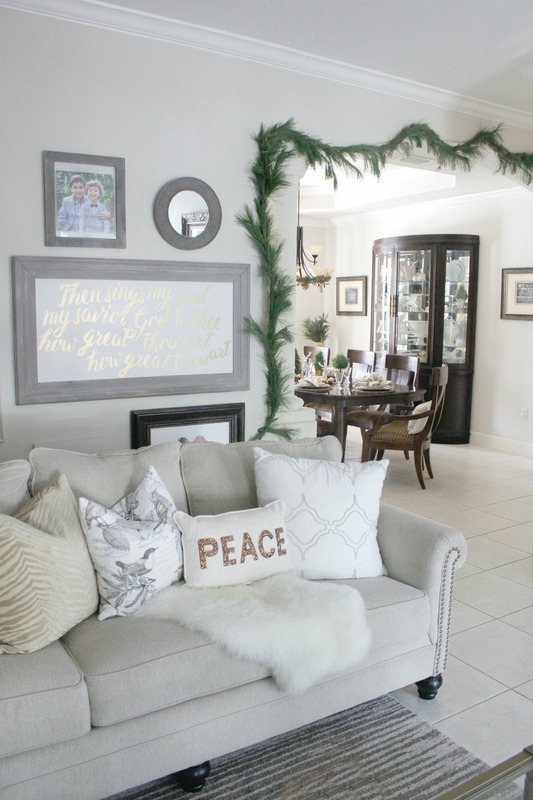 I love decorating, but the new year feels like a time to simplify. 3 – I purchase a store-bought cake. I think it’s a mistake to try to make everything yourself unless you feel like you have the time and desire to do so. If you are already making the first course and the side, buy the dessert or have someone bring it. Tip: If your cake is small like mine, just place it on a pretty stand and add some greenery around the base. 4 – Have your dishwasher empty and ready to load. For a small gathering, like this one, I use “real” plates but I always have the dishwasher empty so that I can quickly load them in there. Otherwise, I recommend paper plates. Anything to keep it pretty and easy. If you use paper plates, you will also have more garbage. Make sure to have enough garbage bags under your trash bin so that you can quickly swap them out once full. 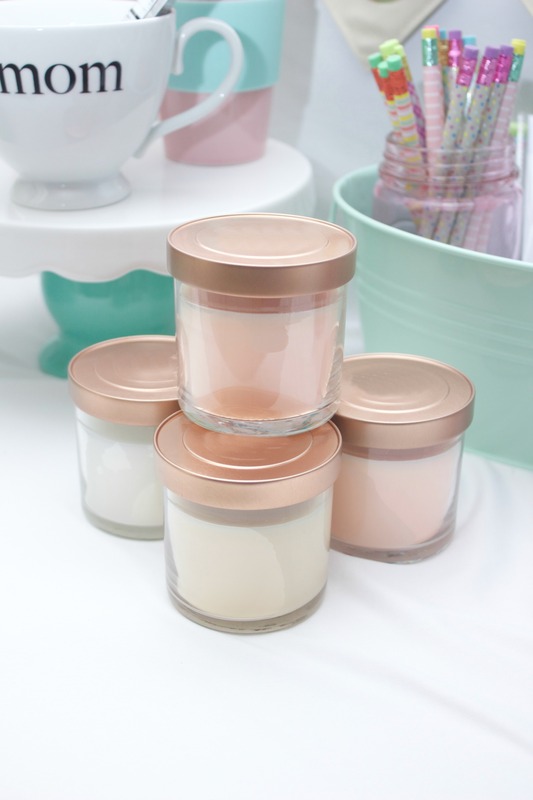 5- Stock up on candles and scents for your party and so that you can kick back once everyone has left. 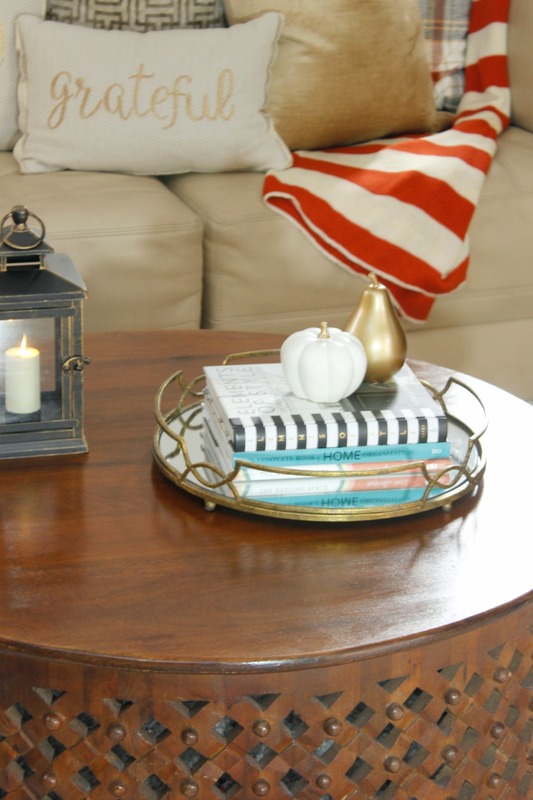 Candles and scents can transform your space. 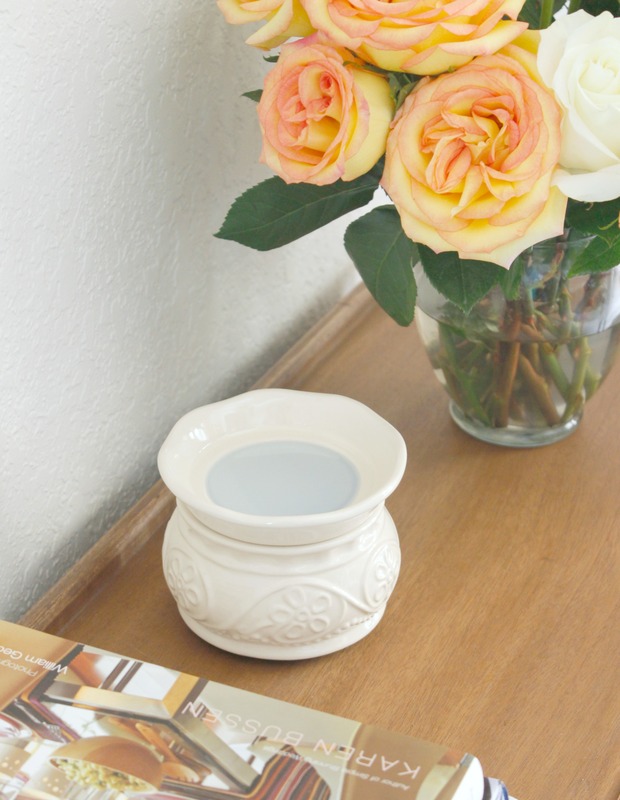 I placed a Glade® Wax Melts on the warmer tray and within minutes it was dispersing a clean scent throughout my home. These melts provide up to 16 hours of fragrance. Here it is all melted. You know who else melted? Me! Into my pajamas once everyone left. It was fun, it was yummy and I need a nap! If you need me I will be here, continuing to write the wrong year on my checks. Have you hosted any get togethers so far this year? Have you attended any? 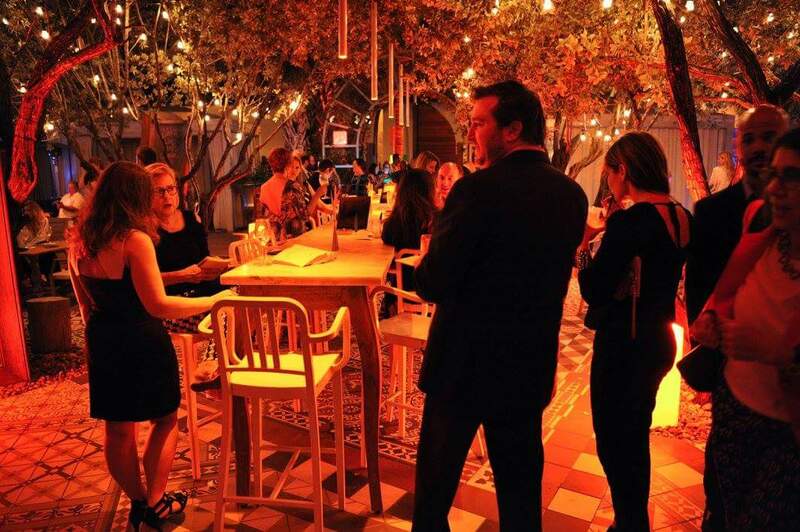 For more great ideas, you can follow the Siente Glade Social Hub. 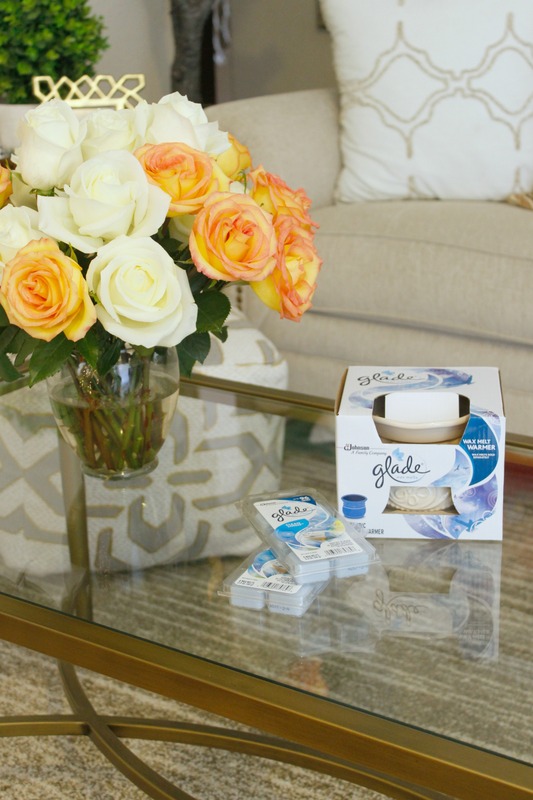 You can find a @Glade coupon offer here. You can also follow @Glade on Facebook here. 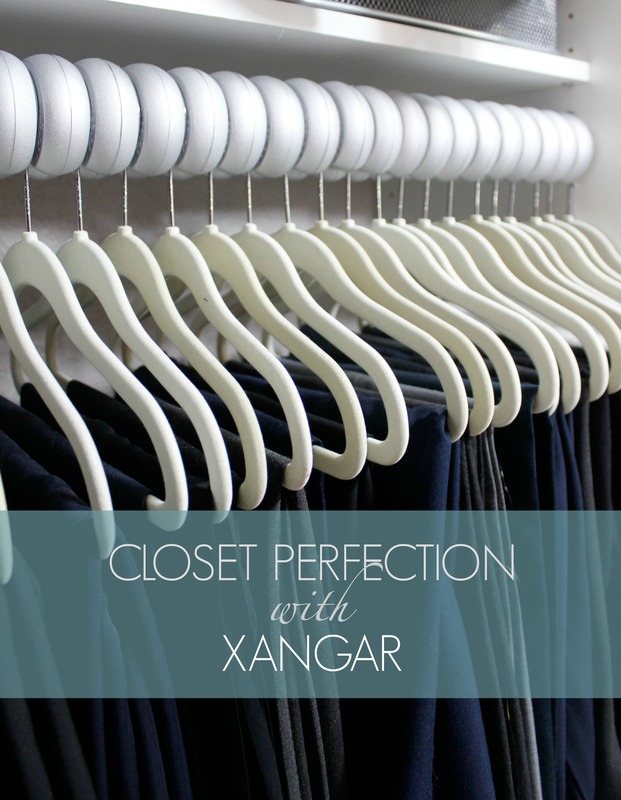 A few days ago I shared my tips for organizing the master closet but I left out the latest and greatest addition to my closet – Xangar hanger spacers . Every year I go through my wardrobe and I try to get rid of items that I no longer use, at least I thought that’s what I was doing. You see, I was really only making enough space for my items to fit and not be stuffed in the closet, but once I achieved that, I wouldn’t make a final push to get rid of unnecessary items. Although I thought I was ruthless in my approach to streamlining my wardrobe, I was really ignoring a lot of clothes that needed to go but they stayed. They stayed because I loved the item, they used to fit me well, I wished they fit me well, items I paid a lot for but no longer used… they stayed in the closet because they fit in the closet and it’s not like I needed to make space for anything else. 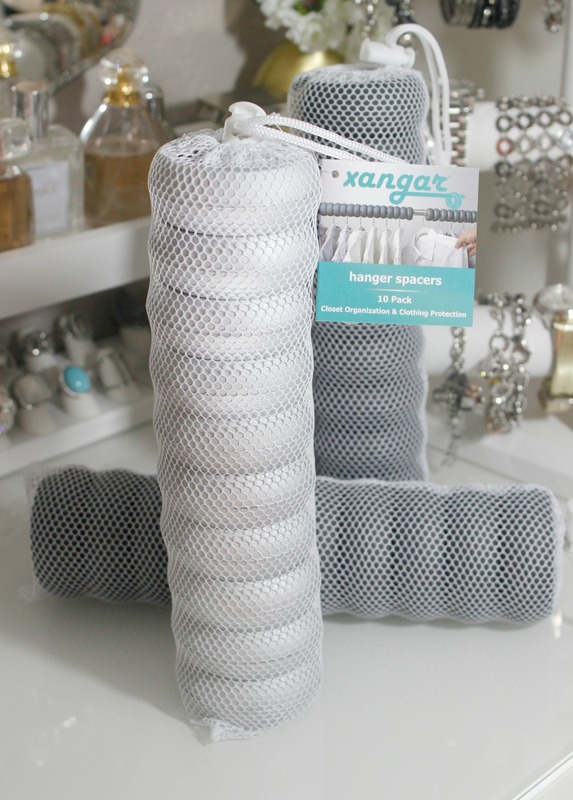 I was introduced to Xangar hanger spacers last year and I thought I would give them a try. I have to admit that I first thought, “won’t they take up additional space in my closet?” and the answer is yes – they took up space but what they gave me in return was greater. Since I knew I was adding the spacers, I went item-by-item and got rid of so much clothing! So much! They were items that I had not worn in years and were just in my closet because there was space for them and no other reason. I donated all those items and I instantly felt so much better about not housing so many unused pieces of clothing. I also love how when I pull an item out, it slides out with ease without catching on other items. It is just as easy to put back and the spacer makes it obvious where the item needs to be returned to. Shirts or pants that have a tendency to wrinkle, are no longer crushed between other items of clothing. I have always been a fan of organizing my clothing by color, which is time consuming the first time you do it, but so easy to maintain afterwards. Not to mention, color coding makes your space look instantly more organized. I also created zones with my spacers by using 2 colors, gray and silver. Most of my hangers are thin black plastic hangers and I used the Xangar dark gray color spacers in between them. I use white kid hangers for my pants (so that they don’t stick out) and the silver helps to set that section apart. Of course, you can add more colors and more zones, but two were enough for me. I chose to leave the area with my coats without the spacers. My jackets take up enough space in between the others to act as natural spacers anyway and let’s face it, I live in Miami and that are of my closet will gather dust before I need a coat. The spacers are made out of a foam (but sturdy) material and are really easy to install. There is no need to remove the rod as they easily slide into place. They are 1/2 in wide and 1 5/16 in deep. 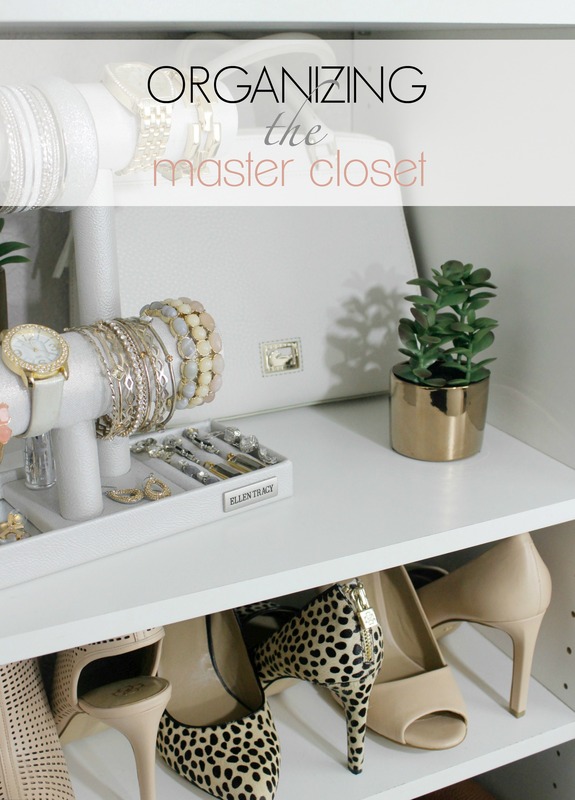 Helps to keep myself accountable for the amount of items in my closet. 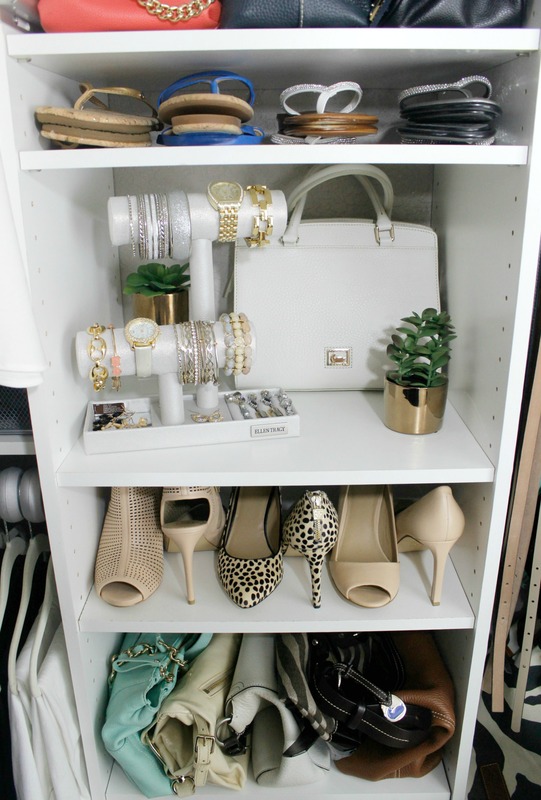 My closet was already organized before I added these spacers, but they definitely took things up a few notches and made it look even neater! 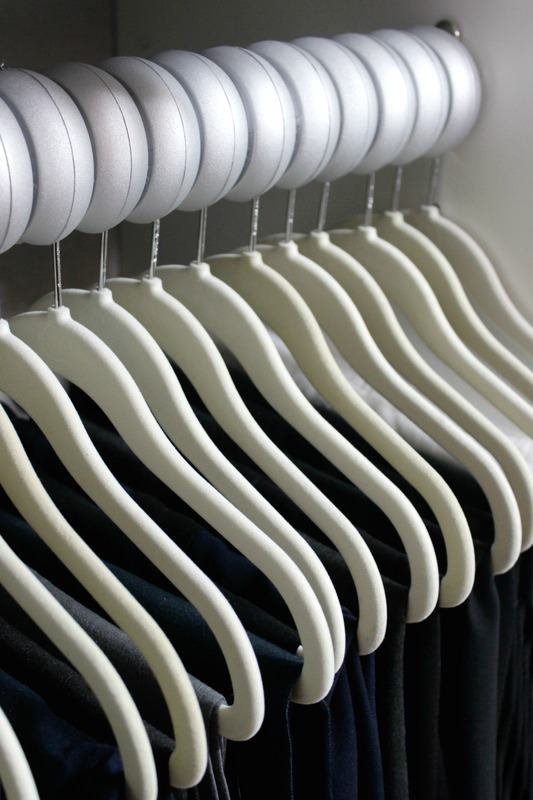 The spacers made me sort through all my clothing (I even tried on all my pants – God help me) and I was able to limit the items that I kept in my closet, to those that I actually used and wanted. These spacers keep me accountable for the one-in-one-out rule which is a really good thing. This is definitely one of those “why didn’t I think of that? !” products that are a genius solution and simple to use. 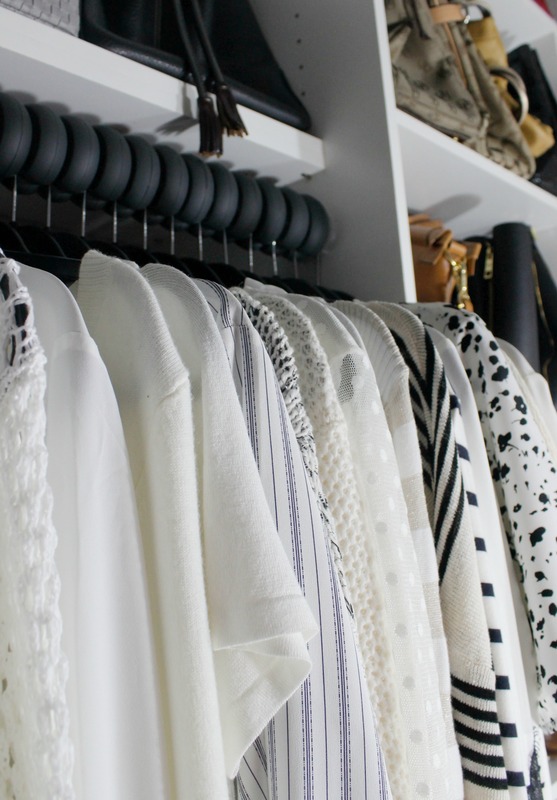 If you are looking for a neat, sleek and minimalistic look for your closet, give them a try! 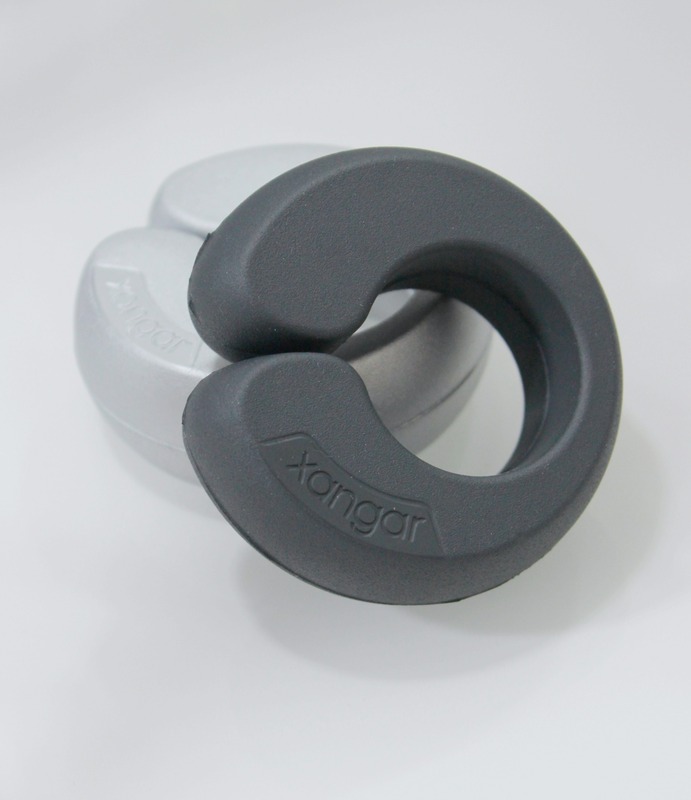 You can find the Xangar hanger spacers on Amazon by clicking here . You can learn more about Xangar on their website here. This post was sponsored by Xangar. As always, all the opinions are my own and I only recommend items I use and love to my readers. It’s not the first time that I post about my master closet but I have added some little touches and kept the systems that already worked. This is always how any organization project should begin. There are always a ton of items that I get rid of when I set my mind to it. I try to donate anything that doesn’t fit, doesn’t fit well or I no longer like. It’s even a good idea to go through I items again, even after you think are you are done sorting. I like having a little stool in the closet to sit on while I try on shoes. I used to have a different one before but this one is smaller and works better in this narrow space. I found this one at Target. 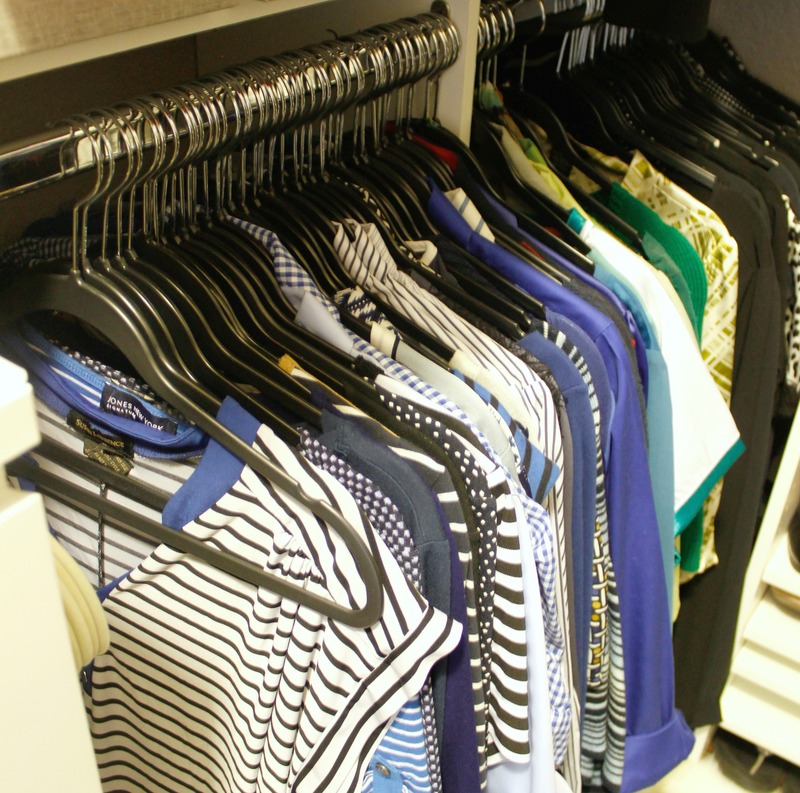 This clothing valet has been one of the best things about this closet. 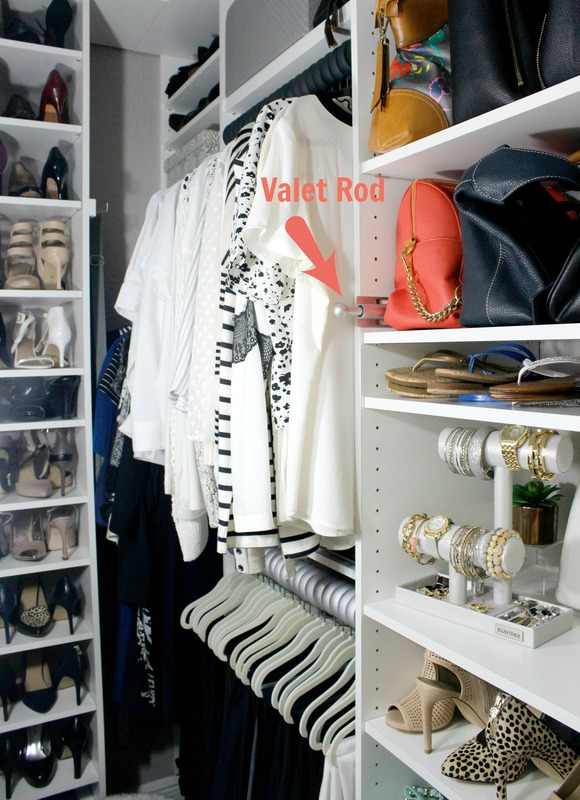 I use it to set aside my outfit for the next day, when I am sorting clothing or trying on multiple items. I really take advantage of the adjustable shelves to make them work for me and customized to all the items that I own. That means that some of my shelves are really narrow, like the ones that hold my sandals. I don’t have space for a large vignette but I do like leaving a shelf semi-open and housing only a few items. Here I added one of my favorite purses, a bracelet holder and a little plant. The addition of the plant makes a huge different in livening up the space. 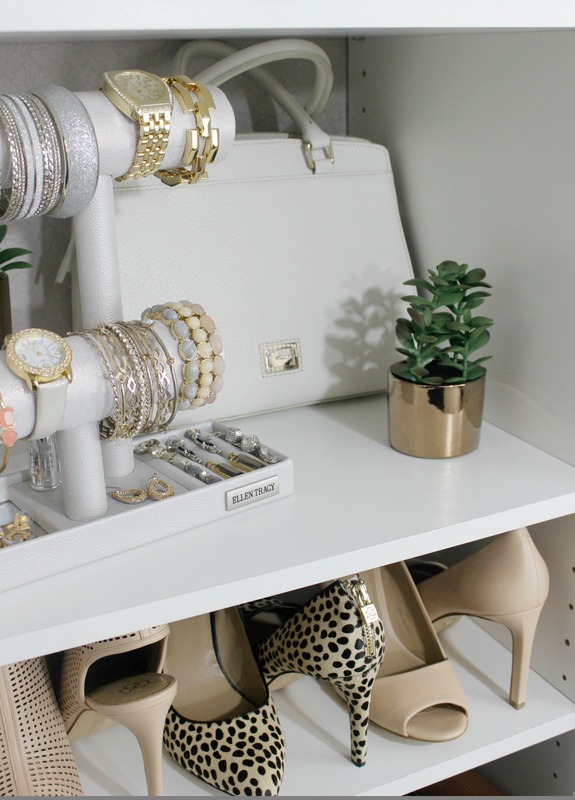 Also, a vignette breaks up the monotony of shelf-after-shelf with shoes and purses. Lots of bling, lots of fake. 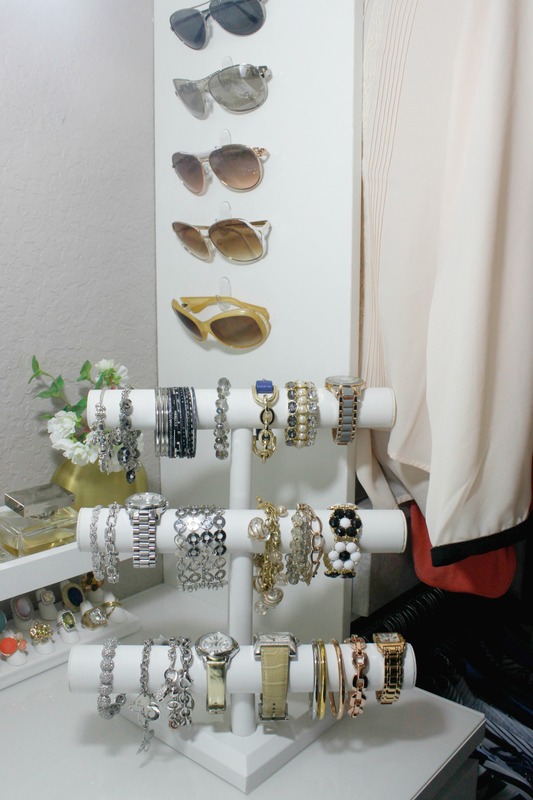 I have quite a few long necklaces that tend to tangle easily, and this tie rack works perfectly to keep them organized and tangle-free. I have an IKEA dresser inside my closet and the closet system is built around that dresser. I think it gave the closet a more finished look, while adding a lots more storage for my t-shirts and shorts. Last year I posted about how I organize my sunglasses. This system still works for me. It is great for inexpensive sunglasses that don’t come with a case. 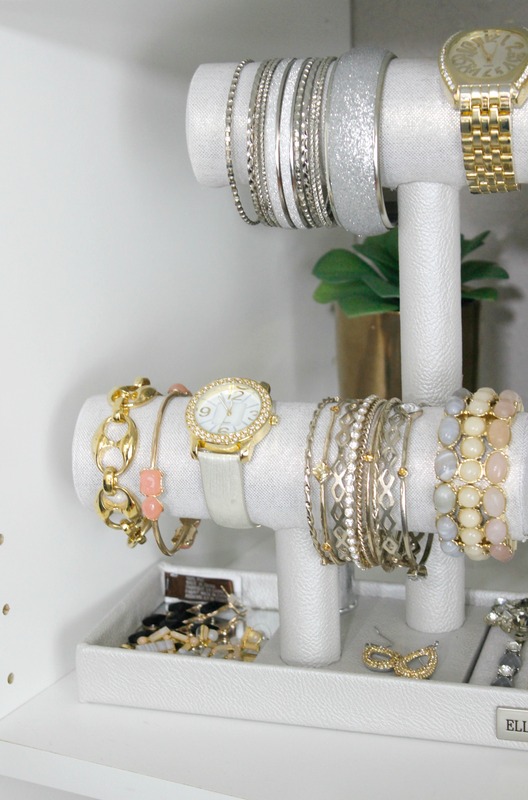 I have two t-bar displays for watches and bracelets in my closet and pictured below is one of them. On the other side of the dresser, I have a little bowl with my hoop earrings, which is mostly what I wear. 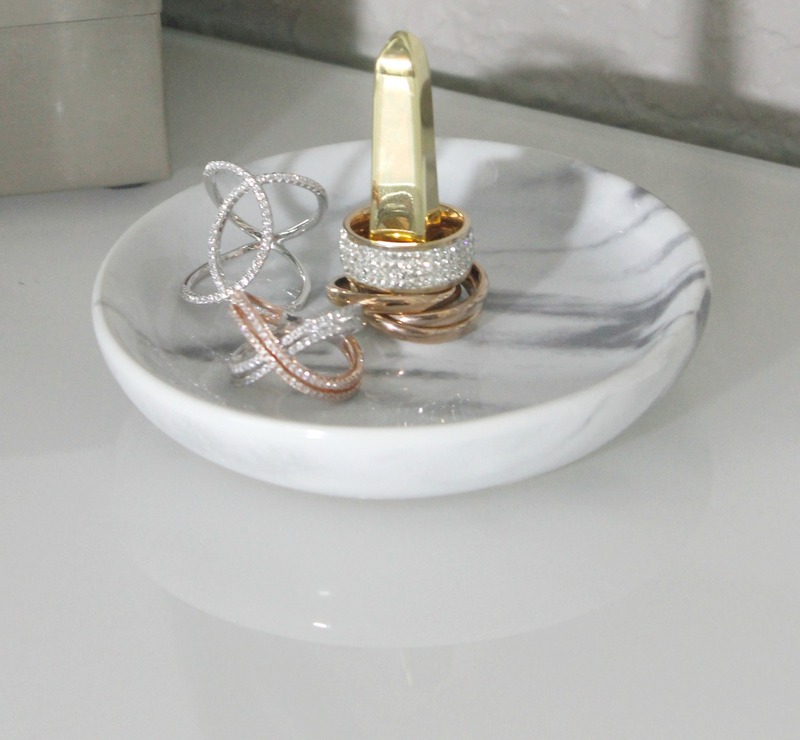 A little ring plate sits on the dresser which is where I place the rings that I wear most often. Can you believe that small holder was a little over 4.00 at Target. Love those clearance items! The rest of my rings are on this ring display . I purchased 2 of them to hold all my rings. 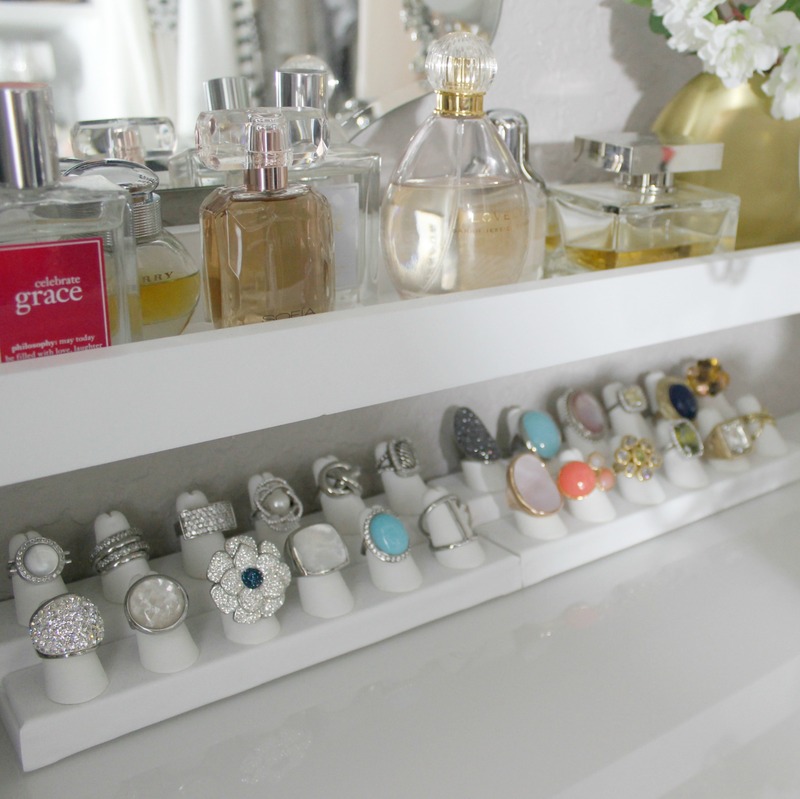 Above my rings is a little shelf that holds all my perfume. I wear perfume everyday whether I am working from home or heading out with the boys. I know some people have a signature scent that they like, but I like changing it up and trying new perfumes. I know that it’s not easy to take the time to go through all the items in your closet, but it is so worth it. 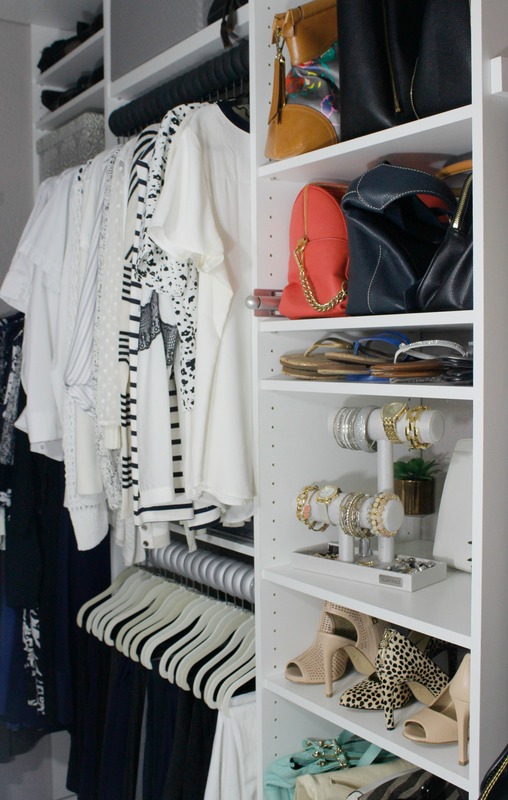 I hope this encourages you to go through your closet and streamline your items. 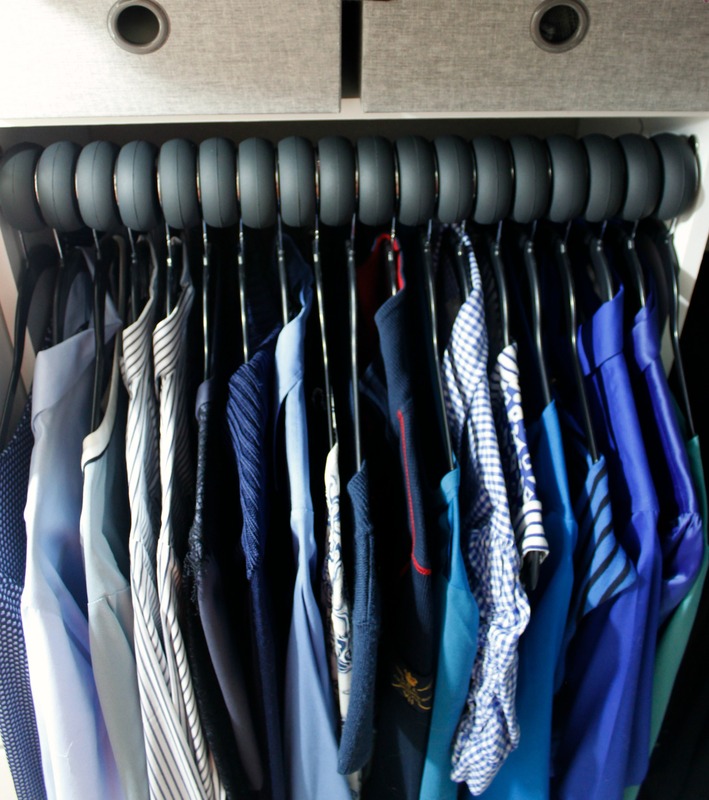 It’s a great feeling to walk into an organized closet every morning! Love is in the air! 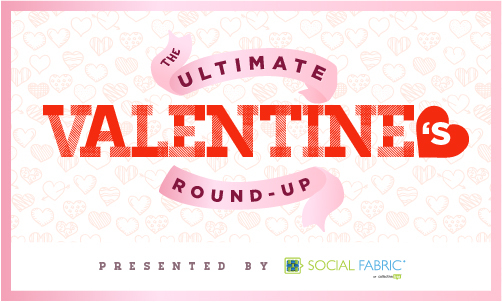 Valentine’s Day is around the corner and the Social Fabric Community has put together the Ultimate Valentine’s Day Round-Up to help you prepare for the season of love. There are a ton of tutorials, crafts and delicious recipes to choose from! We usually celebrate Game Day at our house because it is an excuse to get together, but also because it’s very close to my husband’s birthday. Sometimes it’s more of a birthday celebration than game day, but this year it will be all about the football. We are actually not even big football fans, but that day we watch the game with such emotion that you would totally think that we bleed the colors of the team we are rooting for. It’s really a fun time and a great event to share with family and friends. Also, it’s so casual and most of the time we are laughing, laying on the couch, munching on snacks – and that’s pretty awesome. This year I am setting up this tablescape which will be right in front of our dining room. However, this won’t be holding all the food. I will set up this table and keep replenishing it throughout the day, but items like the chili and the meatballs, I will keep warm on the stove since this day is all about food grazing. Vote for you favorite snack stadium to enter the #gamedayglorysweepstakes for a chance to win a $100 Walmart eGift card or Xbox One! 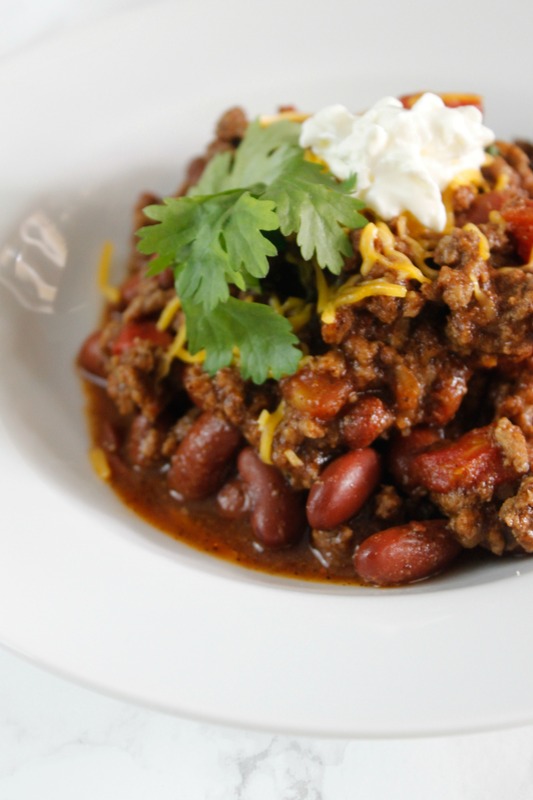 The only item that I am making from scratch is my Game Day Chili. 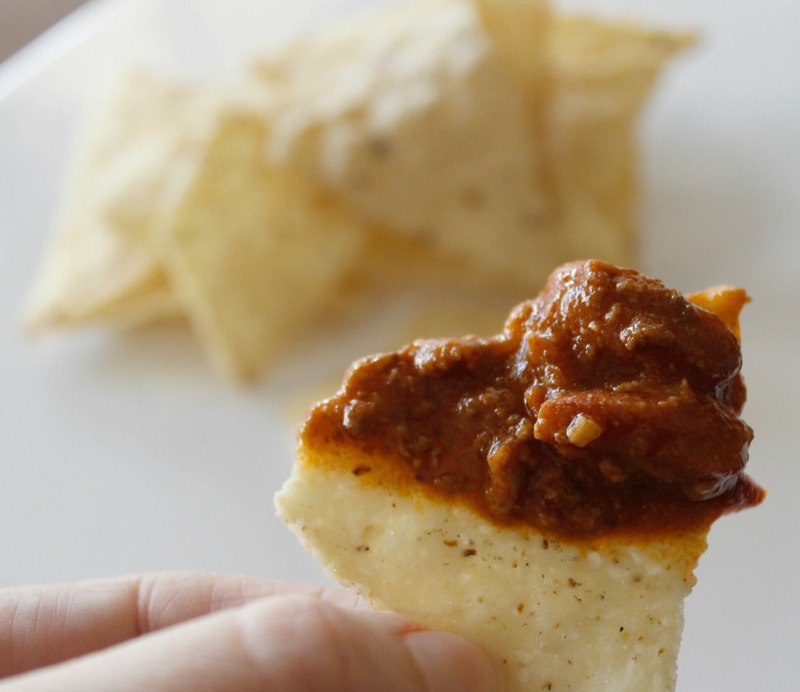 It is such an easy recipe and it gets better as it sits, so it’s perfect for Game Day. 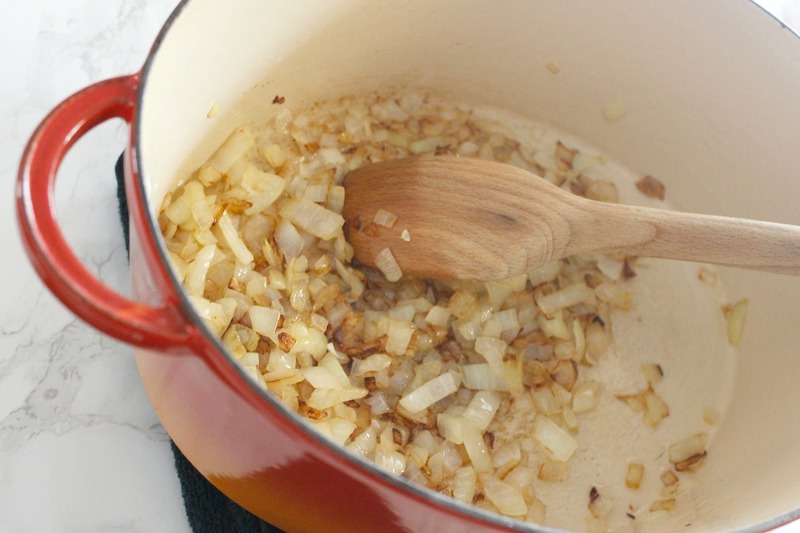 1 – Heat the canola oil in a dutch oven (or stock pot) and throw in the onions until they are translucent. 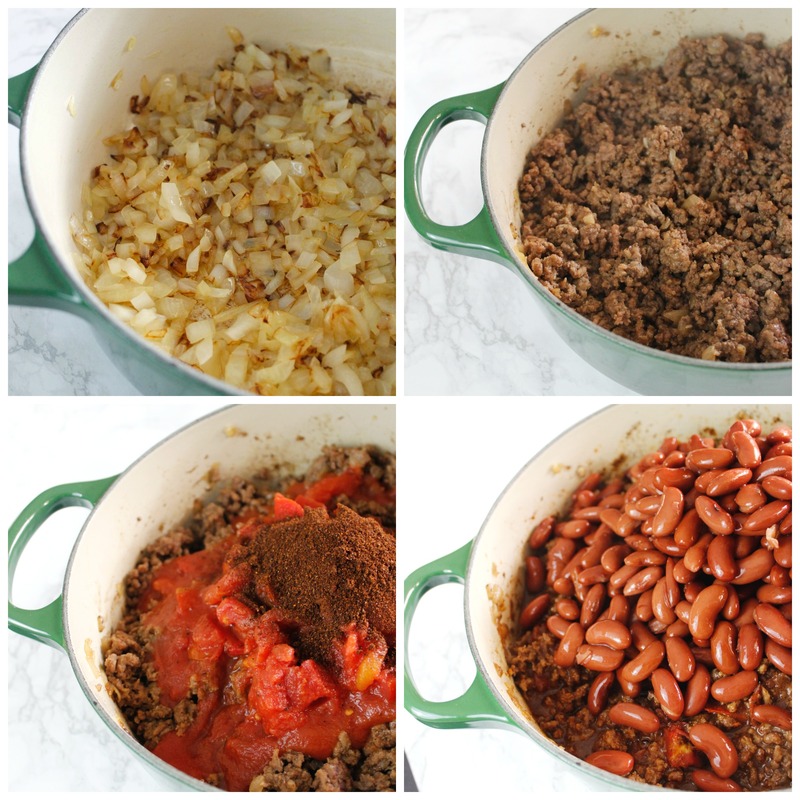 2 – Add the garlic and the ground beef and cook through and slightly browned. 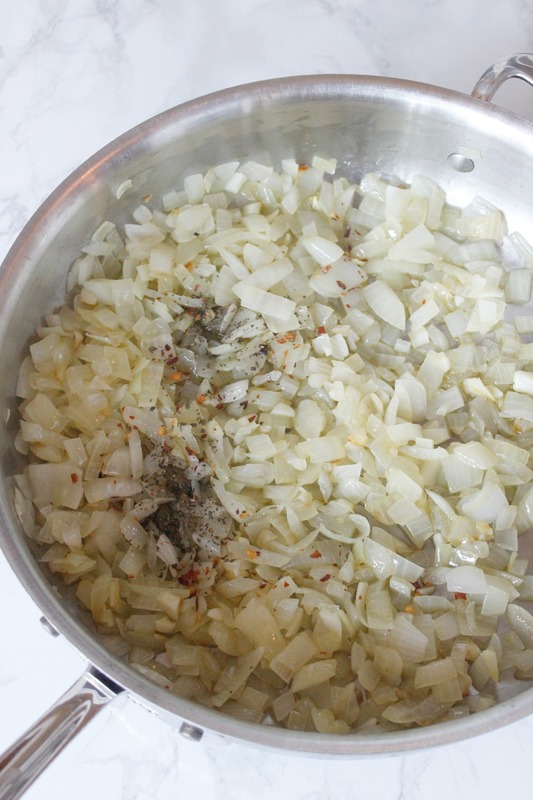 3 – Remove excess fat from pot if necessary. 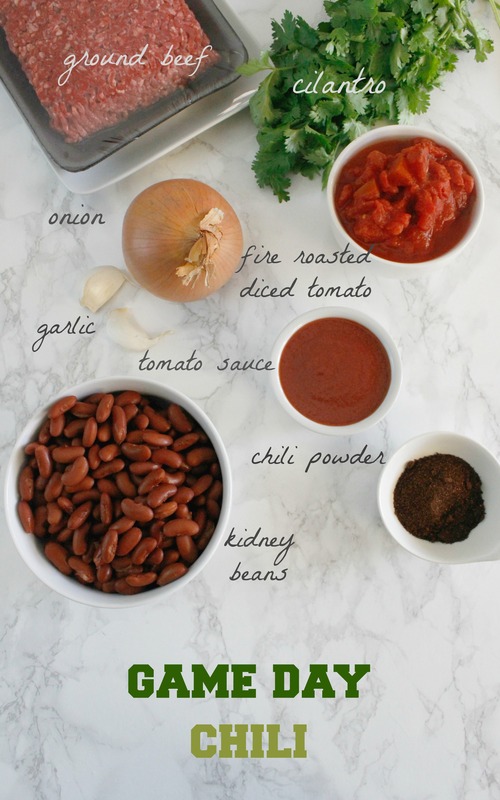 4 – Add the rest of the ingredients to the pot, except for the beans. 5 – Stir, cover and simmer for 30 minutes. 6 – Add the beans, cover and simmer for another 30 minutes. 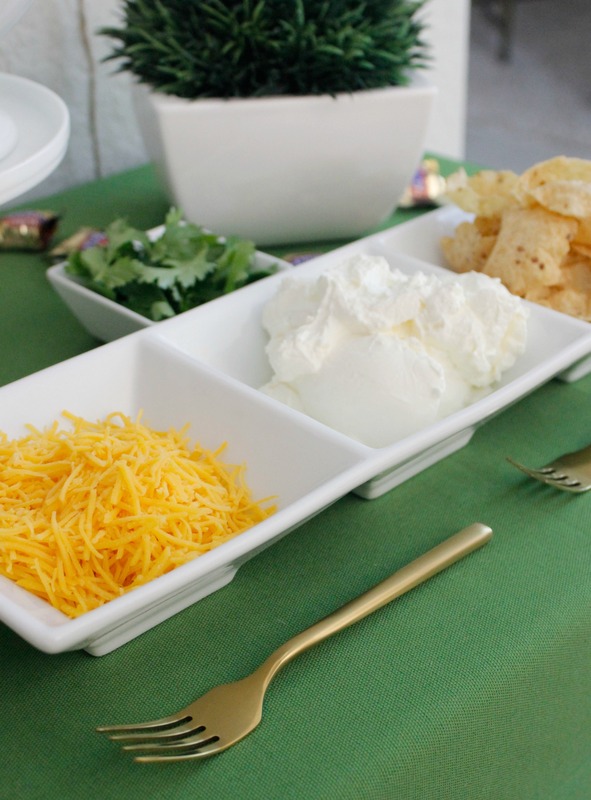 Serve with toppings on the side – cilantro, sour cream and shredded cheese. or in a bowl with toppings…yum! Of course I am also serving some yummy snacks that won’t last long on this table. The rest I will keep in a warm oven, so that it lasts all afternoon. Today, I am serving some delicious chicken wings. Football and chicken wings are a no-brainer. I am also serving TOSTITOS® chips and salsa. No-brainer #2. These are everyone’s favorites on game day. Also, I placed some skewers of tomatoes, basil and mozzarella inside a deep dish full of peas. 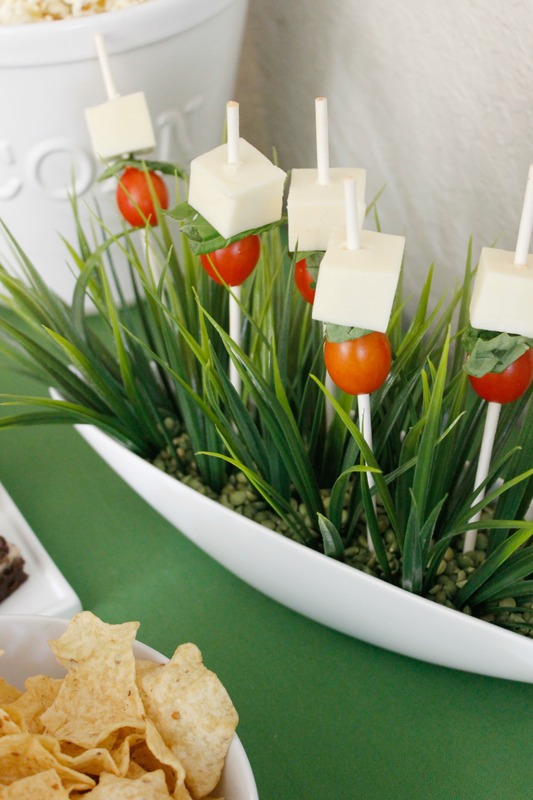 I also accented the dish with some faux grass as a nod to the game field. Mozzarella sticks are my boys’ favorite and they are center field! On the side, I wrote out the word GAME using Skittles® and I know my boys will love that. I will have a variety of drinks available, including small bottled waters and Pepsi™ cans so that everyone can pick their favorites. I made meatballs the night before and they are one of those food items that heat up great the next day. 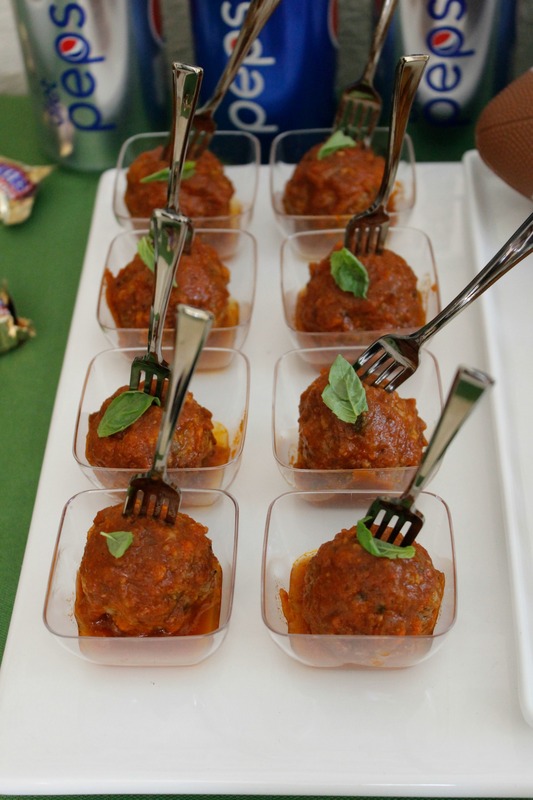 Meatballs are another favorite at the buffet table! 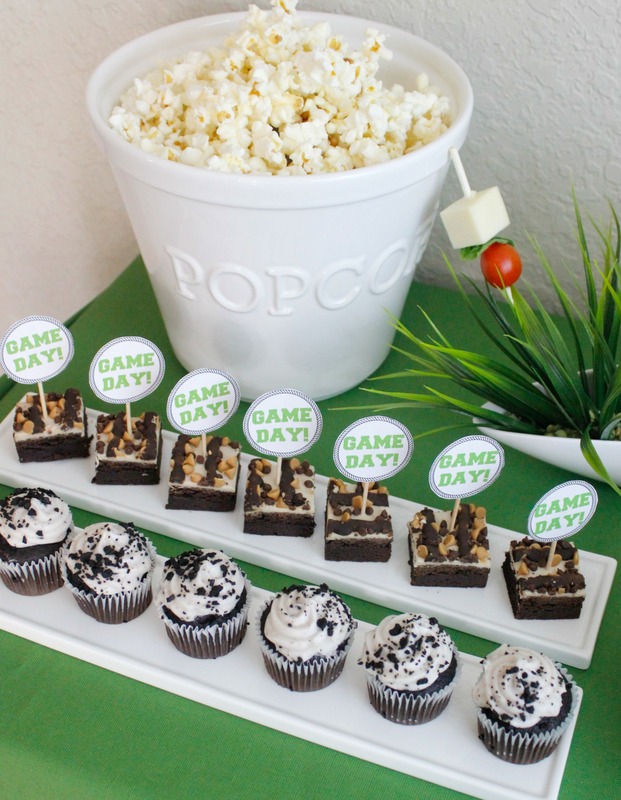 A big bowl of popcorn anchors the other side of the table and for those wanting something sweet, after eating that spicy chili, there are cupcakes, brownies and SNICKERS® chocolates scattered on the table! I encourage you to take any excuse that you can to bring your family together and make memories. I hope this gave you some good ideas to kick-off the fun this weekend! 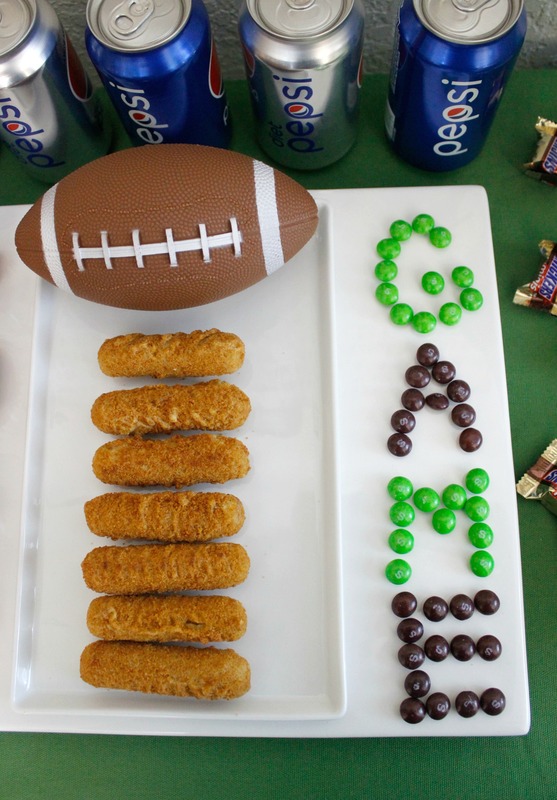 Don’t forget to enter the sweeps above and you can also share with me your own snack stadium ideas on Instagram. Share by using the hashtag #gamedayglorysweepstakes. Also, visit here for more recipes and snack stadium ideas! 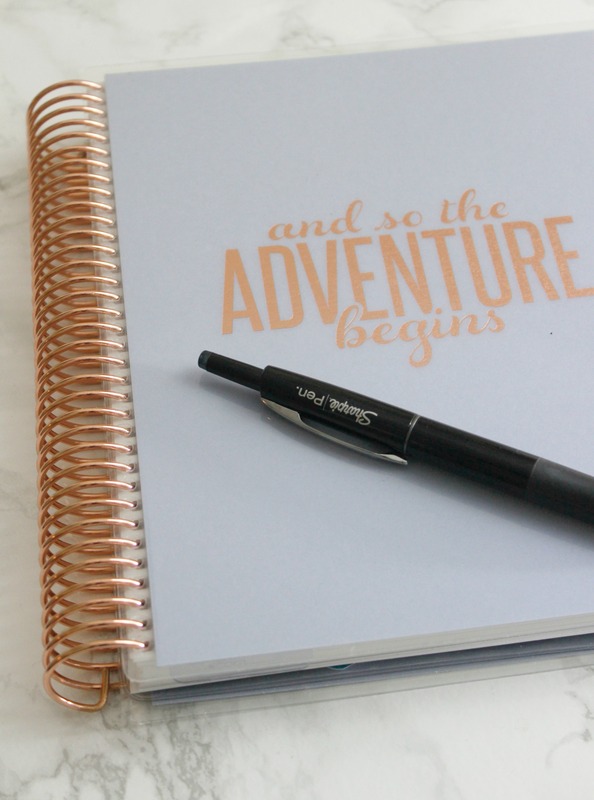 One of my favorite purchases of the year is getting to choose my new planner and planner supplies for the new year. 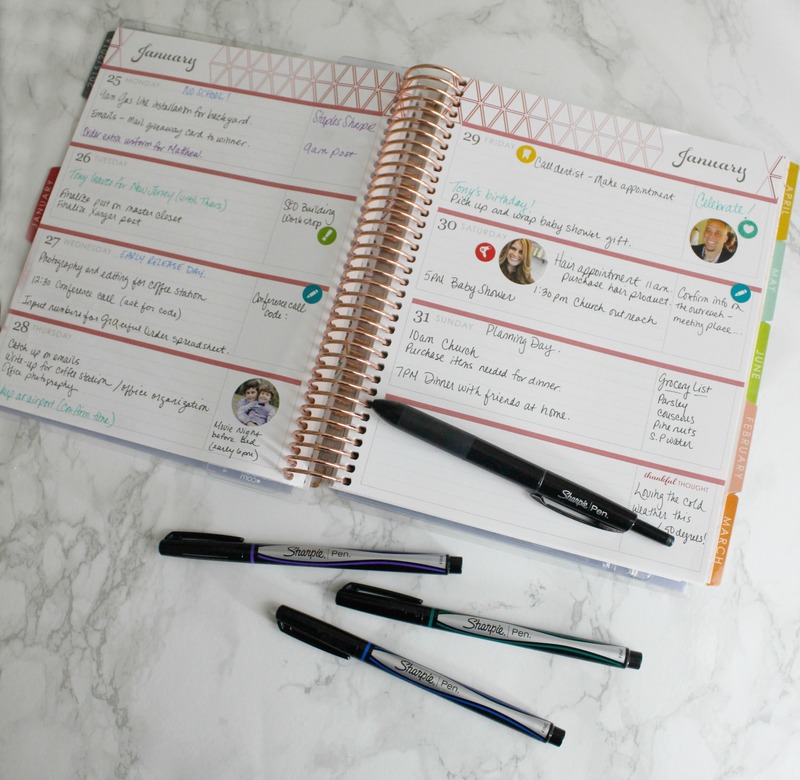 Somehow I cannot get used to digital planners and I need to write things down on a planner – I need to jot down appointments, create lists and take notes. I get a feeling of accomplishment from crossing off a task that I just completed. I know that a lot of my friends feel the same way. While apps complement my planning, I can never see them replacing my physical planner. I also keep my planners after the year ends and they serve as a journal of sorts and that’s why I take my time to make them pretty on the inside. Sunday morning (sometimes evening) I sit down with my planner and a few supplies – mainly colorful tabs, stickers and Sharpie pens. I have a few of them, a few towers, that is. 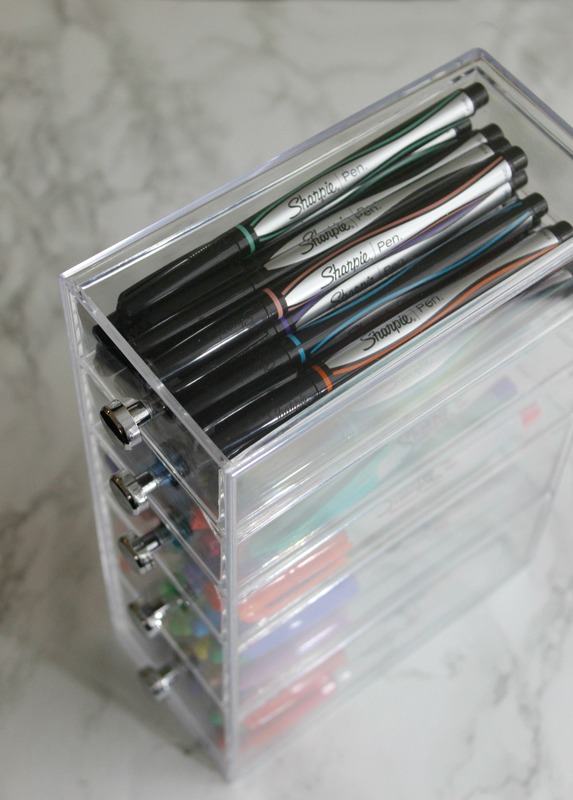 I love this little set up that keeps my pens/markers organized. In here I have Sharpie pens, calligraphy pens, fine tips, the metallic ones – everything in one spot. I love planner supplies and embellishments just as much as the planner itself and it makes planning, which is necessary, also fun! There are so many Sharpies available now that were not available when I was in school myself. Even back in high school I loved planning and I had to improvise quite a bit because there weren’t as many options for embellishments. If I would’ve had this big tower of Sharpies back in the day, I would’ve loved it! There are a ton of colors available now and so many tips. If you are into pens, then you know that the tip is everything! My new favorite ones are these retractable pens. I love how they glide and I like how my handwriting comes out using them. You know how some pens make you write kind of look sloppy? Is that just me? Anyway, these are awesome. 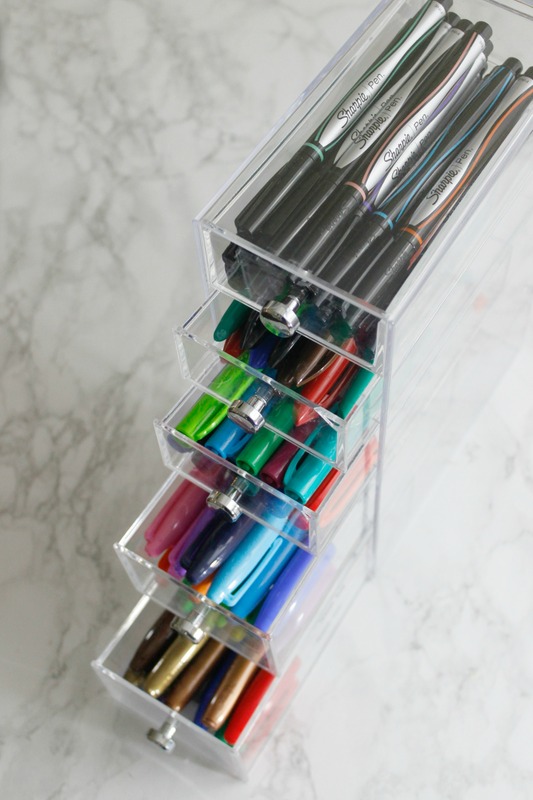 I also like these colorful fine tip ones to add little embellishments and to color-code the family. I use green for my husband, purple for my youngest and blue for my oldest. I like being able to glance at the page and know when something doesn’t directly pertain to me, although when you have kids you know that it ALL directly pertains to you somehow. I also add stickers for things like doctor appointments and birthdays. You know who else loves Sharpies? My 12-year-old. When he goes back to school after winter break, I take him to Staples to replenish his pen and marker collection and he loves starting off with new supplies. Remember how good it felt to go back to school with brand new items? 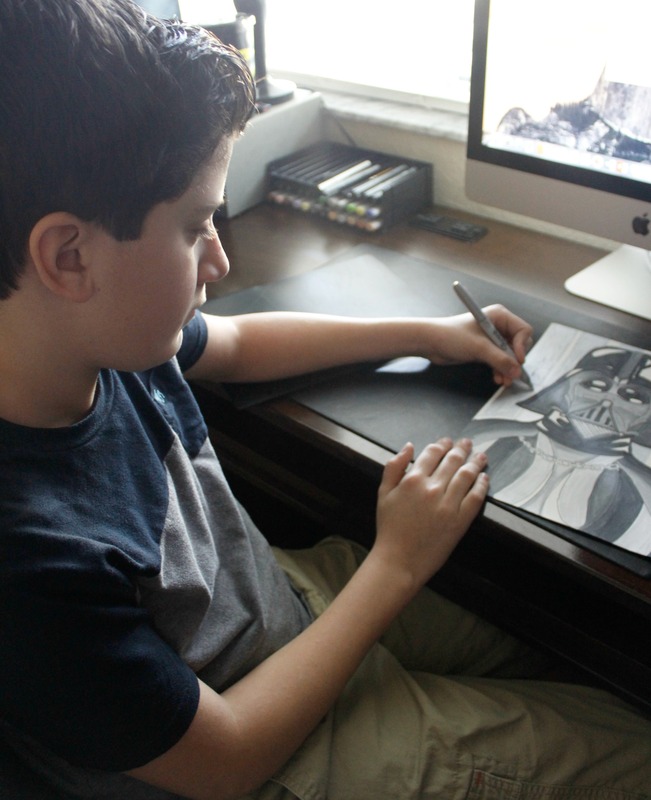 Anyway, he is my little artist and really gets into pens and markers like his mamma. 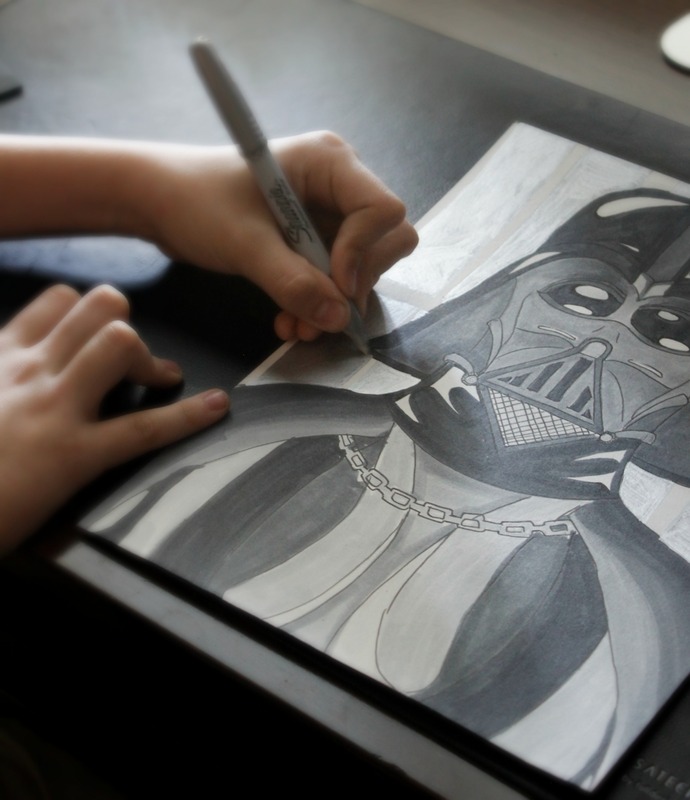 Unlike his mamma that can only draw daisies, here he is drawing Darth Vader. 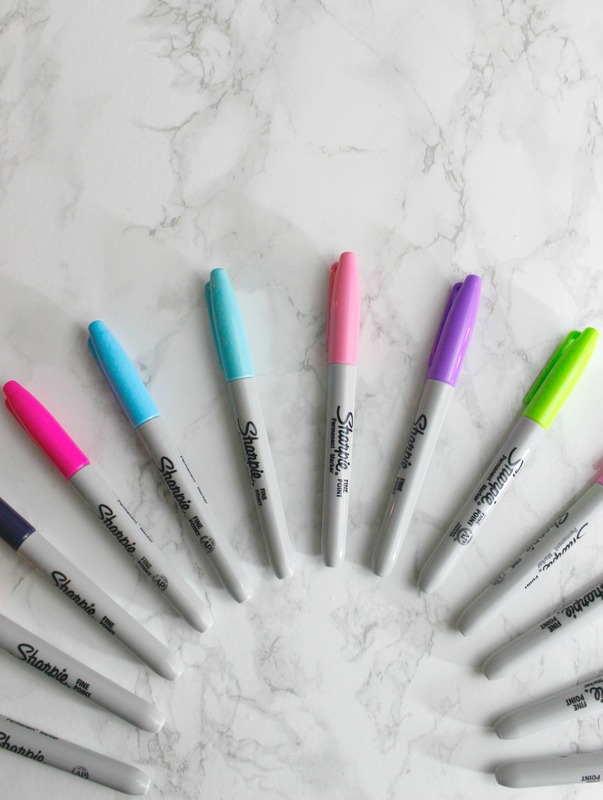 If you would like to try these Sharpies for yourself, especially that new retractable pen that I mentioned, Staples is running a sale this week! 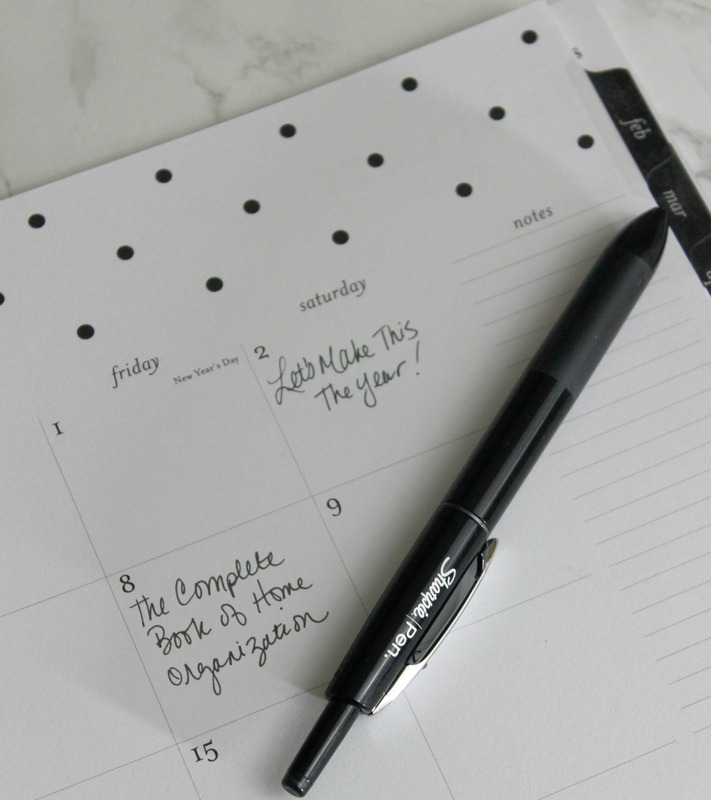 The entire week of January 24th save 35% off all regular priced Sharpie product, while supplies last! 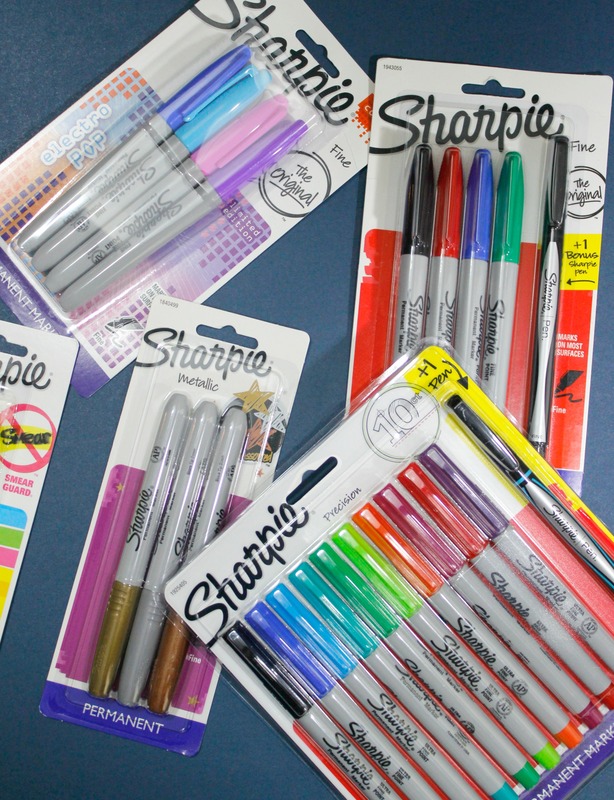 What is your favorite Sharpie? If on my way through the checkout line at a store, I see a magazine with the word “organization” on the cover, you better believe it will make it’s way into my cart. Organizing is a passion of mine and that’s why it’s also the main subject that I share about on Graceful Order. 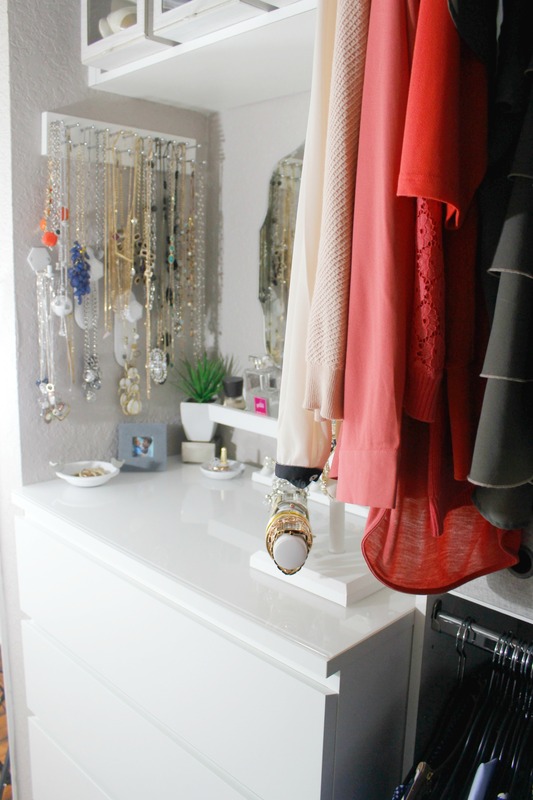 For me, organizing is therapeutic and living in an organized (not perfect) space, helps me relax and be more creative. 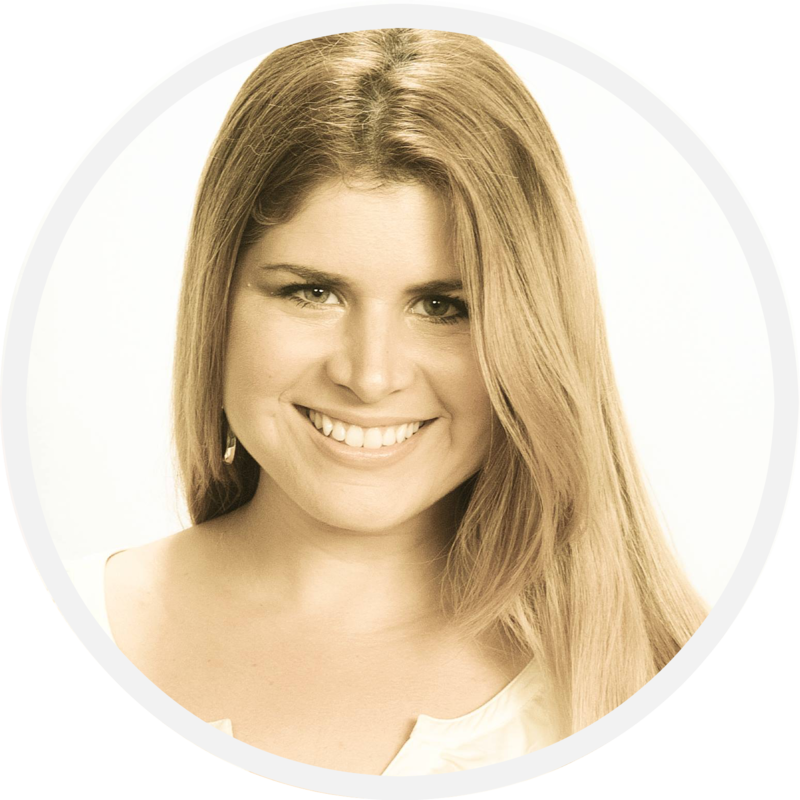 Before I started this blog, I had followed Toni from A Bowl Full of Lemons for years and I always loved her ideas and style. Since I started this blog almost 3 years ago, she has been an amazing friend in the blogging world, helping me any time I need it. 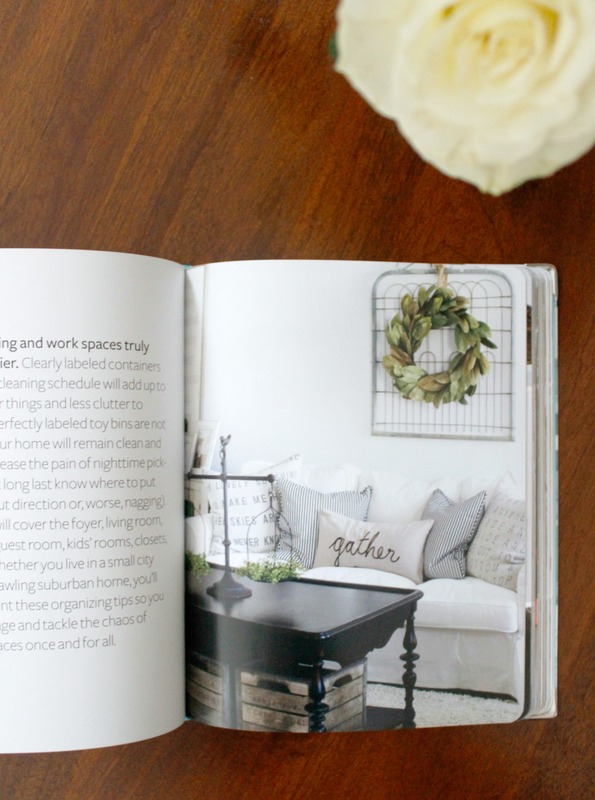 I love how beautiful her blog is and most of all, her passion for helping others live in a space they love, free of clutter. When Toni reached out to me last year to tell me that she was writing a book and to ask me if I would contribute one of my organized spaces for the book – Um hello, of course I said yes! I was so happy for her and I knew that the book would be awesome, even before seeing it. And then I saw it and it was even awesome-r than I expected. 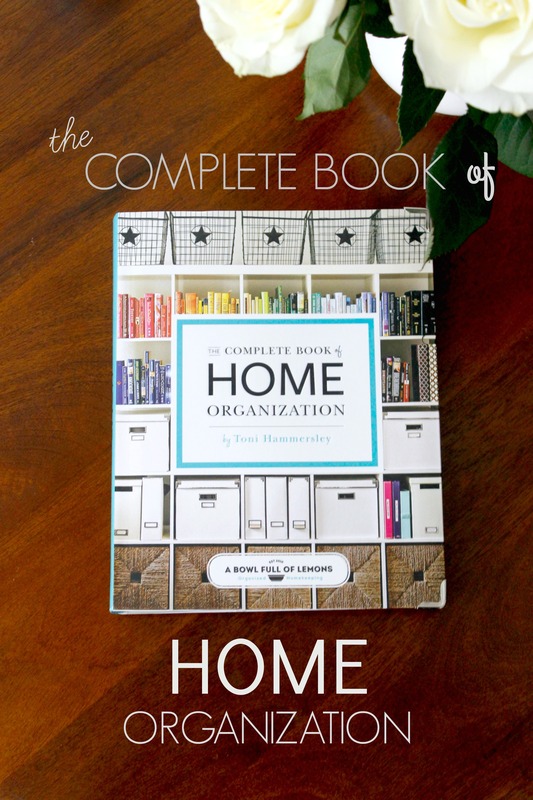 Here is “The Complete Book of Home Organization ” that finally launched this week! From following Toni’s blog, I knew the photography would be beautiful and the book didn’t disappoint. 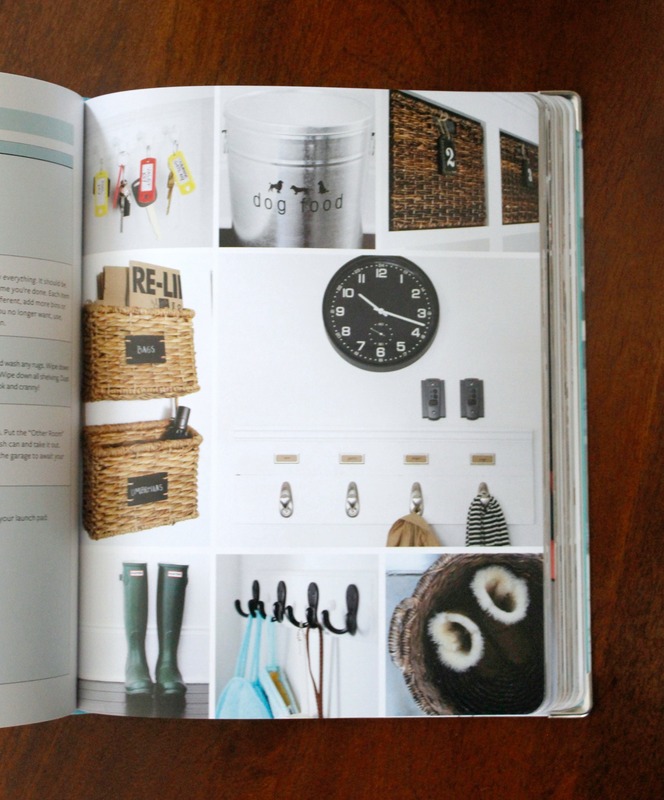 Most of the pictures in the book were taken by Toni herself and they feature many beautiful and organized spaces in her home! 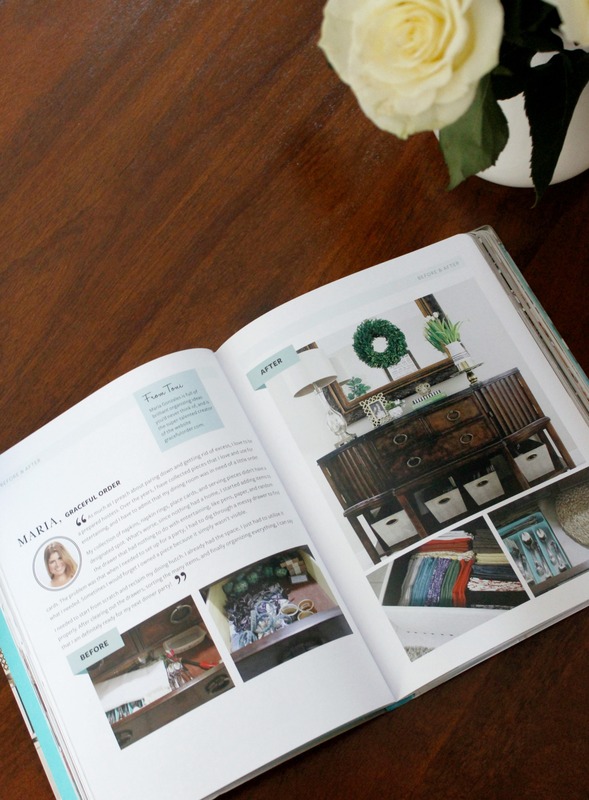 She also included a few sections where other organizing bloggers shared their best tips for keeping an organized home. 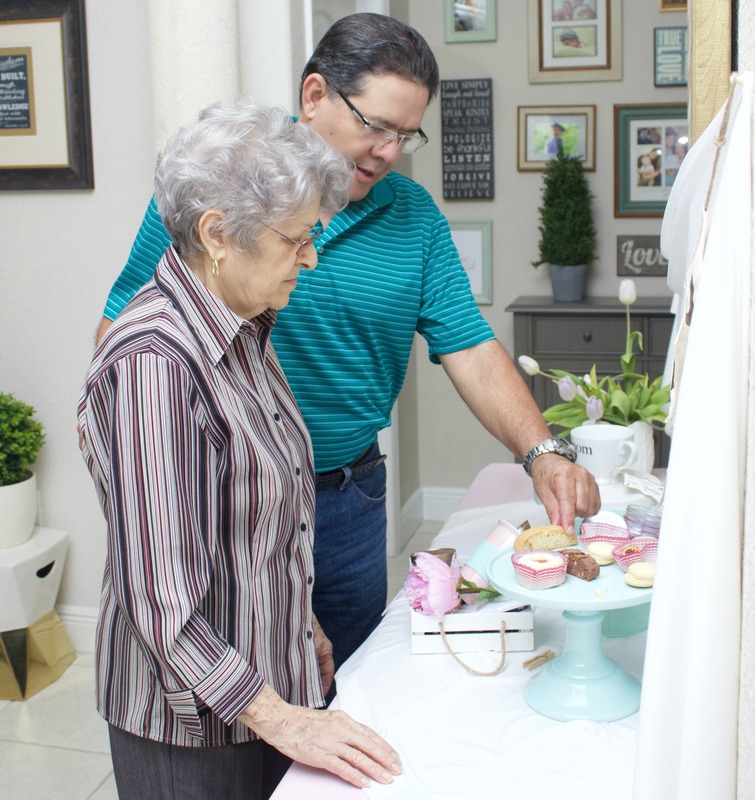 I shared about my dining room organization. 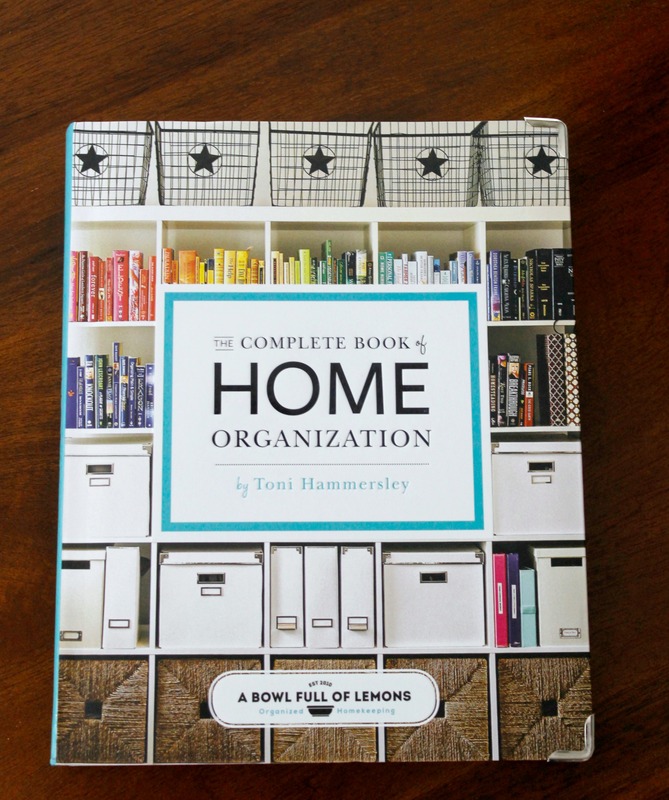 The book is not called “The Complete Book of Home Organization” for no reason. 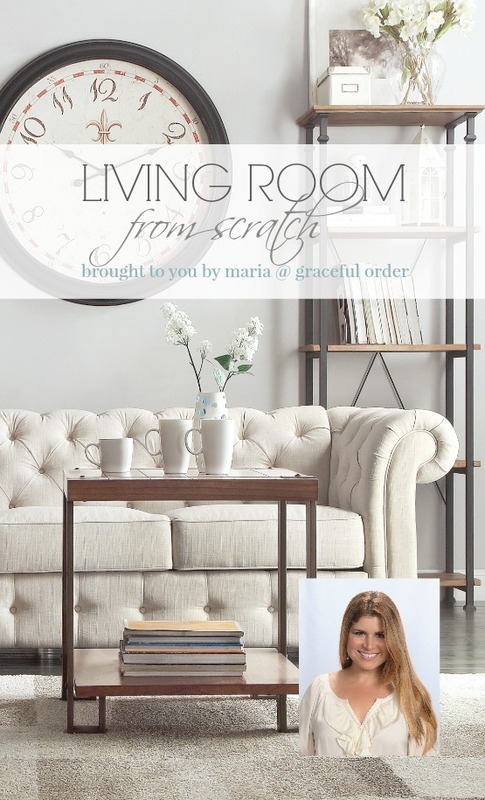 It truly is a comprehensive book, covering every area of the home. 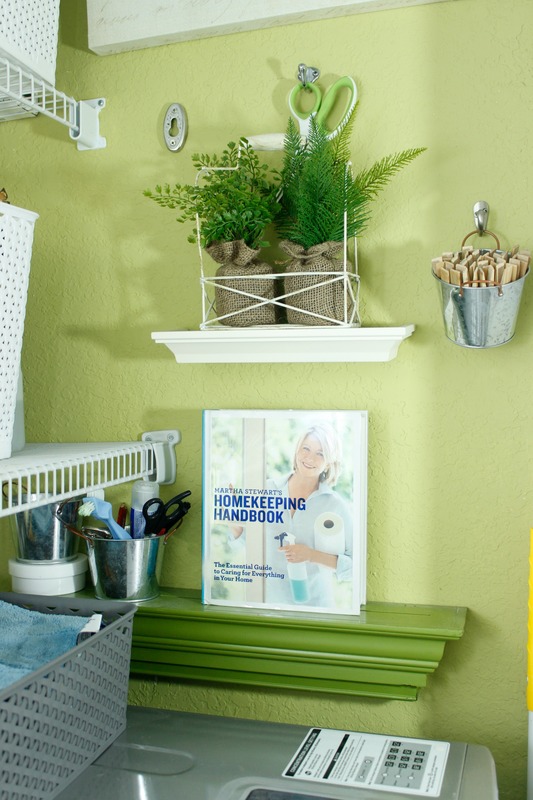 One of my favorite chapters is the one that covers organizing the entryway – so many ideas! If my friend had not written it, I would still have purchased this beautiful book and recommended it to all my friends. So I am personally recommending that you pick up a copy. I tell ya, I organize all the time, but I even need a little inspiration every now and then to kickstart my projects. The book is now available for purchase and you can find it here ! It is already a #1 release! An Amazon.com affiliate link has been added for your convenience. Thank you for your support of Graceful Order! 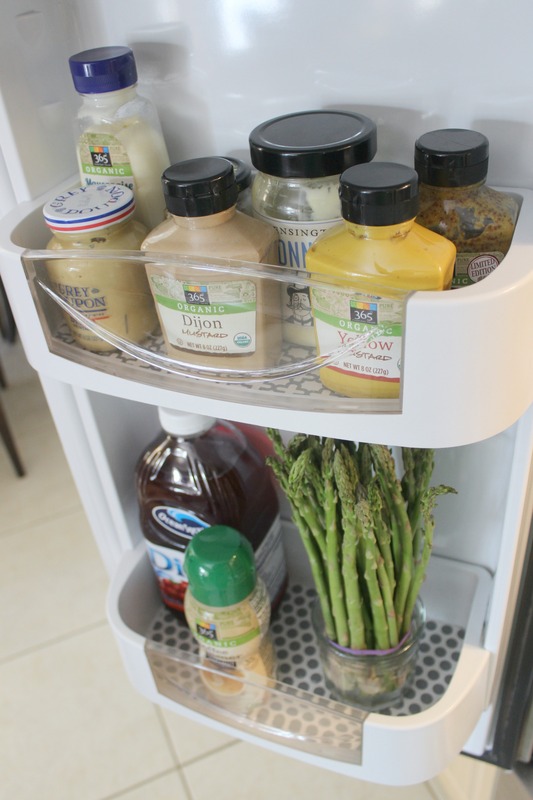 We are organizing the fridge…again. 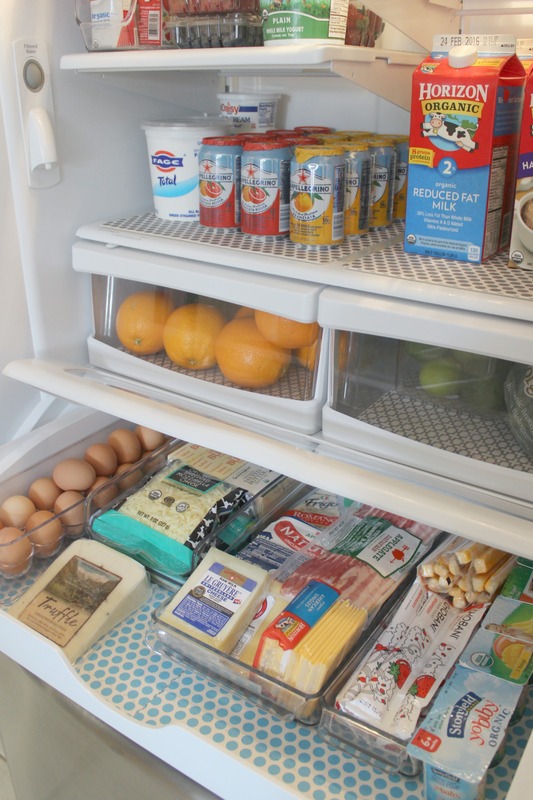 My fridge stays fairly organized until the holidays. During the holidays every system that I have in place goes out the window and the priority becomes making space for the ham or the casserole. This is how my fridge looked after hosting Thanksgiving, a Christmas Day brunch, a small New Year’s party and a New Year’s Day brunch. My fridge needed some love (and soap!). The picture below was taken at night so the lighting is horrible. I wasn’t intentionally trying to make the before pic look bad. Totally off-topic, but isn’t it funny how people always have to look miserable in those before pics before they start a diet? They are never smiling. Can’t they also be happy pre-diet? So the next morning I decided to empty my fridge and give it a good clean. I spot clean the fridge all the time, but sometimes deep cleaning is necessary, and this was one of those times. 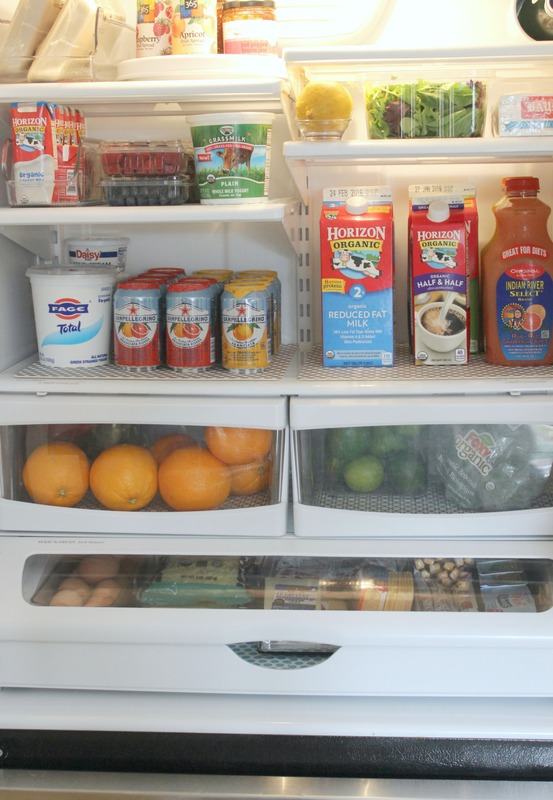 Almost all the drawers, bins and shelves in my refrigerator are removable and they are easy to clean. I am always surprised how much food falls through the back of the bins in between cleanings. 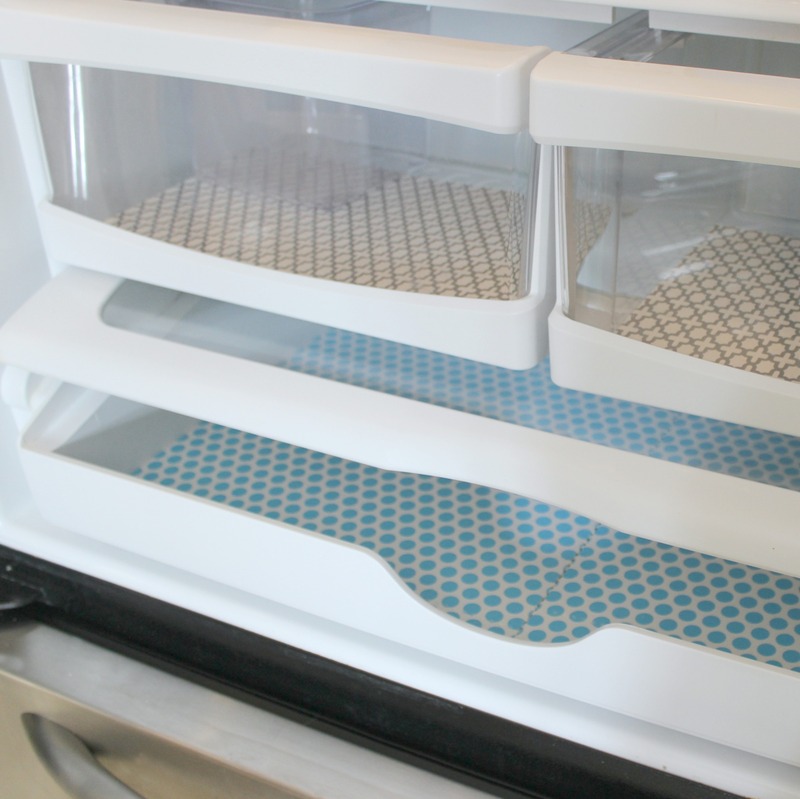 Once the refrigerator was clean, I added some FridgeCoasters to line every bin and shelf. 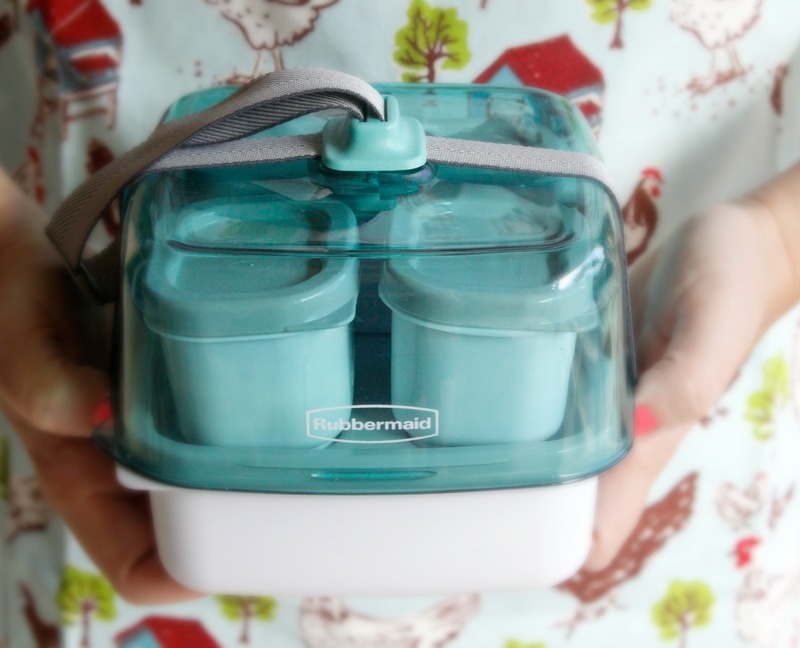 I have been purchasing these for years and they really help to keep the fridge clean from spills and (almost more importantly) they are so cute! I change them out every year and chose a new color. This year I ordered 2 different colors (gray and blue) and I think I will do that from now on because I love how they look! Note: There is a FridgeCoaster giveaway and discount code at the end of this post! 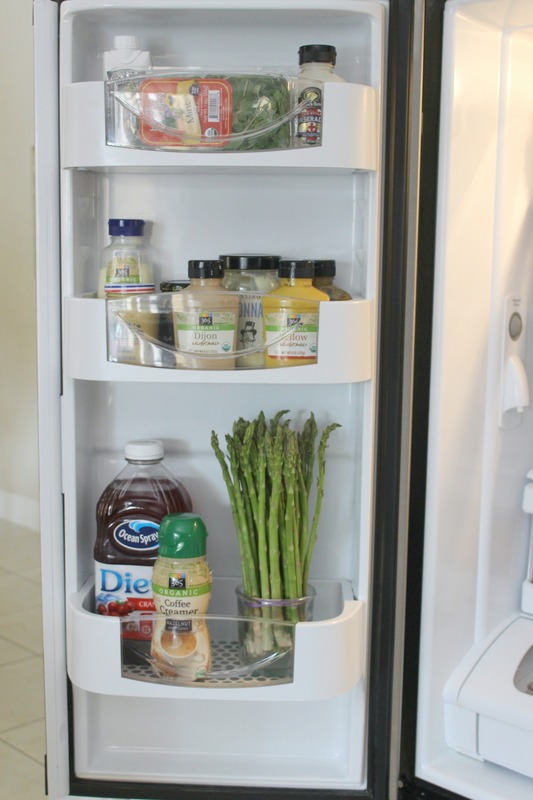 When the fridge is empty is a great opportunity to move the shelves (if adjustable) to the best positioning for the items that you purchase. So many times we leave things the way that the manufacturer placed them, instead of taking advantage of the adjustable shelving. Once the shelves are where I want them, I add all the food back. I had not shopped for our regular food items for a few weeks, since I was making space for all the food I needed during the holidays. I also added fridge bins to my deli drawer. I am a big fan of these bins but only for the items that you purchase again and again. 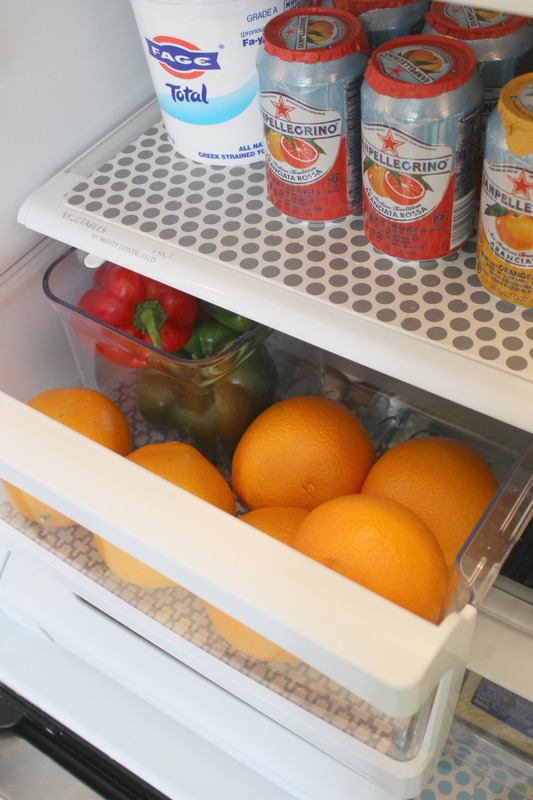 They have some that are perfect for placing little juice boxes, but if you rarely buy those for your kids, then it will be another bin taking up space in your fridge. Only buy the ones that will be used every time. I did get rid of a few condiments that were expired and I tried to put back the good ones into the fridge with like items. Fun fact – I don’t even like mustard. I do use it for cooking sometimes but my husband is a mustard fan and apparently he has enough to last for the rest of 2016. One thing that I purchase frequently is asparagus. I always keep a wide-mouth cup with a little water to store it and it seems to last longer. Also, I like that I see it and it doesn’t get lost in the crisper bin until it’s past it’s time. This refrigerator model originally came with 2 bins on this side and a butter bin (the one with the little retractable door). I eventually got rid of that butter bin since I prefer to keep my butter in the deli drawer and I ordered another regular-sized bin online. There are a few websites that you can input your appliance model/serial number and then choose what you would like to purchase. In this case, I added the top bin that I use for chicken stock cartons. Another shot of this organized fridge so that I can at least document that once upon a time all the cans faced forward. I know that not everyone keeps oranges in the refrigerator but since I often juice them, I like to keep them cold. Also, I keep a bin within the drawer to separate items. Otherwise, everything in that big drawer ends up mixed. Also, this keeps produce from getting damaged by heavier items. I have a fridge bin in the very top dedicated to defrosting meat. This will avoid so many yucky spills! Next to it, I have a small turntable that I place all my jellies and jams. 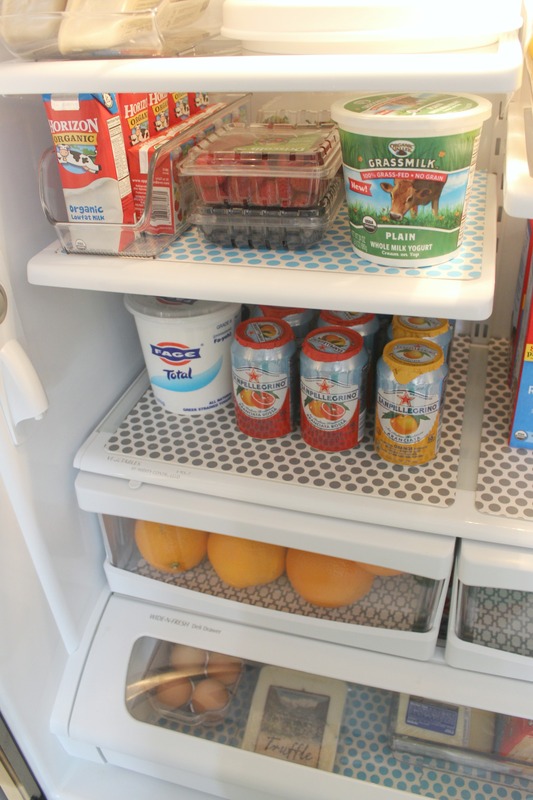 You know that I am a big fan of turntables and they are even great for the refrigerator. Here is a closeup of the deli drawer. There is so much butter and cheese that was left over from the holidays! I can’t possibly consume that much leftover cheese? Just kidding. I can and I will. Then I will go on a diet, but not before taking a before picture with a miserable look on my face. One more exciting detail…a giveaway! 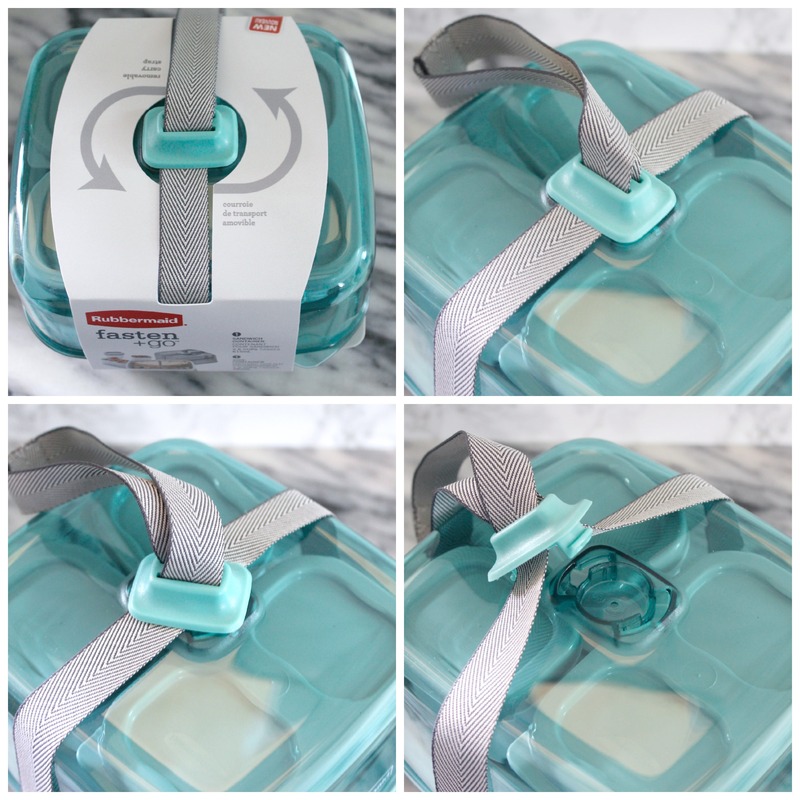 FridgeCoaster will be giving two winners – two Fridge Packs of their choice! Follow the prompts to be entered into the giveaway. You do not have to complete all the prompts to enter the giveaway, but each one will better your chances of winning, since you will have more entries. So no worries if you don’t have an Instagram or Pinterest account, you can still enter by leaving a comment. If you want to order them for your fridge, they have also generated a special discount code for all Graceful Order readers – just enter SWEET16 at checkout and save 16% off your order! Let’s make this the year that we get organized. Not just organized, but simplified. Let’s finally get rid of all that clutter and unnecessary items, that are filling up our homes and leaving us little breathing room. Just organizing is not always the answer, because sometimes we are organizing junk, instead of discarding it. Maybe what’s excess or unnecessary for you, is necessary to someone else – let’s donate. I have to confess that while organizing is my strength, purging is my weakness. I tend to keep items, especially sentimental ones, way longer than I should. I am working on this. I am trying to practice what I preach. I don’t think I will ever be a minimalist, but I don’t want to hold on to things that I am not using and probably never will. 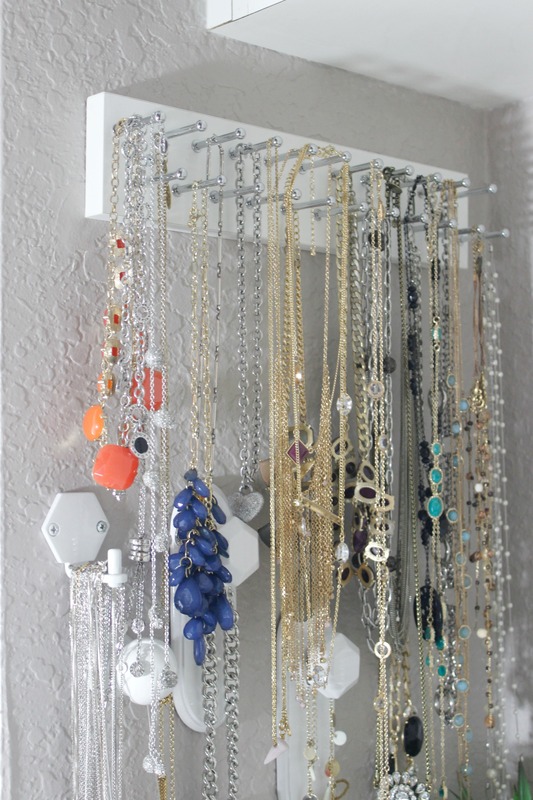 Just imagine your whole house organized, everything has a home, nothing is out-of-place. Doesn’t that give you a feeling of peace? Granted, I have never lived in the utopia that I just described, but I am just stating that to show the connection between organization and peace. Mess begets mess and that brings about feelings of despair and hopelessness. Order begets order and that brings about feeling of peace and optimism. At least that’s what it does for me. So join me in the challenges that I will share with you this year and know that YOU CAN DO IT! 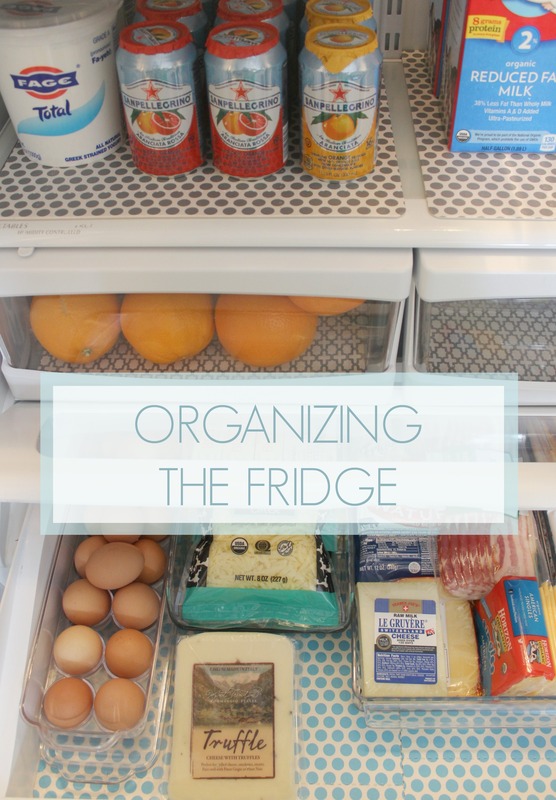 Organizing is not overwhelming if you take it one step at a time. Let’s do it! Let’s make this the year! Hard to believe that we are already reflecting back on 2015. When I was a little girl, years seemed to pass by much slower and I wanted time to speed up. It’s quite the contrary now, but I know that reflection is good and new beginnings are around the corner. But not before we take a little stroll past the favorite posts from 2015. I compiled this list either by the amount of times that the post was accessed, the amount of shares on social media, or the amount of comments from all of you. 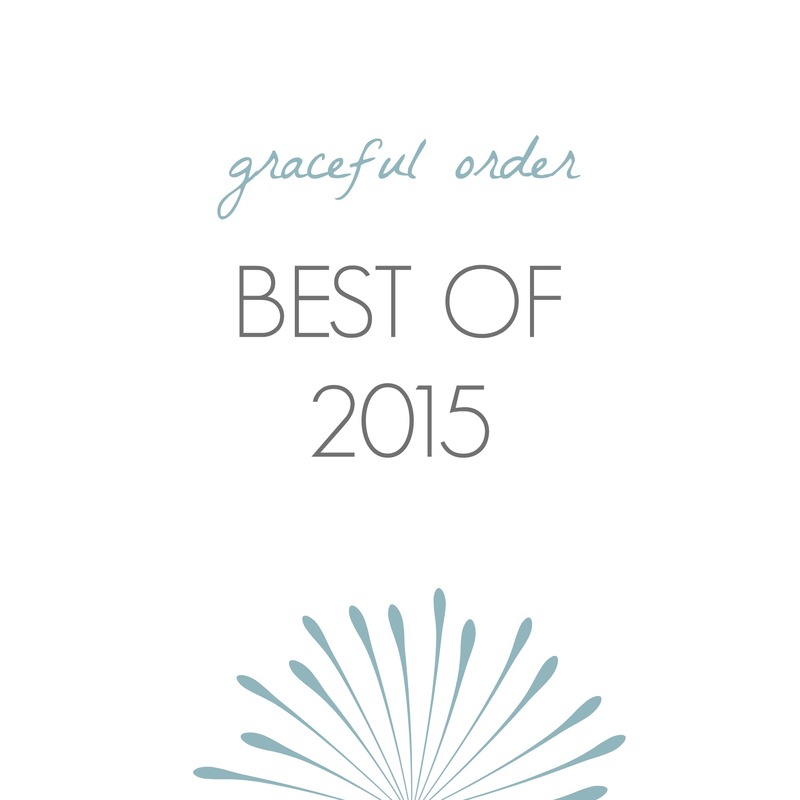 Please know that I value your opinions and comments and I am careful to take them all into account – basically this is your list of the best of 2015 for Graceful Order. 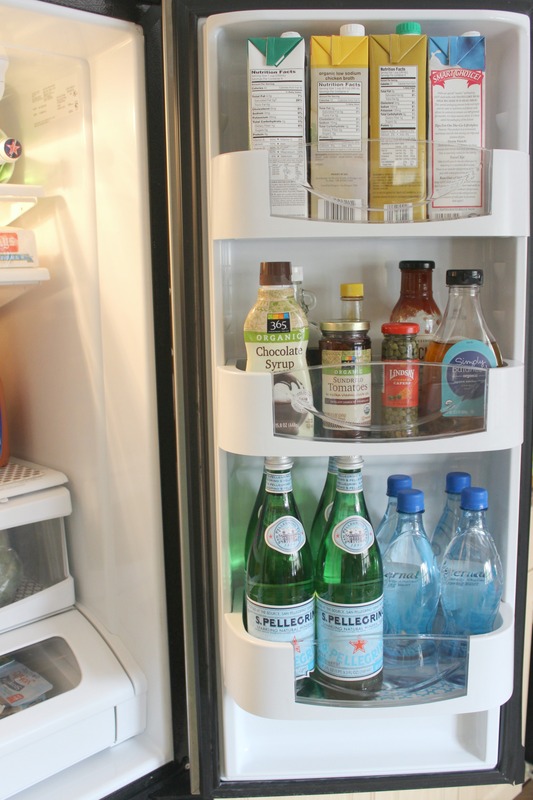 I started the year with my Refrigerator Organization and that was both popular and a little controversial. 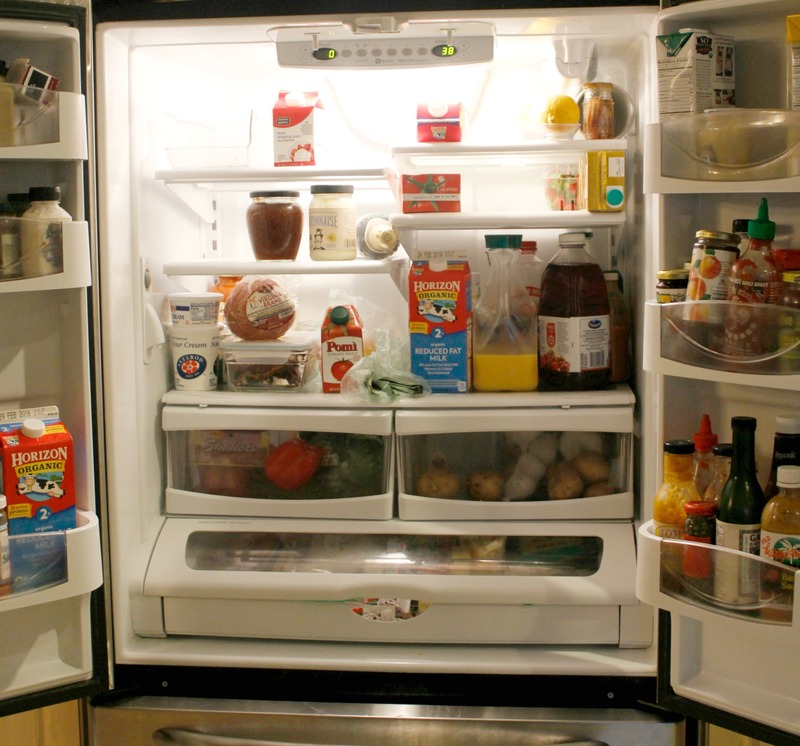 Yup, I have a controversial fridge. Who knew? I had an equal amount of comments saying that you all loved the “after” pictures, and others that wondered why in the world I store potatoes and onions in the fridge. Basically, when I have the counter space, I keep them there and I know that is the best spot. 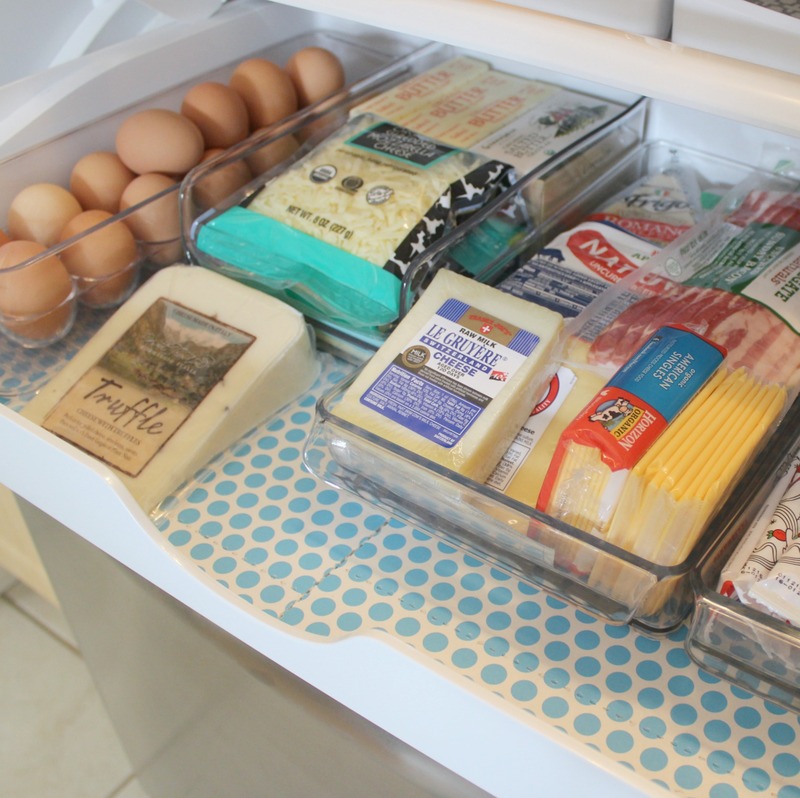 When My counters are full, I place them in the fridge and have never had an issue with it. 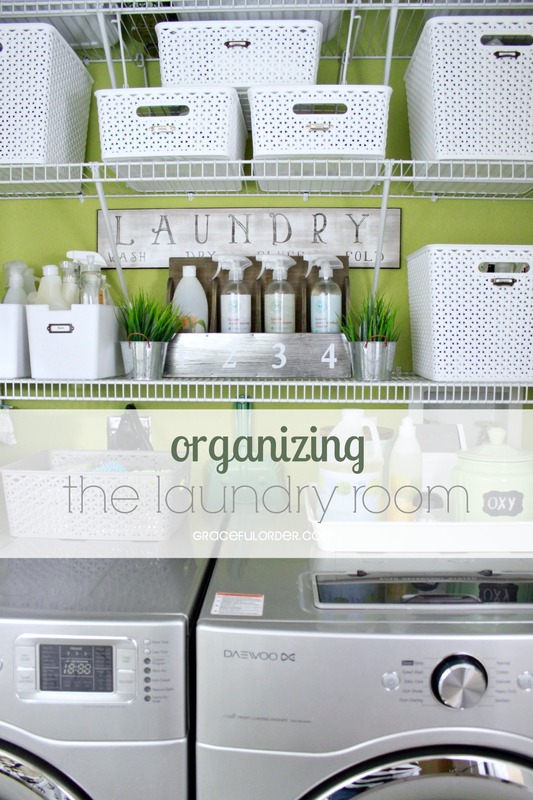 Organizing the laundry room was one of the favorite posts of the year and one of my favorites to put together. My laundry closet is such a happy spot and full of storage and function. 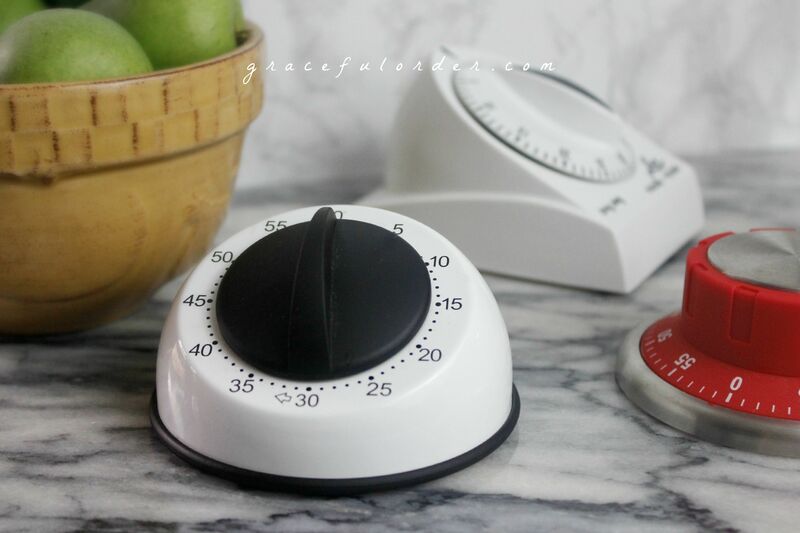 My Favorite Kitchen Gadget post became more popular heading into the holiday season, than when I first published it. 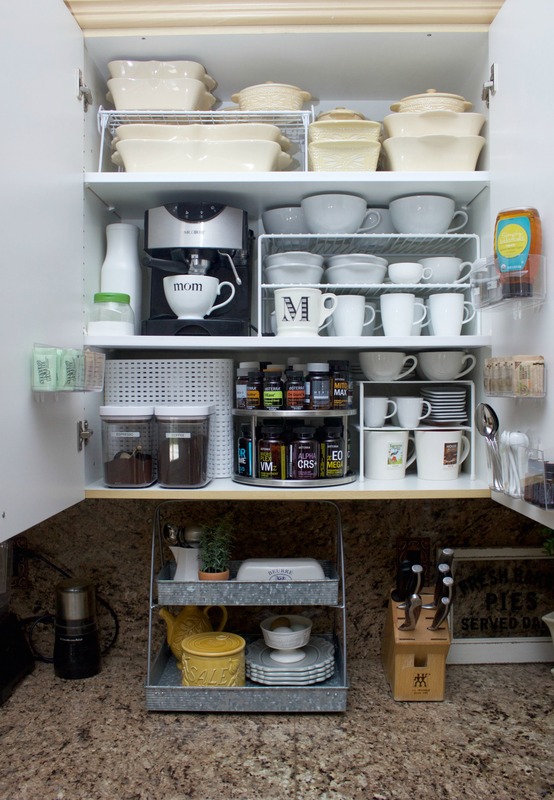 Everyone starts to stock up their kitchen and with so many options, we all wonder what gadgets work, and which just take up valuable drawer space. 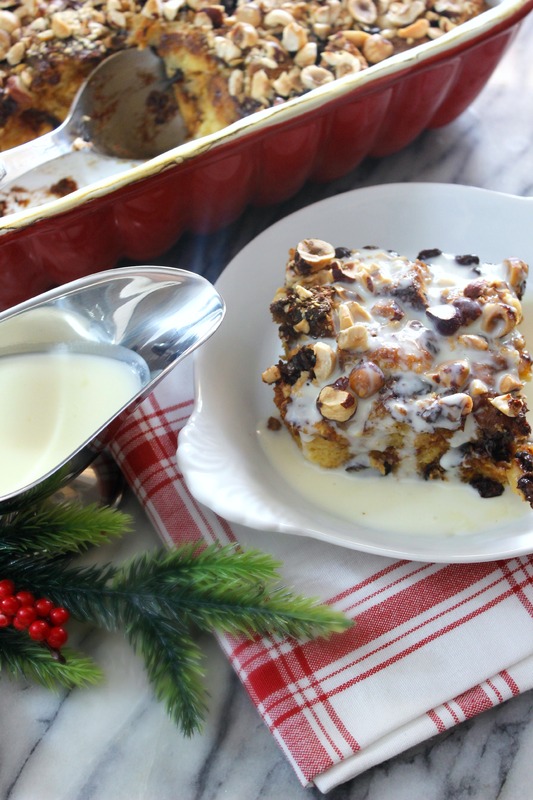 I did a few more food posts than I had in past years, and none was more popular than this panettone bread pudding. 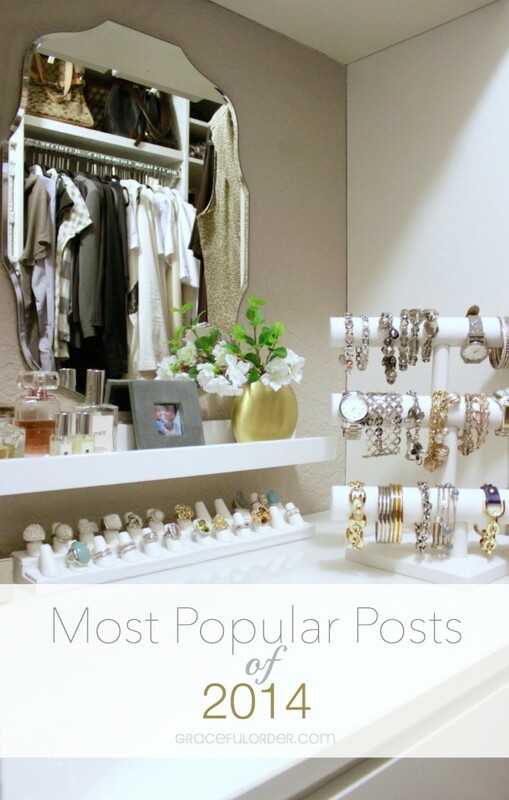 It was pinned quite a bit in December and as you can see, it is perfect for the holidays! 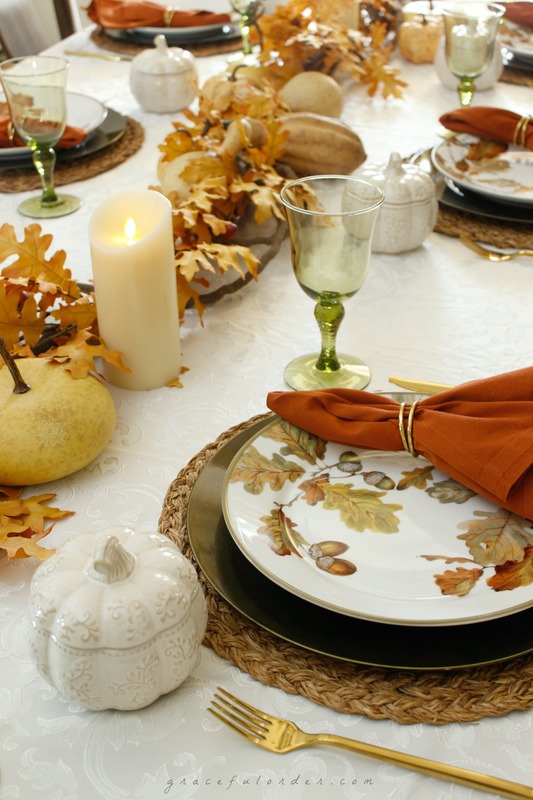 The most pinned post during the holidays (especially Thanksgiving) was the one that detailed how to set a proper table setting. Rarely do I set a table full of different utensils but I think it’s good to know how to do it, just in case queen comes over for tea. You never know. Those were the top five posts of the year! I can’t wait to start sharing new ideas next year (next week!) 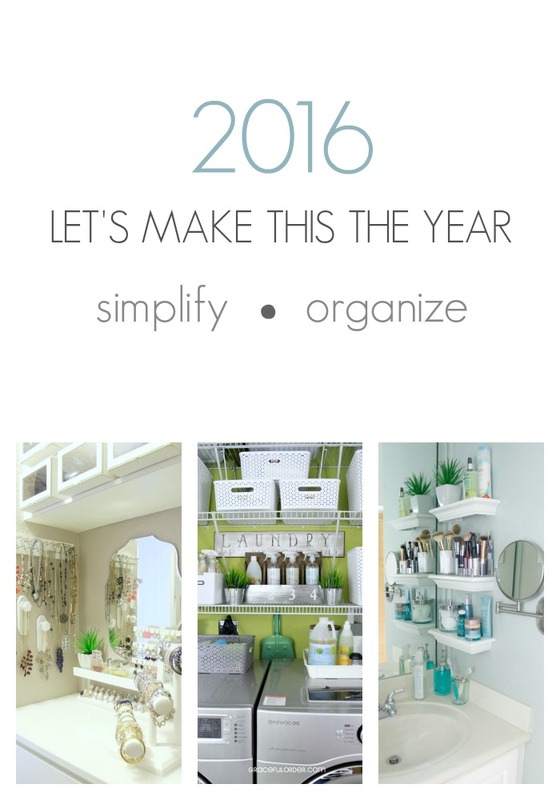 and to start the year with a new organizing challenge! Fresh year, fresh ideas, fresh home! That’s my motto next year. How would you describe your 2015? Was it a year of changes, new beginnings, surprises? Thank you for your support of Graceful Order – I value every comment, every share, every “like”… I am thankful for all of you! I have been absent this past week and I missed you! Last week, everyone in my house came down with a stomach bug and it all started with my youngest. We thought it was an isolated incident and then a day later my other son started with the same symptoms, then my husband and last but not least – moi. I was already feeling like I was falling behind on so many things, but the flu doesn’t care about to-do lists and Christmas. The flu is heartless. I didn’t want this week to end without wishing you all the best holidays ever! In a few days we will have our home full of family and friends and we will be hosting our usual Christmas breakfast. I already went grocery shopping and the table is set. I just have to pace myself with the cooking and the prep work, and of course I have to clean the house. I never give the house a thorough cleaning before Christmas, I just keep it relatively clean and I focus on the bathrooms and the areas that guests will be using. After Christmas, when the tree comes down, that’s when I will break out the cleaning gloves. I did want to share with you one more thing before I take a little Christmas break, and that is my table setting for the breakfast. Below is a picture taken from my living room, which leads to the dining room. 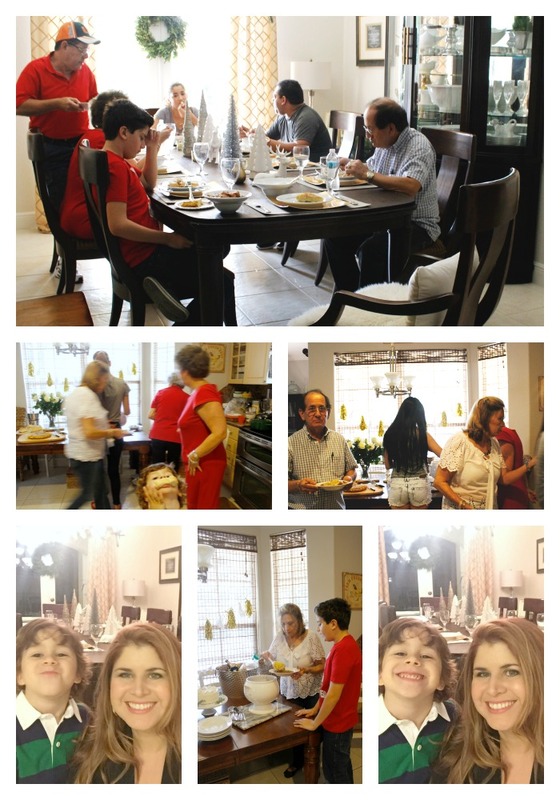 I do enjoy having a formal dining room, although our daily meals are always around our kitchen table. 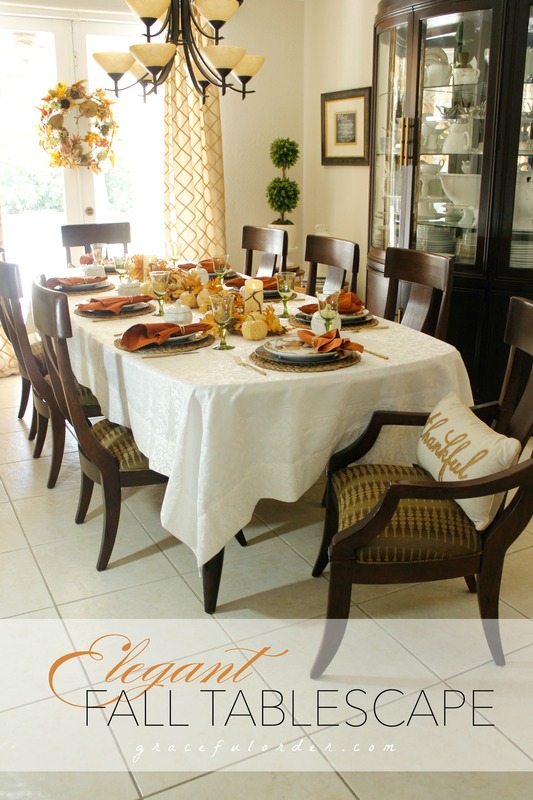 The living room is always decorated in a pretty neutral palette and I like to use the same colors in the dining room. This year it was gold, green and white. The little deer are from Target and I purchased them last year. I collect napkin rings and napkins but I rarely buy any holiday-specific ones so that I can use them year-round. Plus, all these items take up space and it’s not worth it to me if I can only use them once a year. As always, I like to bring in another texture and this really casual, woven placemat does the trick. The centerpiece was not really a centerpiece at all. 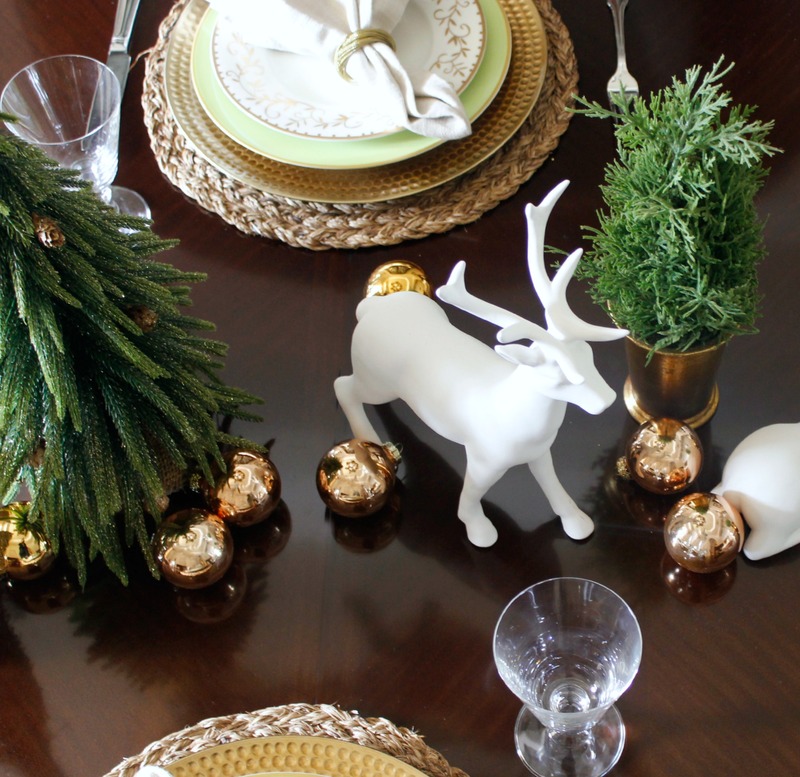 I placed little trees (none truly matched the other) along the center of the table, the deer as if walking through the table and finally, a set of ball ornaments in rose gold scattered throughout. This year I had an extra garland (the one I usually use in the buffet) and I placed it on the lamp. I didn’t have to secure it, as the curves hug the garland in place. It’s funny because I was walking around the house looking for a place to use the garland so that I wouldn’t have to store it back in the garage. #ResourcefulAndLazy I liked how it turned out so much that I may do this every year. 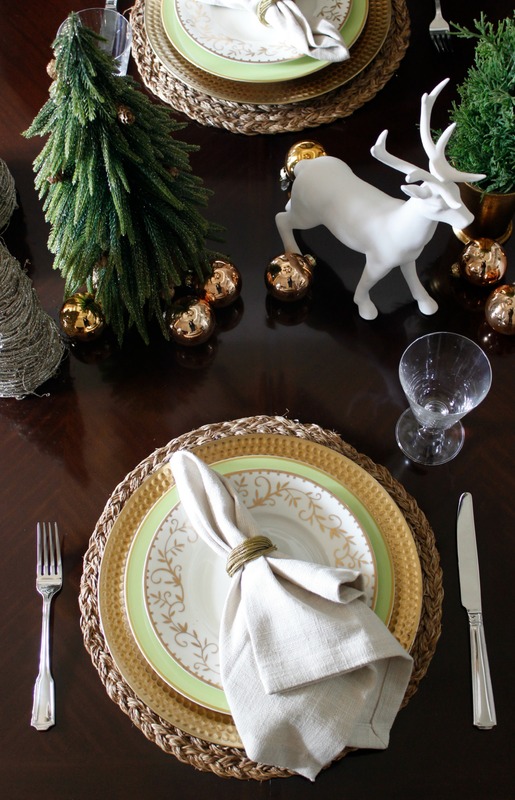 I hope you enjoyed all the tablescapes that I shared this year. I really enjoyed putting them together and sharing them with you. I hope that we all feel well in time for Christmas day! Enjoy every minute, my friends! 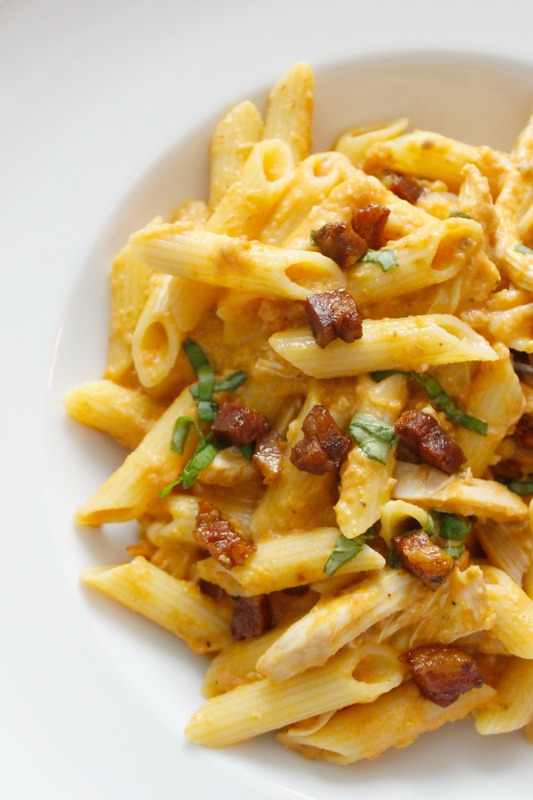 You know how sometimes you see a recipe on TV and just by hearing the ingredients, you think “That has to be good!” That’s exactly what happened to me when I heard chef Chef Joe Realmuto, of Nick and Toni’s restaurant give out the recipe for his penne alla vodka. Of course, the recipe he shared had to be scaled-down considerably from what he makes in the actual restaurant. The first time that I make any recipe, I follow the instructions to a tee. Then after tasting, I look for ways to modify the recipe to either make it better or better for me. 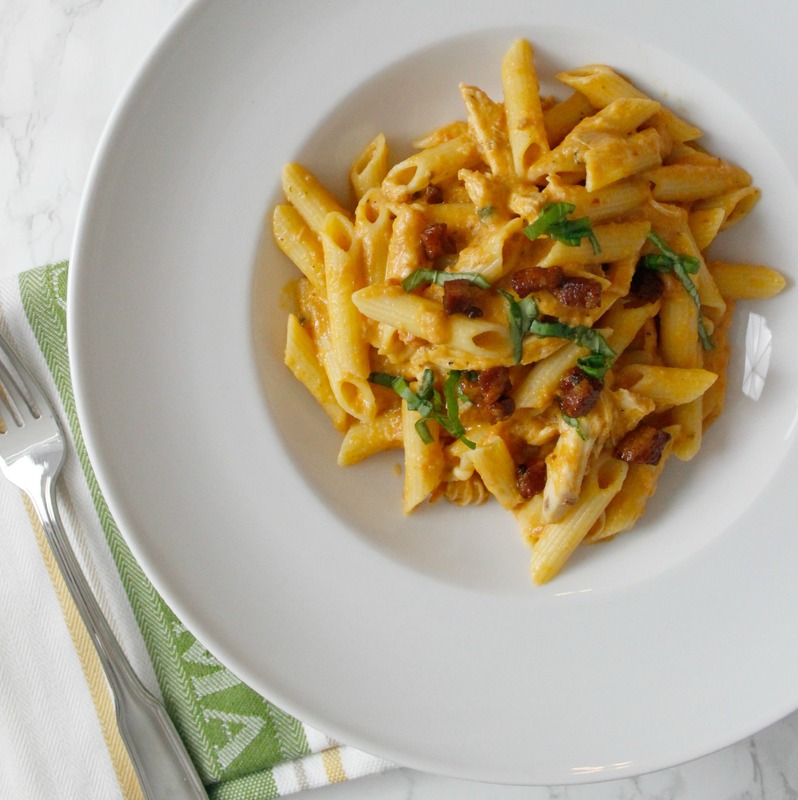 Some recipes need very little tweaking, such as this one – it really is my favorite penne alla vodka. I did make a few adjustments like using gluten free pasta, less spice than it calls for, half the amount of heavy cream, I added fresh basil instead of fresh oregano, and I added chicken to make it more of a complete meal. This recipe has a few decadent touches (the cream and pancetta) but both in small amounts. The secret to this pasta is how long the sauce cooks in the oven before it is added to the pasta. It is an easy pasta to make but granted, the oven cook time makes it more time consuming – I do promise it is worth it. 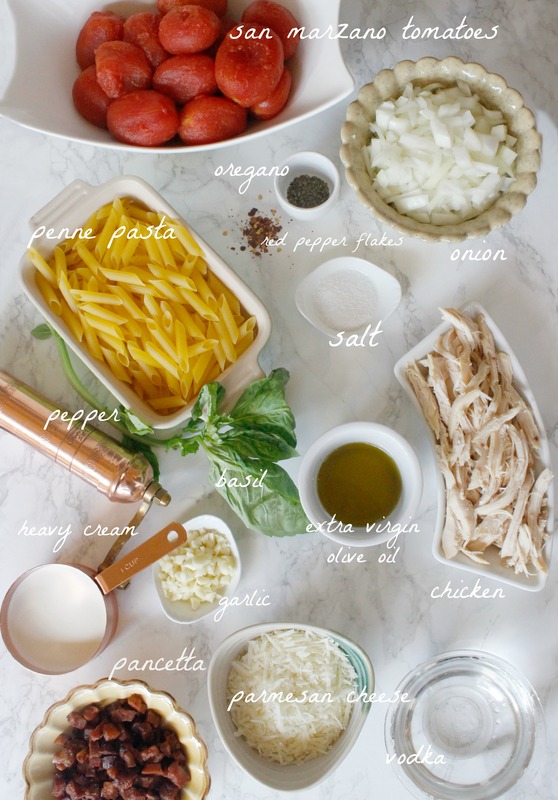 Here are the ingredients that I used for this pasta. I added chicken to make it a full meal, although this can stand on it’s own, even without the chicken, because it is so flavorful and hearty. Best of all, it is homemade and full of fresh ingredients. 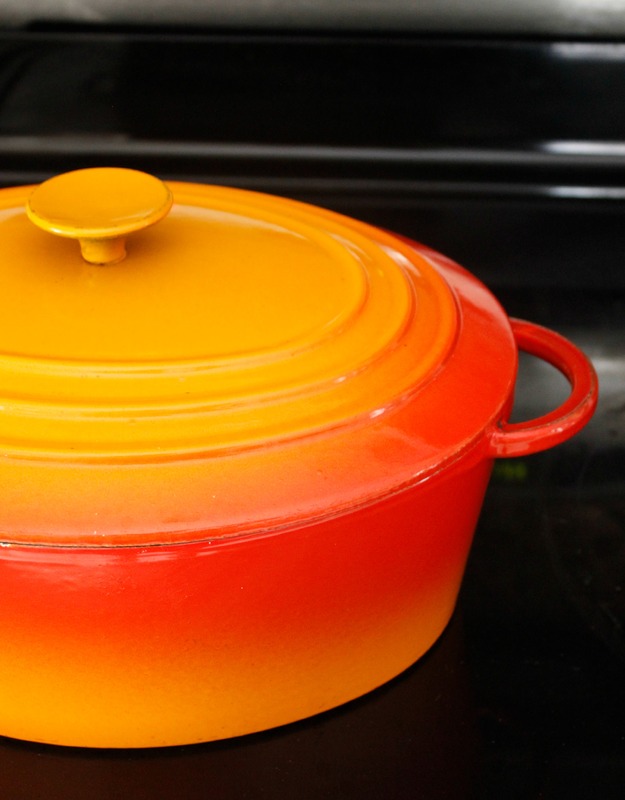 Set the oven at 375 degrees F. Find a sauté pan that has a lid that can later go in the oven. Heat the olive oil inside the pan and add the onions and the garlic until translucent. Then add the dried oregano and the pepper flakes. Continue to cook for 2 minutes. Add the vodka to the pan and allow to cook down by half for a few minutes. Note: Whenever you add alcohol to a pan, be very careful and do it away from the burner. Put on an apron and a face shield (kidding about that last part, kinda). 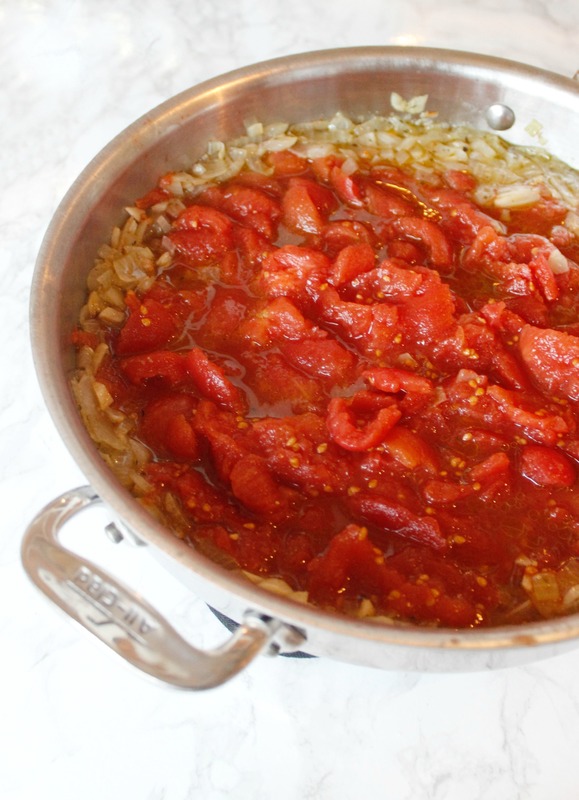 Drain the 2 28oz cans of San Marzano tomatoes and reserve the liquid for another recipe. Then add the whole tomatoes to the pan, crushing them in your hand one by one. I have seen Martha Stewart use kitchen shears to break up whole tomatoes, but it’s not as fun. Add 2 teaspoons of salt and a pinch of pepper. Cover the pan and place inside the oven for an hour and a half. Carefully remove the pan from the oven (don’t forget that the handle is hot) and allow to cool while you are cooking the penne pasta. The sauce will already look delicious. I use an immersion blender to blend this sauce but a blender or a food processor is recommended. Return the sauce to the pan once pureed. Cook your pasta following the package instructions until it is al dente. Then add 1/2 cup of cream to the sauce. They recommend a full cup, but I cut back and it was still fine. It is totally up to you how much you add as long as it’s a cup or less, so that you don’t dilute all the flavor that you have built up. Taste for seasonings and if needed, add another pinch of salt and pepper. Simmer for another 5 minutes. Your sauce is ready! 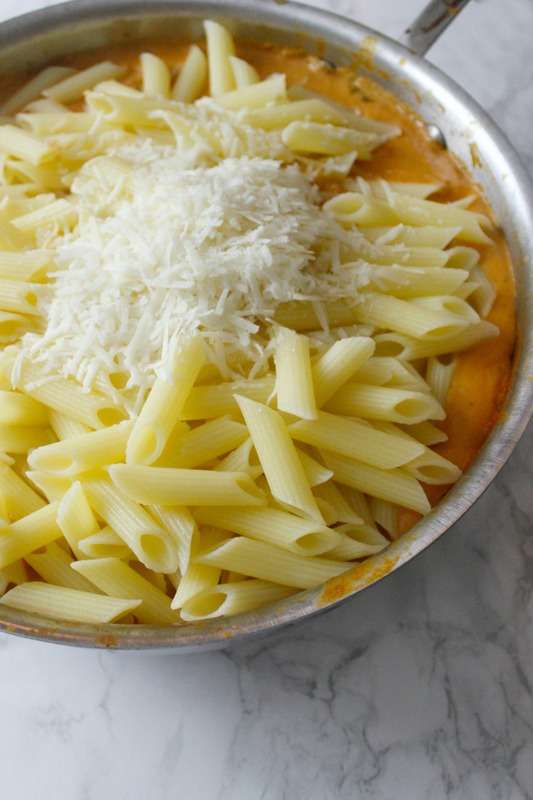 Add the pasta to your pan and 1/4 cup of parmesan and stir. Add the chicken and a few pieces of the pancetta (optional) and simmer for another couple of minutes. Voila! It is just as delicious as it looks. 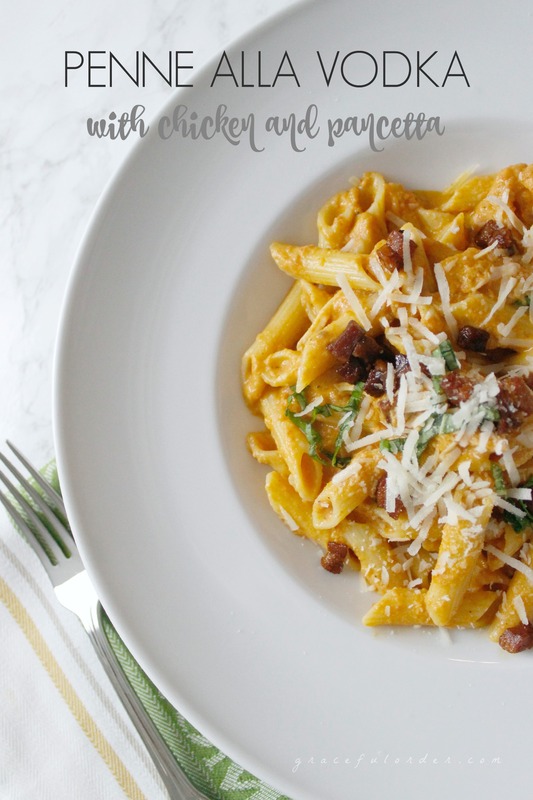 There is not a lot of pancetta in this dish, not a lot of cream, not a lot of cheese, but you can totally get away with it because the sauce is so flavorful after cooking in the oven. There is always a way to cut back the most decadent dishes without completely substituting the ingredients – roasting and allowing flavors to develop make it so that this recipe needs very little else to taste amazing. I think it deserves a close-up. Add a little extra parm if you want…and who doesn’t want? 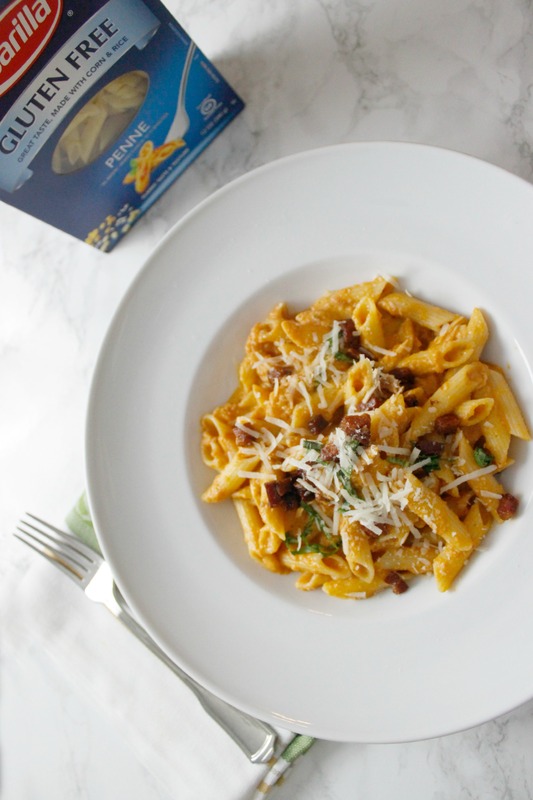 For more Barilla Gluten Free recipe ideas, check out their Pinterest account that shares new recipes all the time! One more thing! I purchased this pasta at my local BJ’s Wholesale Club. 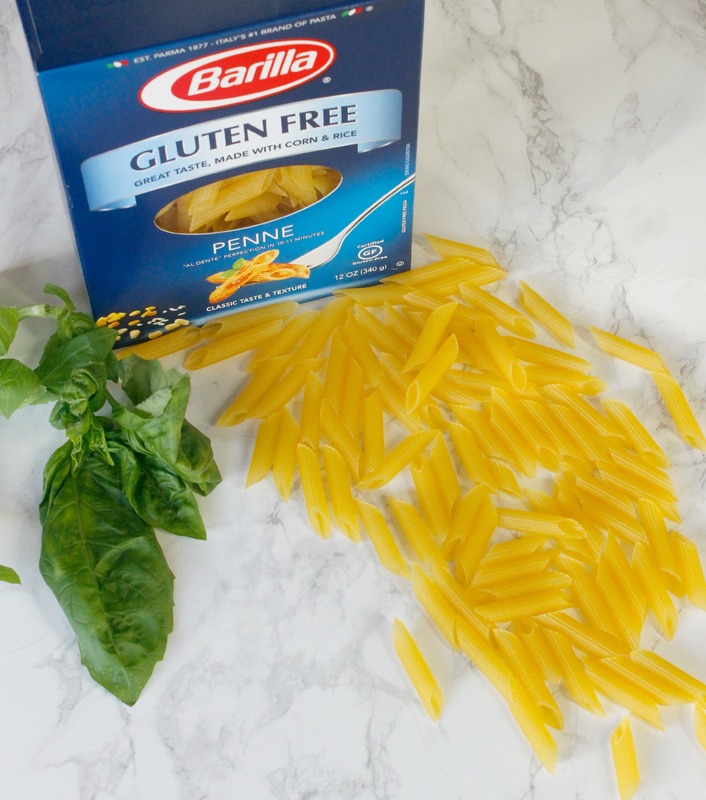 Visit BJ’s Wholesale Clubs on December 22nd and 23rd to see an in-store Barilla Gluten Free pasta demo at select clubs. 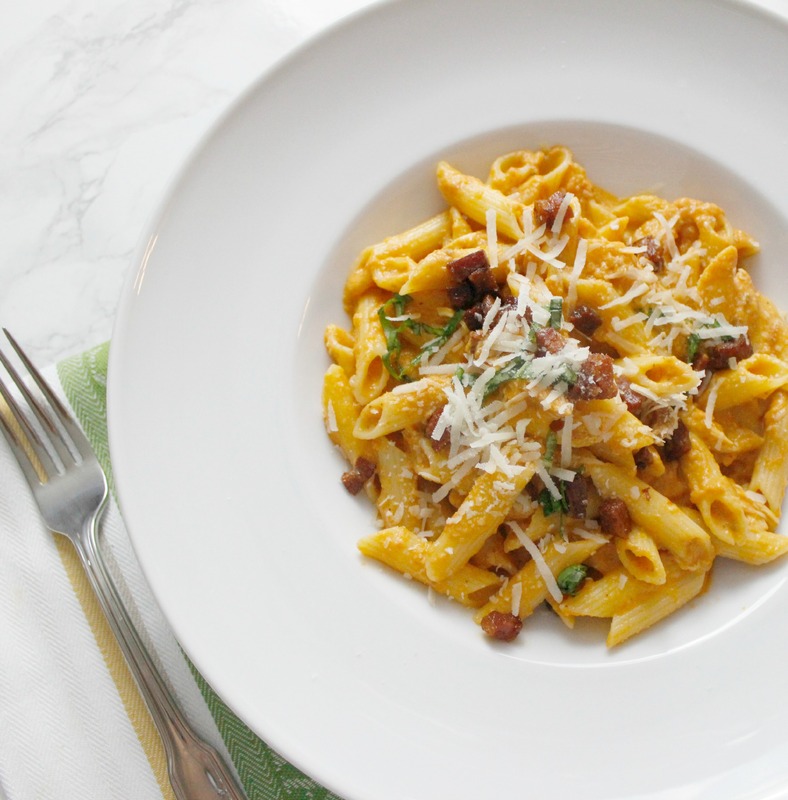 For more awesome ideas and pasta dishes, check out the delicious options below! Don’t they look amazing? I think this is one of the most beautiful and elegant desserts I know of. It is perfect for Valentine’s Day, if you make it in the heart mold, in the holidays because of its vibrant red color, or simply when friends are coming over for a casual dinner. 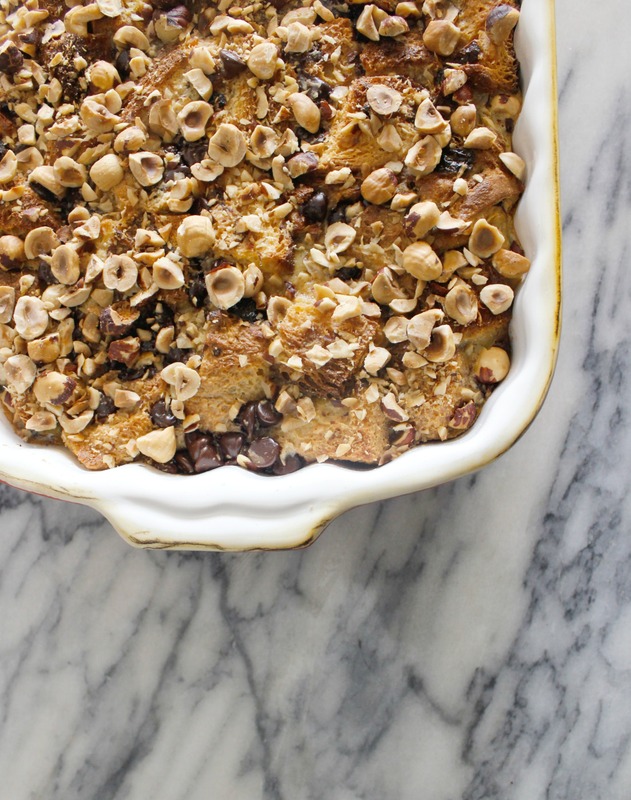 I first saw this recipe when Ina Garten made it on her show (that woman has skills!). After we visited France 2 years ago, I started making all sorts of french food which surprisingly is pretty simple to make – at least the dishes I attempt to make are. 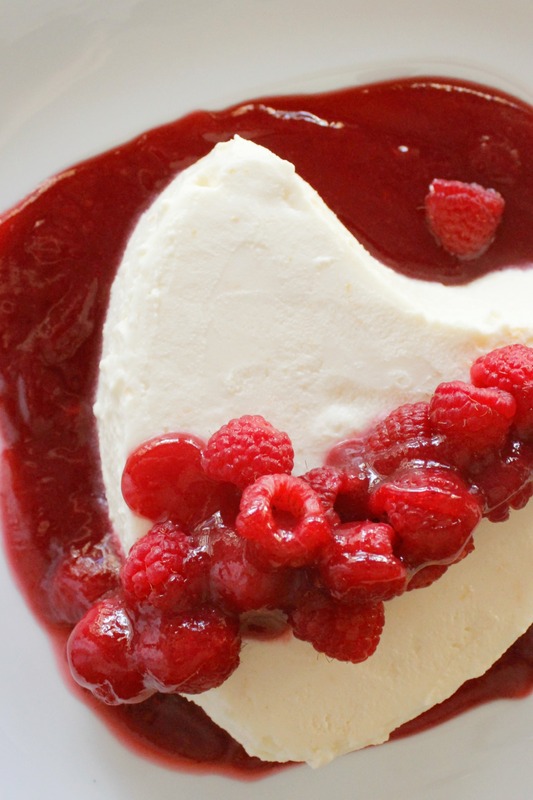 I wanted to come up with a good Coeur a la creme (heart with cream) recipe that included orange flavors and of course a delicious topping of raspberry sauce. 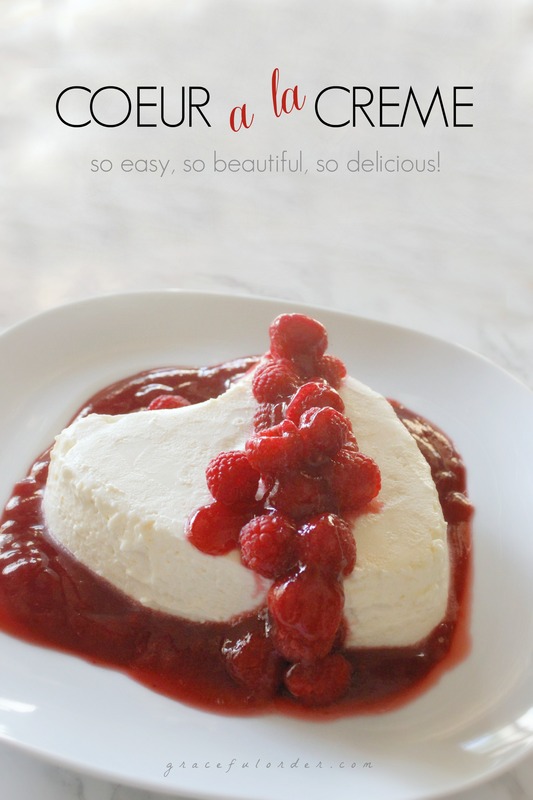 Most recipes are made with cream cheese but I decided to also add mascarpone to make it even more flavorful and creamy. Note: This dessert needs to drain overnight in the refrigerator. The cream cheese and mascarpone should be room temperature before using in the recipe. 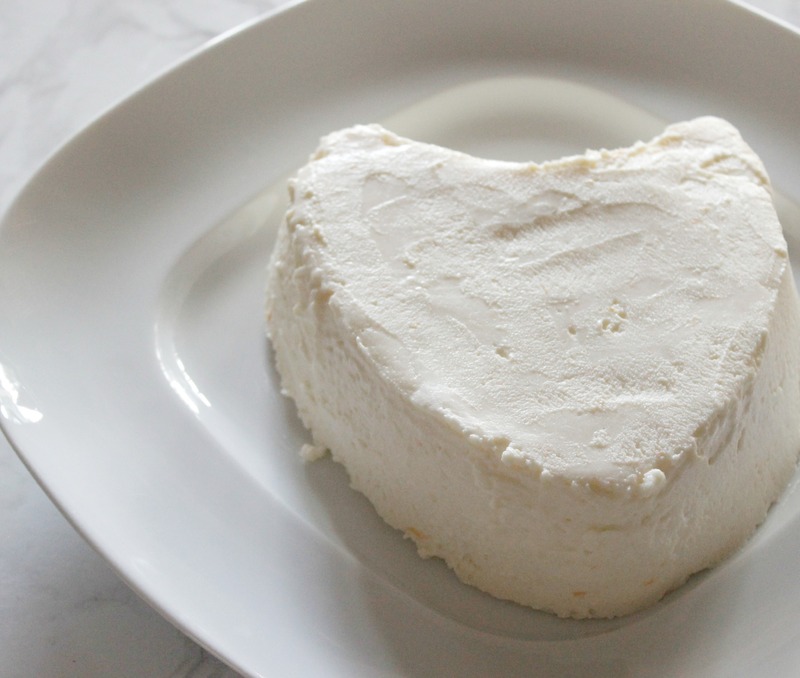 For this recipe you will need either an actual coeur a la creme dish (that I just added to my Amazon shop) or a sieve lined with cheesecloth will do. First let’s go ahead and prep our mold – whether the dish or the sieve. Place the dish on top of a plate so that it can drain overnight and collect the liquid. 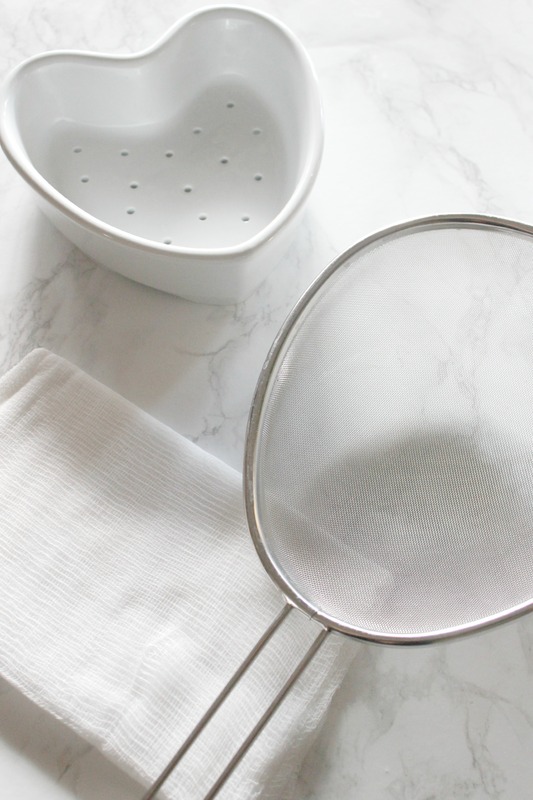 If using a sieve, place it on a bowl that keeps it leveled so that it can drain into the bowl overnight. Line the dish or the sieve with a few sheets of cheese cloth. There will be excess cloth on the outside of the mold and that’s perfect. Later you will fill with the mixture and fold excess cloth over the top. First we are going to make the actual coeur a la creme. 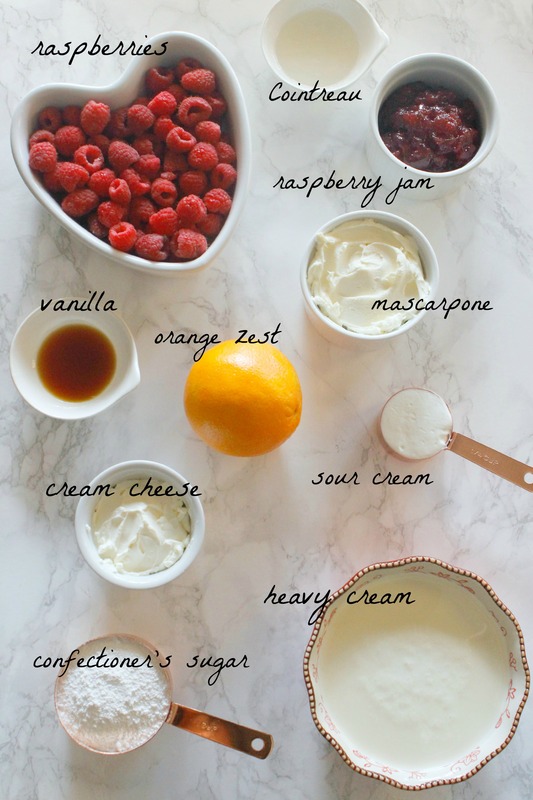 To a mixer, add the mascarpone cheese and the cream cheese and blend on medium-low. Slowly add the confectioner’s sugar and beat for a few minutes until incorporated. 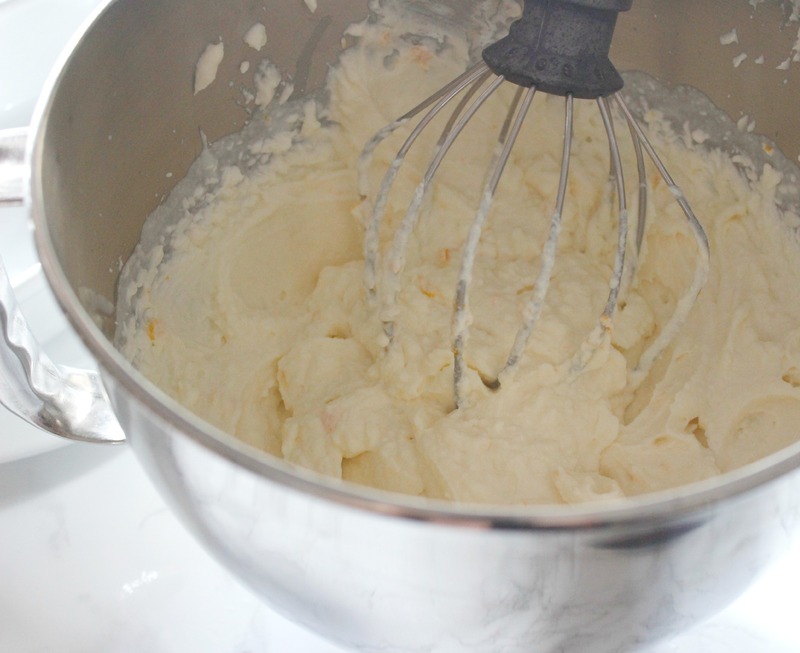 Then add the heavy cream, sour cream, orange zest and vanilla and beat until it has soft peaks. Place the cream mixture into the lined mold (you may have leftover) and press a little on the sides so that it takes the shape of the heart. Now fold the edges of the cheesecloth over the mold and cover the mixture. 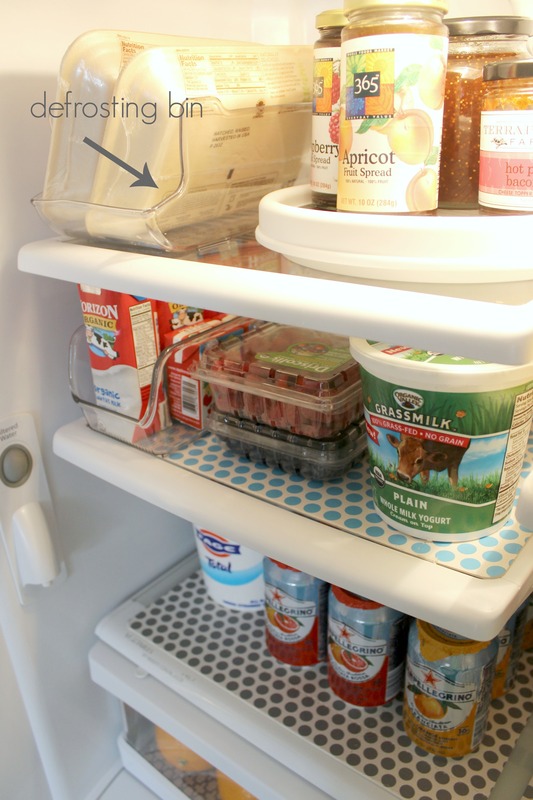 Allow to rest overnight in the refrigerator. While the coeur is in the fridge, let’s work on the sauce. The sauce is almost exactly as Ina makes it, except I added cointreu to accentuate the orange flavor inside the creme filling. I also strain my sauce to get rid of the raspberry seeds. 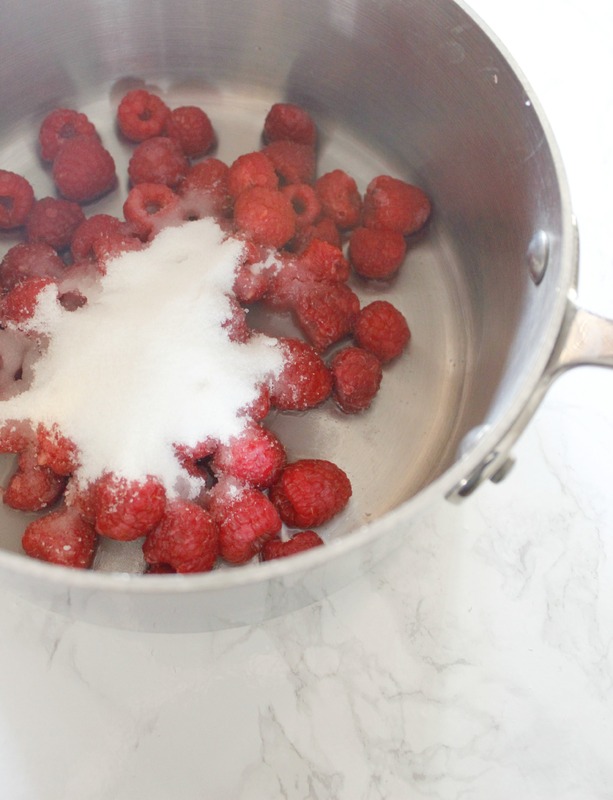 Place the raspberries, sugar and 1/4 cup water inside a pot. Bring to a boil, lower the heat and allow to simmer for a few minutes. The raspberries will quickly soften and create a beautiful sauce. Turn off the heat and add the jam and the cointreau to the sauce. Allow to cool slightly and place inside a food processor and mix until smooth. I take it a step further and strain the sauce, so that I don’t have any of the raspberry seeds in the sauce. Of course, this part is optional. Place the sauce inside the refrigerator. The next morning you can un-mold the coeur onto a plate and discard the liquid that drained over the night. 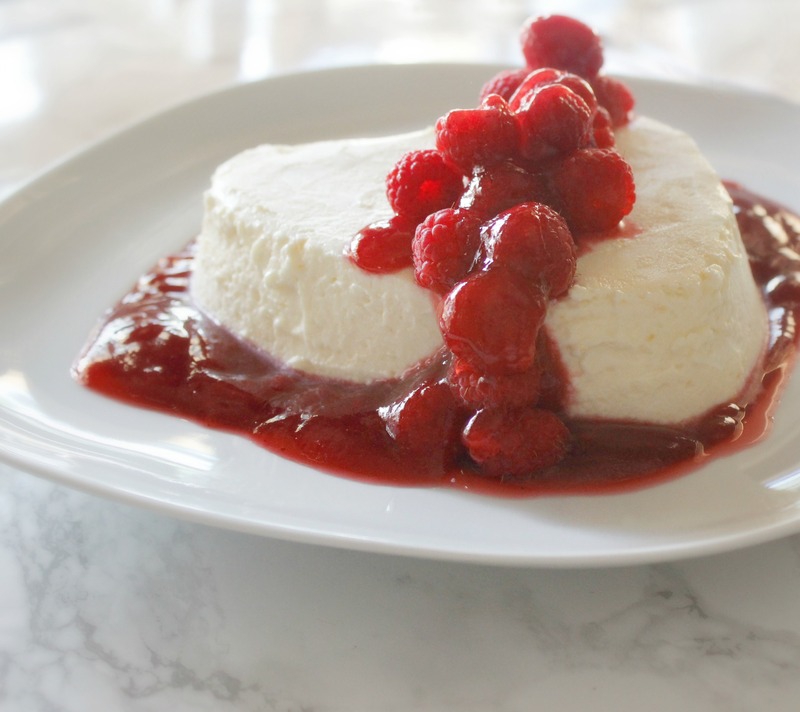 Pour the sauce around the plate and drizzle some on top, along with fresh raspberries. Isn’t it a beautiful dessert? I hope that you try it soon. Feel free to pin the below image so that you can easily find it when you are ready. It will be perfect for the holidays or you can wait to try it for Valentine’s Day. I wouldn’t/couldn’t wait though. 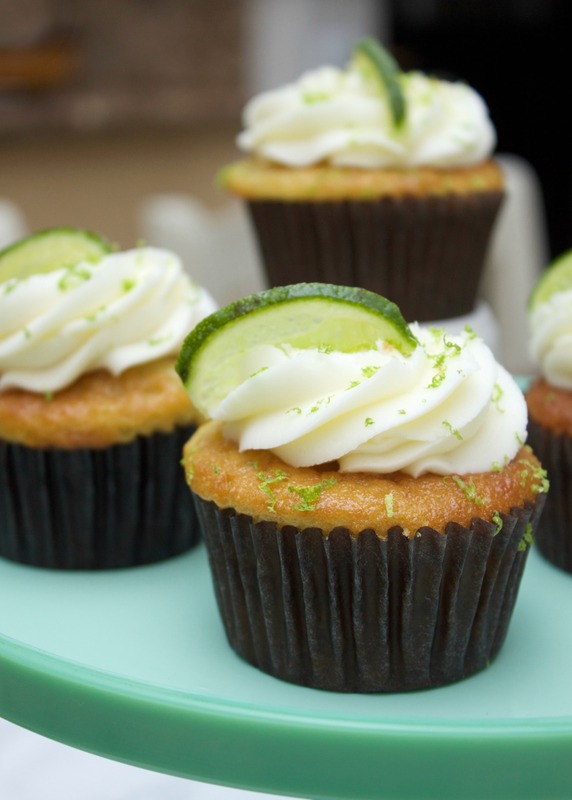 What is your favorite dessert to make when you have dinner guests? ~ This posts contains links, one is a affiliate link. Affiliate links don’t affect what you pay for the item, so you don’t pay more by purchasing through the link. As always, thank you for your support of Graceful Order! This month’s issue of Sam’s Club Healthy Living Magazine talks about being mindful when we eat and encourages us to look for ways that we can cut back on calories, while not sacrificing flavor. 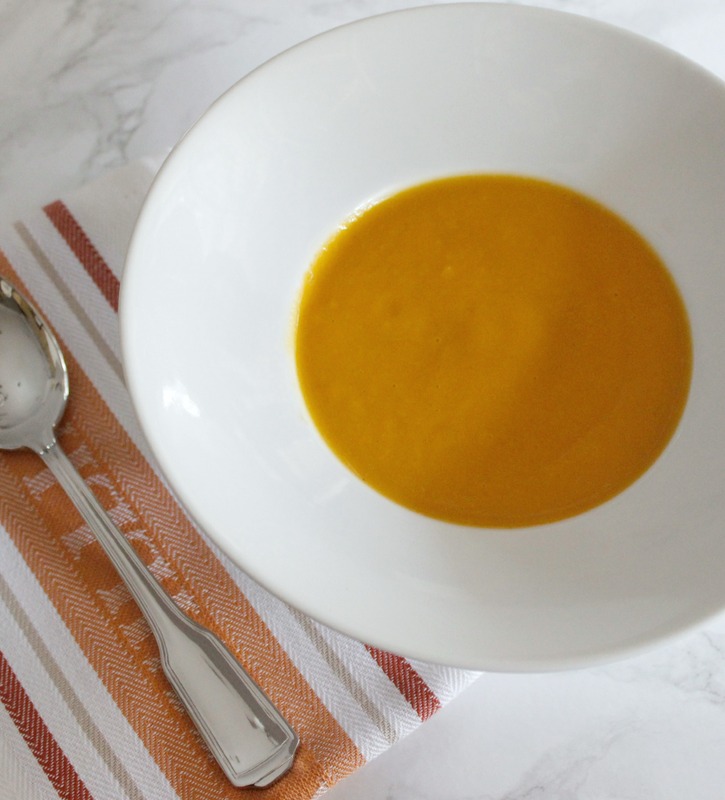 I wanted to contribute one of my favorite recipes to this challenge – Roasted Butternut Squash Soup. The original recipe calls for heavy cream and butter and well…it’s delicious but not low fat. 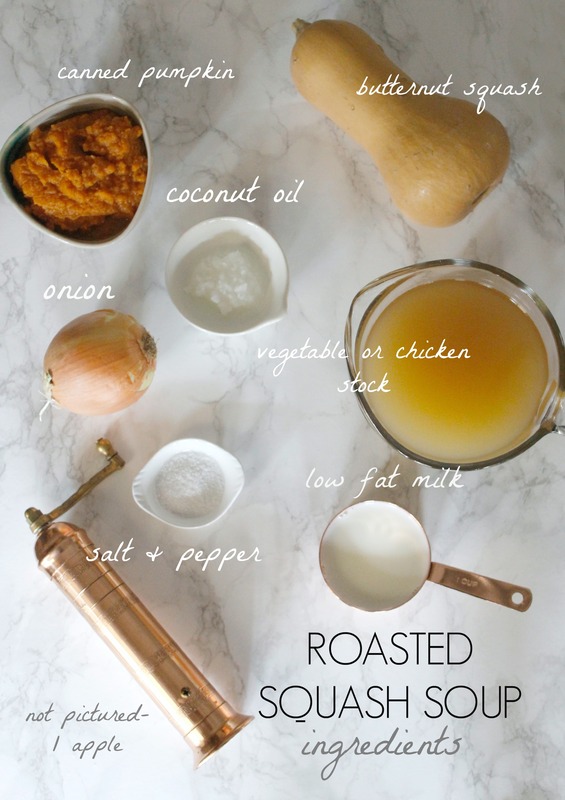 I made some simple modifications and I was surprised to see (or taste) that my favorite soup was still amazing, even with a few swap-outs. The first step in this recipe is to roast your butternut squash. 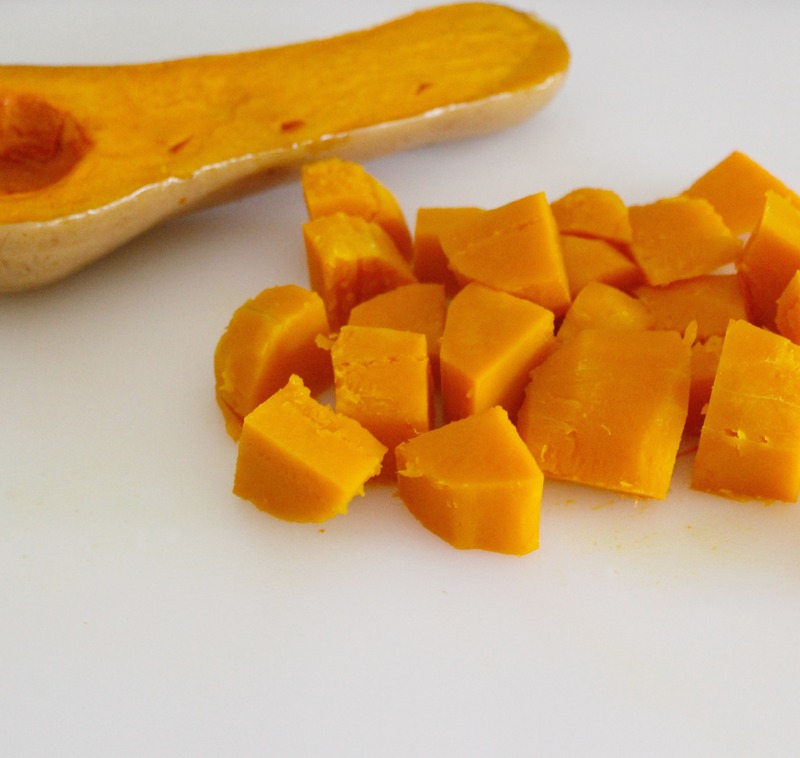 Note : A good shortcut that will allow you to skip this step altogether is to purchase pre-cut butternut squash – it will not be as flavorful but still delicious and a time-saver. Set your oven to 400 degrees. Carefully cut the squash in half and brush some olive oil on the cut side facing up. Cook the squash in the oven for 20 minutes. In the meantime, add the coconut oil to a pot and sauté your onions. I allow them to cook slowly so that they become somewhat caramelized. Note: There is no need to cut the onions perfectly, as everything will be pureed at the end. Allowing your onions to cook slowly and caramelize will add sweetness to your soup; we are not adding sugar like most squash soup recipes. 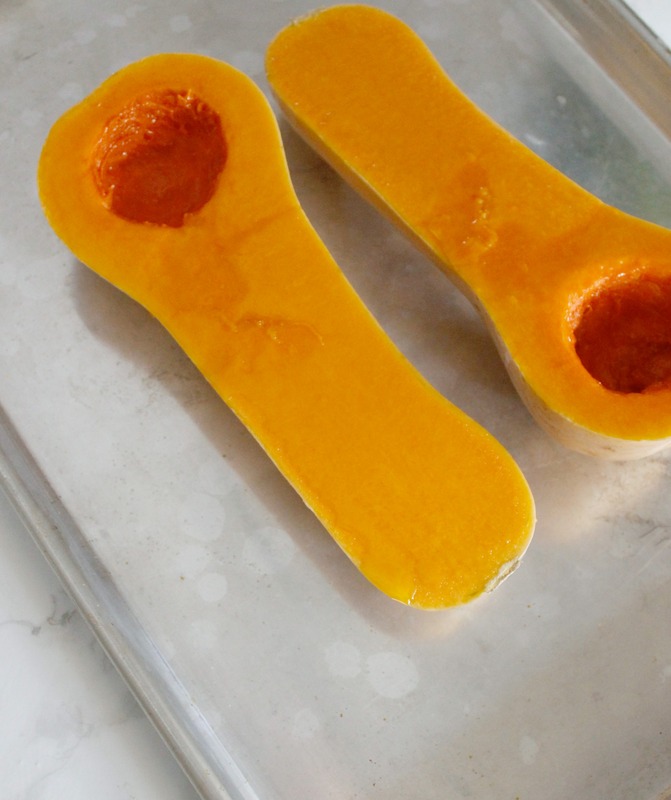 Remove the butternut squash from the oven and allow to cool. Slice the skin off and cut into chunks. 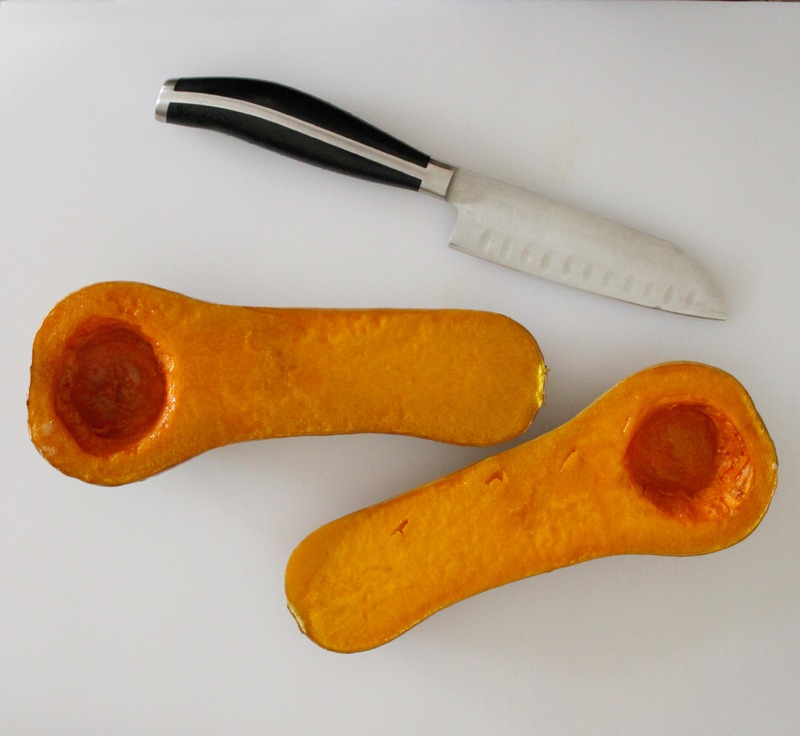 Your squash may be cooked all the way through or you may notice that in some areas it is not. That’s ok because it will continue to cook inside the pot. 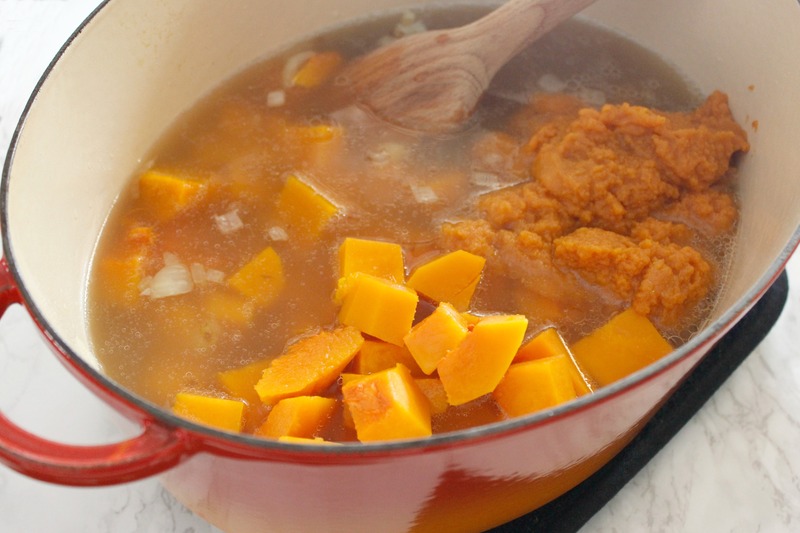 Add the pumpkin puree, the diced apple, diced butternut squash, stock, salt, and pepper to the pot with the onions. 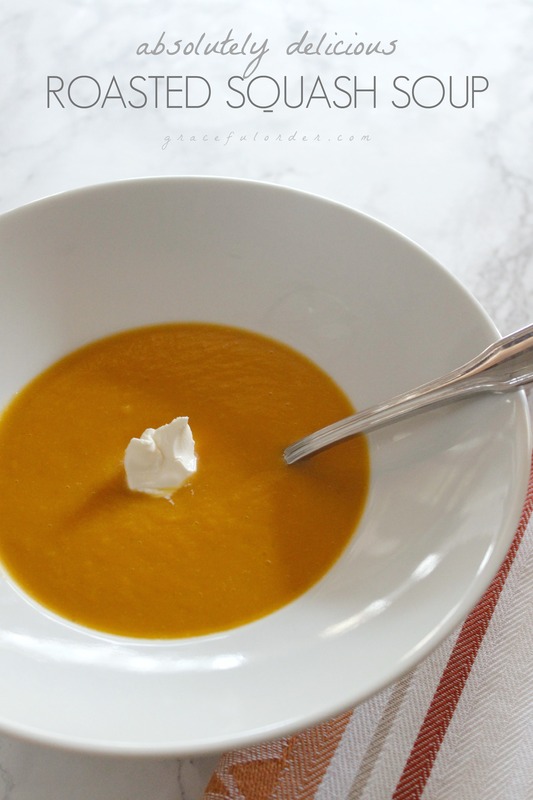 Notes: The pumpkin puree will give this soup a lot of flavor and body. Make sure that you are not using pumpkin pie filling which is completely different. Also, the apple is optional. If you like a sweeter soup, add it. Otherwise, you can skip that ingredient. Cover the pot and simmer over medium heat for about 15-20 minutes. I turn off the heat and allow the soup to cool slightly. Next, I get out one of my favorite kitchen tools – the immersion blender. 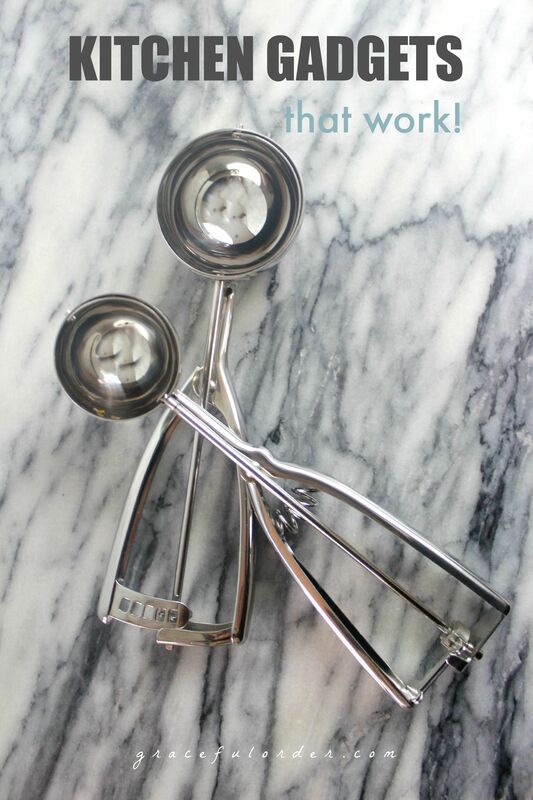 If you don’t have one, you can use a traditional blender. I love how I can puree soups right inside the pot. Once pureed, add the milk and heat the soup through once more. Make sure the salt level is ok and if not, you can add. This varies depending on how salty the stock was that we initially added. Your delicious soup is done. Serve and enjoy! 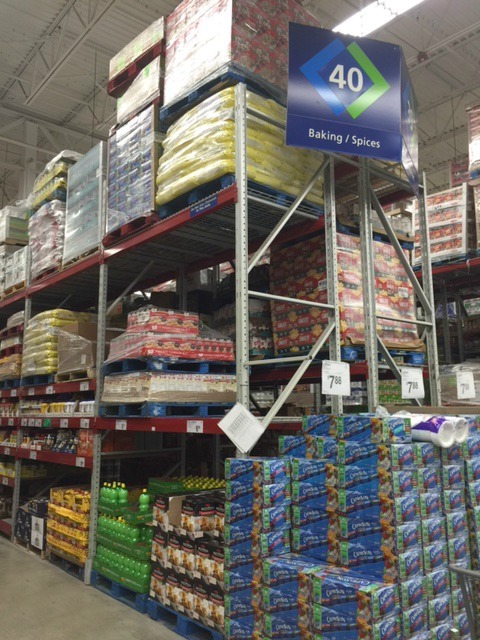 Ingredients for this post were found at Sam’s Club (mostly the baking aisle). For more tips on healthy eating, check out Sam’s Club Healthy Living Magazine! I’d love to hear about your favorite soup recipe! 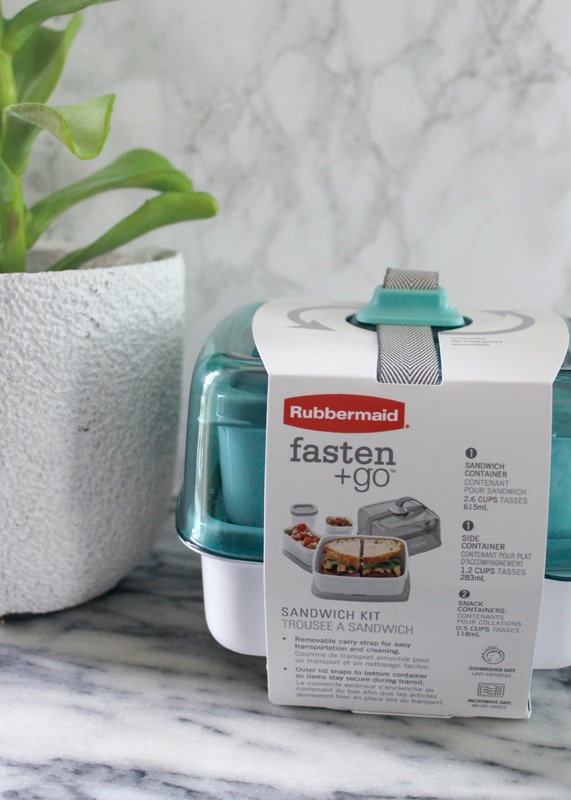 I am so excited to finally be able to share with you this new product that I have been using and loving, called Rubbermaid® fasten + go. It is new and will be available at Target starting 12/27. So far I only have one but I am marking my calendar so that I can buy a few more when they are finally available. So what is it exactly? Well there are 3 kits available – an entree kit, a soup kit and a sandwich kit. This is how the kit is packaged at the store, and it is really easy to open and close. 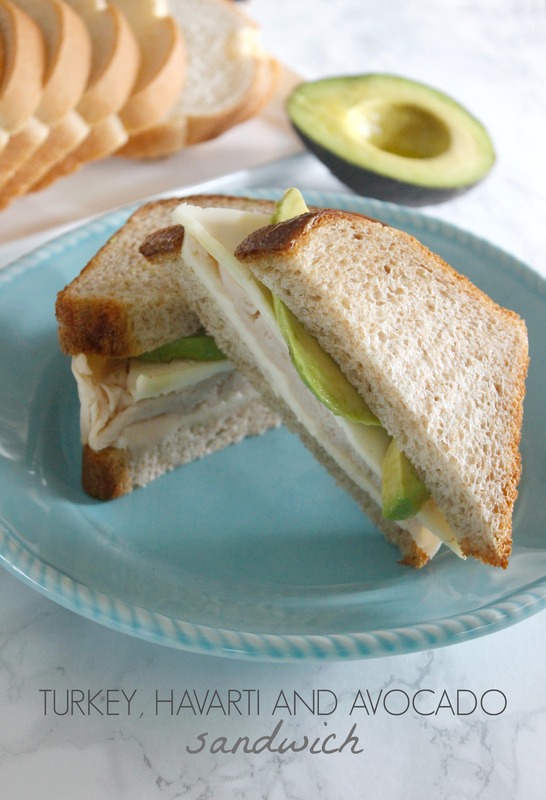 First, I wanted to try it out for it’s intended purpose – sandwiches. My husband often comes home to have lunch or he takes lunch with him. 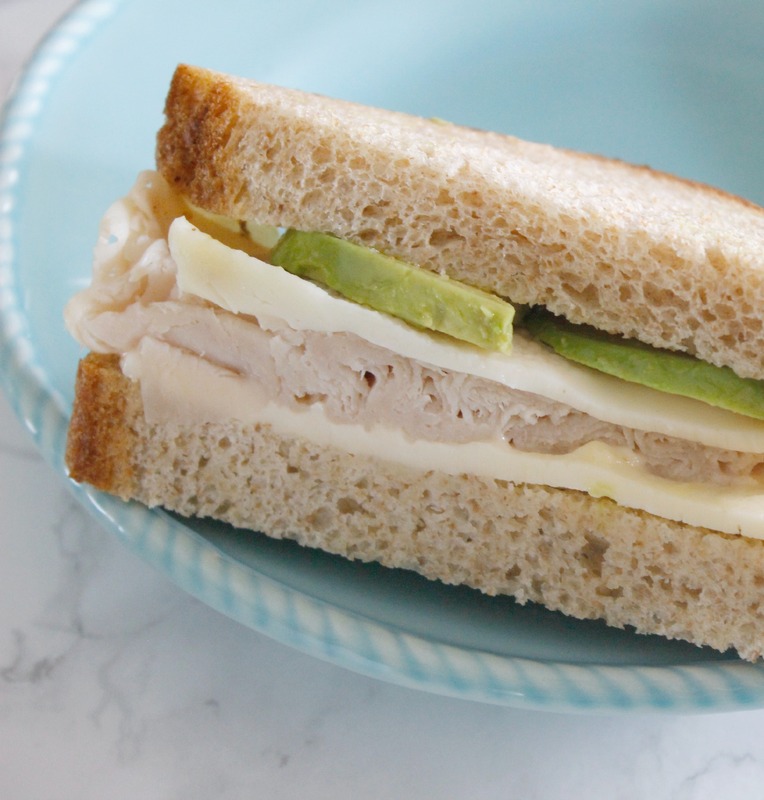 Here is a simple and delicious sandwich with turkey, havarti cheese and avocado. Note: Avocado tends to oxidize pretty quickly, so I brush a little olive oil on the slices of avocado and that seems to keep the color. I still haven’t found a method that will completely stop them from loosing their green color, but the olive oil seems to work even better than the lemon juice. It ended up being a pretty thick sandwich. But it still fit nicely inside the container. 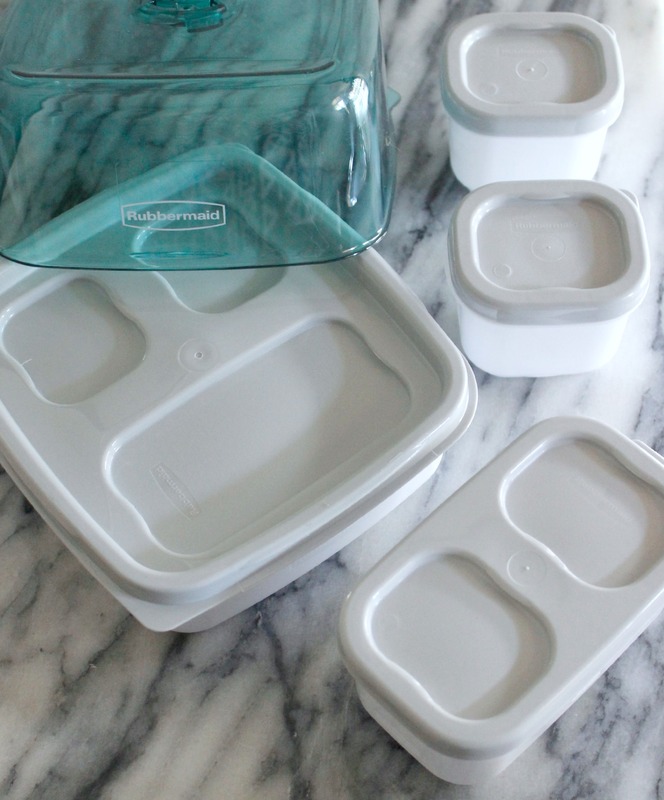 If you are looking to start (or continue) eating healthy, the little containers are a great way to portion your sides or snacks. Below, I placed a hard-boiled egg inside one small container, almonds in another and celery and hummus in the medium container. For my boys I would serve a similar lunch, minus the avocado. I added a small portion of miniature cookies and some veggies with ranch dip. Of course the organizer in me took over and I started finding other uses for the fasten + go kit. 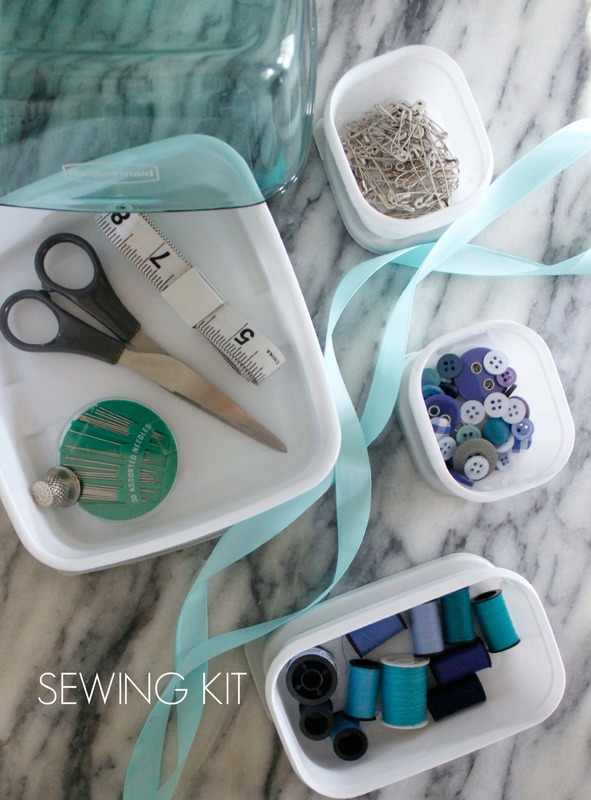 Here I set up a little sewing kit. This is great for those of us that can’t sew very well, but need to hem some pants or add a button here and there. 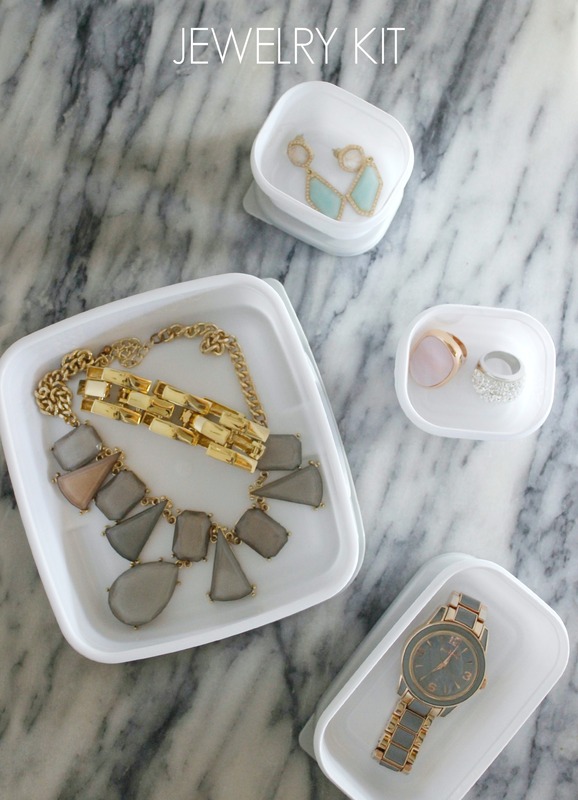 A jewelry kit! I recently went on a cruise and all my necklaces were tangled with the earrings by the time that I unpacked. When I place them inside the kit, they each have a separate compartment and I love that! 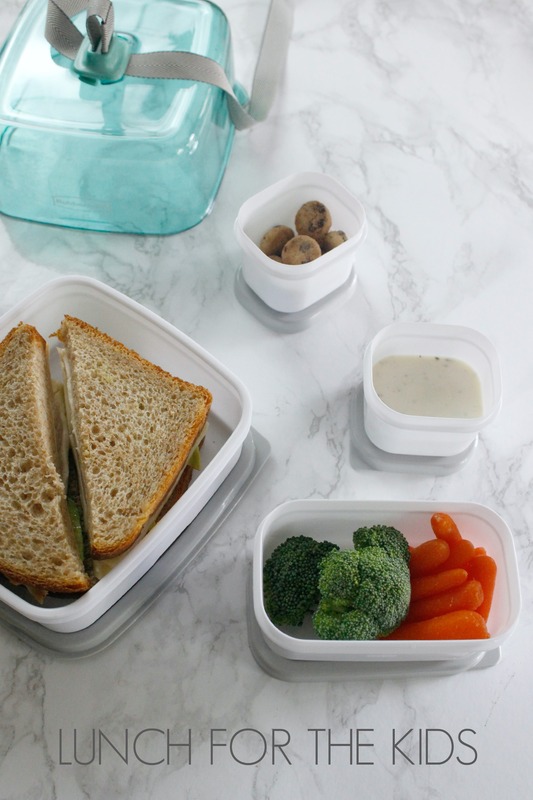 For now, I will use mine for lunches but as soon as they are released in January I will buy a few extras for organizing items around the house. The kits are available in 3 colors – smoke grey, seafoam green (mine) and marsala red. I think I will buy the grey ones for storage and another seafoam green for our lunches. 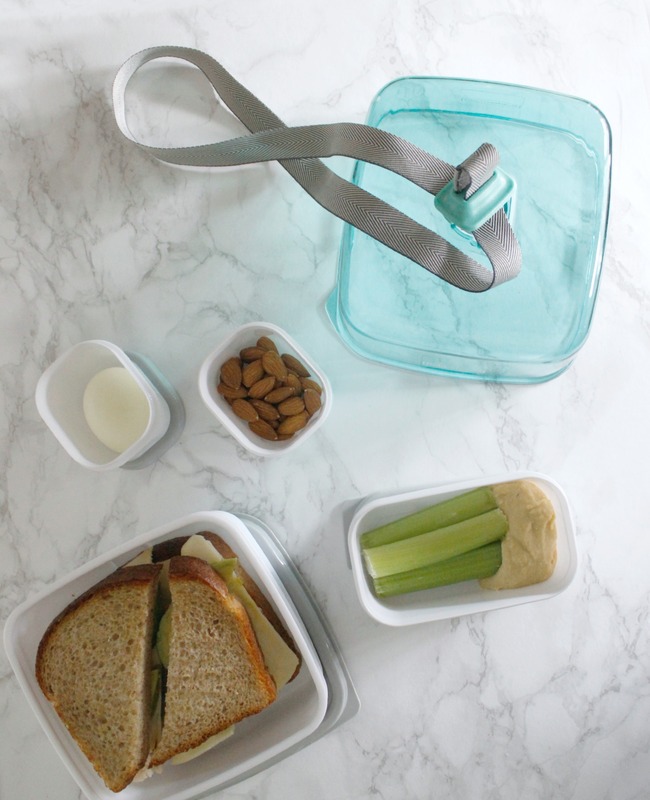 Do you make lunches for yourself or your family? Do you have a tip for keeping avocados green? Help a girl out. Earlier this week I shared my Christmas Home Tour and promised details about my tree later in the week, so here it is. I am actually joining a group of 25 bloggers who will be sharing their Christmas tree style with you – all week-long. 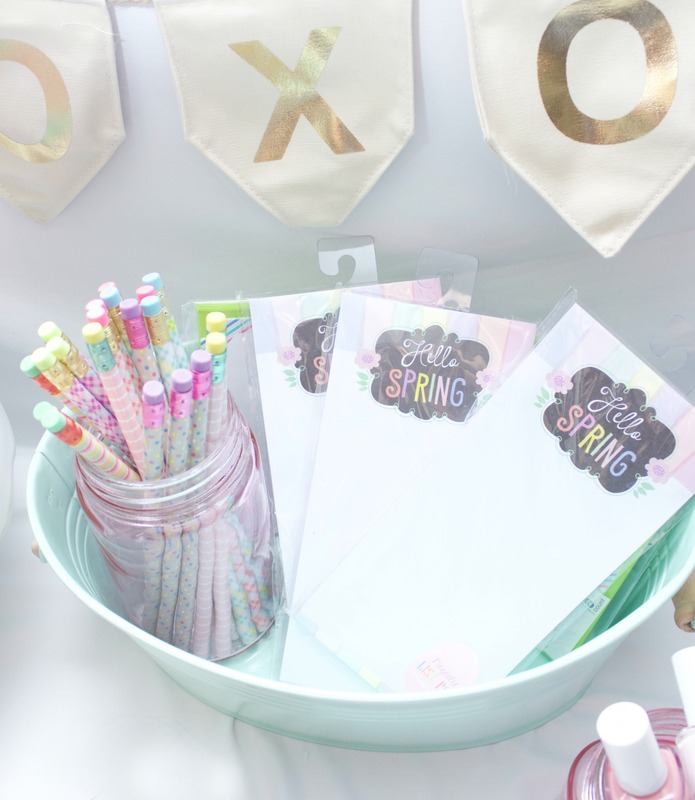 If you are following the blog hop from Blue I Style, welcome! 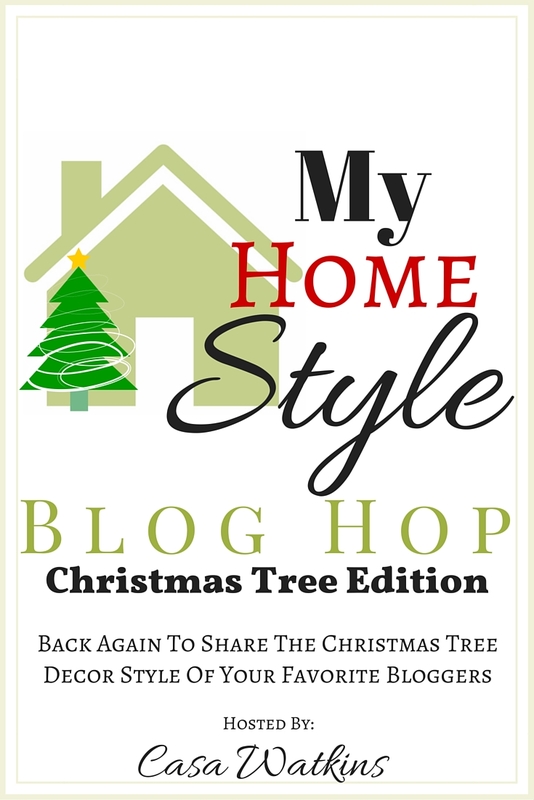 The “My Home Style – Christmas Edition” blog hop is hosted by Stephanie of Casa Watkins so stop by to see her beautiful tree as well! 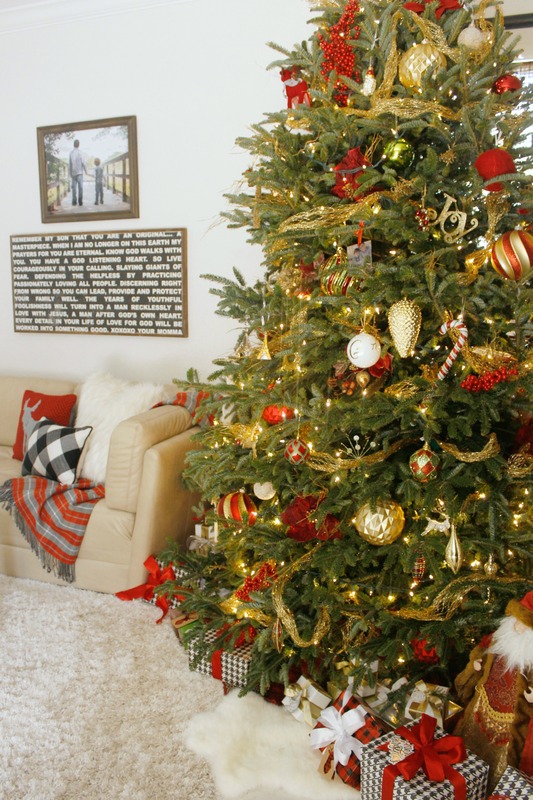 We will all be describing the style that we choose for our tree and telling you how and where you can achieve a similar look. Of course, if your tree is already up, you can just enjoy sitting back and checking out everyone’s tree. That’s what I will be doing! My style is classic, traditional and timeless. So timeless that my tree has looked almost the same for years and I am still not tired of it. Truth is that I have always wanted a fake Christmas tree because they are so much easier to decorate. However, my husband won’t even hear it because he loves having a fresh tree in the house. 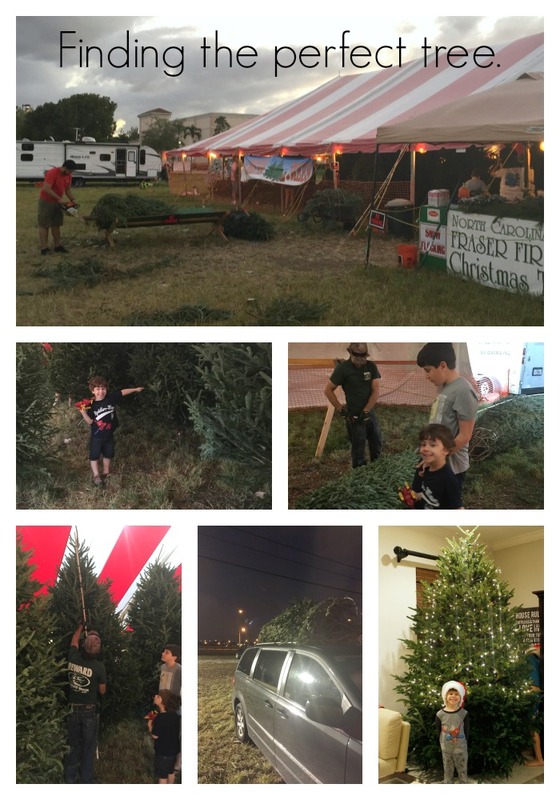 He likes the whole process of picking out the tree with the boys, the scent in the home…all of it. Granted, I love all that as well, it’s just the decorating that is more difficult. You see, with a real tree you have to find the right branch for that perfect ornament, but I have learned to work around that. Here we are picking out our tree this year. After we buy our tree and bring it home, my husband adds the lights and we allow our tree to rest overnight. Since the branches have been constricted for some time, they need to open up naturally without the weight of ornaments. Of course the kids don’t like to wait so they put on their santa hats and we start to sort the decorations for the following day. I have quite a few boxes of decorations in my garage and they are all labeled by color. We have flocked our tree in the past and when we do, I like to use silver and blue accents, but my favorite is the vibrant red and green decor. Every year I will add an ornament or two to our tree. This year, I added the gold monogram ornament below. Monogrammed items are my weakness. That and salted caramel chocolates. 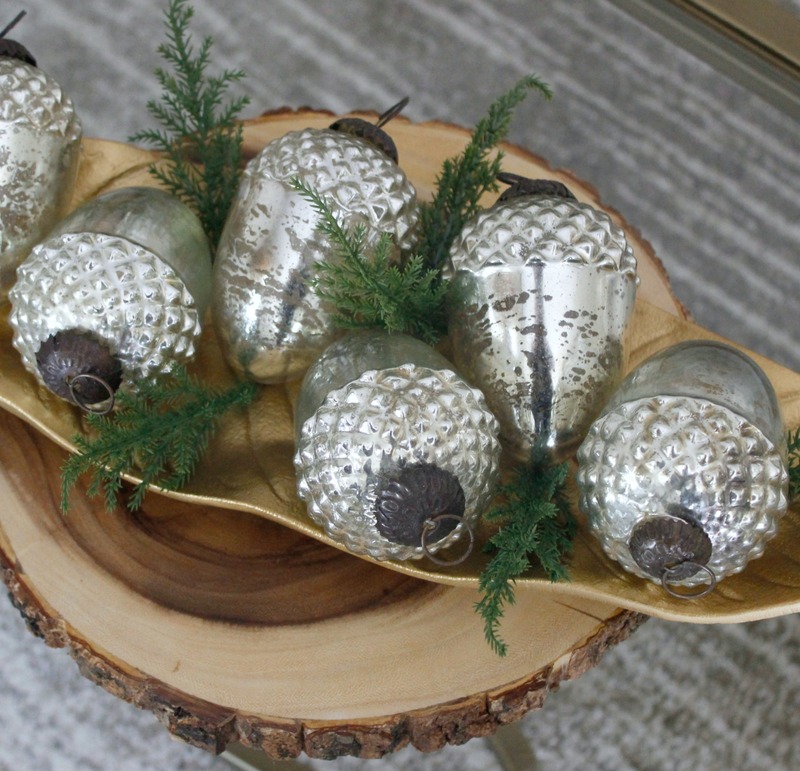 Use medium and oversized ornaments. I like to mix up different sized ornaments so the decor looks more dimensional. I add big ornaments but they need to be plastic, because otherwise the natural tree would not hold them. 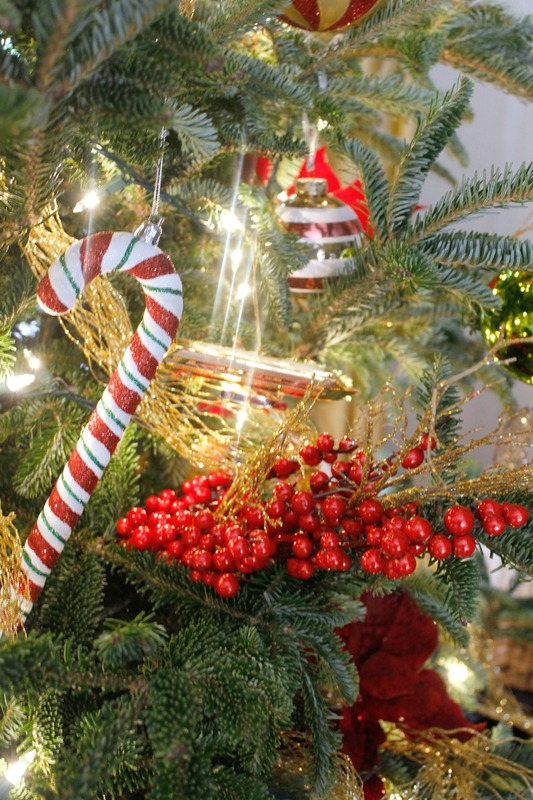 As far as color, all the ornaments are gold, red or green. 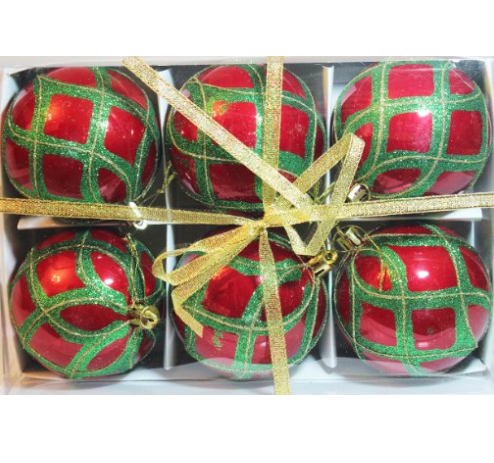 I found these ornaments on Amazon.com with all three colors. They are a medium-sized which are great to fill in the tree. The really large ones are from Bj’s Wholesale Club. The poinsettia are from everywhere. Some are picks meant for trees and others are pulled from faux poinsettia plants. Beautifully wrapped gifts add a designer look to the tree. I wait until Christmas to add the boys’ gifts but I start wrapping all the adult gifts early on so that they can go under the tree right away. 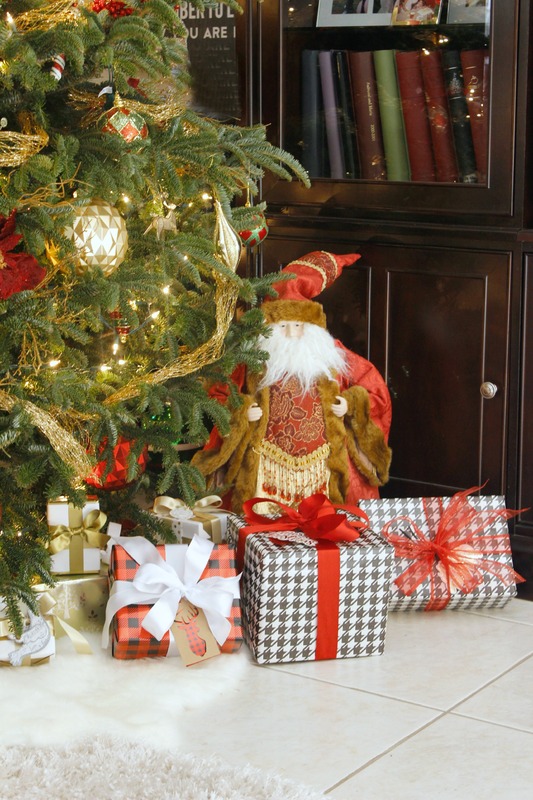 Wrapping paper and cloth ribbon is inexpensive and makes a huge difference to your tree. So much so that if you don’t have gifts to place under your tree, you can consider wrapping empty boxes just to add color and fullness to the bottom of the tree. 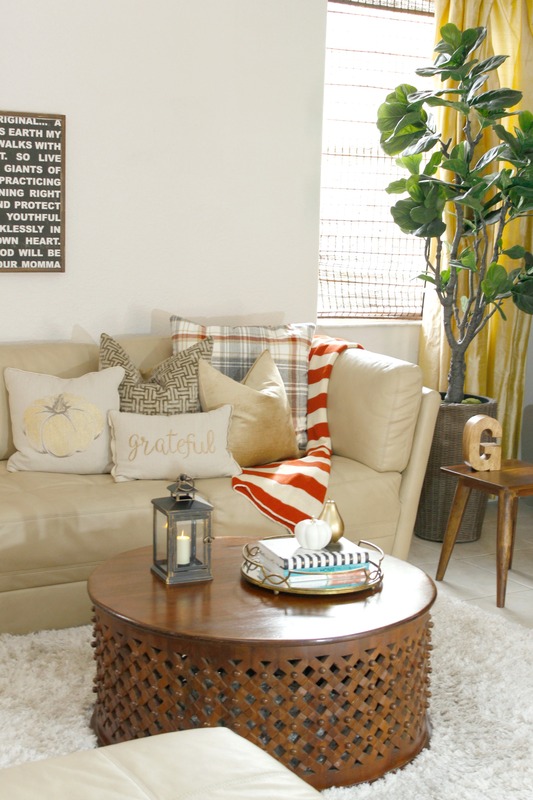 Mix trendy with traditional ornaments. Right now reindeer/antler items are the rage and I purchased a few of those decorations last year in an after-Christmas sale. I also love “words” on the tree and Target seems to have a few new ones to choose from every year. 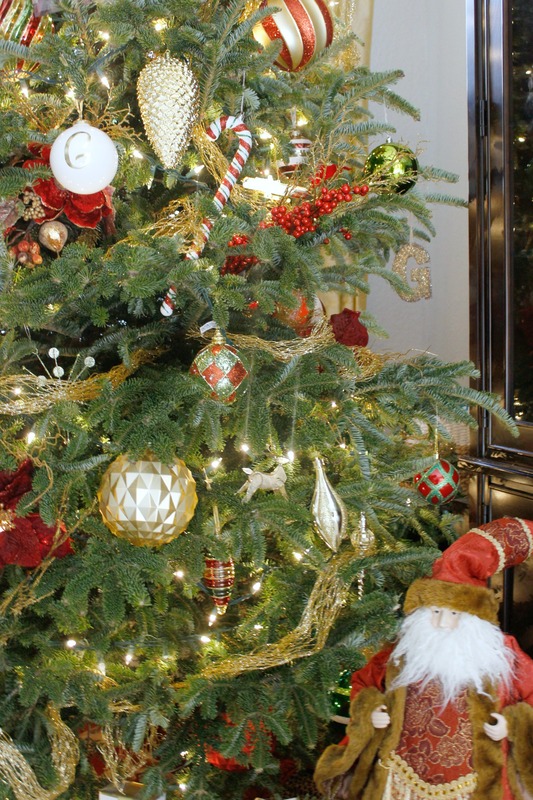 Add metallic colors to pick up on the lights on the tree. Admittedly, after decorating the tree, there is glitter everywhere but all those gold accents look beautiful once the tree lights are on. 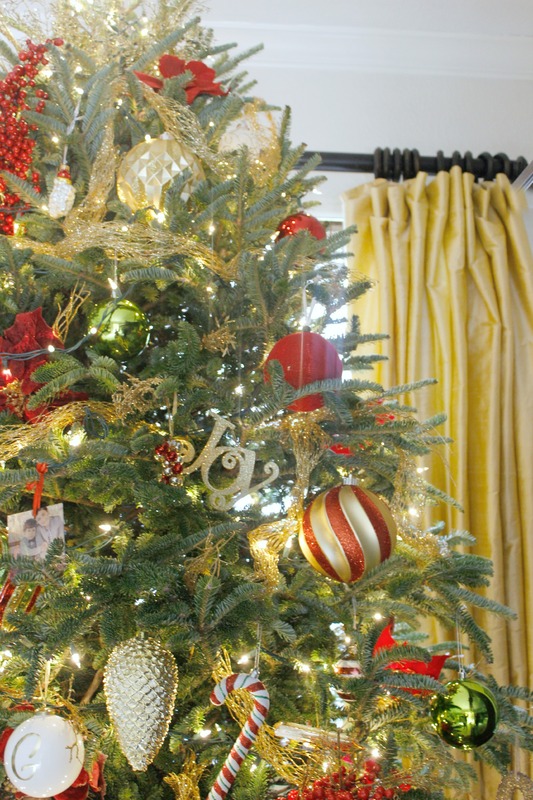 I add gold garland all around the tree and a bunch gold twig picks throughout the empty spaces. That’s my tree. Maybe next year my husband will be on board with buying a fake tree. Actually, that will never happen. In the meantime I will enjoy my real tree and enjoy the fact that it is a little different shape every year. 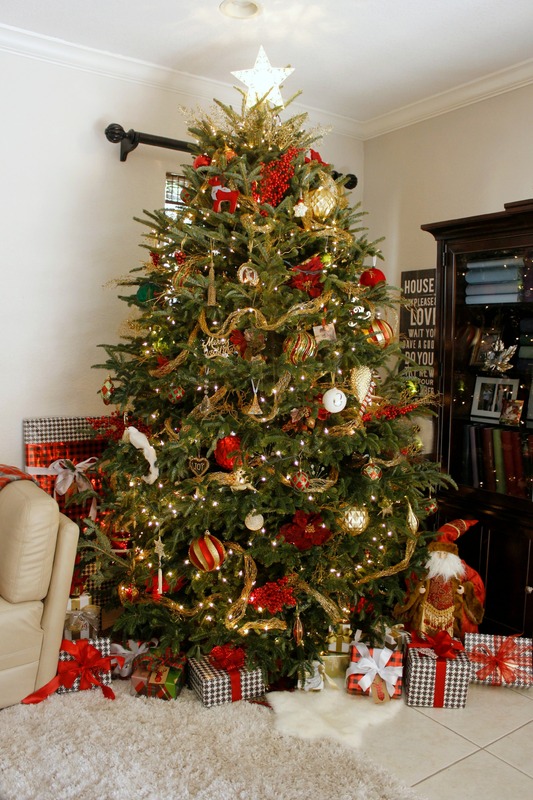 Who decorates the tree in your home? You, the kids or everyone together? Next up is Amy from My Life From Home and below are all the links to the hop. This post may contain affiliate links. Buying through these affiliate links does not affect the price of the item. Thank you for your support! 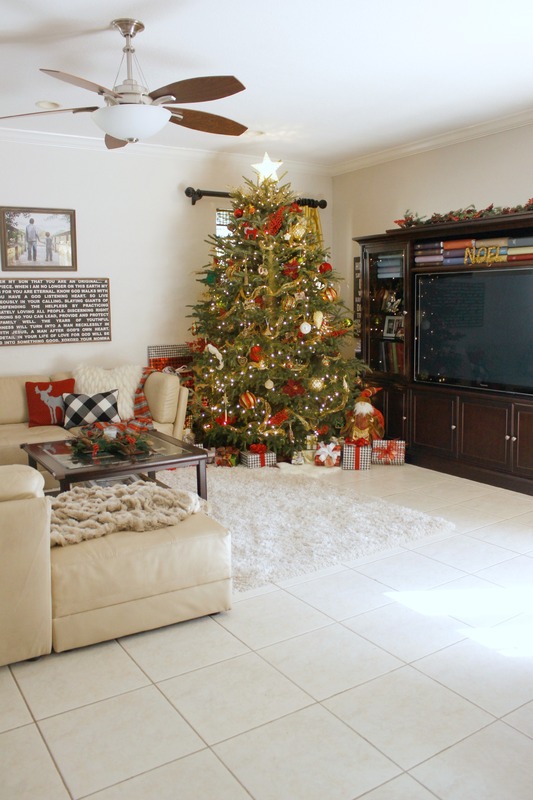 Eager for more Christmas Tree styles? 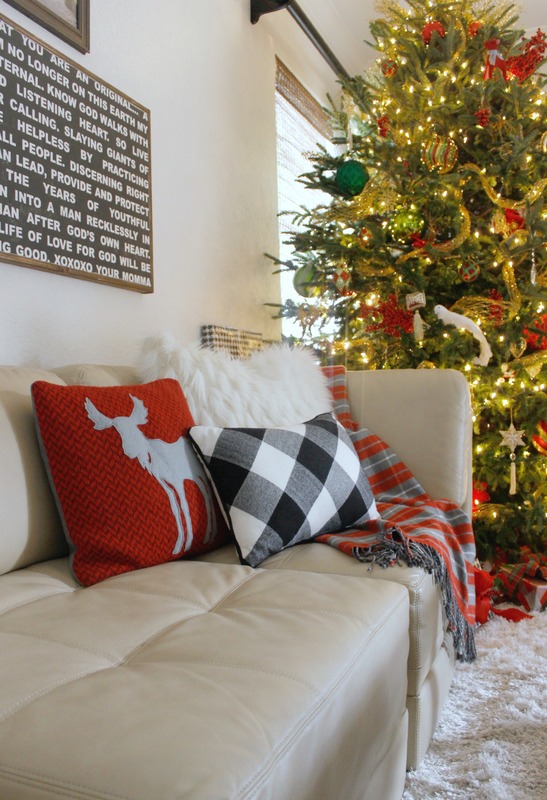 Check out the other Christmas Tree stylings by these amazing bloggers. 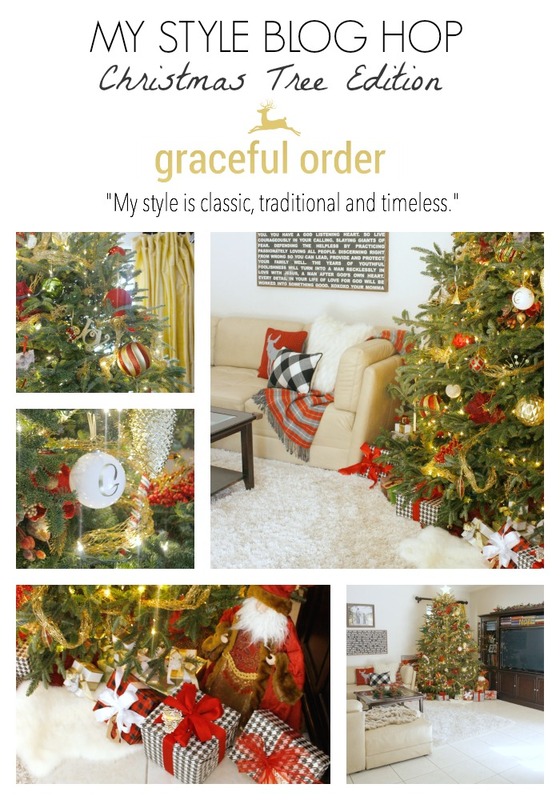 Lately it’s been all about holiday entertaining and organization has taken a back seat over here at Graceful Order. 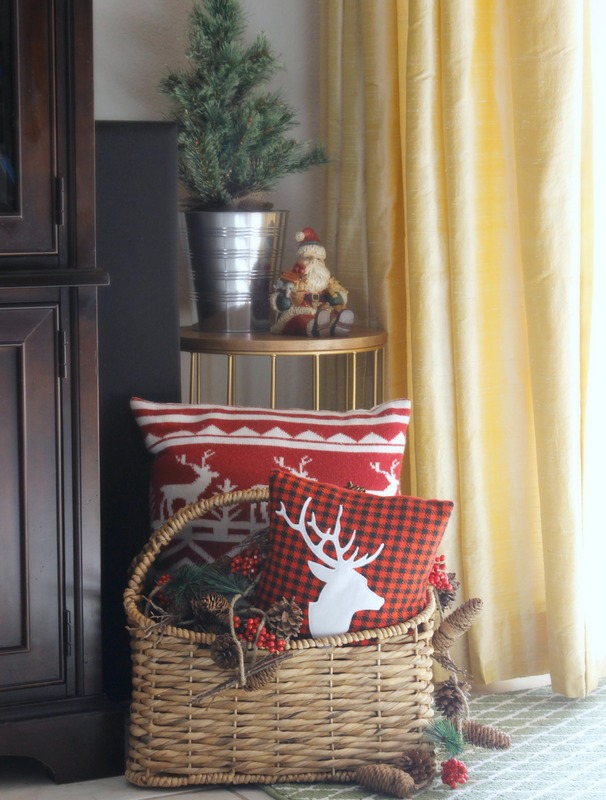 Yesterday, I posted my Christmas Home Tour and some of you noticed that my storage bins (below) were gone. You see, while I usually wait until January to get my organizing systems back in shape, my entryway organization could not wait. You may recall that these (see below) were the bins that I used to have and love. 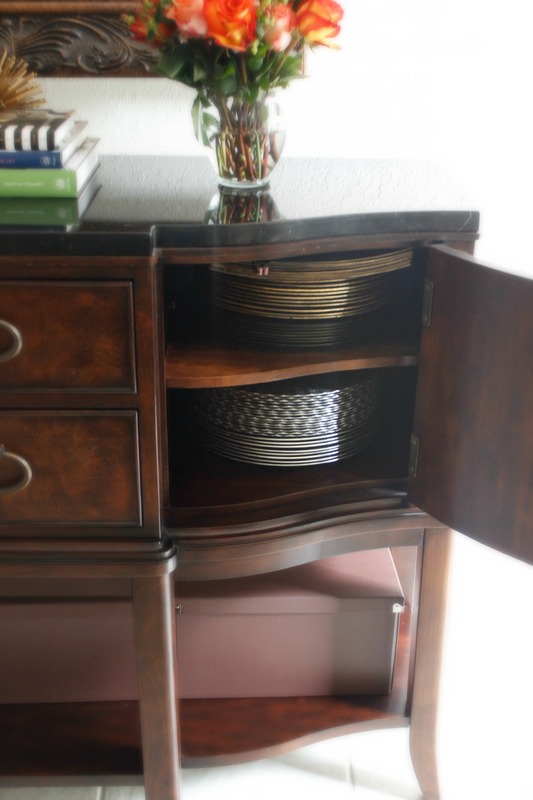 That buffet in the entrance of my home doubles as a catchall and even mudroom of sorts. One of the main reasons that I liked the old bins was that they were open, but lately it was the reason I no longer liked them. As the boy’s bike gear got larger, I didn’t like seeing Ninja Turtles peeking out from my formal buffet. In the family room, I am a lot more relaxed with our style, but I like a couple of rooms to be off limits for green ninjas. Is that too much to ask? Although I knew that I wanted to change the bins, it took me a while to find the right ones. This time I wanted boxes with lids. I still wanted to keep the functionality of the space by being able to put away the boys’ gear and all my other dining room necessities, but I didn’t want for the space to look cluttered. Also, this room has a neutral color scheme and I didn’t want a bunch of colorful items sticking out from the bottom of the buffet. So the boxes had to have a lid, they had to be large and they had to be durable as the boys will be pulling them out all the time. 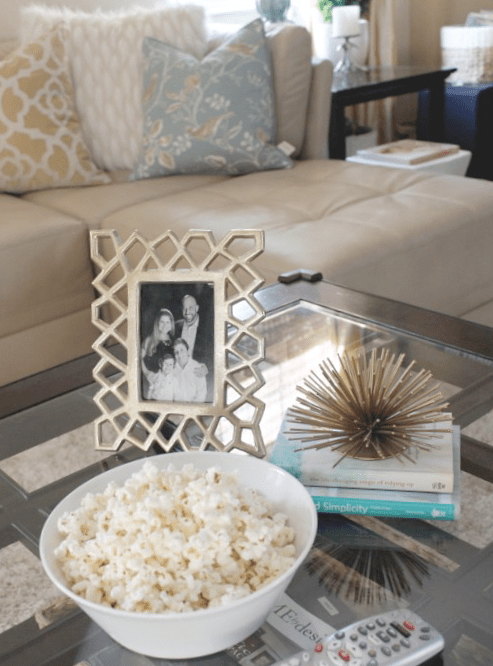 When Samsill reached out to me to introduce their Pop N Store boxes, I went on their site, saw the little video and knew that they would be perfect for my space. 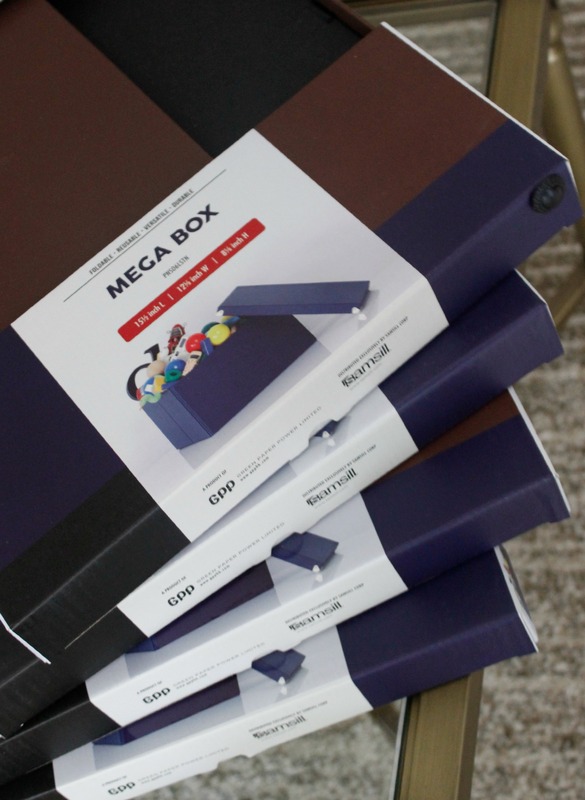 The boxes are collapsible, stackable and available in 5 colors. 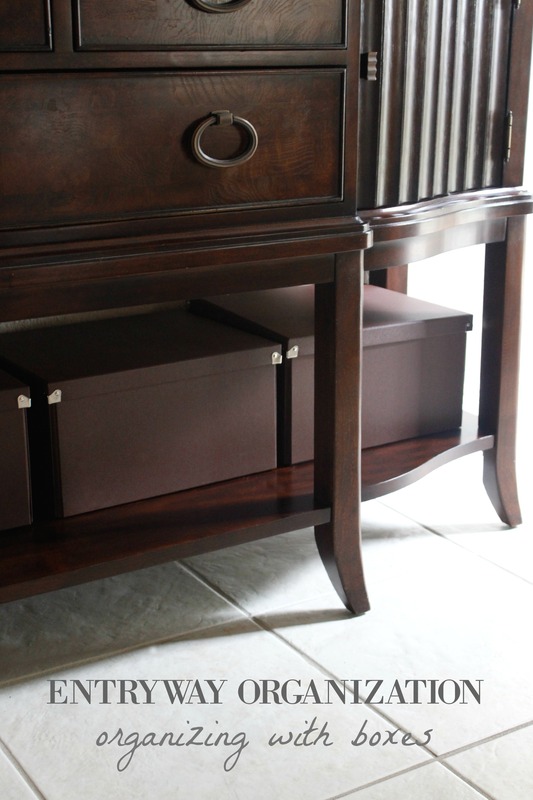 My favorite color is the white, but in this case, I was looking for the boxes to conceal and to blend into the furniture – brown was perfect for me. 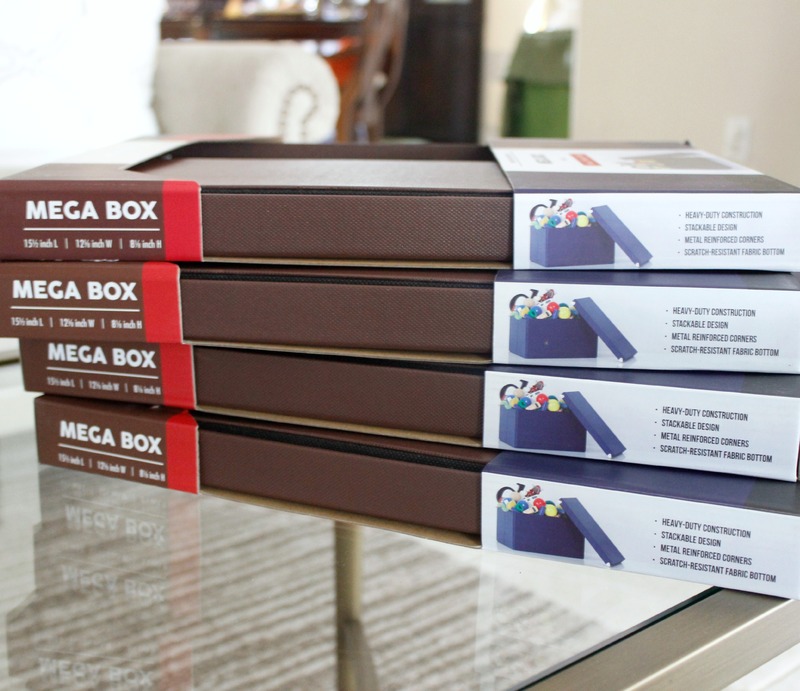 So I took the measurements and ordered 4 of their Mega Boxes. As soon as they arrived I was impressed with their quality and how easy they were to assemble. 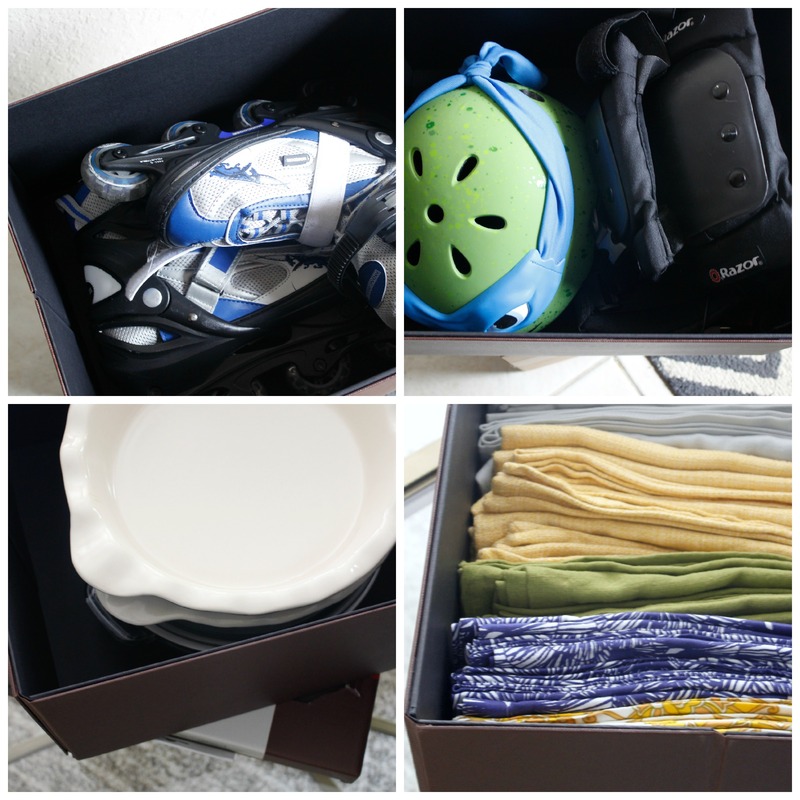 Check out the contents of all the boxes: Roller skates, safety gear, seldom-used pie dishes and linen napkins. 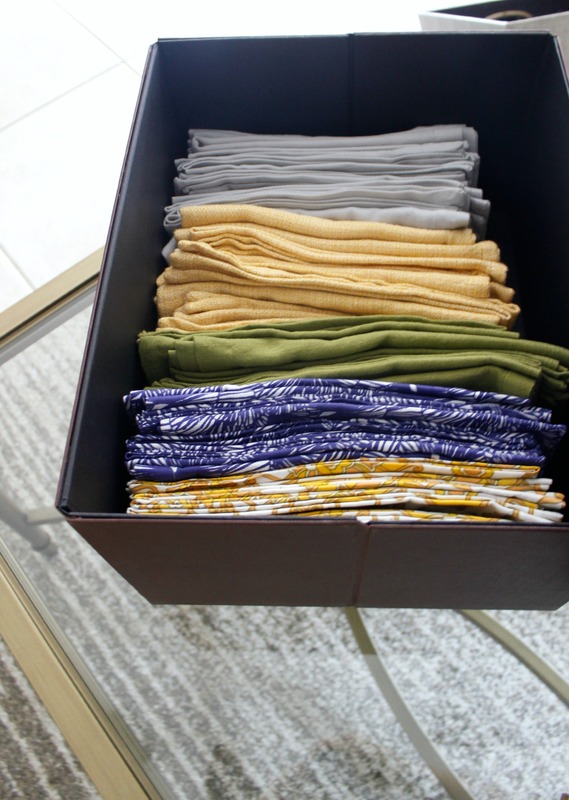 This was my personal favorite – I was able to place my linen napkins on their side inside the box. This makes it to easy to grab a stack of the napkins I need for a dinner party. The boxes fit under the buffet perfectly. They have a lined bottom so my furniture won’t get scratched when the kids quickly pull out the boxes to get what they need. I love those details! As a bonus, I was able to clear out the inside of the hutch that used to hold the pie plates, and place all my chargers together in one spot. 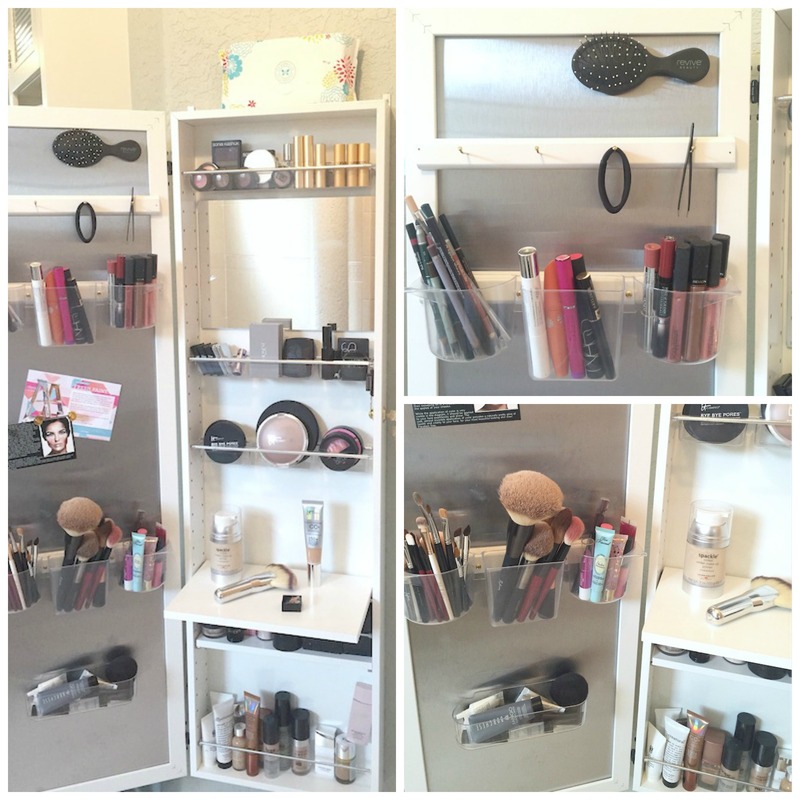 Organization plus style is a win in my book! Do you have a mudroom in your home or do you have to improvise like me? 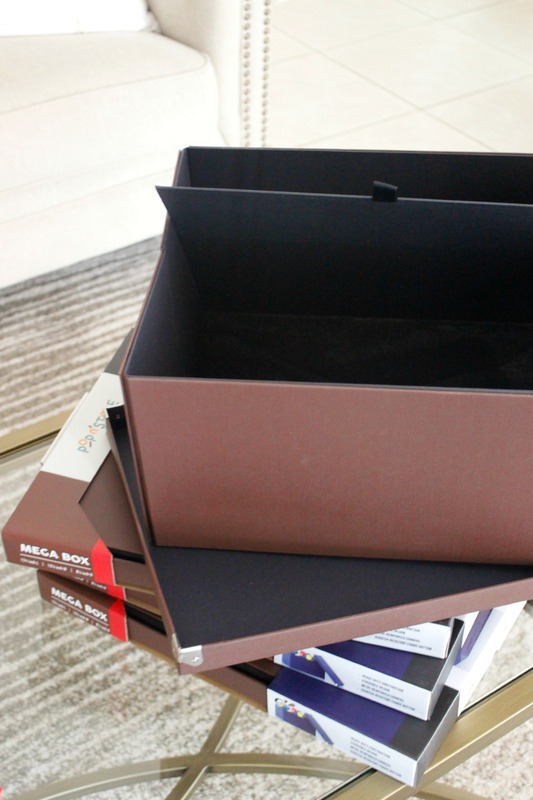 Do you already use covered boxes to organize what you want to keep out of sight? This post was sponsored by Samsill. I only recommend products that I own and love and all the opinions above are based on my own experience. Hello friends! I can tell you that I am officially done decorating my home for the Christmas season, and while I will be picking glitter out of my hair for the next week, I love all the decorations! 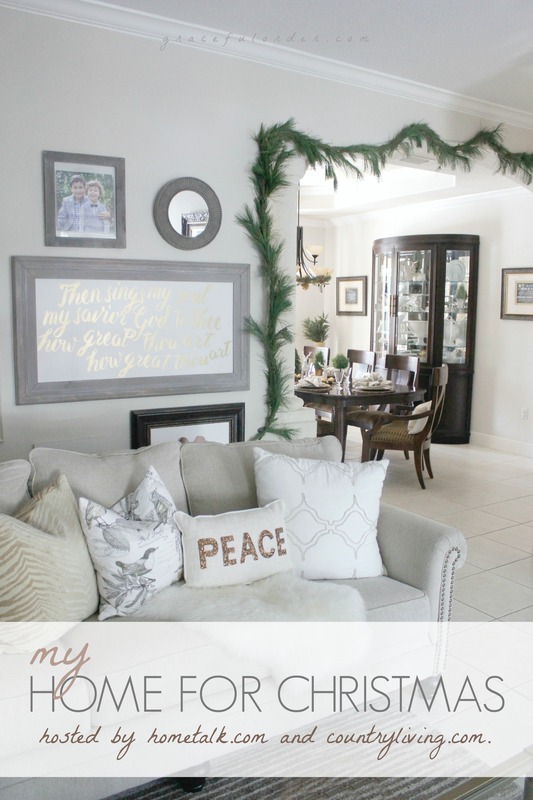 During the week I will give you many more details on all the rooms that I decorated (living room, dining room and family room) but for now I wanted to give you a quick tour of my home this Christmas. 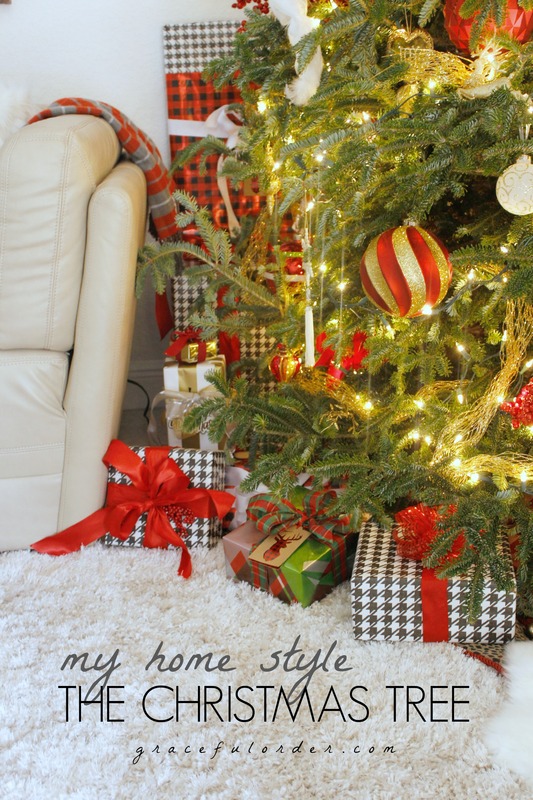 I am joining Hometalk.com and CountryLiving.com in a “Home for Christmas” event featuring lots of creative and talented bloggers. 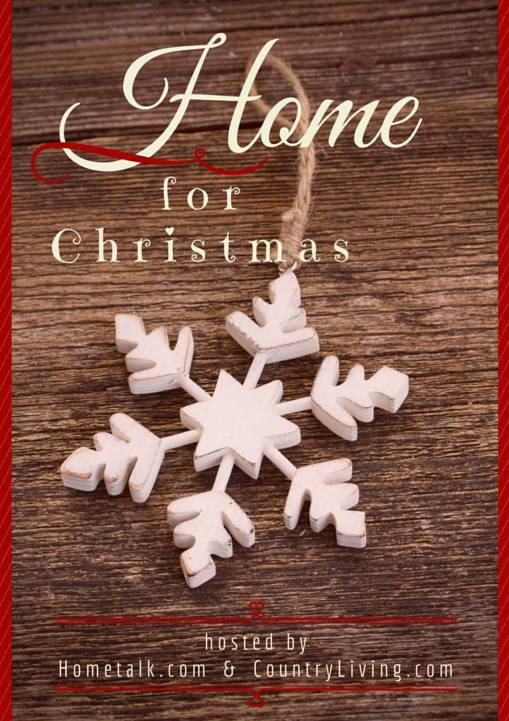 I am sharing my home tour, but bloggers will be sharing different Christmas projects, so be sure to check out the links below and the hashtag #HomeForChristmas in all your social media. Some people choose a color scheme for the whole house and they bring it into every room. 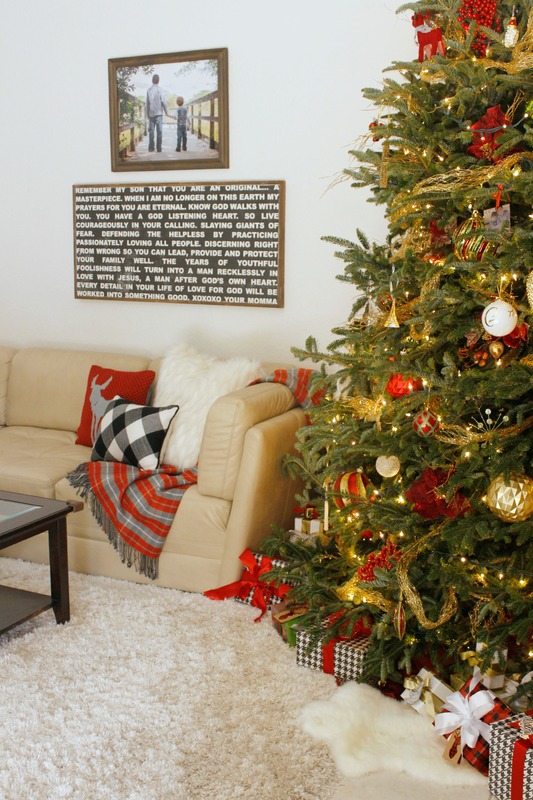 While I love the idea and the cohesiveness of decorating within one color family, I tend to slowly inject holiday colors into the home. The first room that I will share with you is my living room. 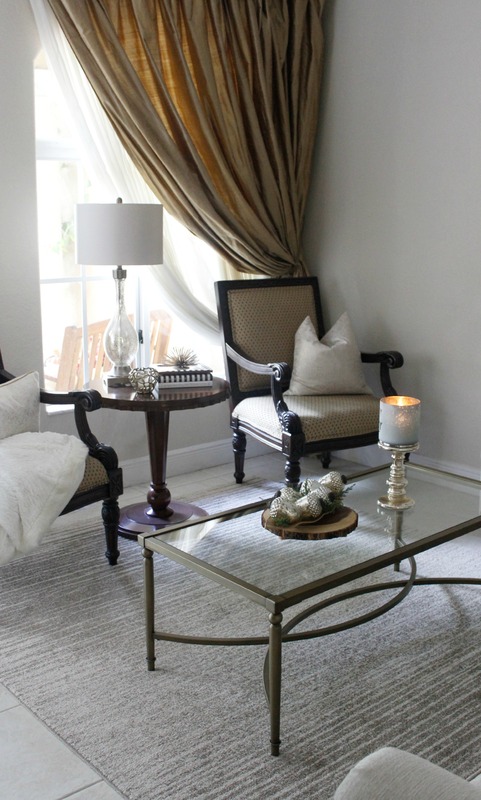 All the colors in this room are neutral so I only bring in white, gold and silver to decorate. 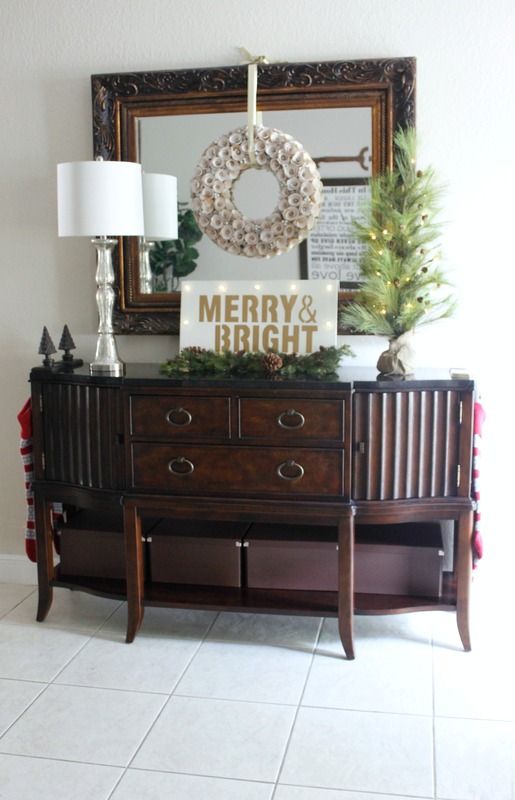 Last year I shared my Christmas home tour and you may recall a similar setup. 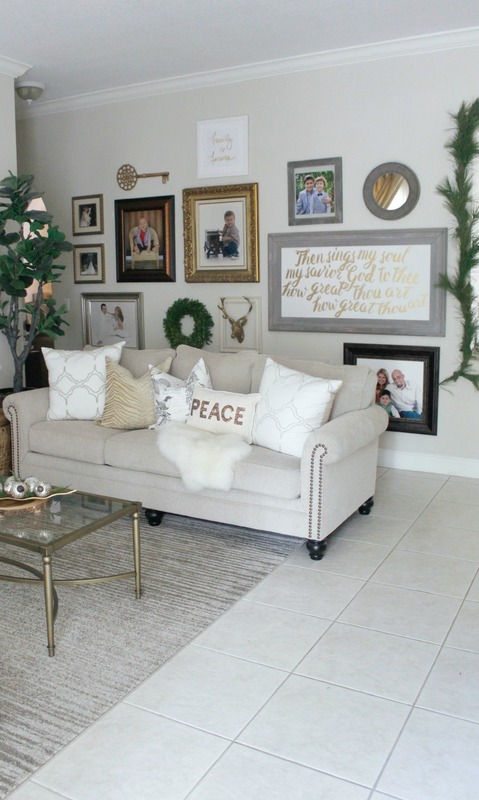 I simply changed around some of the pillows, including this little one that says PEACE that I found on my last Target trip. I went in for a candle and walked away with a cart full. Story of my life. Since the gallery wall in the background is busy, I like to keep all the other surrounding tables decorated simply. Here I placed a large initial hurricane (a $5.00 score at Marshalls) on top of a mercury class pedestal. I love these mercury glass ornaments but they are so heavy that I simply cannot place them on my tree. Instead, I placed them on the same leaf that I used to decorate for fall, and I added greenery for a small pop of color. To add a little dimension and interest, I placed the leaf on a rustic tree trunk slice. The opposite side remains almost untouched – those colors match my decor year-round. You may recall how I decorated my buffet for fall – I considered removing the wreath and adding the same one that I used last year. 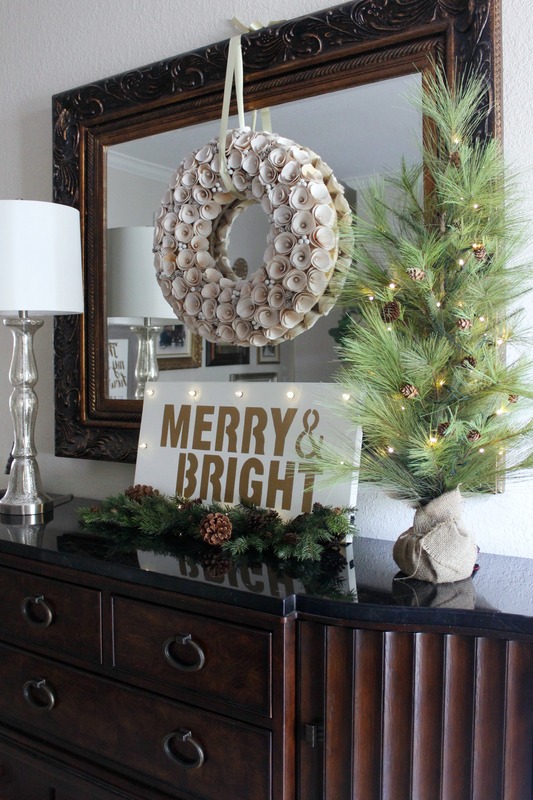 After adding the “Merry and Bright” marquis sign and the little tree, I decided that this wreath would also work perfectly for Christmas. I didn’t even have to pull out the ladder which is great! 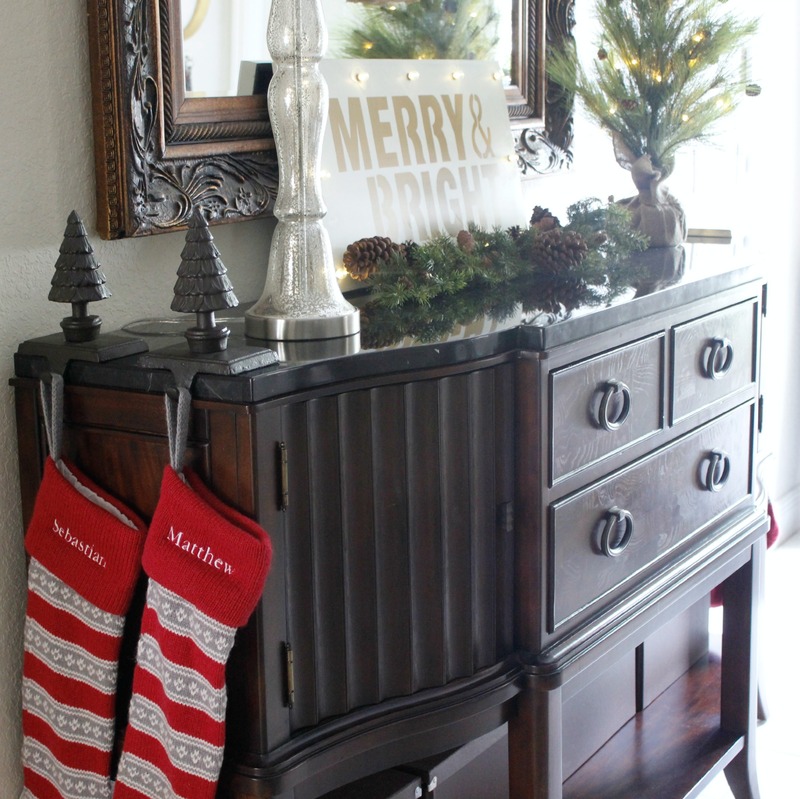 On the opposite side, there is a pop of color with the stockings for the whole family. My kids really get into stocking stuffers so I purchased some big ones last year. Making another appearance this year is this sweet little tree from last years Christmas home tour, I just changed it’s spot. 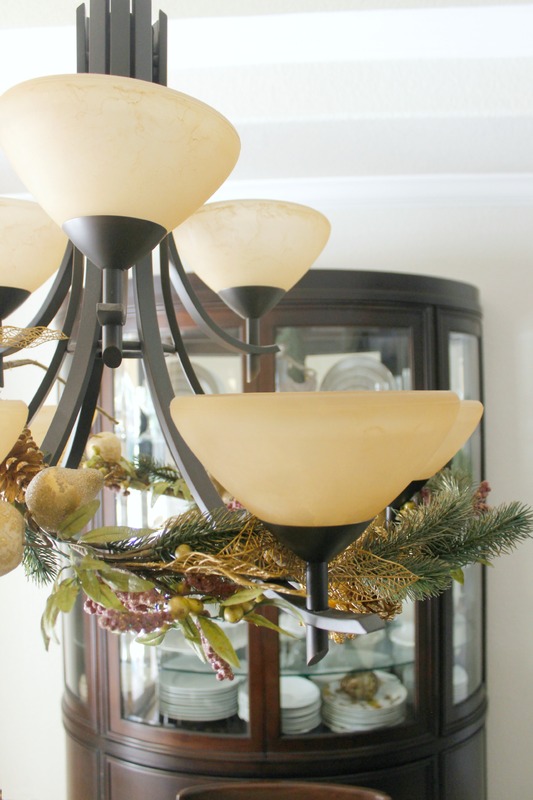 It’s tempting to decorate exactly the same way year-after-year, but it’s way more fun to find a new home for decorations. Sometimes as I am unloading the holiday boxes from the garage, I place something down on a surface meaning to go back to it later. All of a sudden I look at it and think “I kinda like it there”. A different perspective on an old decoration. Since the living room and dining rooms connect, I like to graduate color into the adjacent room. I purchased 20 feet of fresh garland this year when we bought our tree and they said it should last 30 days – let’s see if it does. 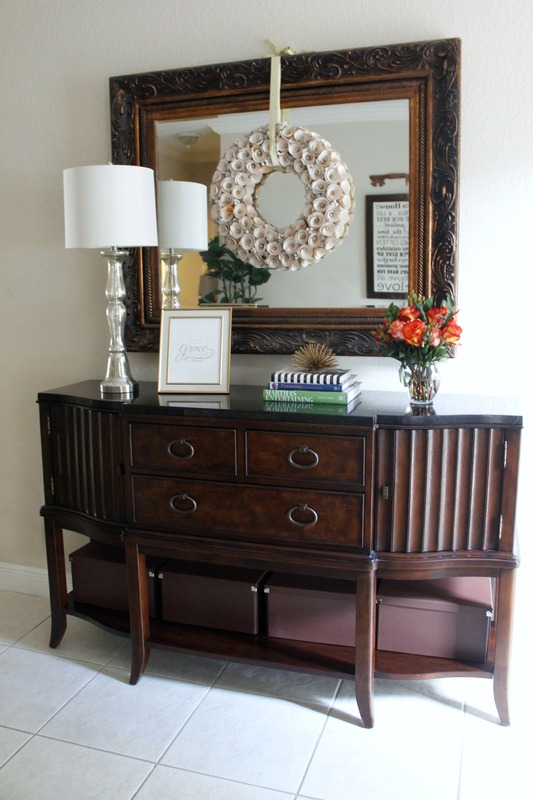 For now, I love how it frames the entrance to the dining room. I used Command Brand hooks to keep it from damaging the wall. In a few days I will fill you in on more details of the dining room, but it’s basically a lot of layering greens, gold and white. A little fur on the head chairs and small pillow soften the dark wood colors of the dining room furniture. So far we have been holding back on color but no more! The family room is the fun room and our favorite room to hang out. This isn’t even the “best” spot to put up our tree but we place it here so that we can enjoy it while watching T.V. and hanging out. In a few days I will also give you all the details from my tree decorating adventures. P.S. It involves broken ornaments…sigh. All my pillows are from different stores but they all work together nicely. 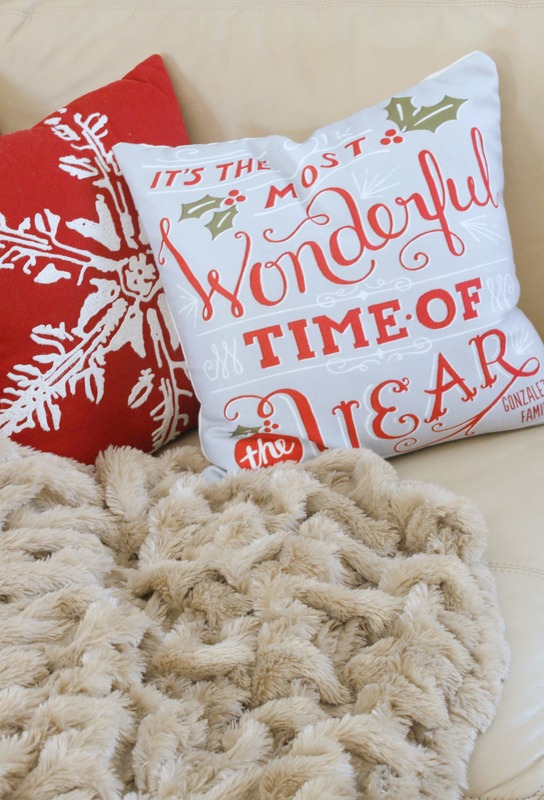 The throw and the reindeer pillow are from Target (last year) and the large fur one is from ZGallerie. I love adding touches of black to anchor all the other colors. I had to take more than one picture because it’s a rare sight for all my pillows to be on the couch and not part of some “Fort” on the floor. More pillows – The one in the back is from ZGallerie and the front one (which I love) is from Marshalls. Almost done with the pillows. Snowflake pillow is from Target and the beautiful (and personalized) one in the front is from Tiny Prints. It really is the most wonderful time of the year! Don’t cut corners! I love using baskets in corners full of pillows or throws. Can you believe that the little deer pillow is from the Target dollar section? Adorable right? So that’s my home for the holidays, but the fun doesn’t stop here. 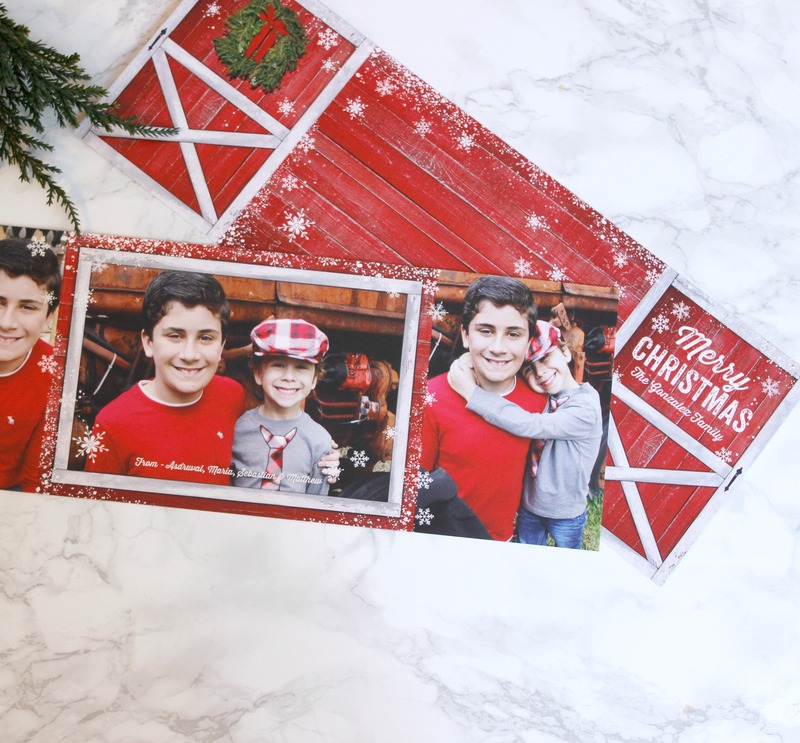 #HomeForChristmas is full of ideas and I encourage you to check them out by clicking on the links below. Have you done all your Holiday decorating? Do you do it all in one day or do you space out your decorating?